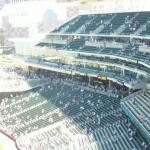 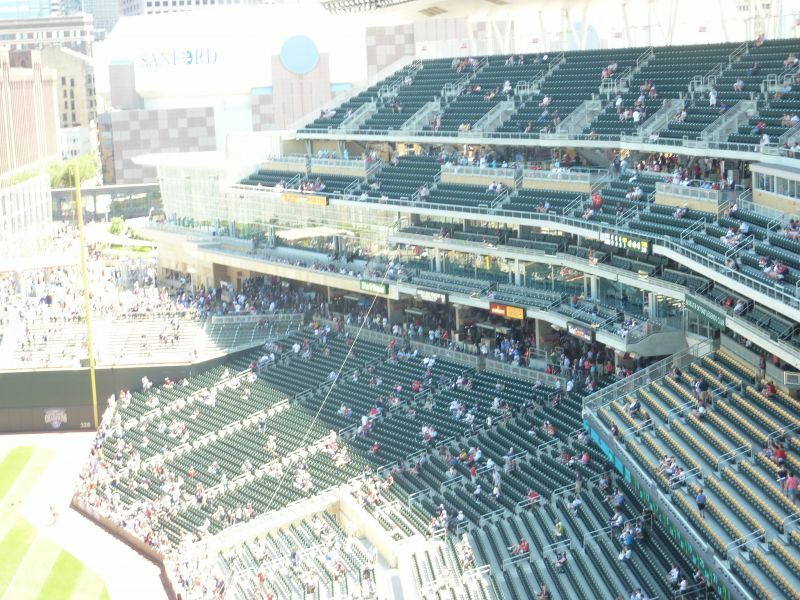 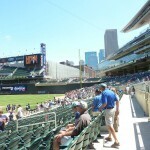 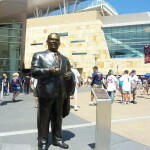 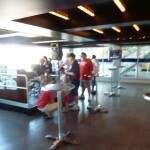 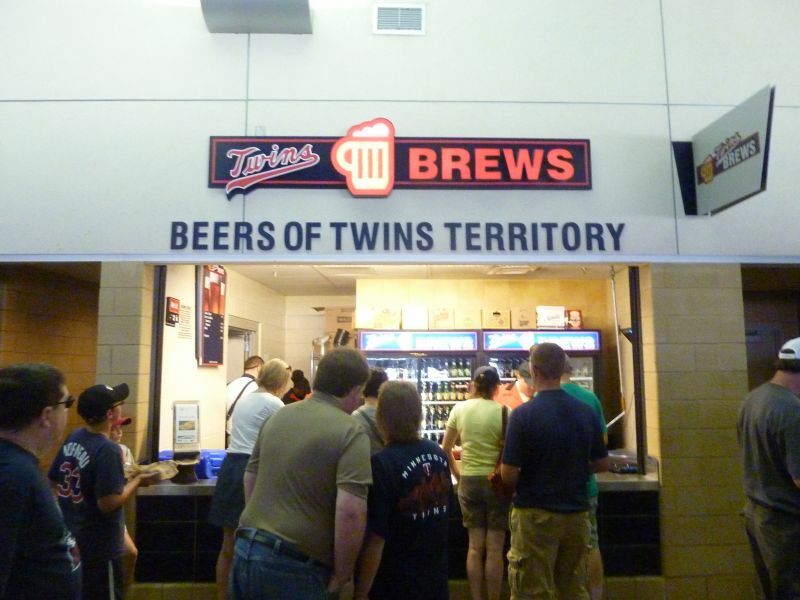 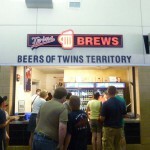 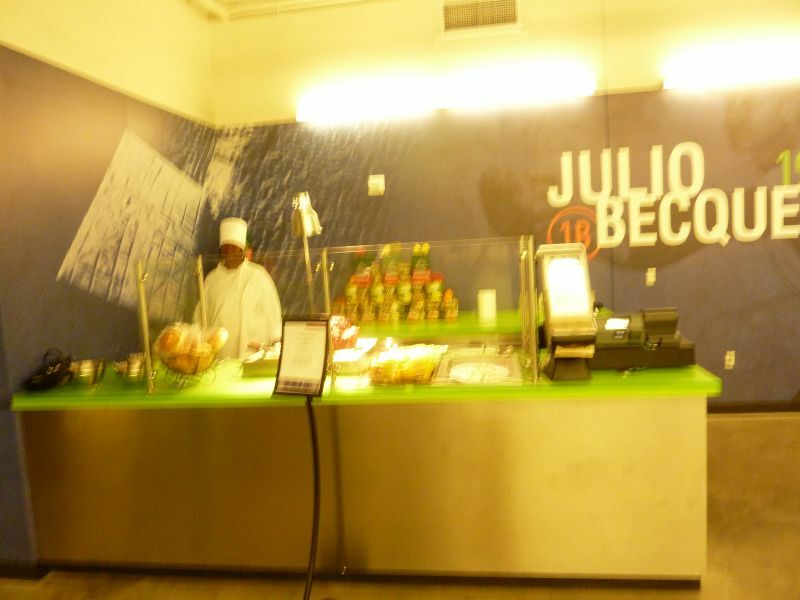 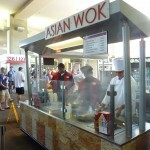 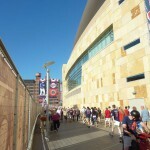 Target Field really represents how ballparks have gone full circle since the beginning of the building boom. 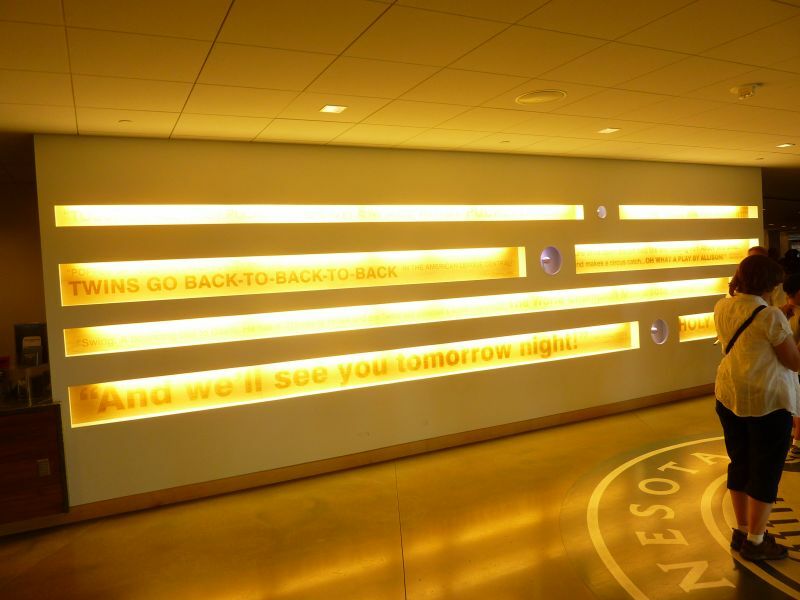 It represents a certain evolution in some ways, but we’re right back where we started in terms of intentions. 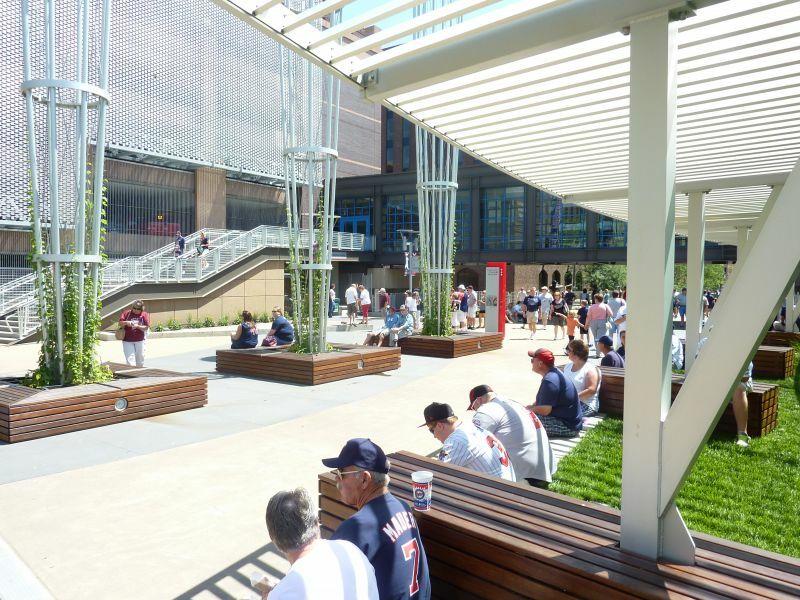 I know I’ve said this time and time again, but when Camden Yards built a red brick park, they weren’t trying to start a retro revolution. 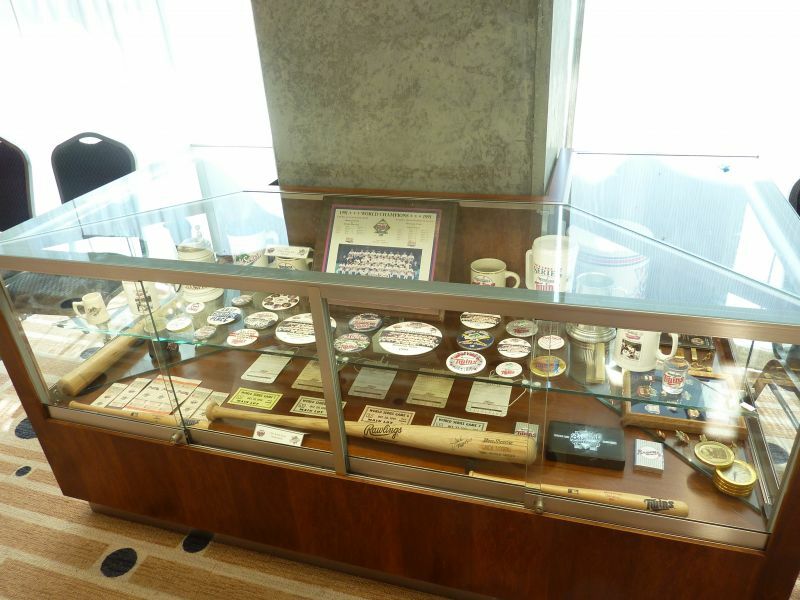 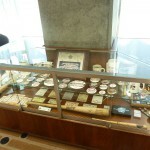 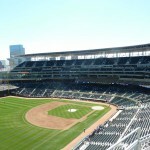 They were starting a revolution of building ballparks that applied to their cities. 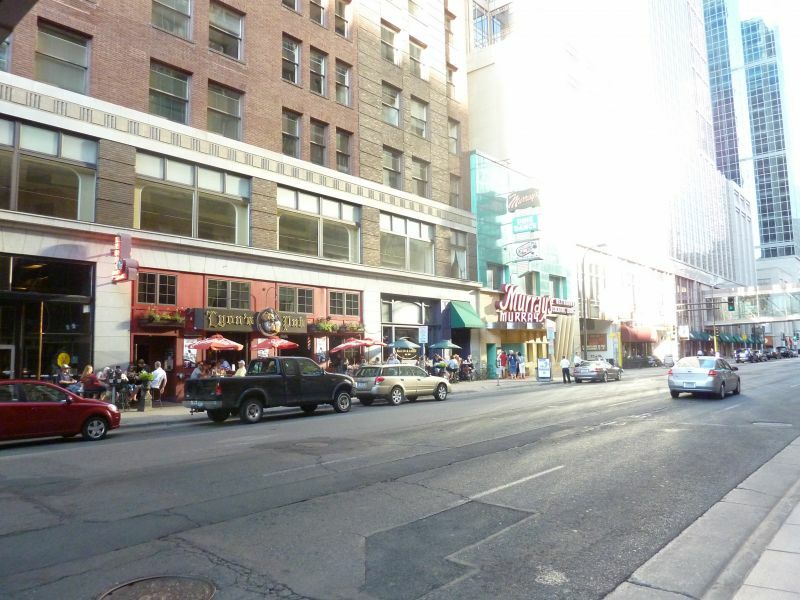 Cleveland and Denver got it. 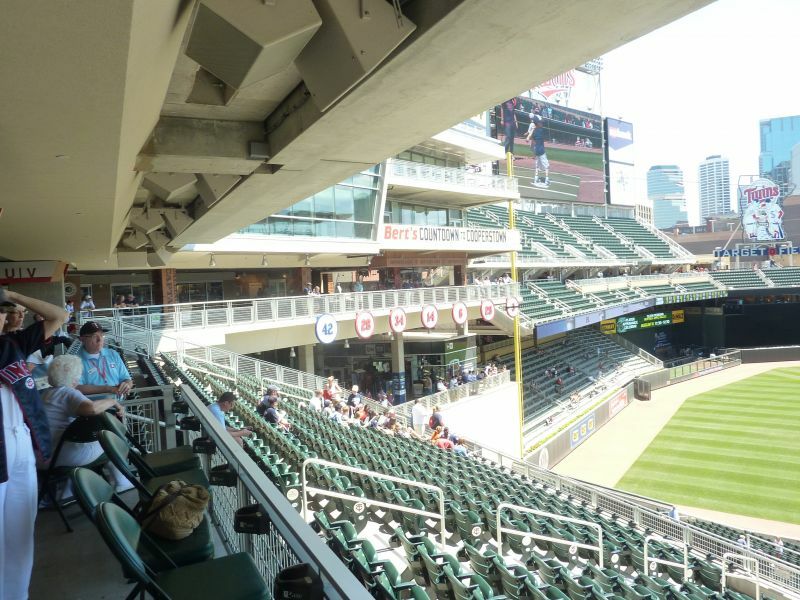 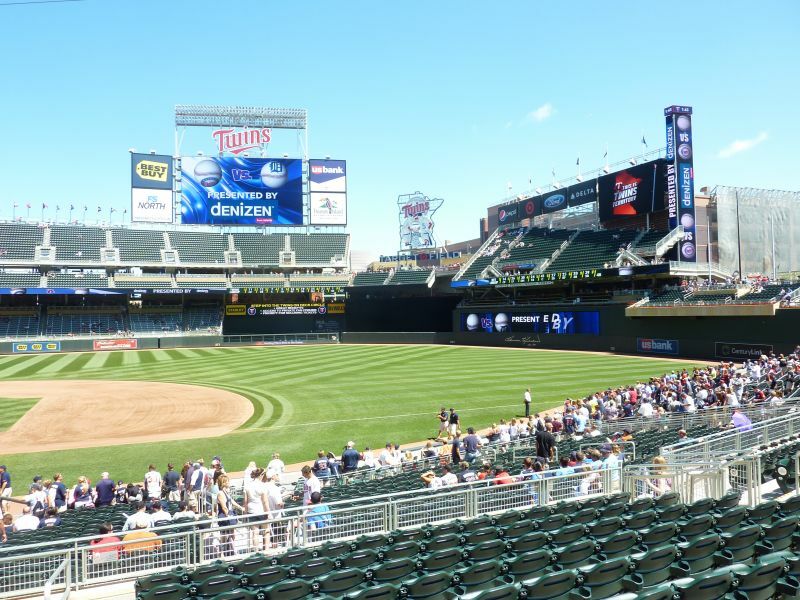 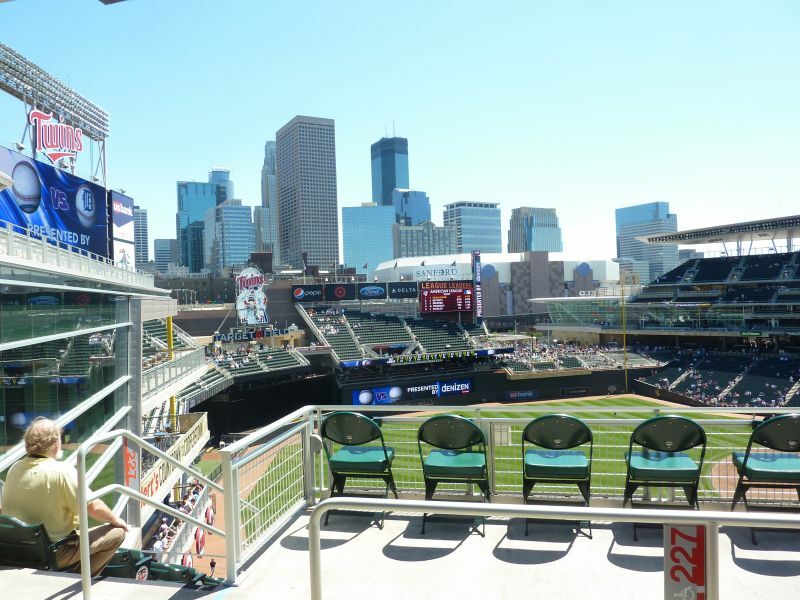 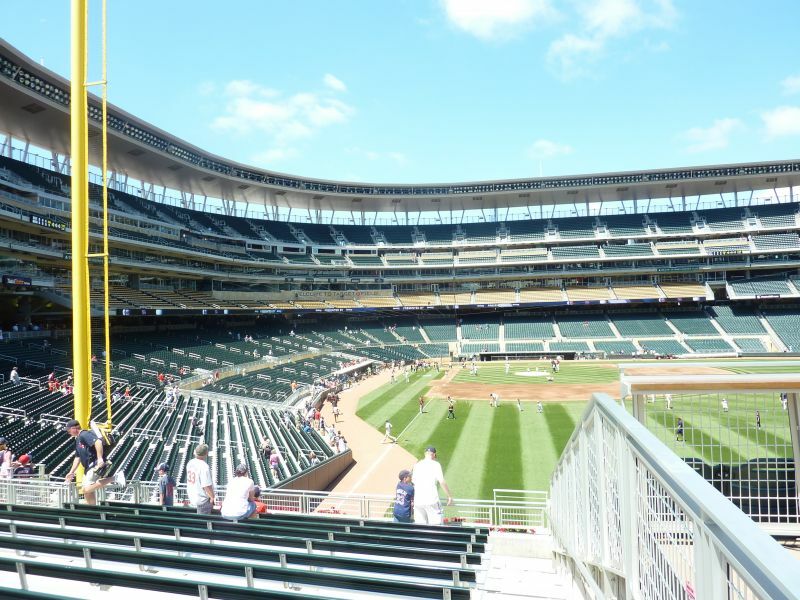 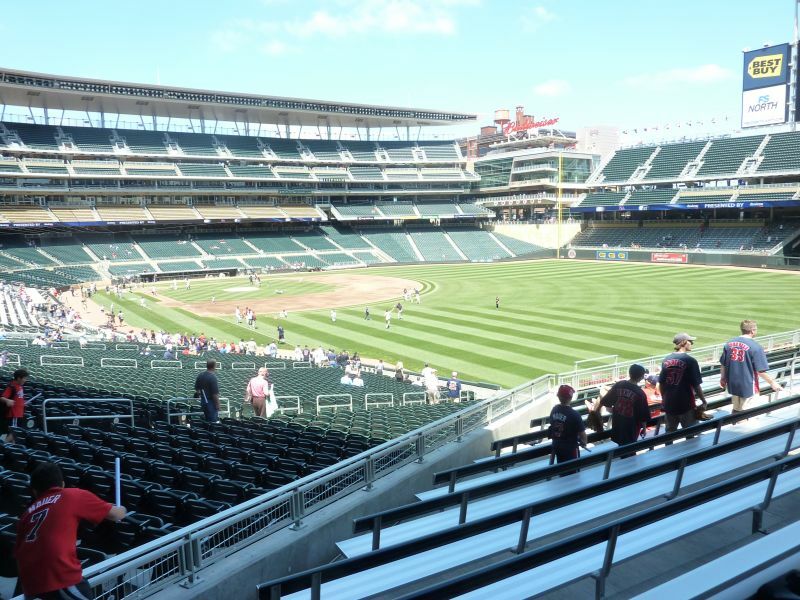 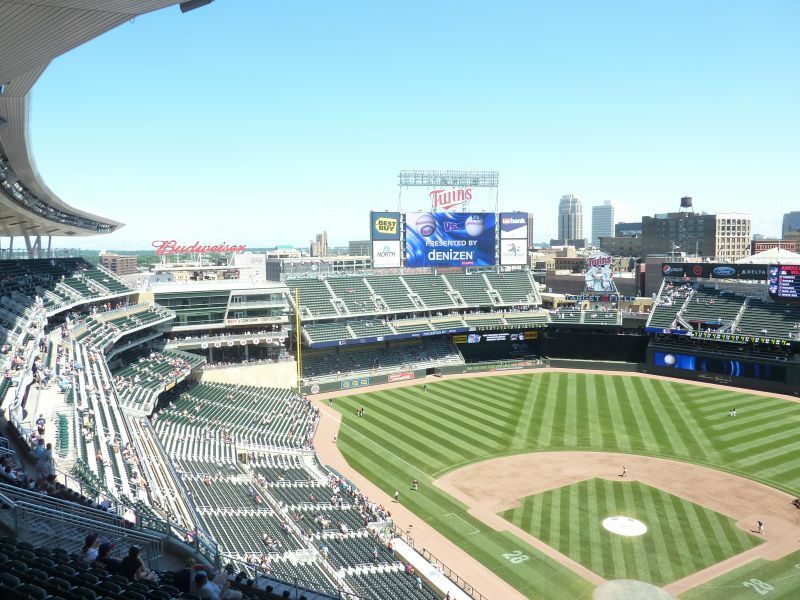 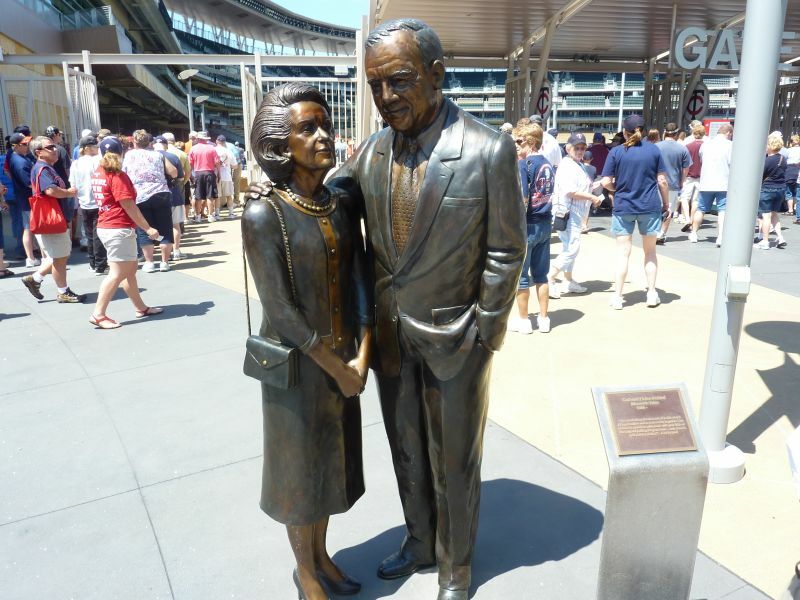 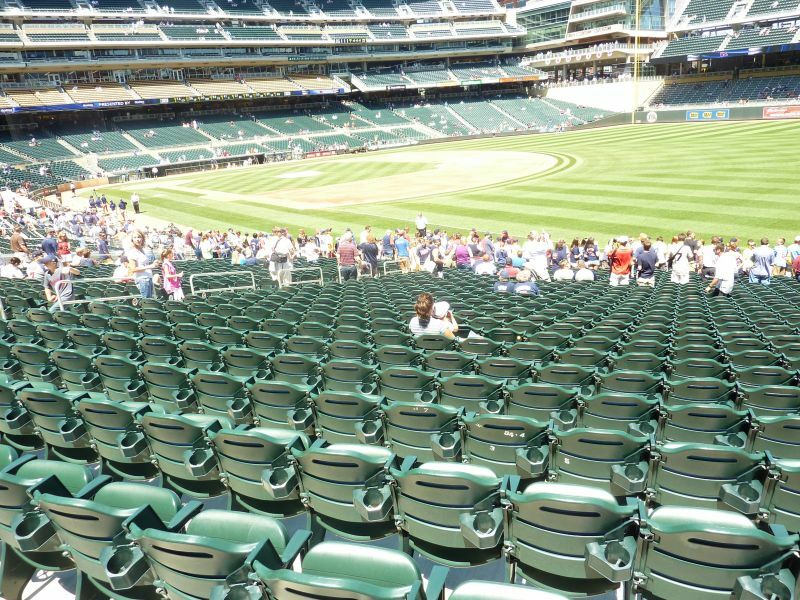 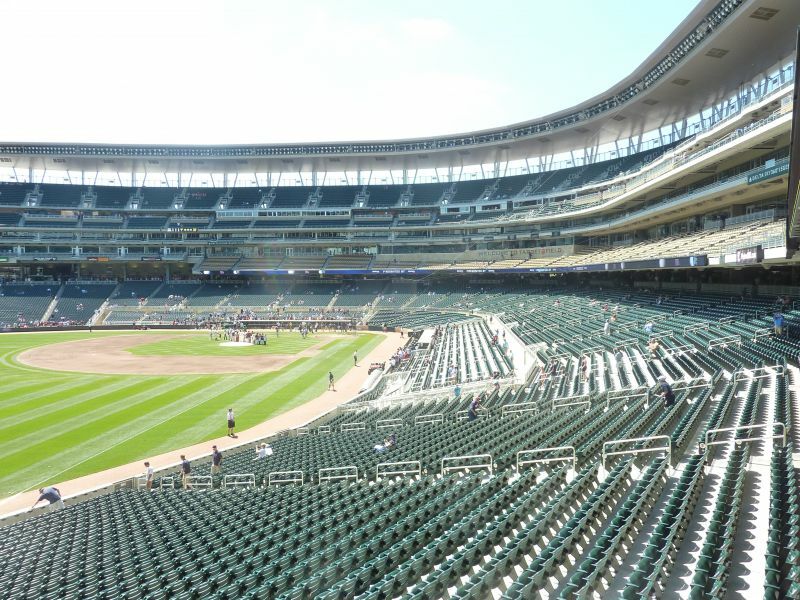 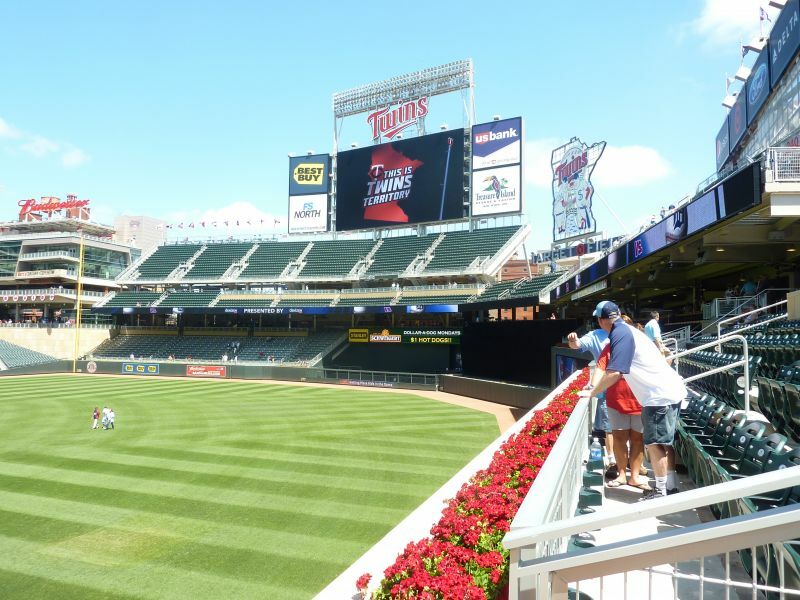 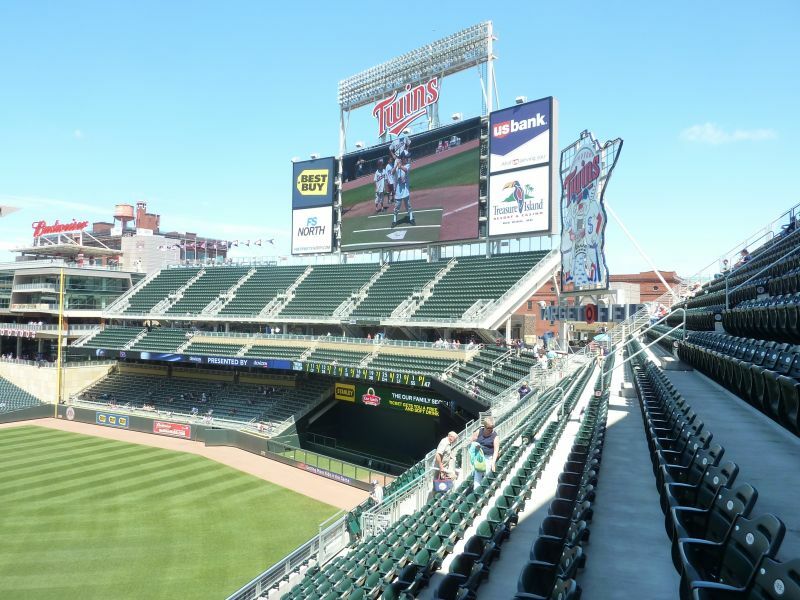 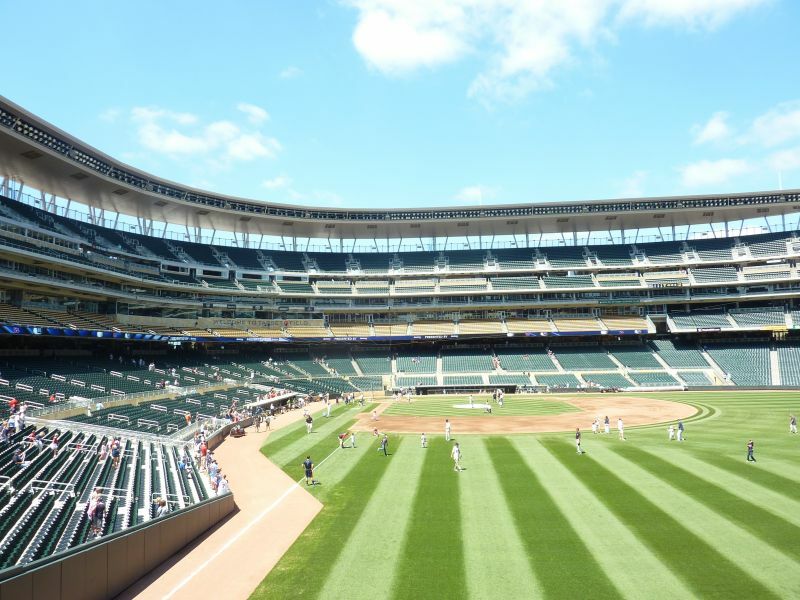 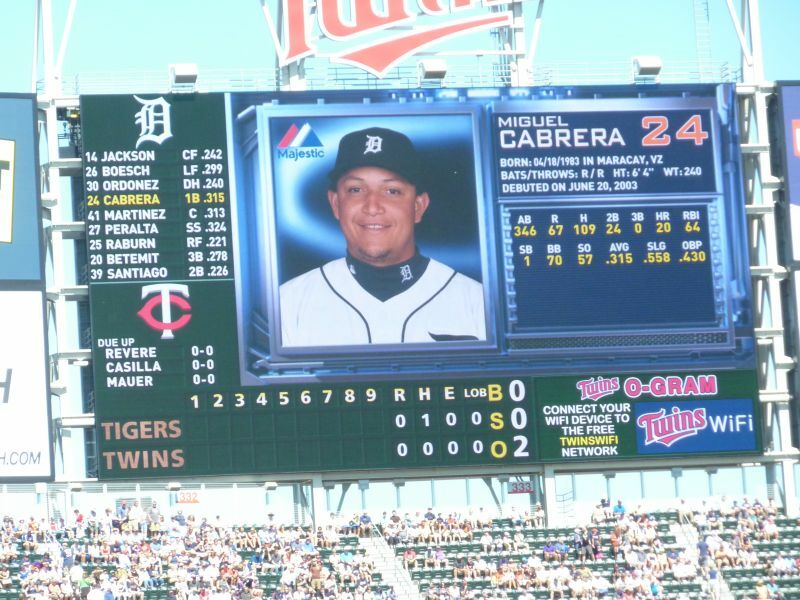 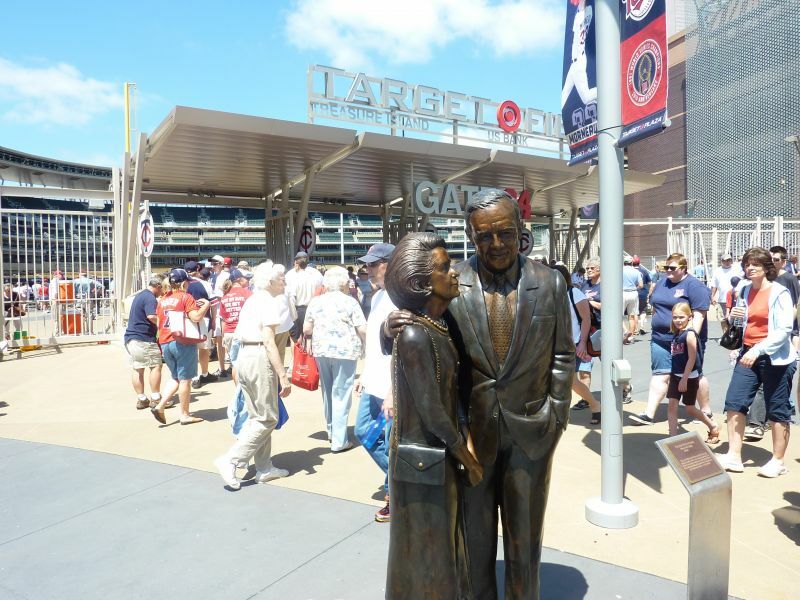 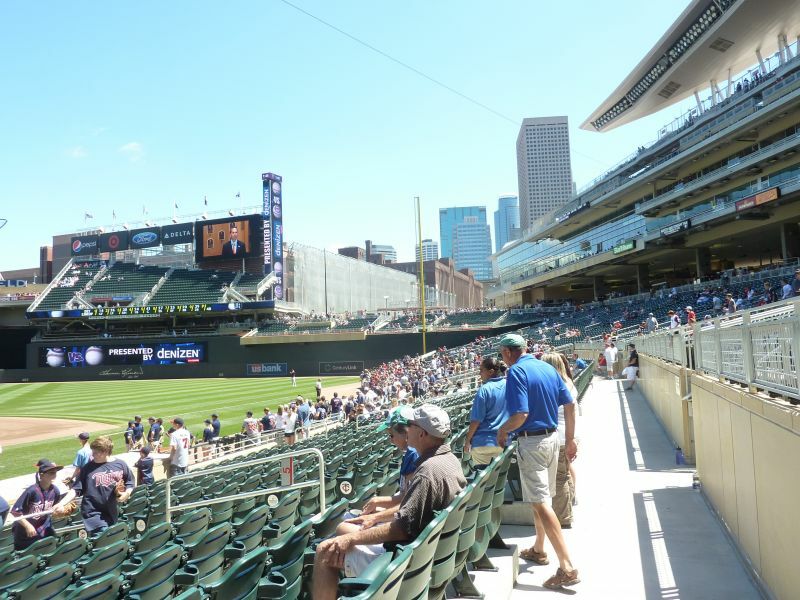 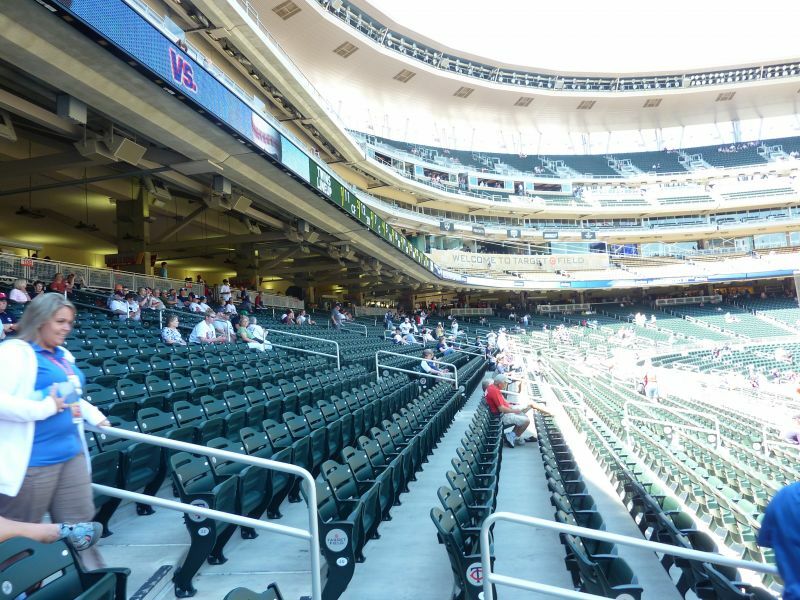 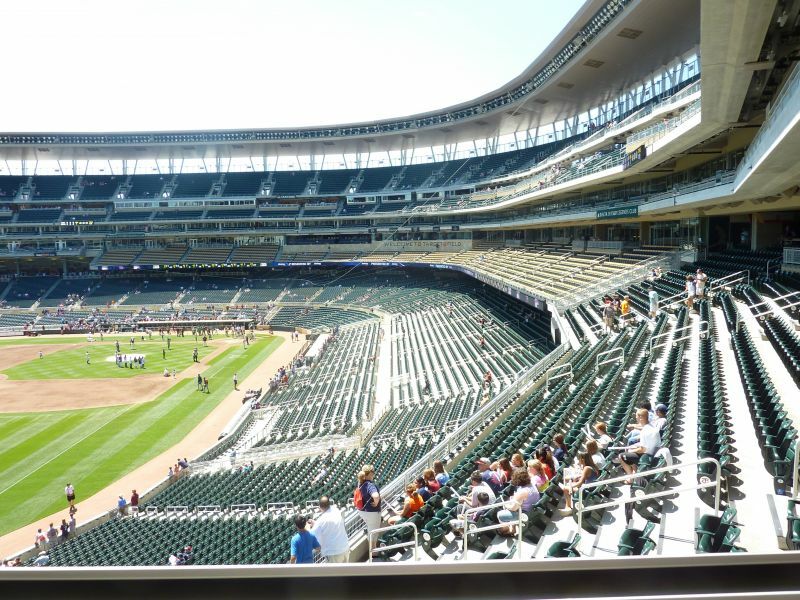 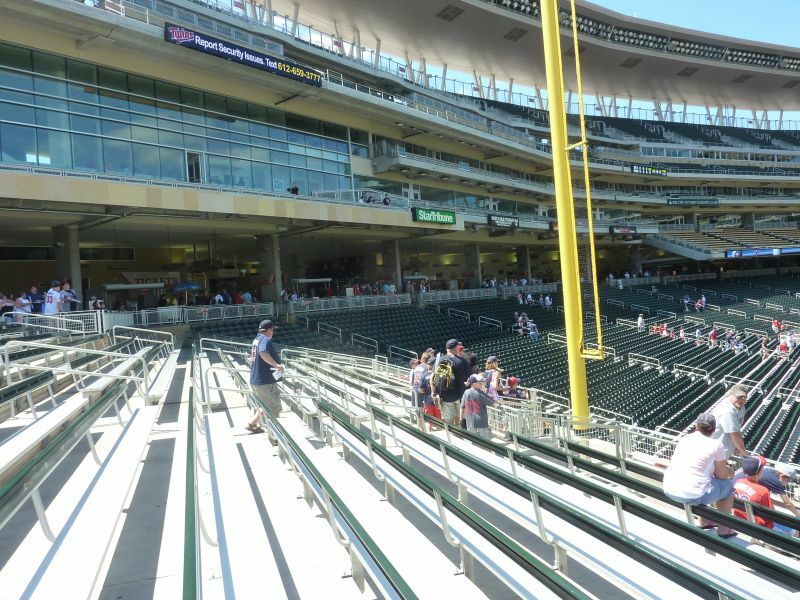 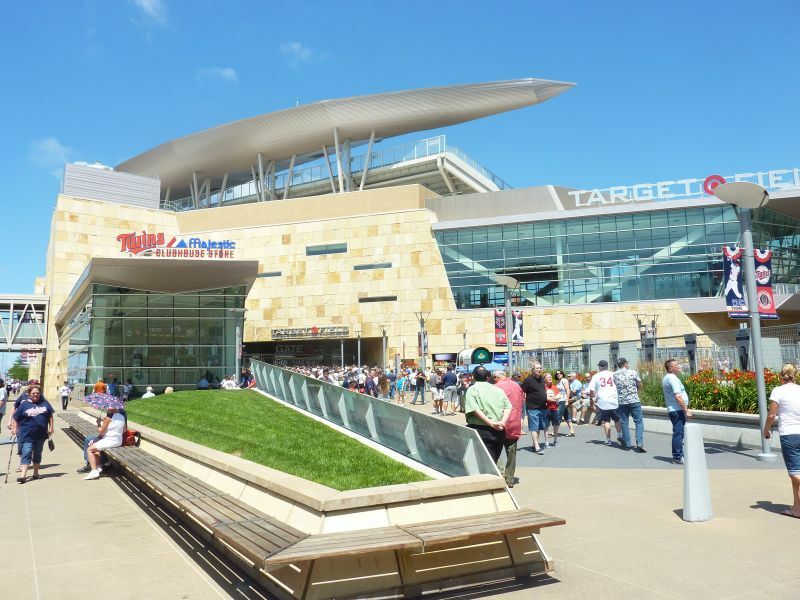 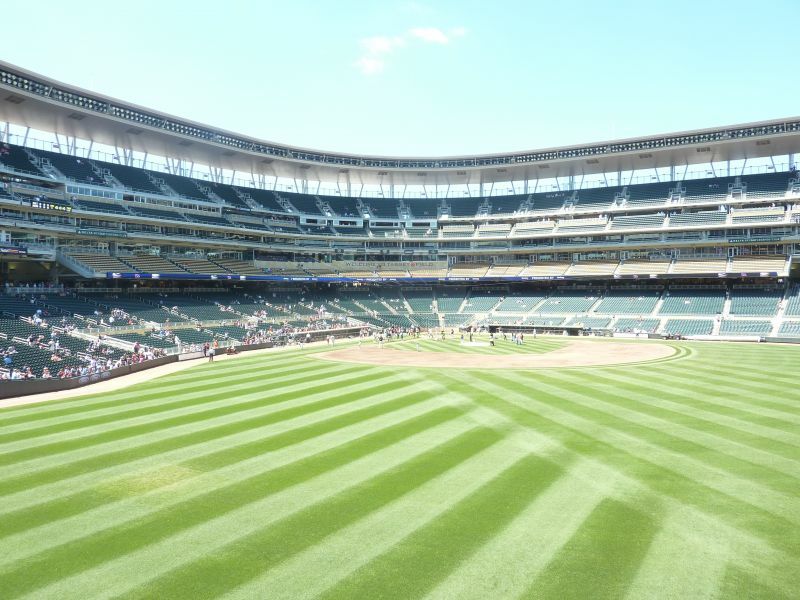 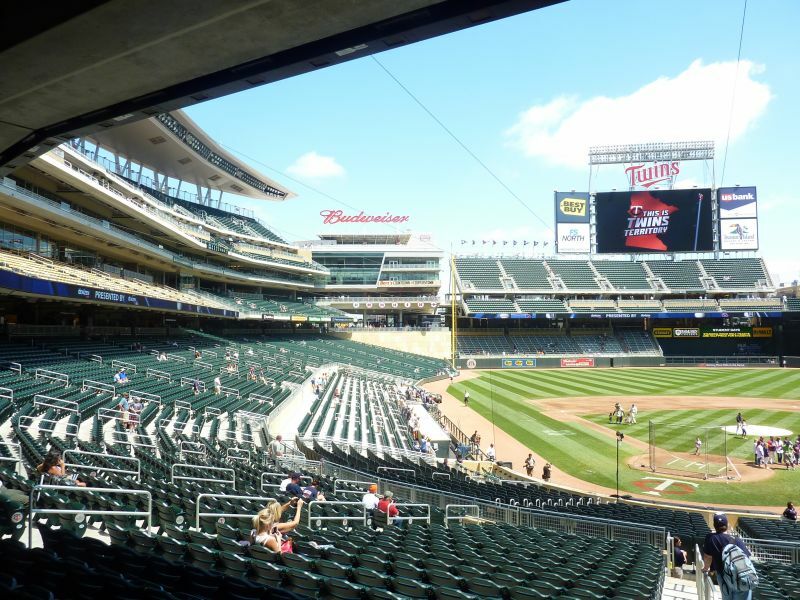 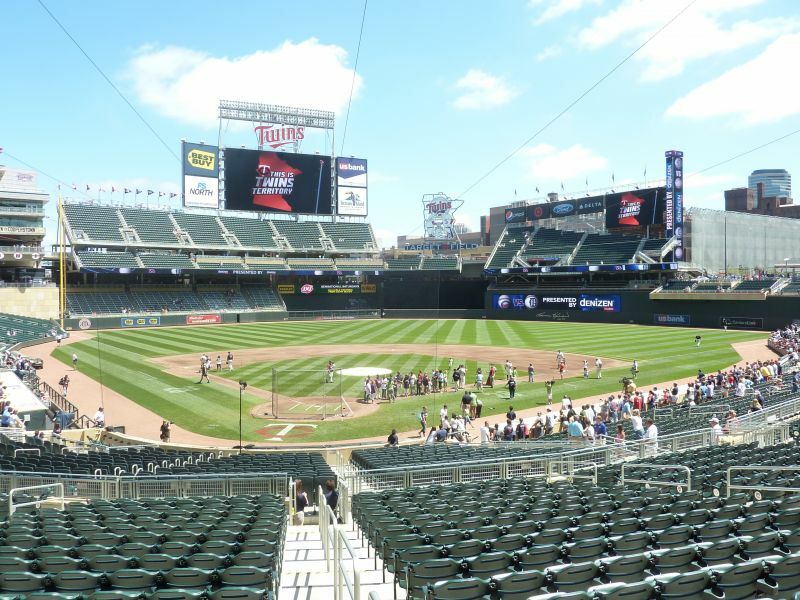 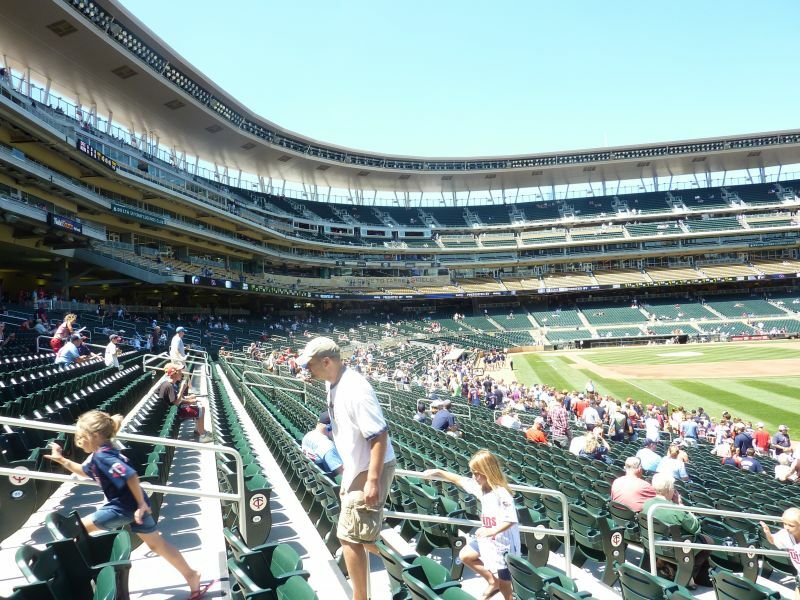 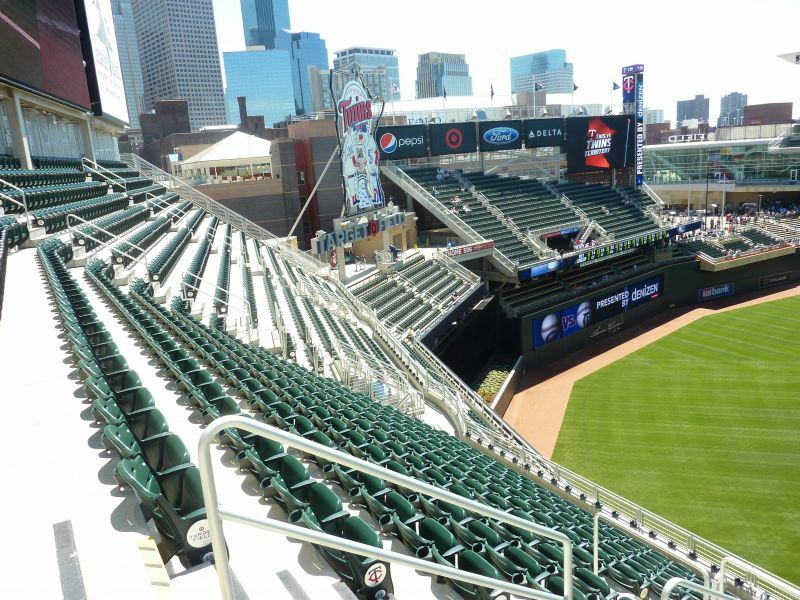 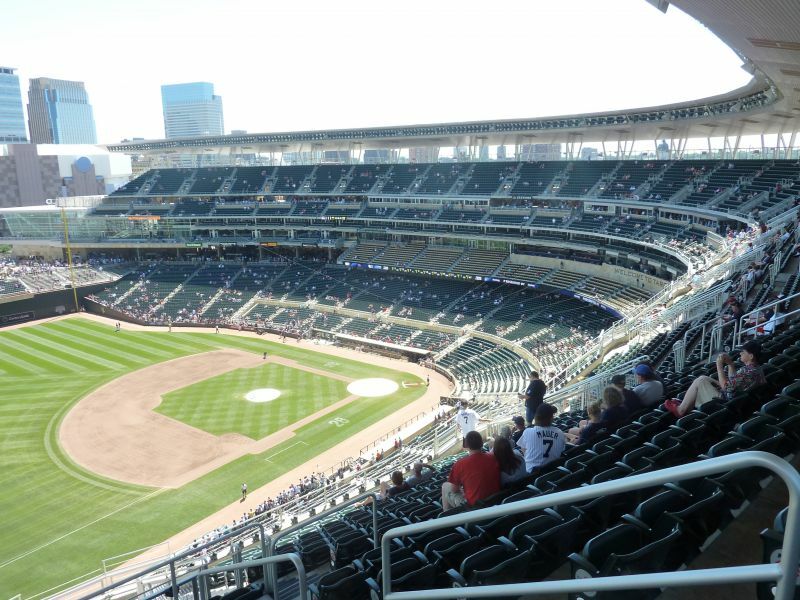 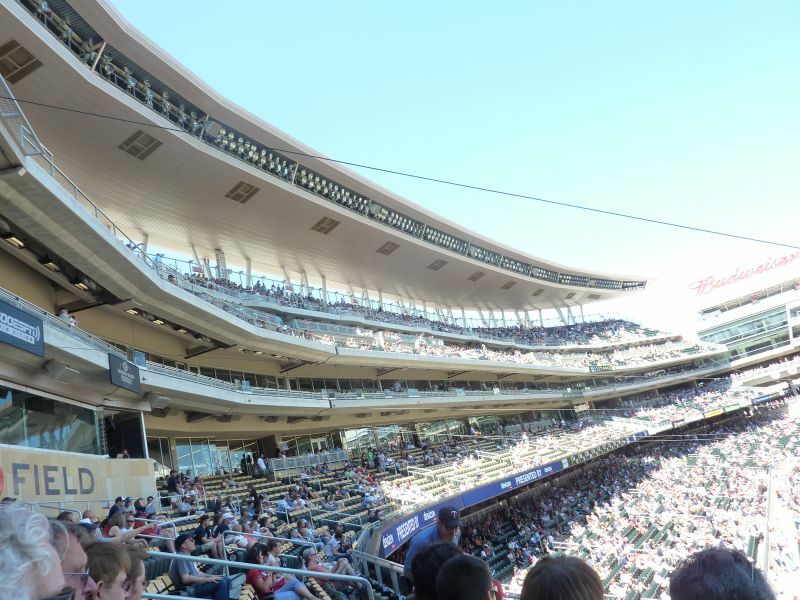 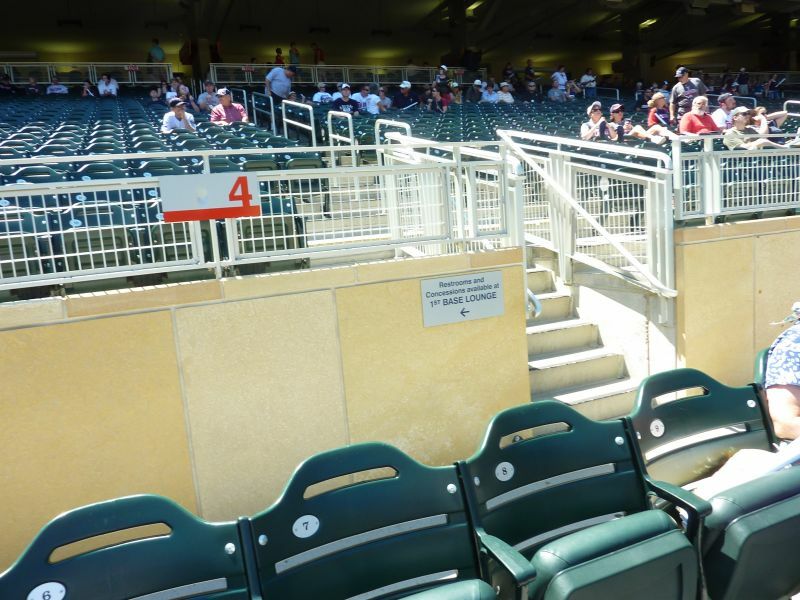 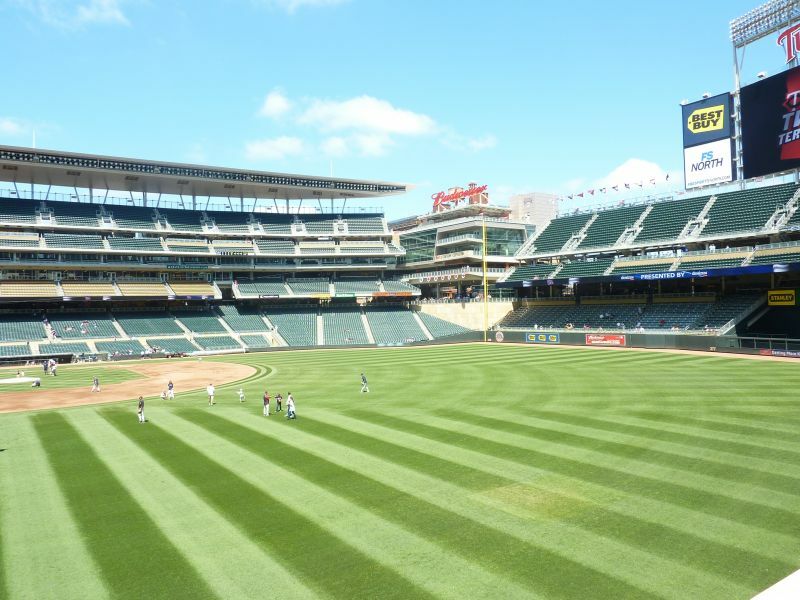 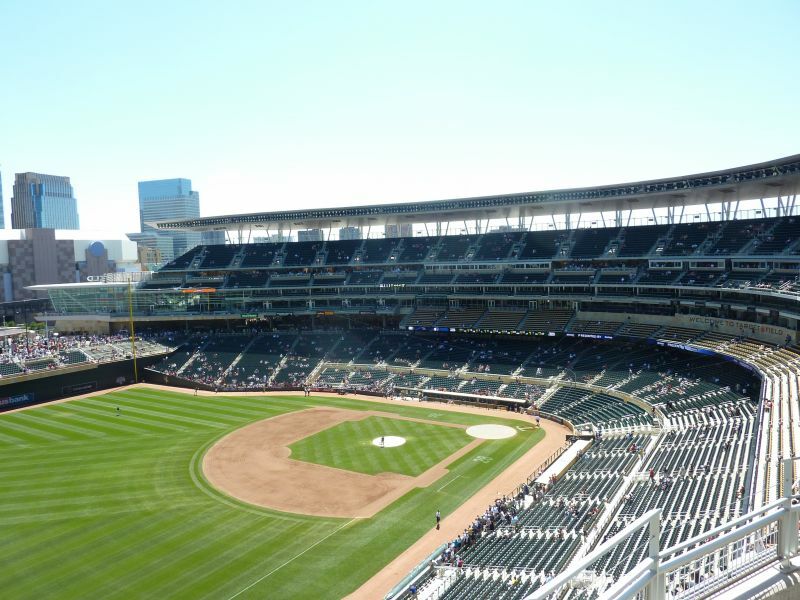 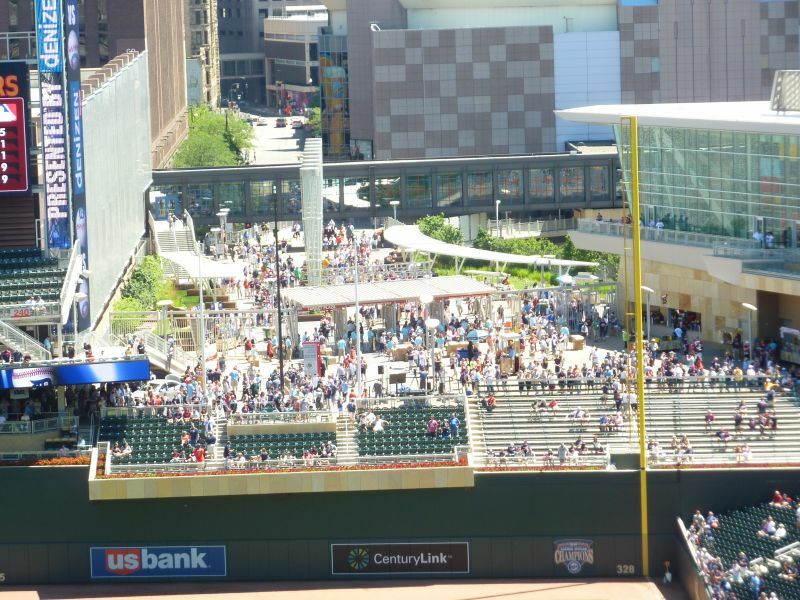 The central irony of Target Field is that it’s really the first park in a long time to go back to the roots of the retro movement, a la Jacobs Field and Camden Yards, while being perhaps the least “retro” park seen in 20 years in terms of design. 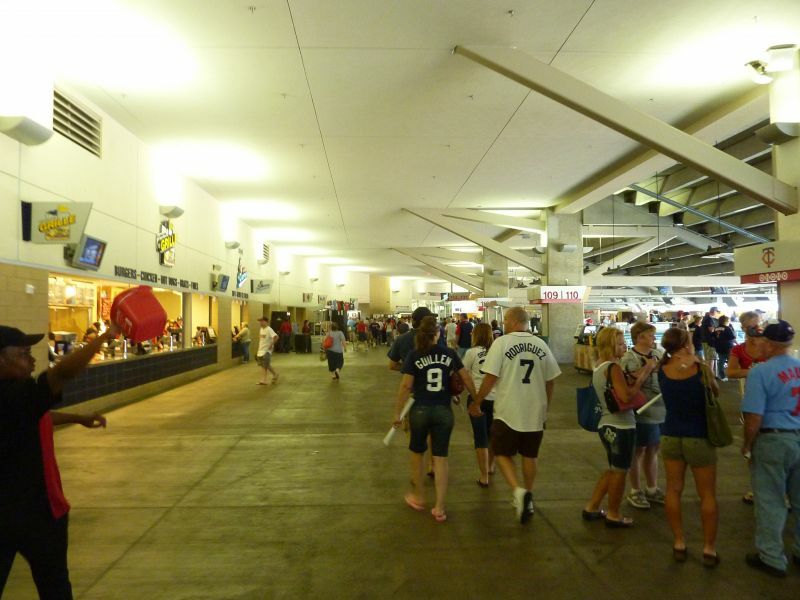 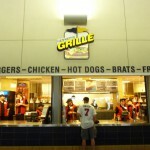 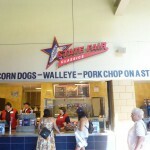 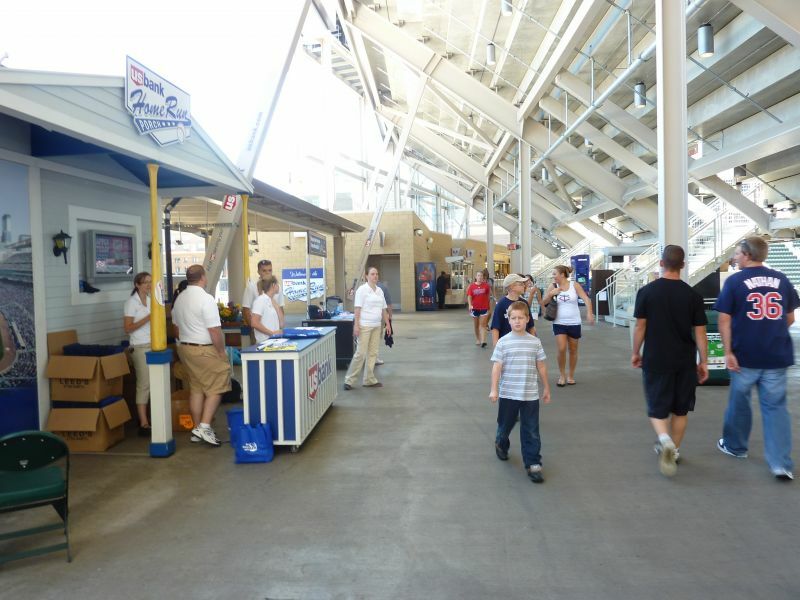 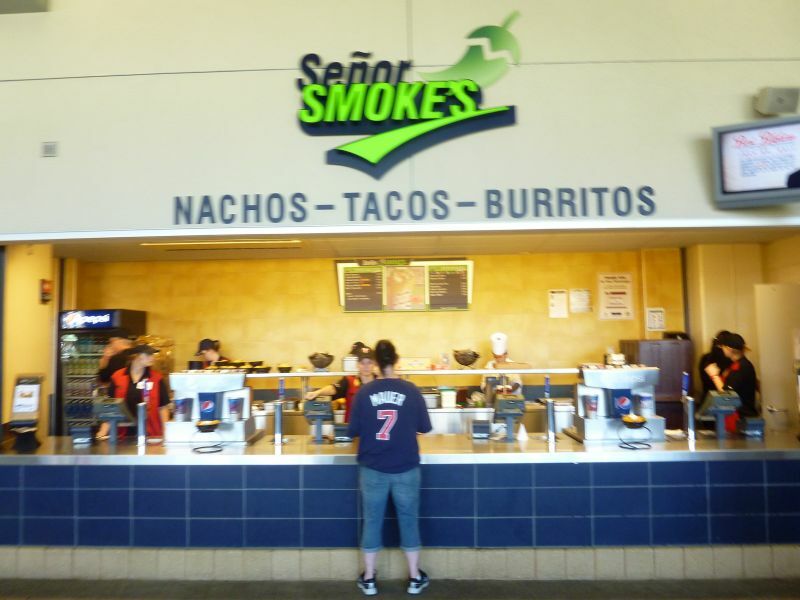 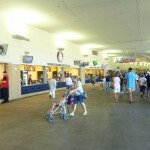 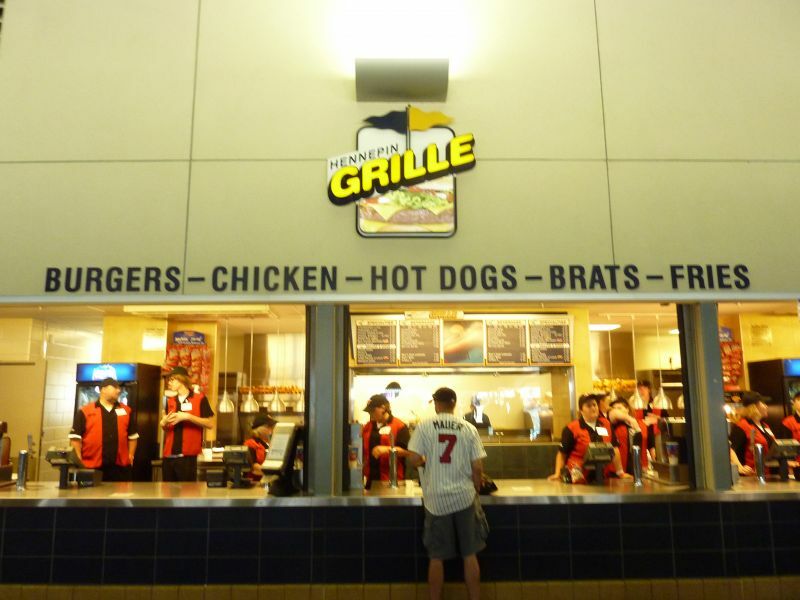 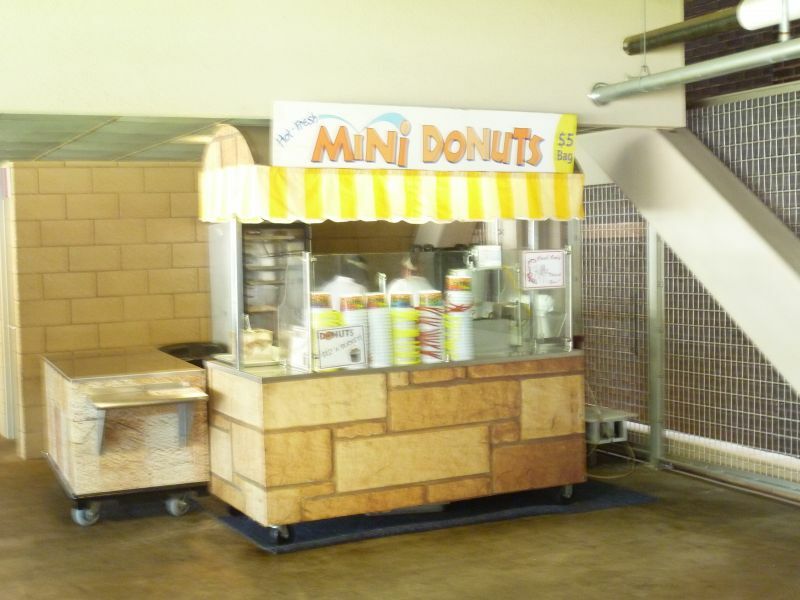 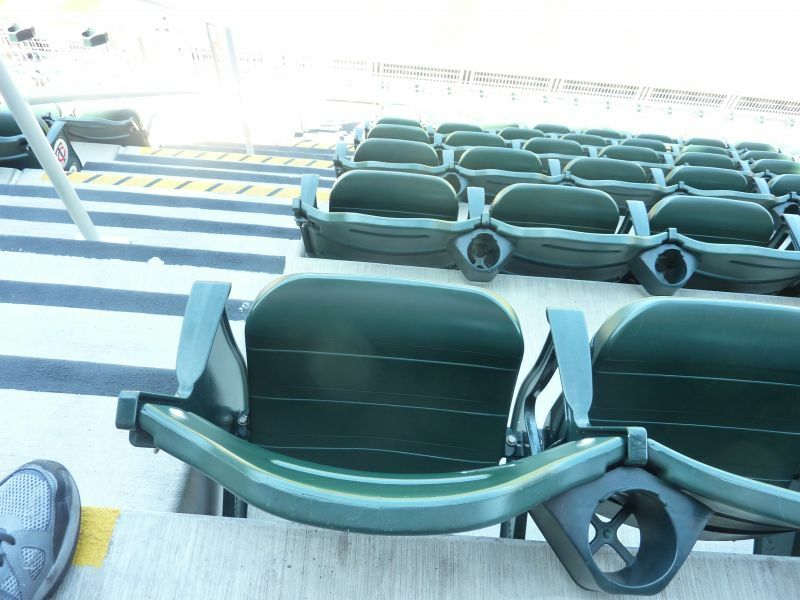 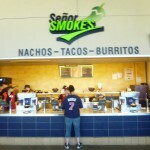 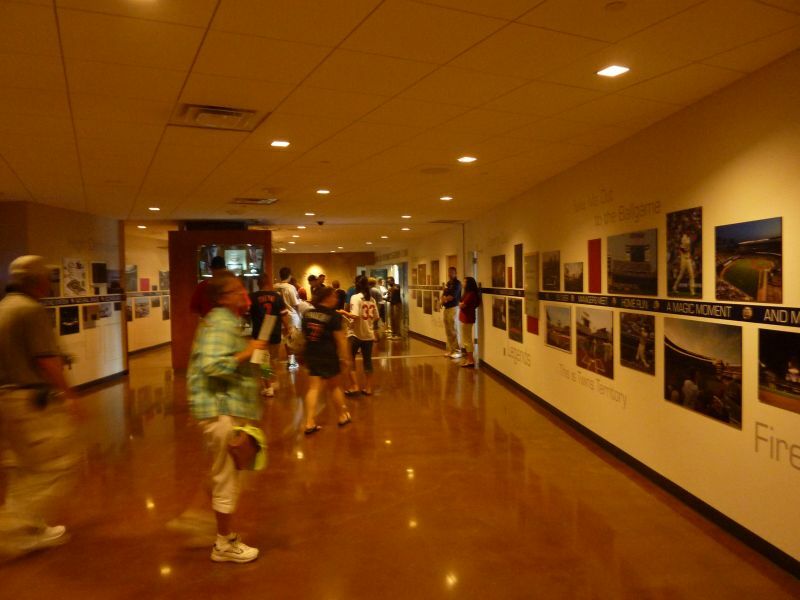 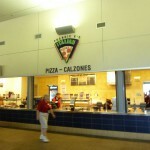 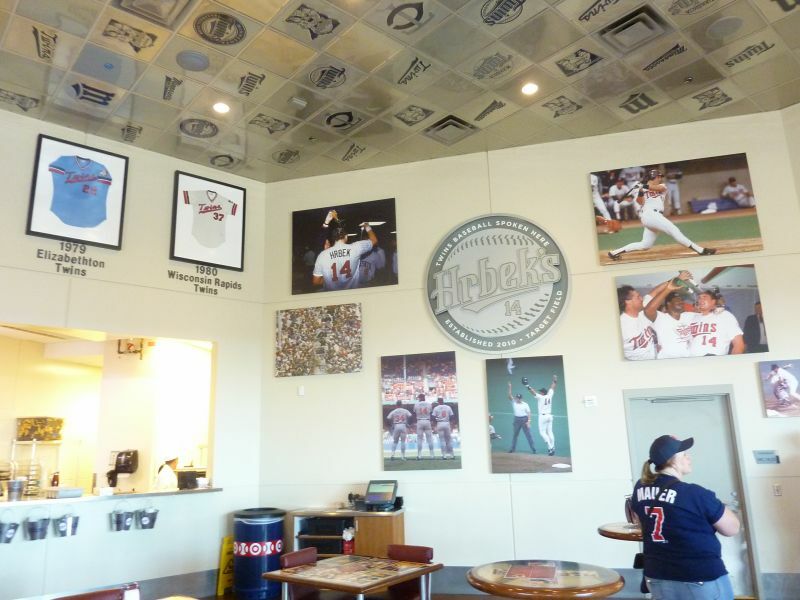 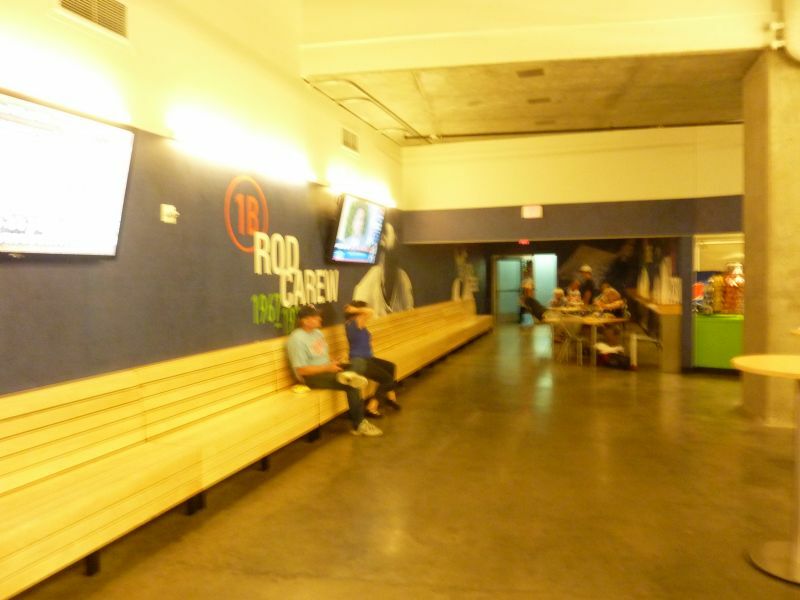 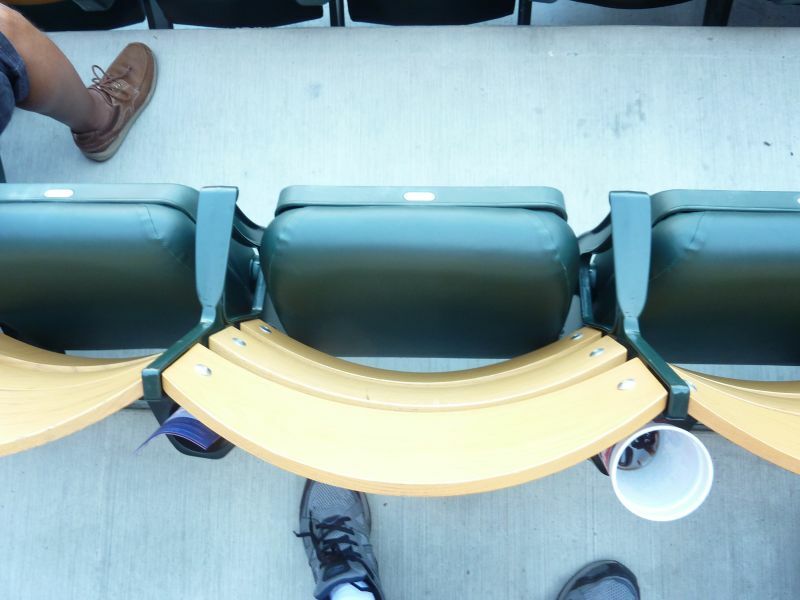 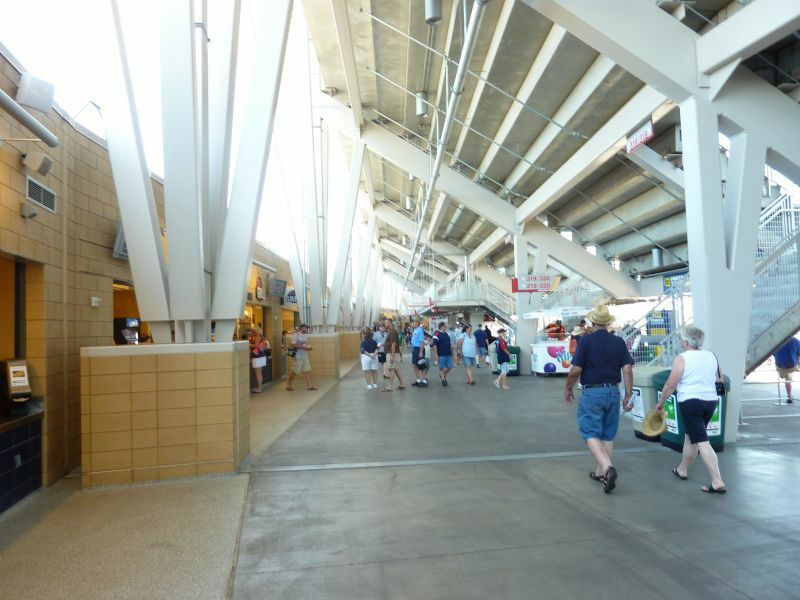 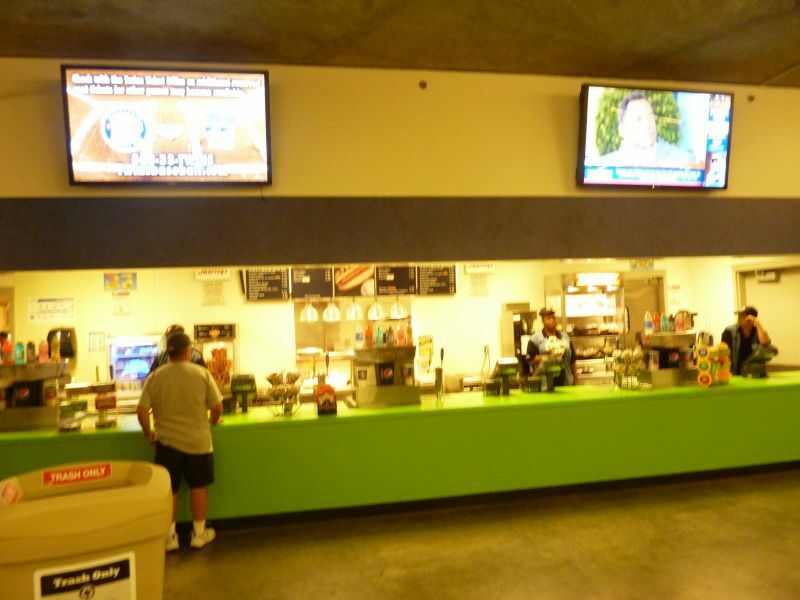 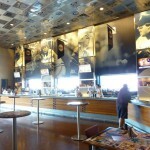 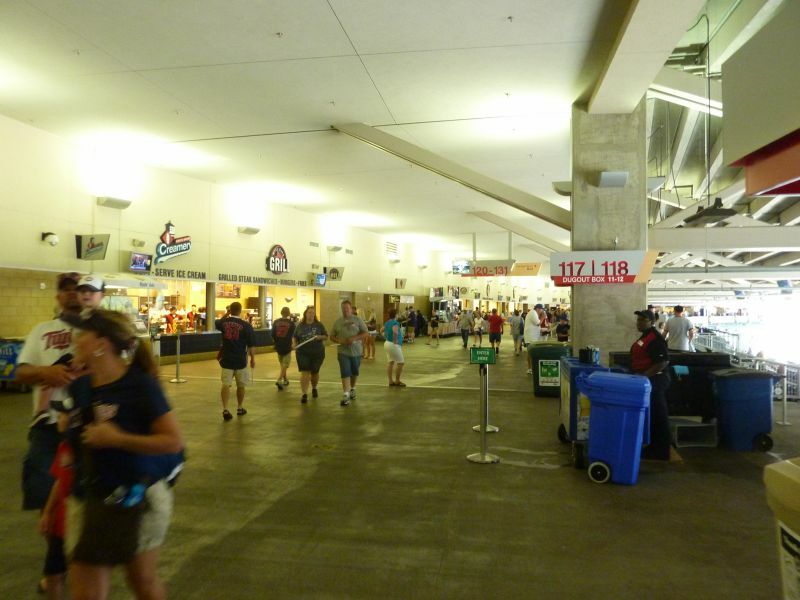 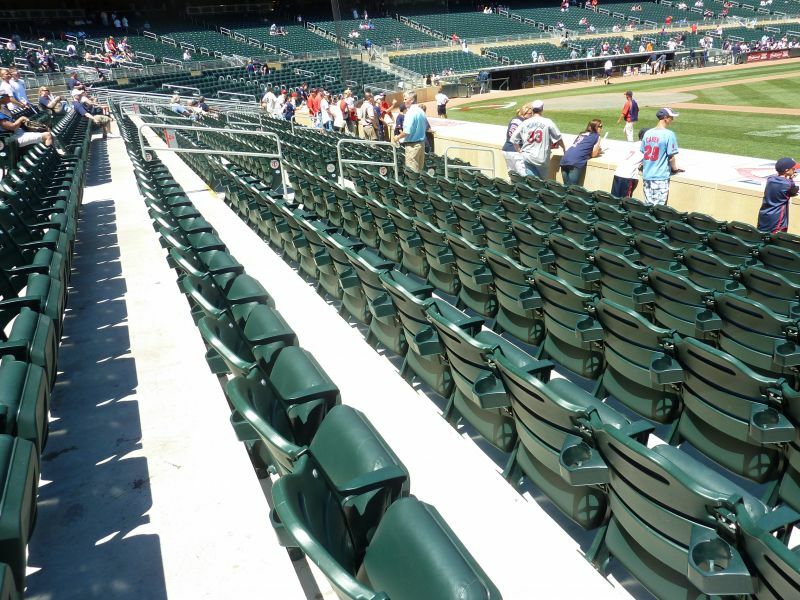 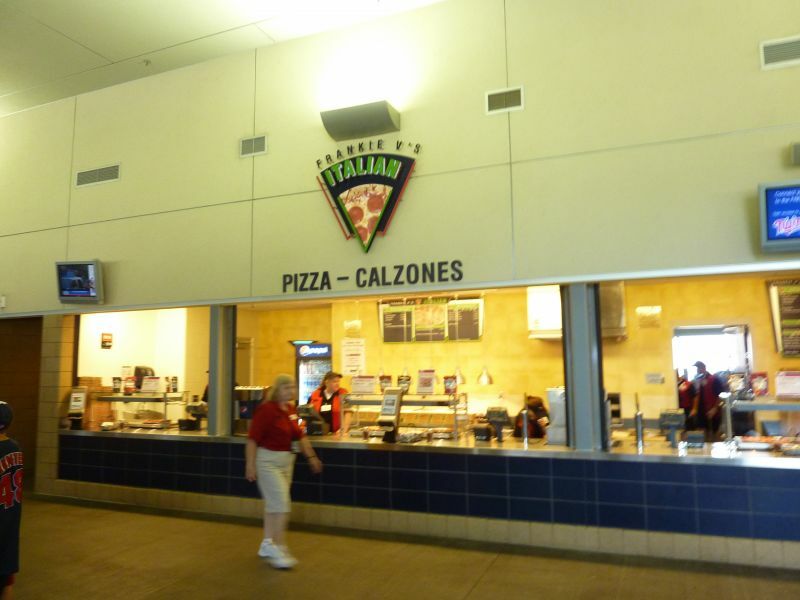 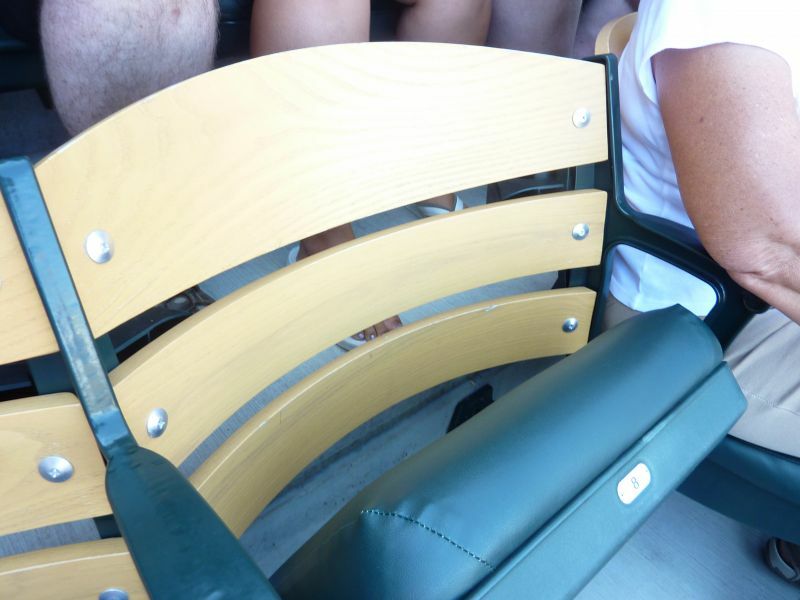 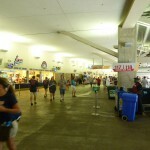 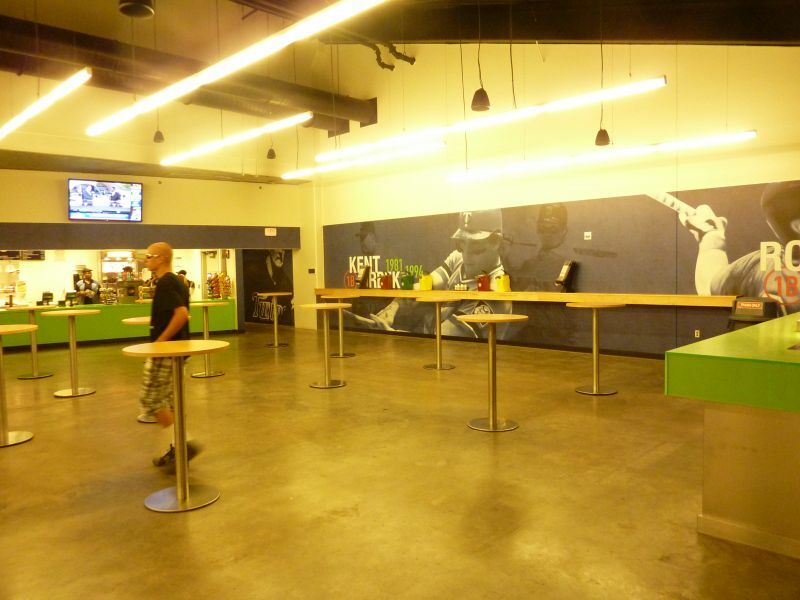 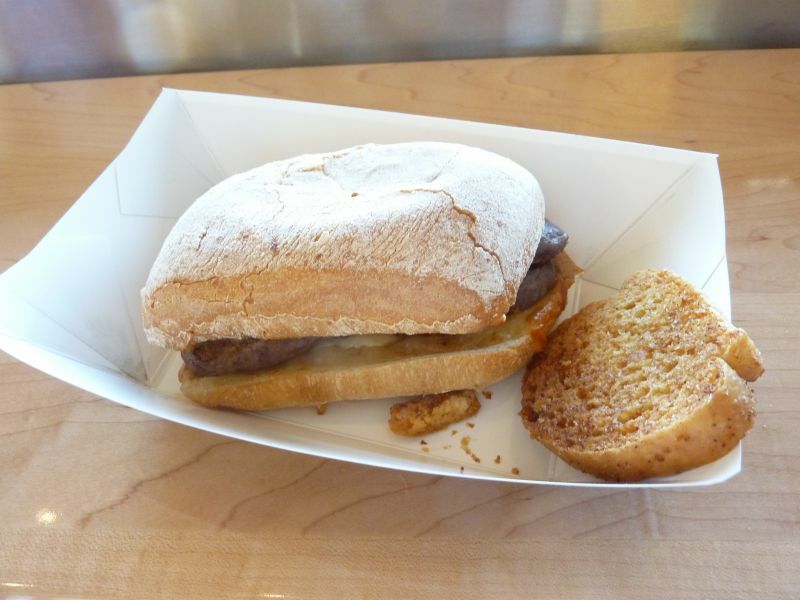 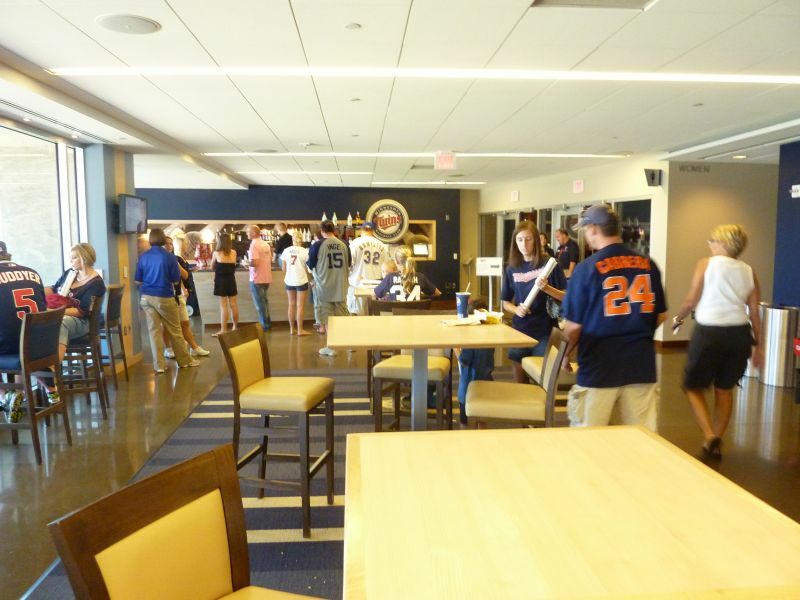 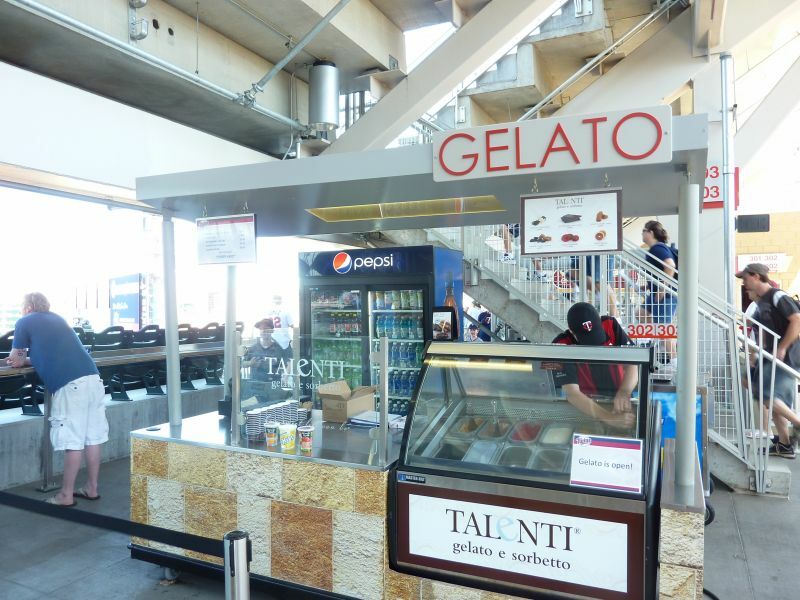 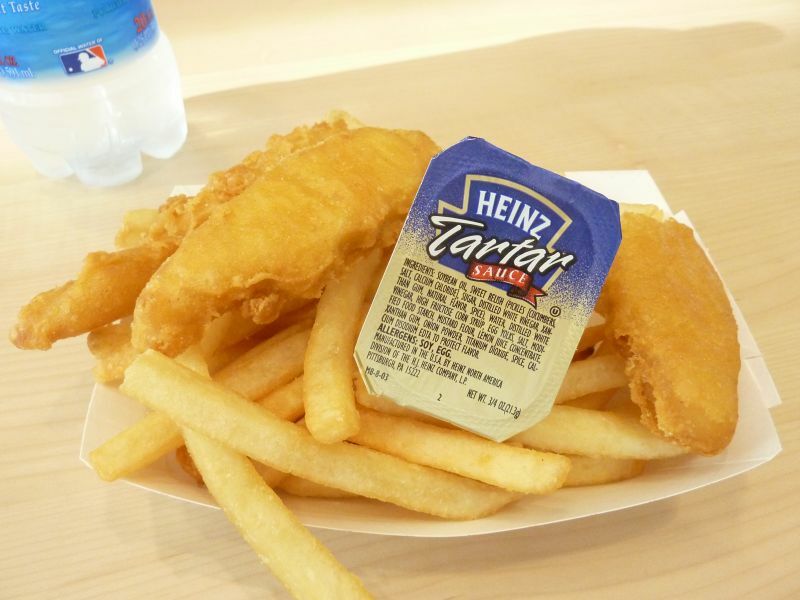 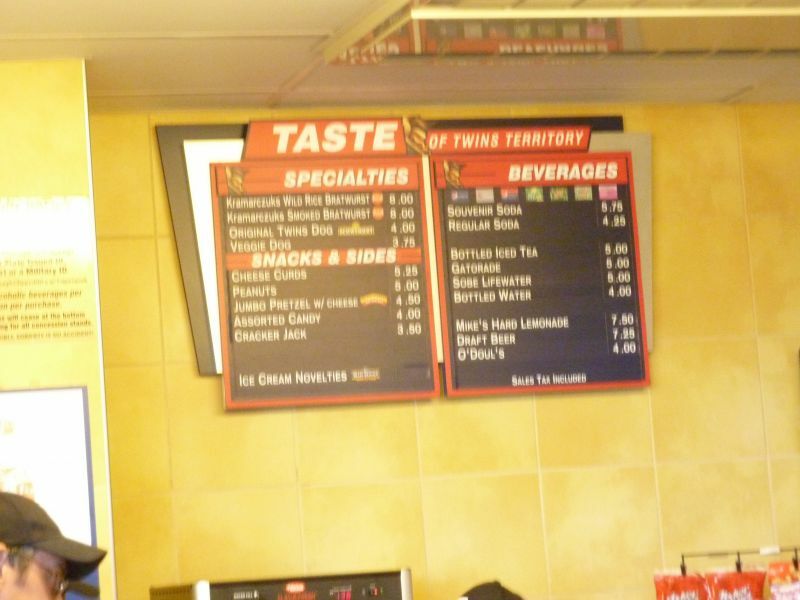 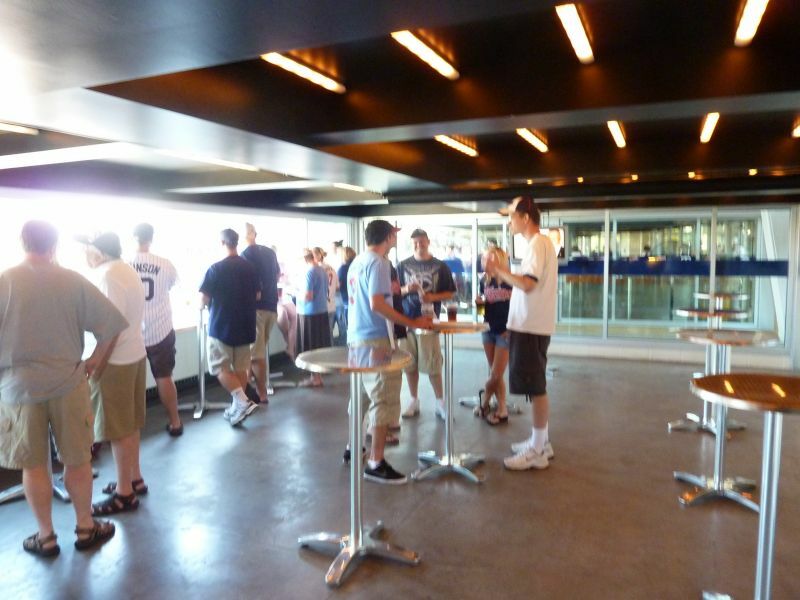 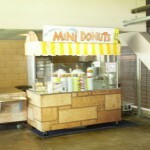 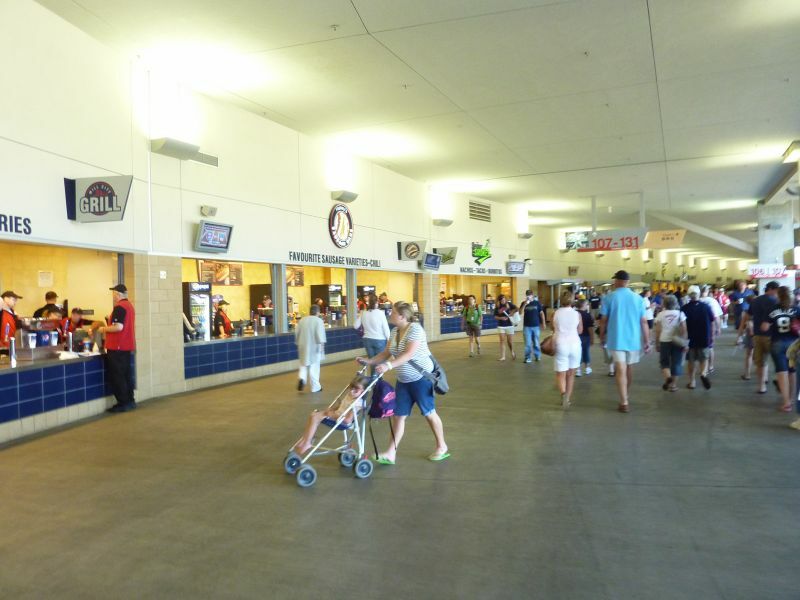 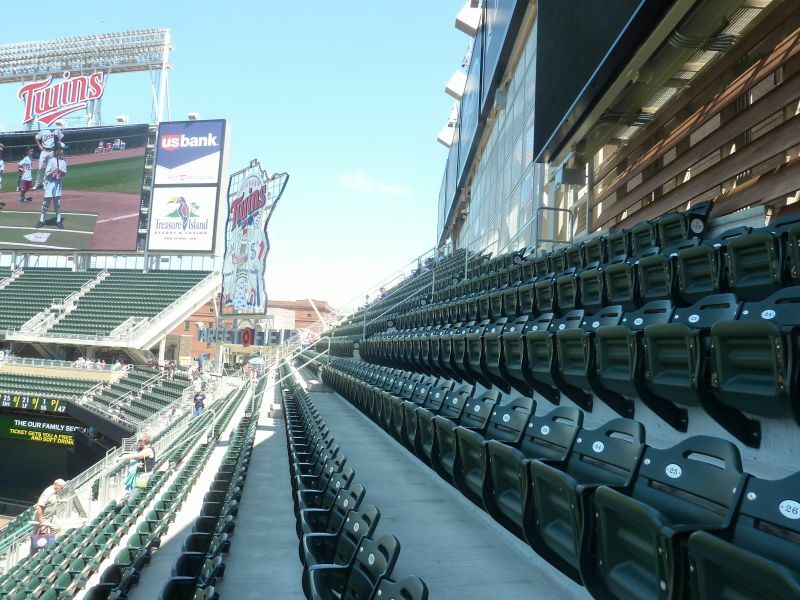 Throughout the late 90s and 2000s, we saw a multitude of ballparks trying to be retro, though often failing due to gimmicks or a poor location, not acknowledging that contextual integration is the central tenet of a well designed “retro” ballpark. 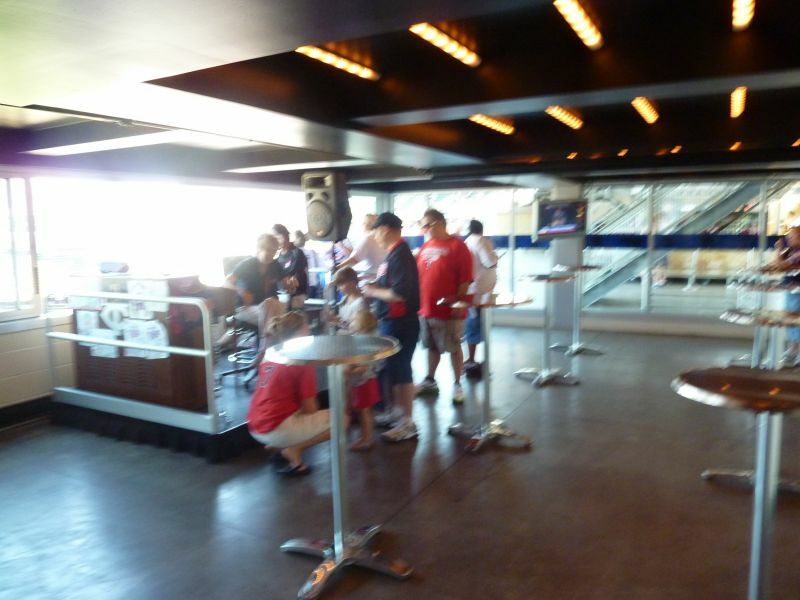 We saw multiple teams build retro cookie cutters in the middle of parking lots (The Ballpark in Arlington, Citizens Bank Park, Citi Field). 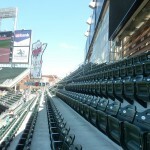 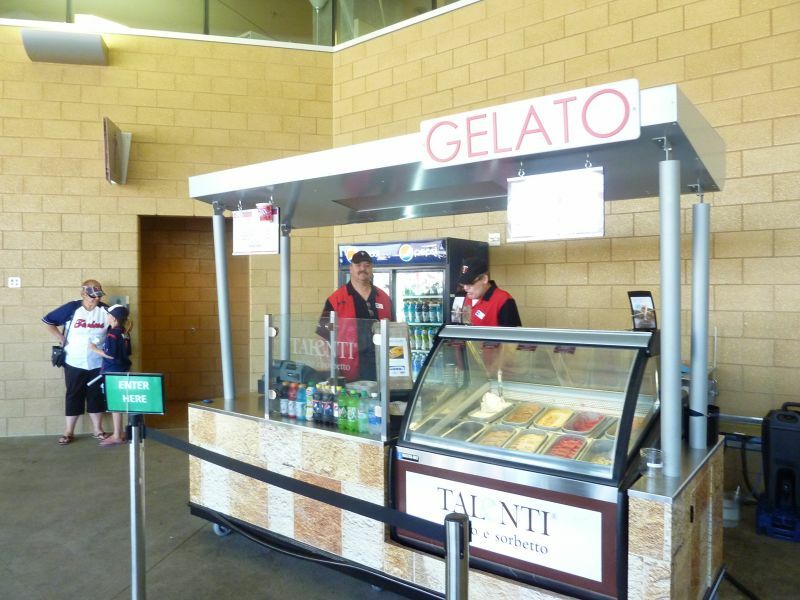 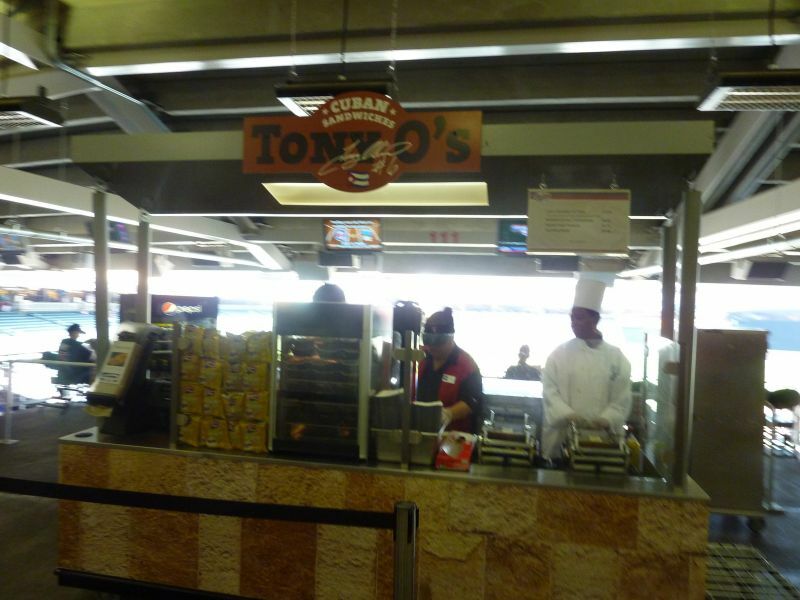 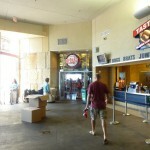 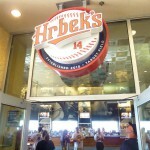 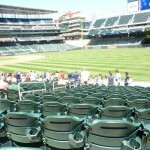 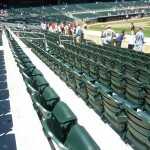 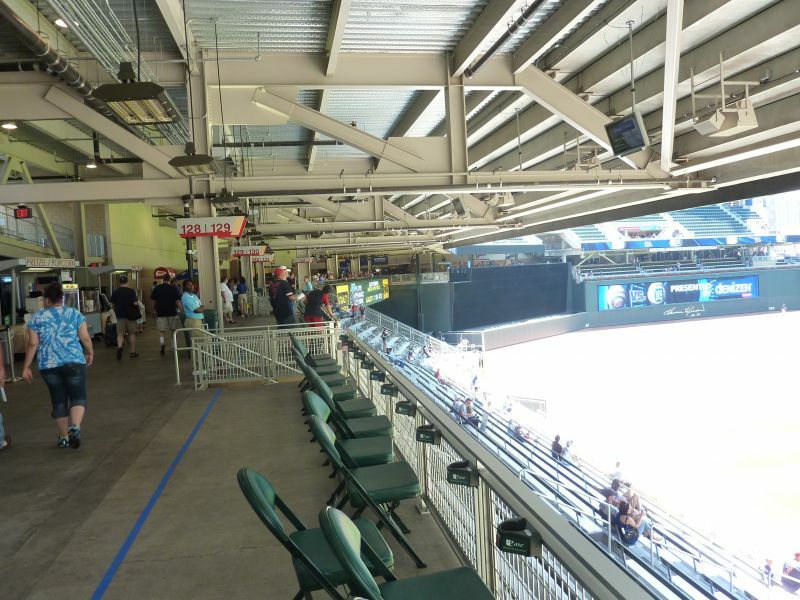 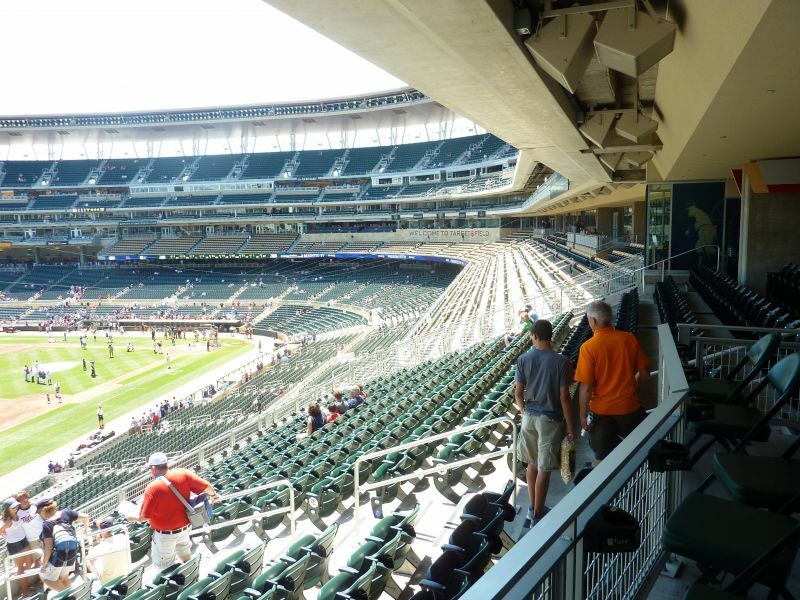 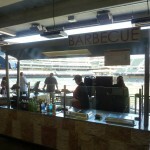 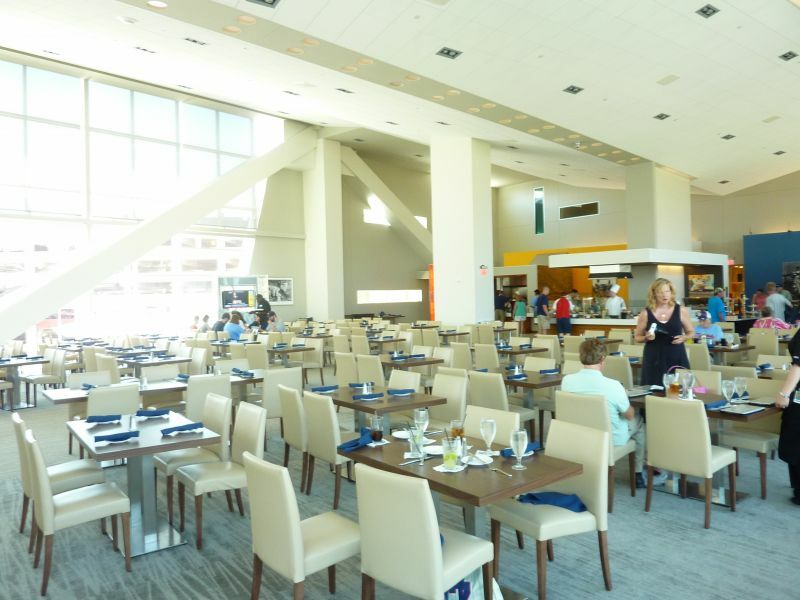 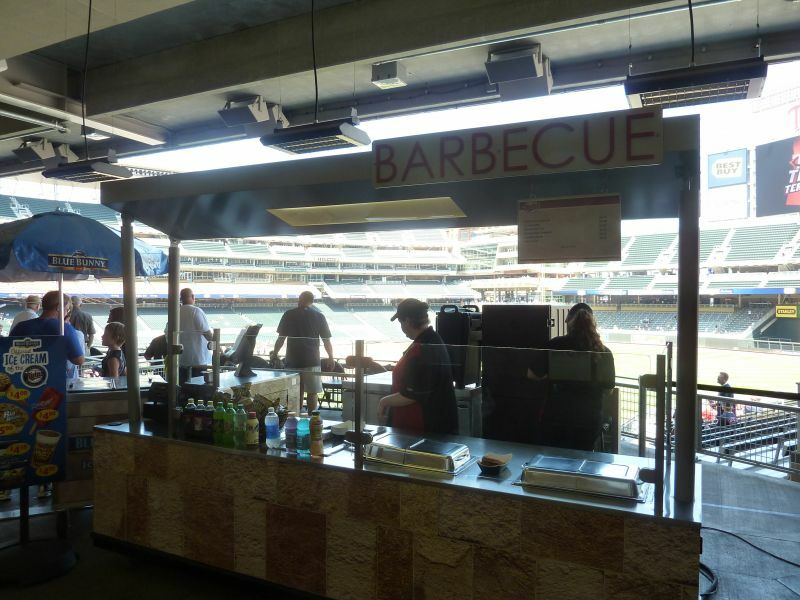 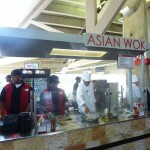 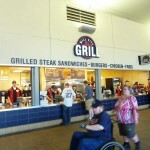 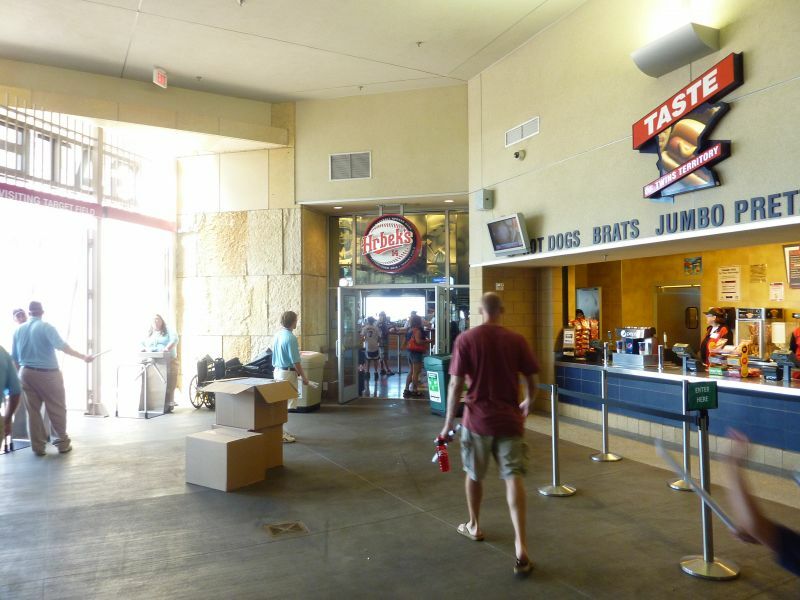 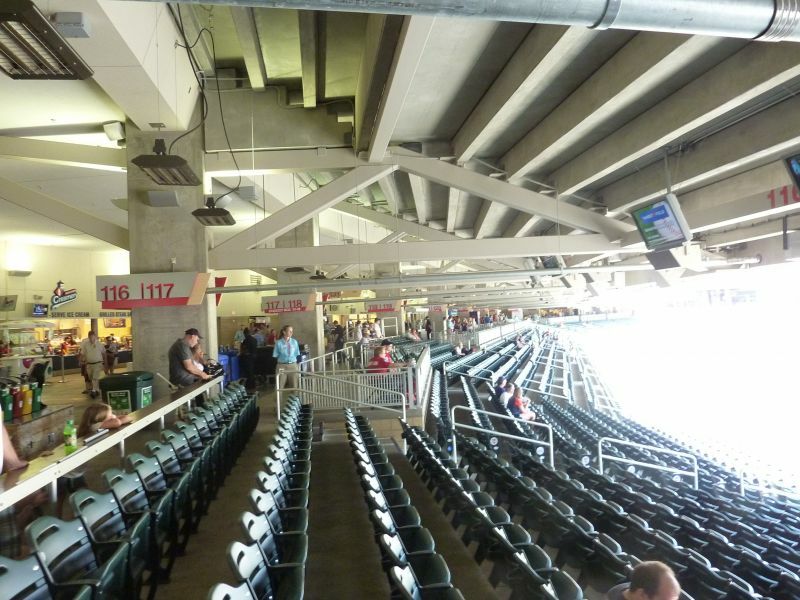 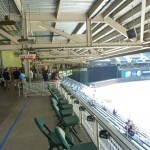 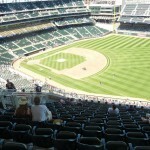 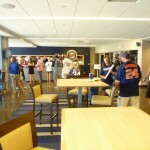 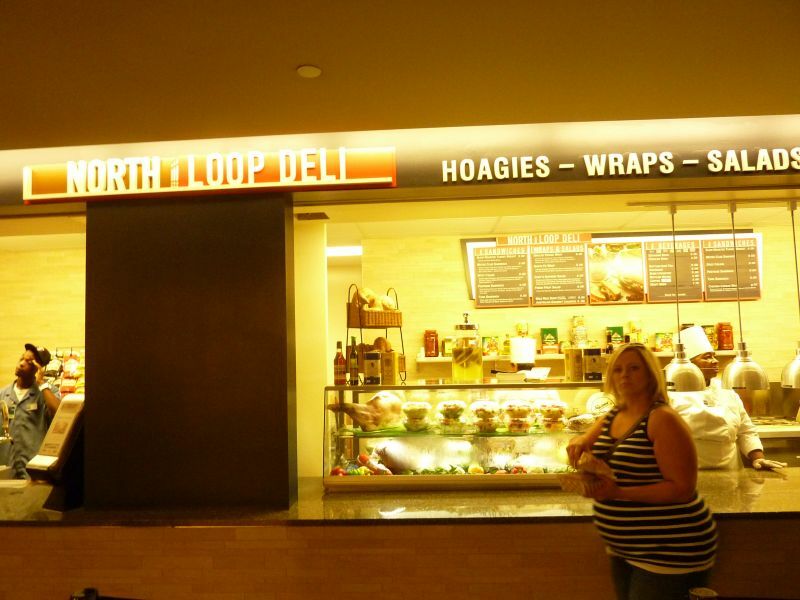 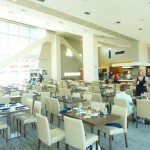 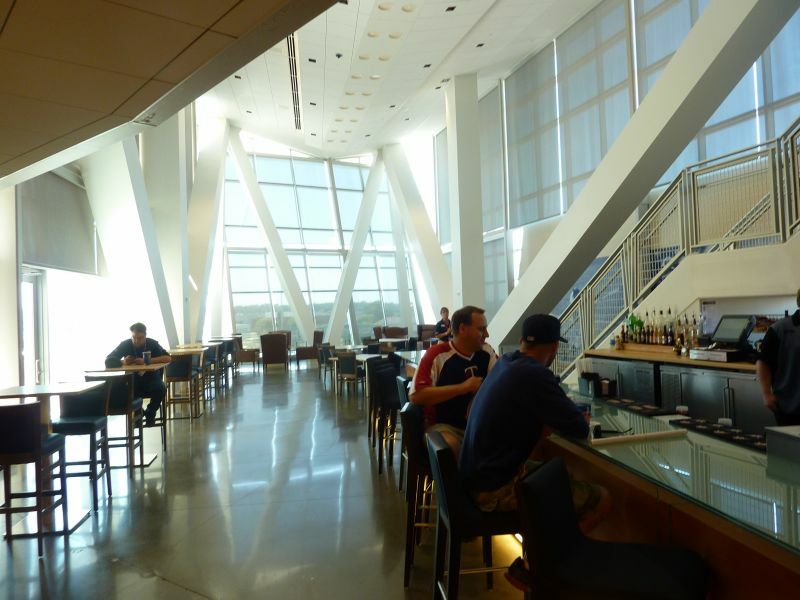 We saw teams attempt to build unique and/or contextually appropriate ballparks, but come out too gimmicky, overdone, disjointed, or busy (Minute Maid Park, Petco Park, Great American Ballpark). 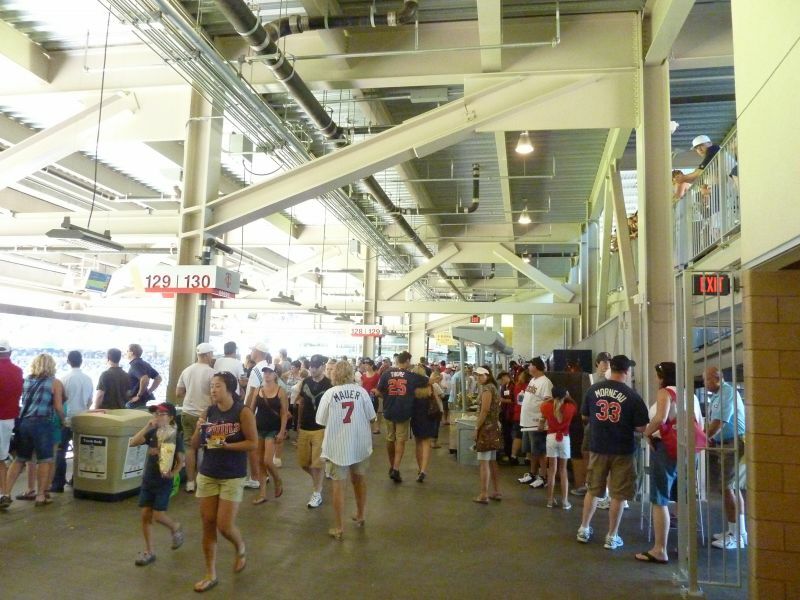 Of course, we also saw teams build ballparks that had little independent aesthetic vision whatsoever (Turner Field, Busch Stadium, Nationals Park). 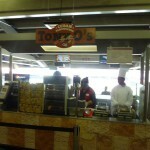 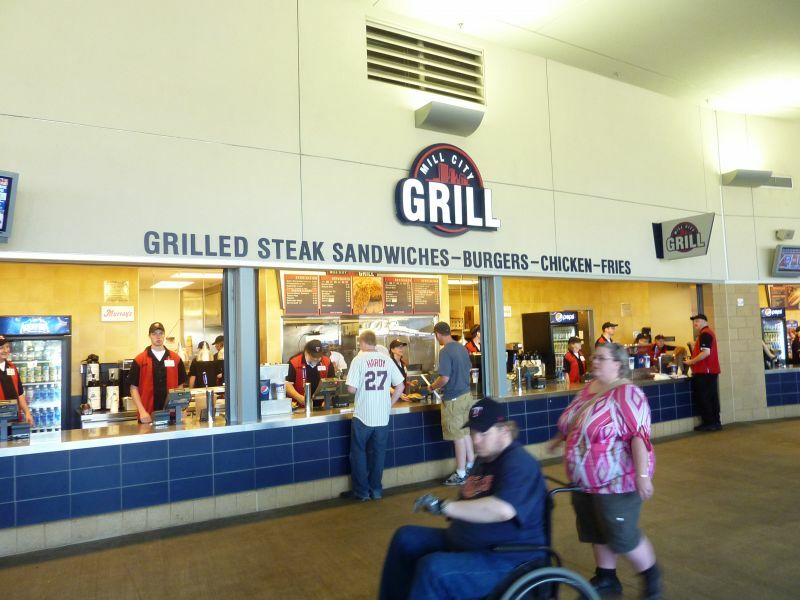 As a side note, Turner Field fits all three categories. 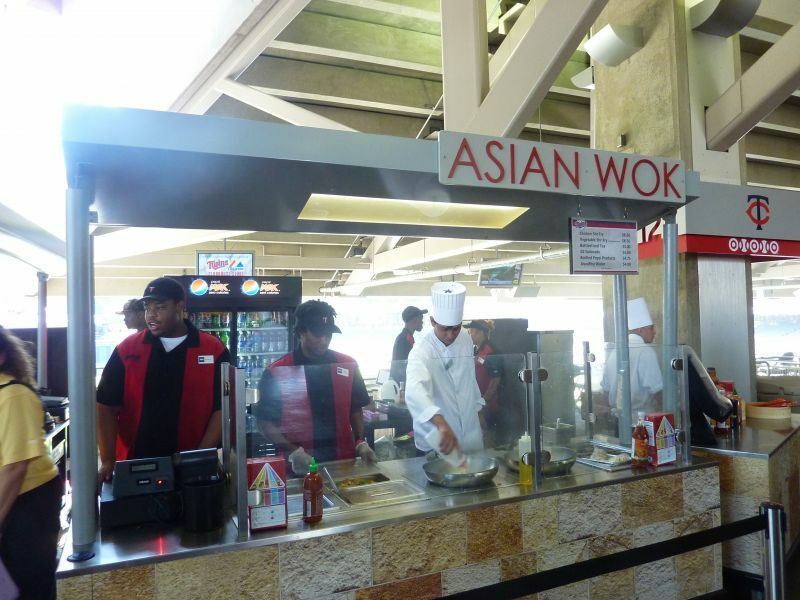 (Sorry Braves fans I couldn’t help it). 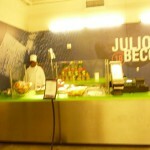 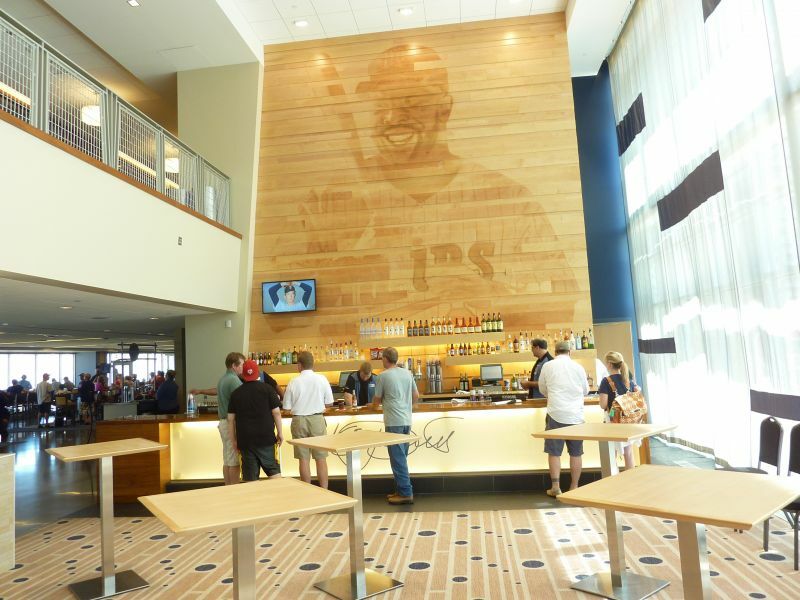 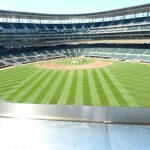 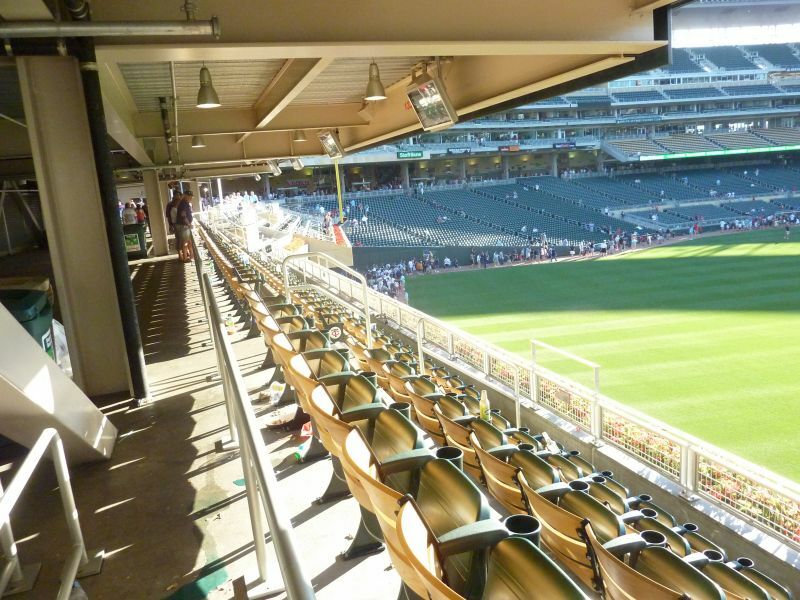 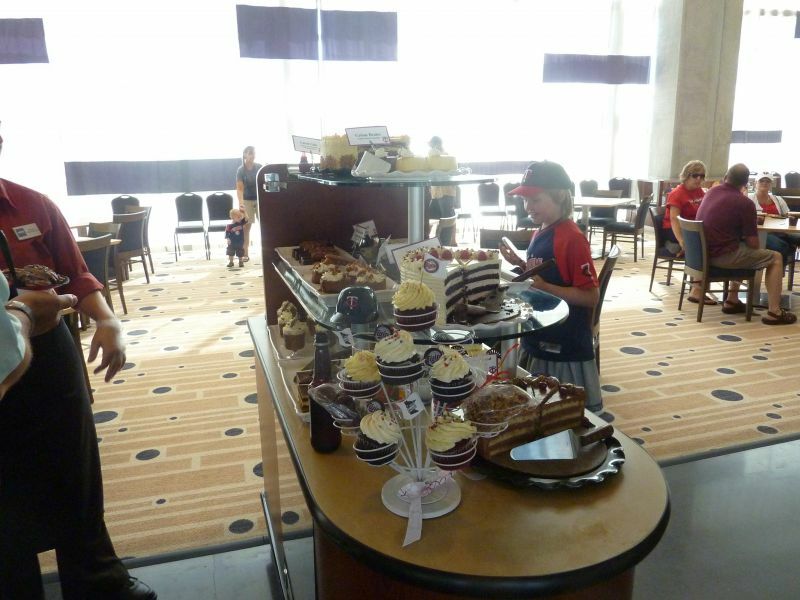 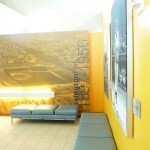 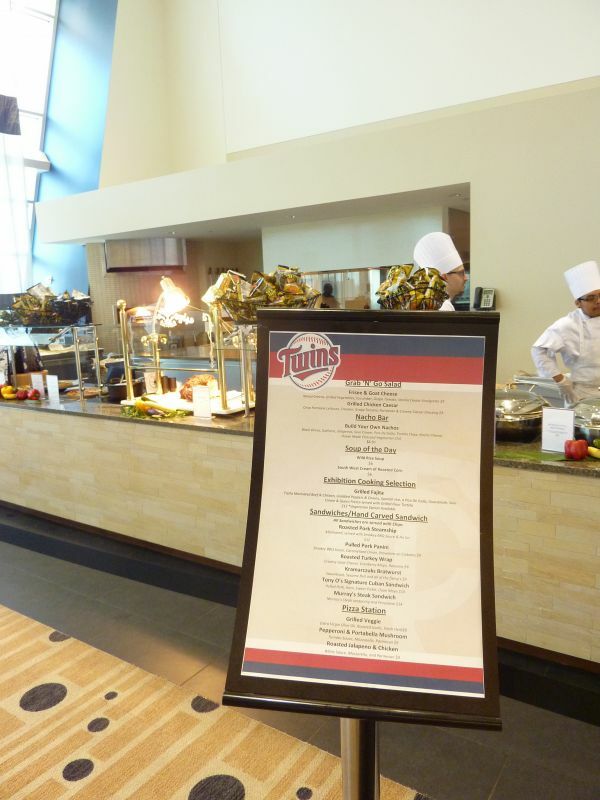 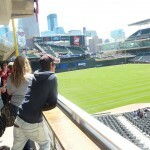 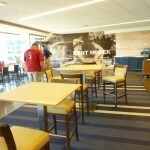 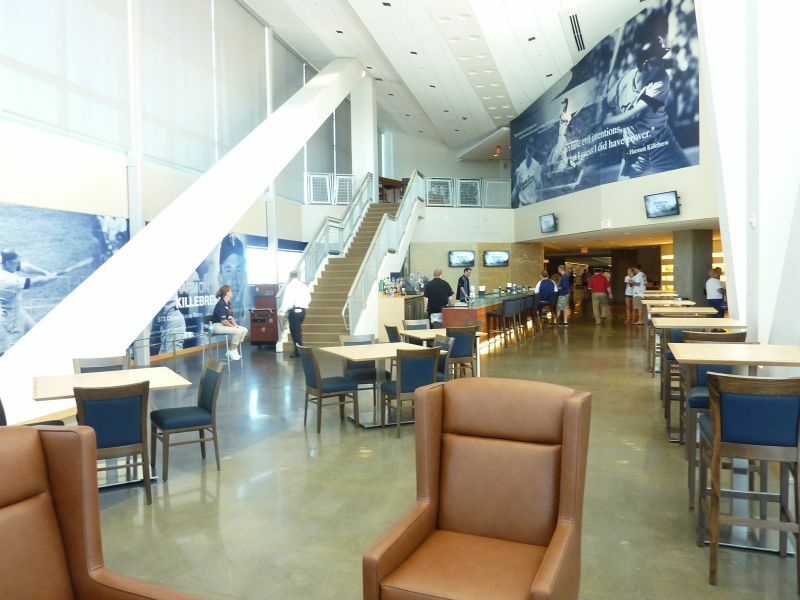 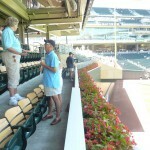 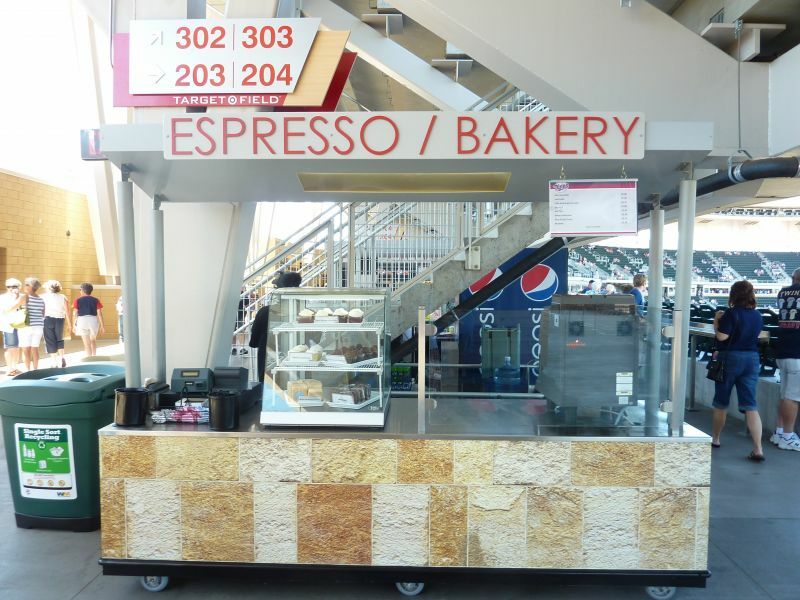 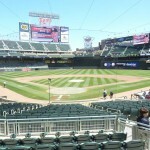 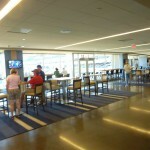 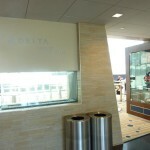 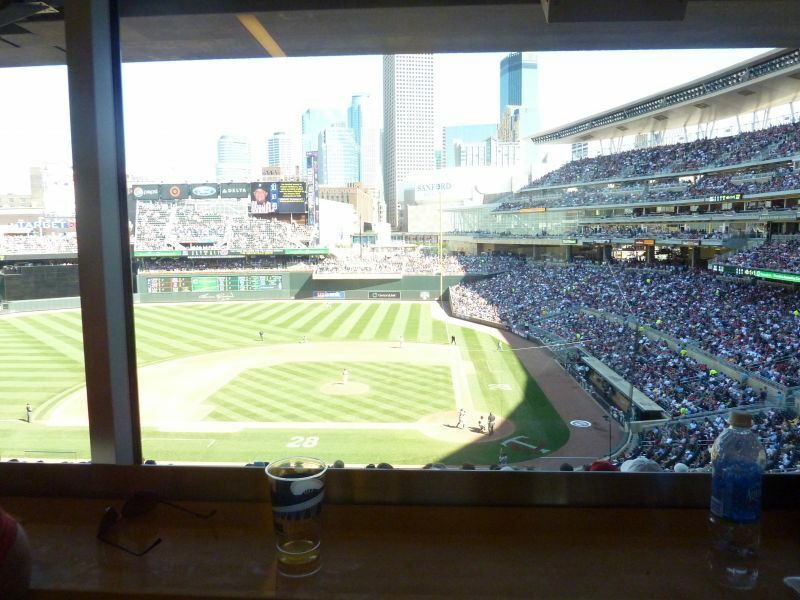 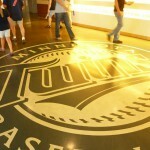 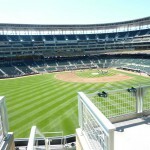 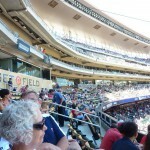 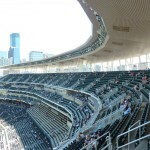 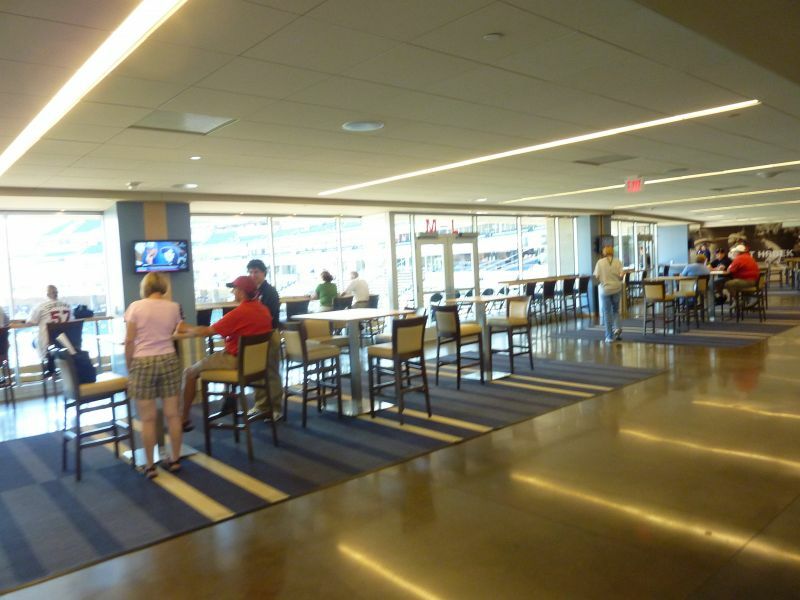 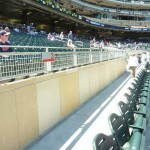 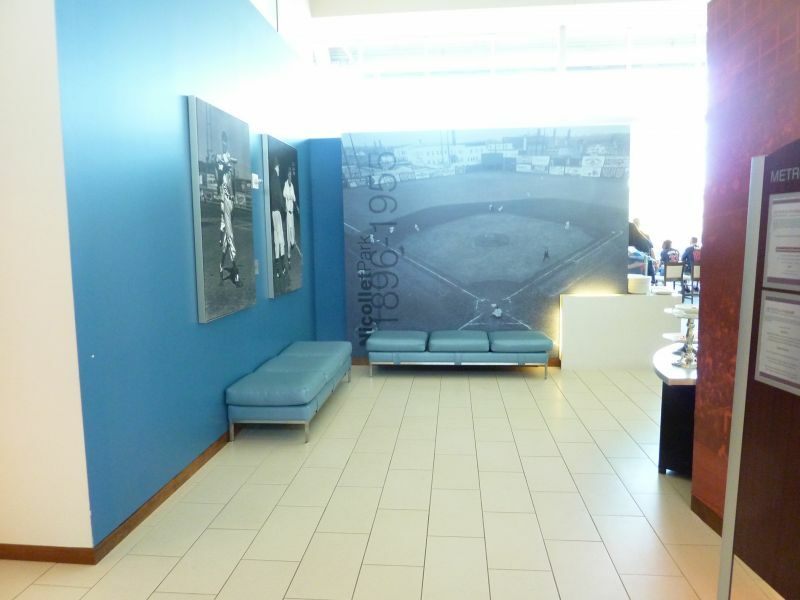 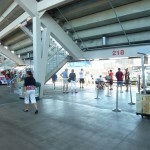 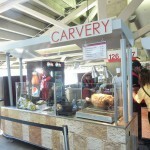 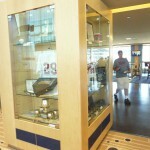 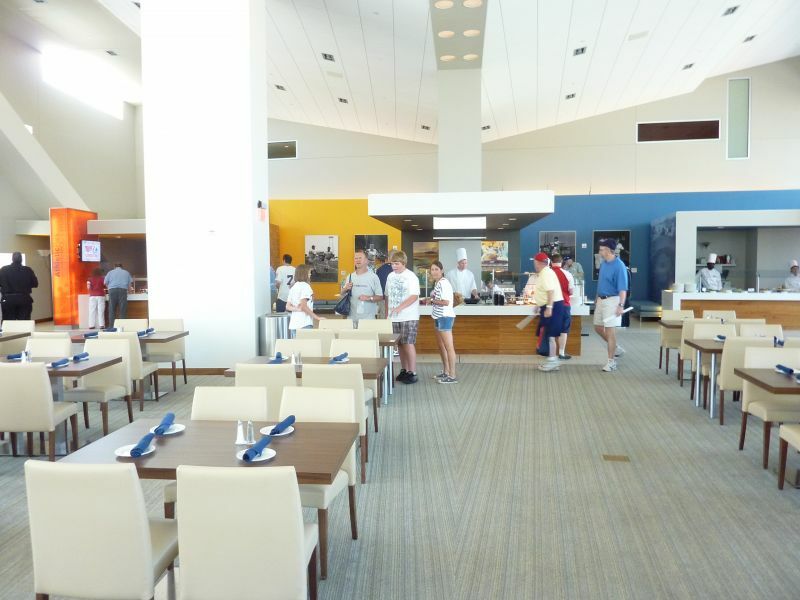 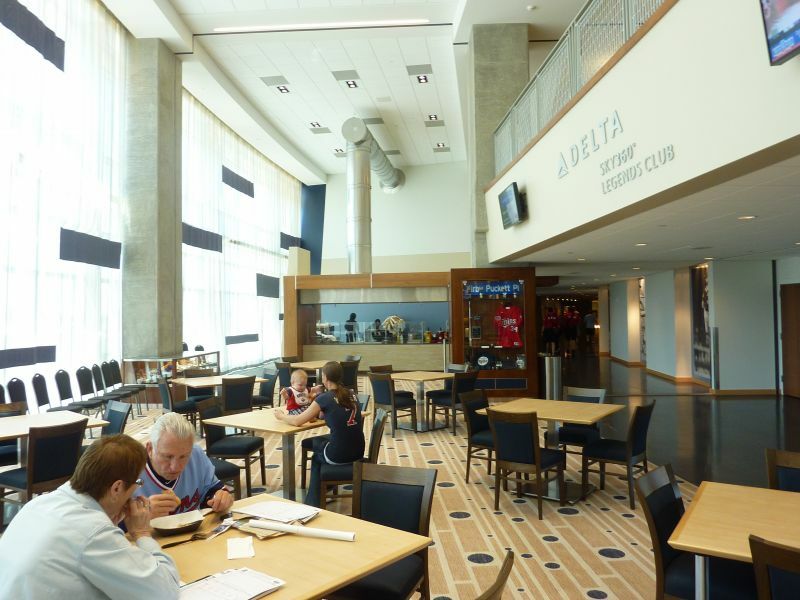 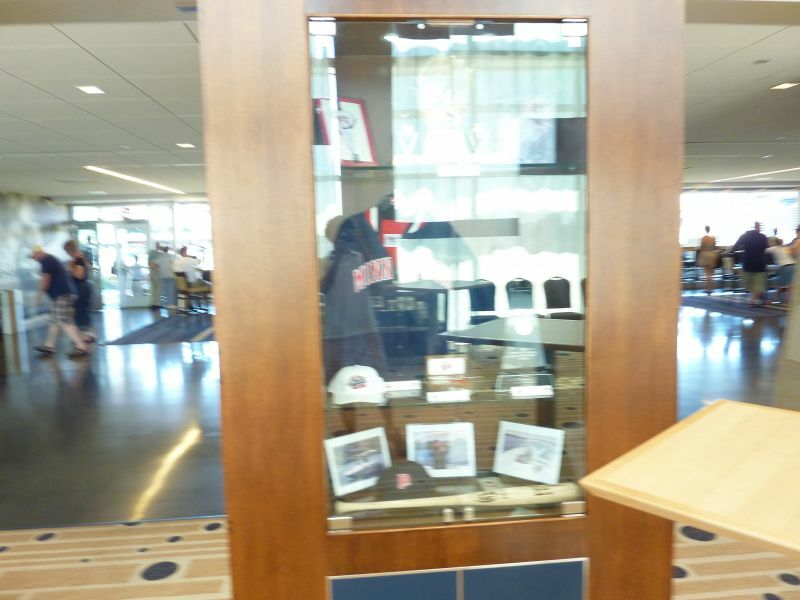 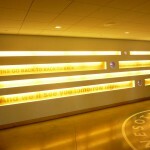 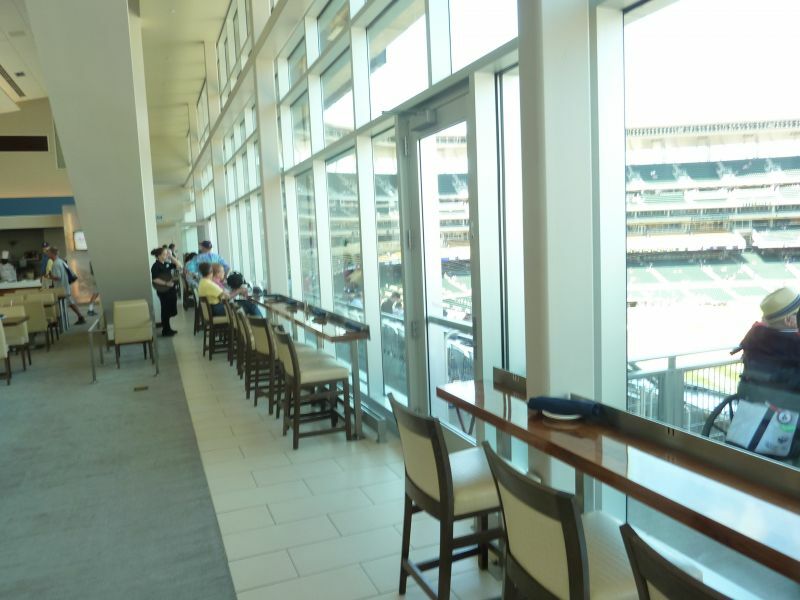 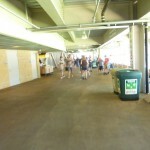 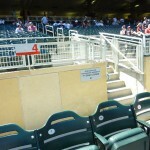 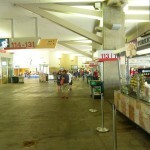 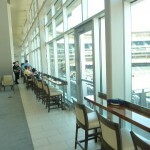 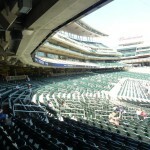 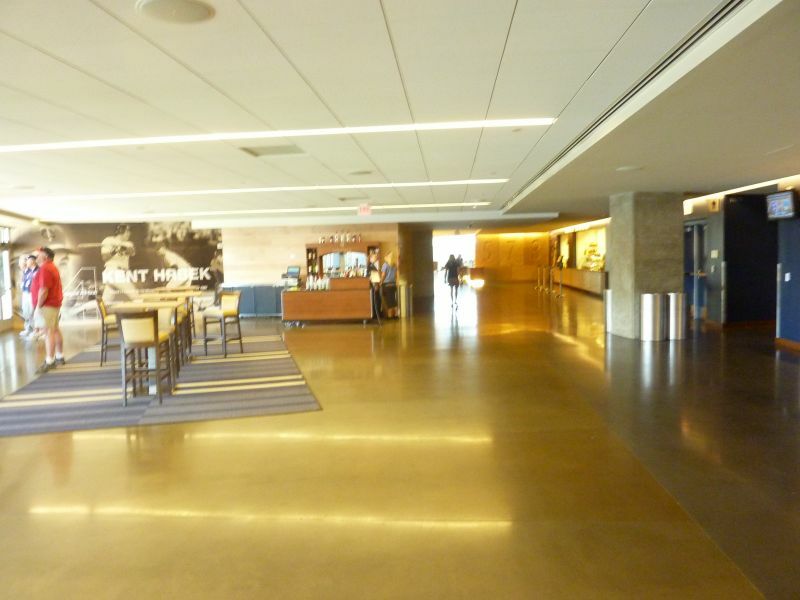 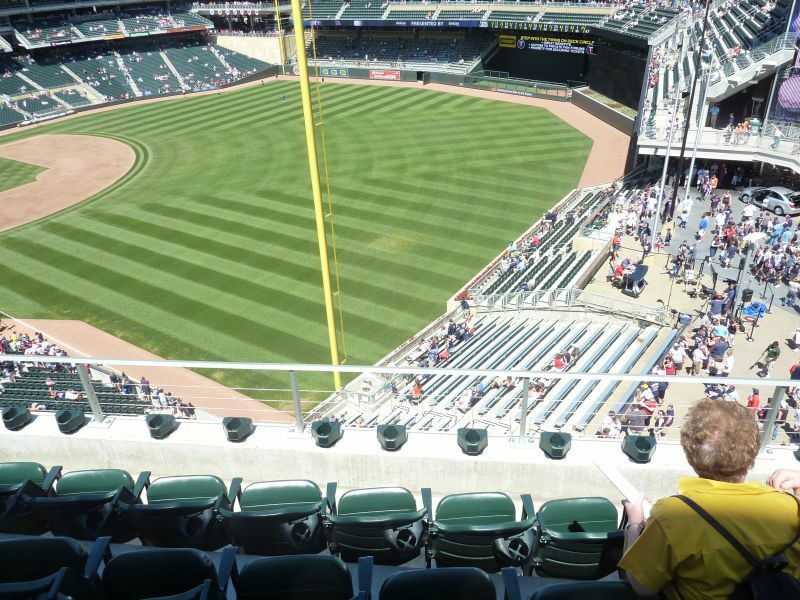 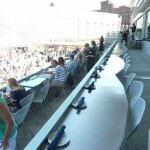 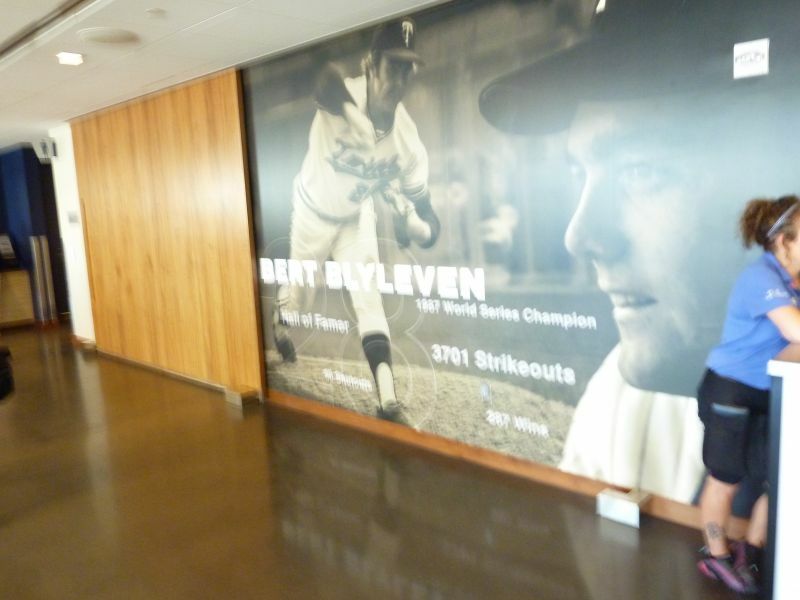 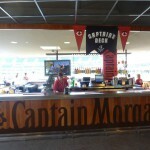 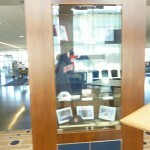 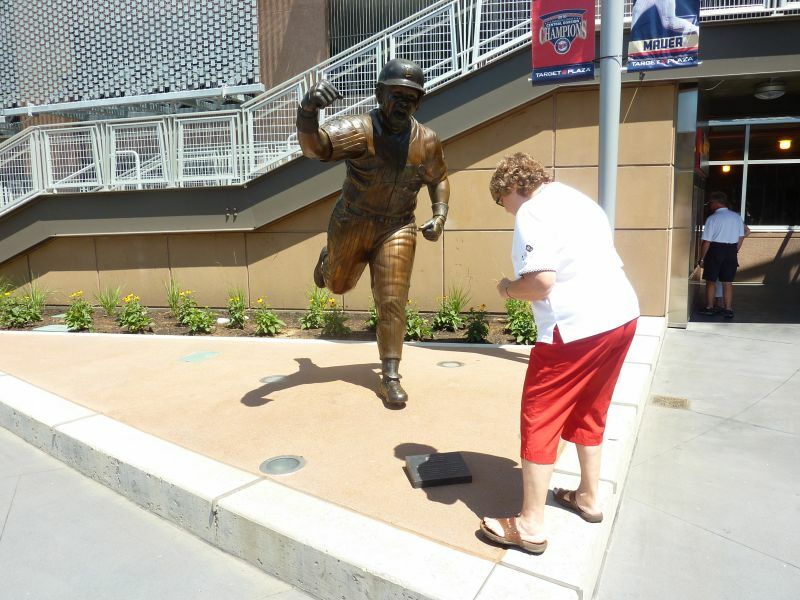 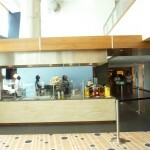 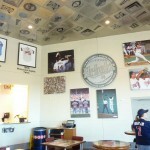 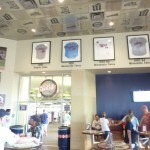 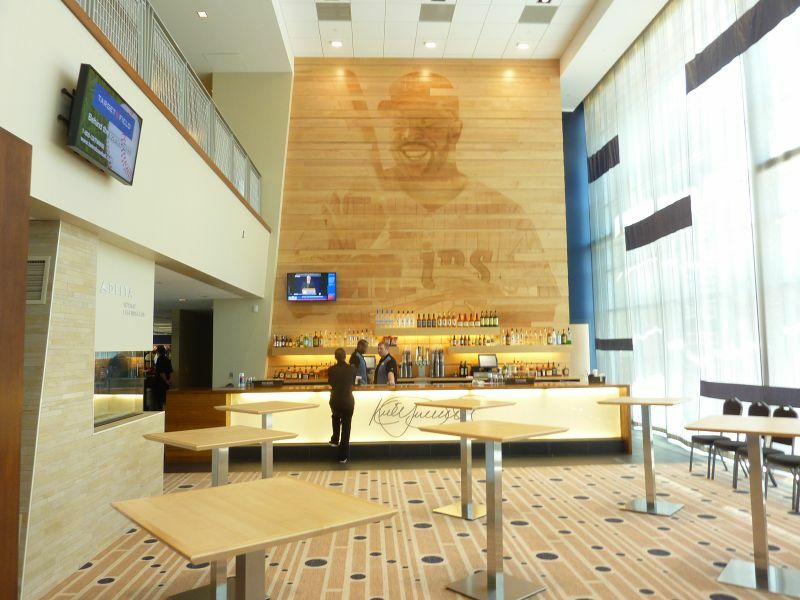 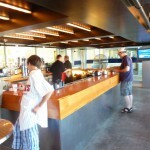 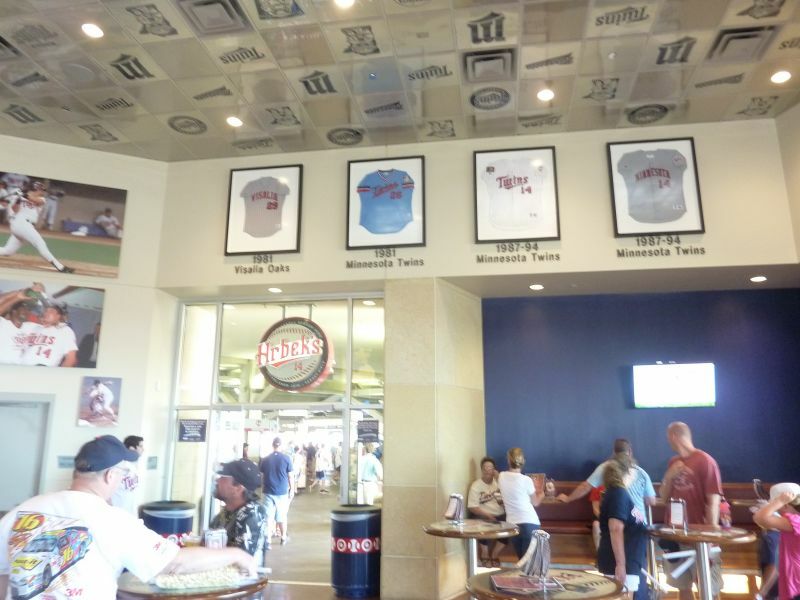 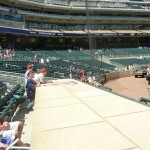 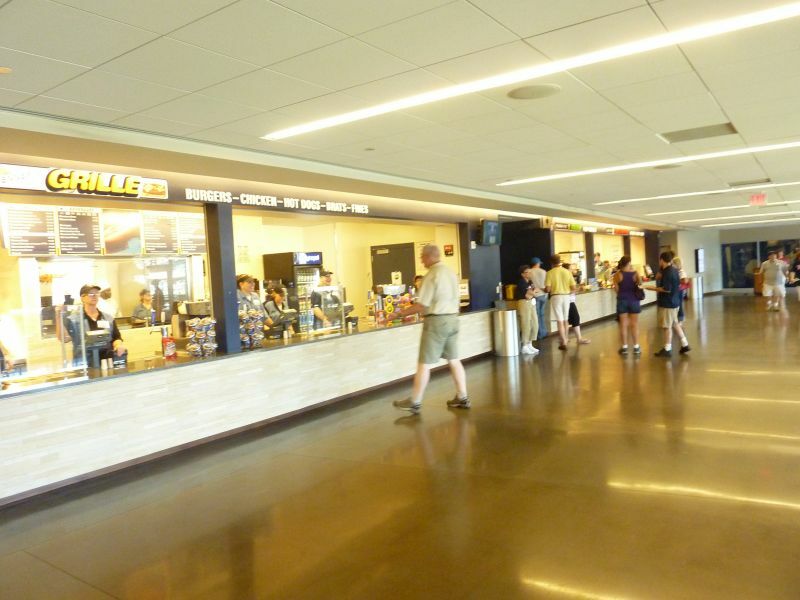 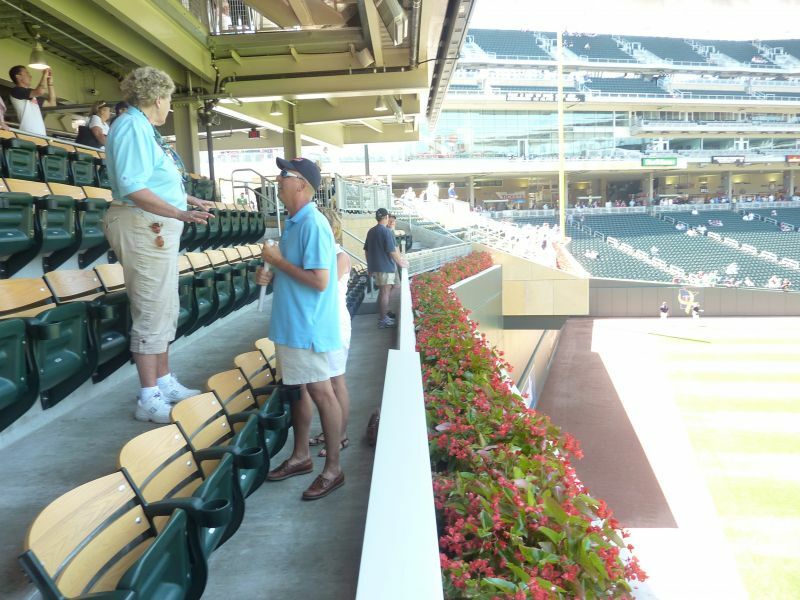 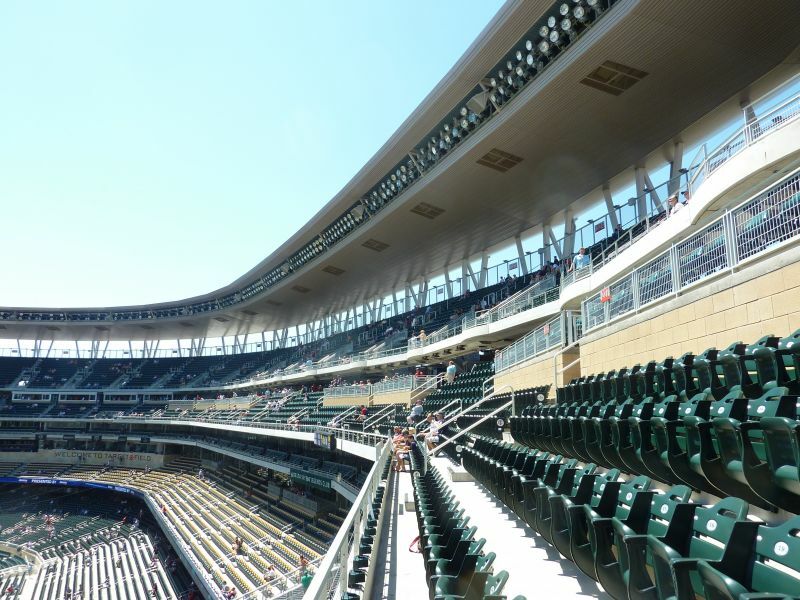 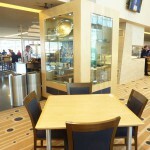 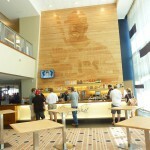 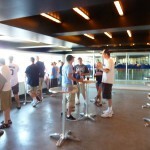 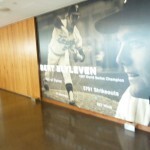 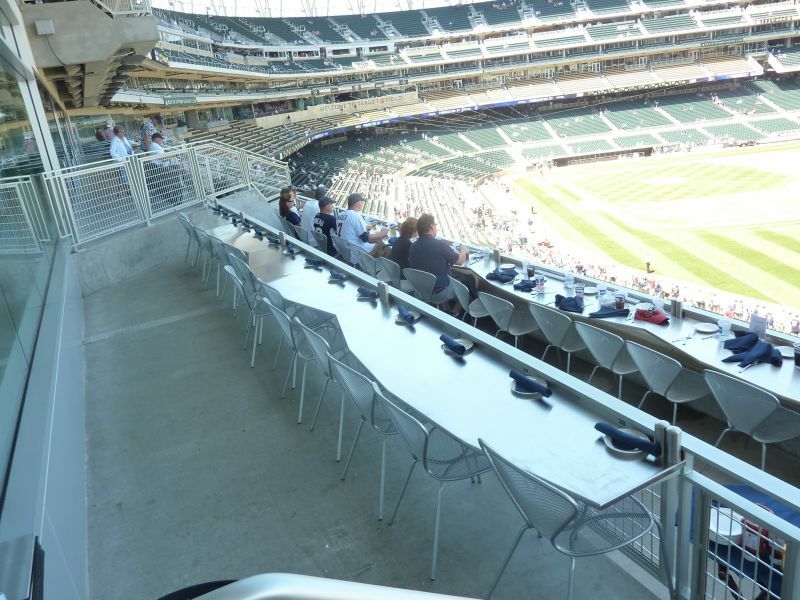 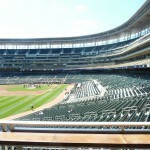 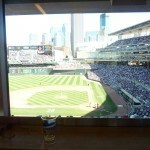 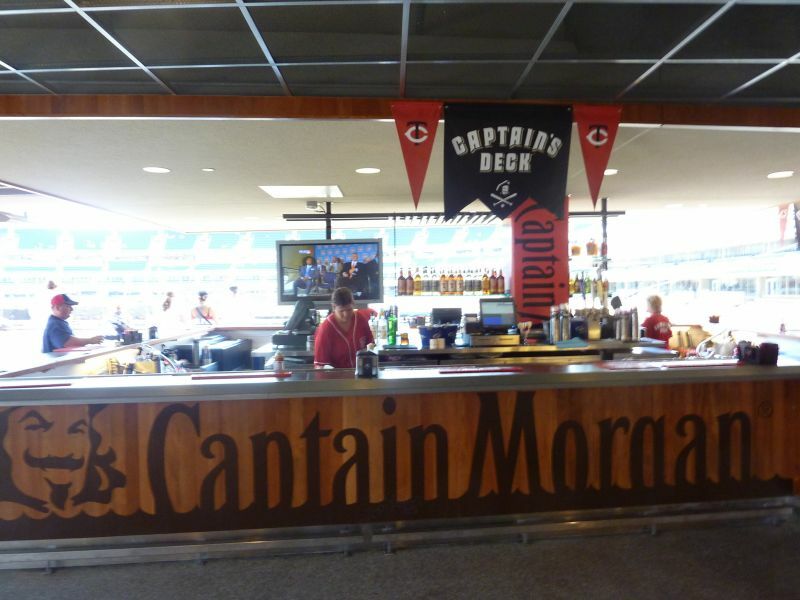 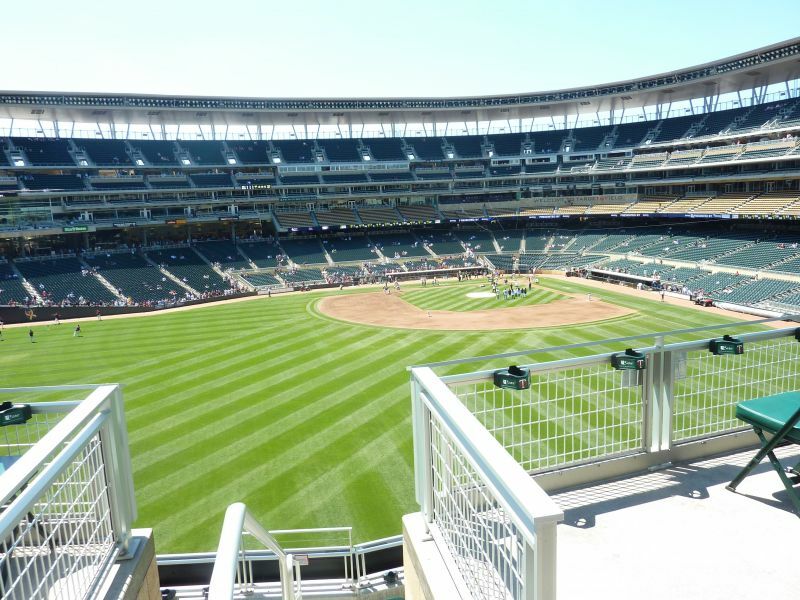 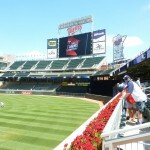 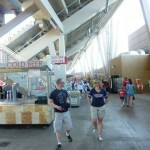 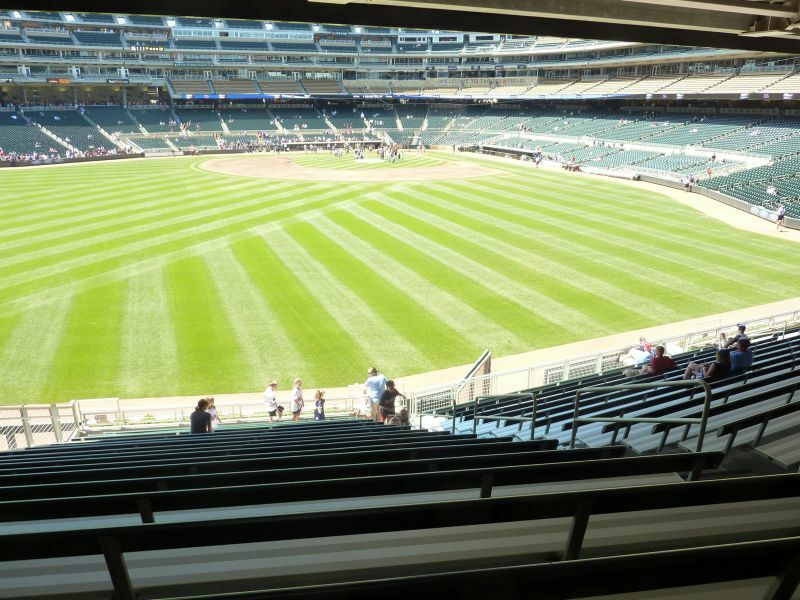 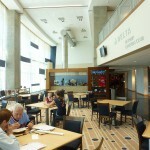 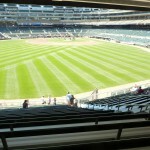 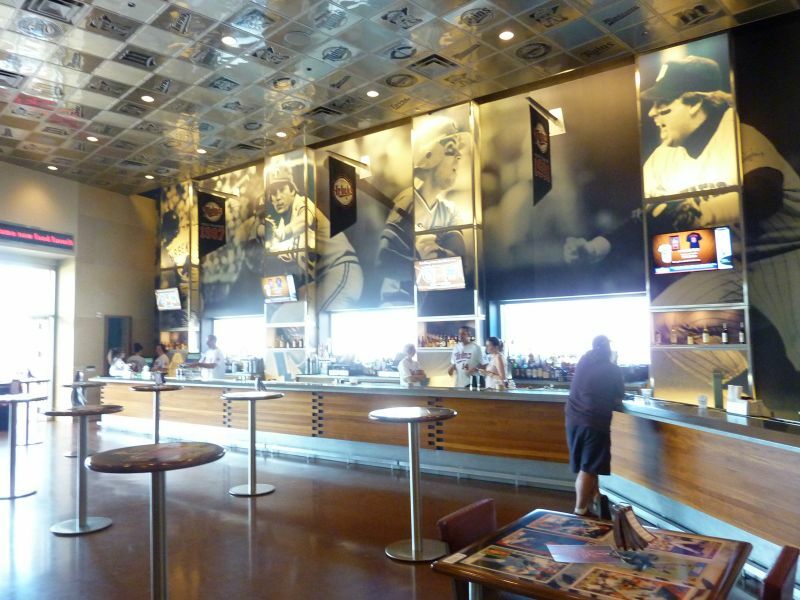 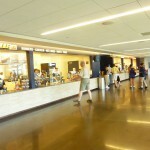 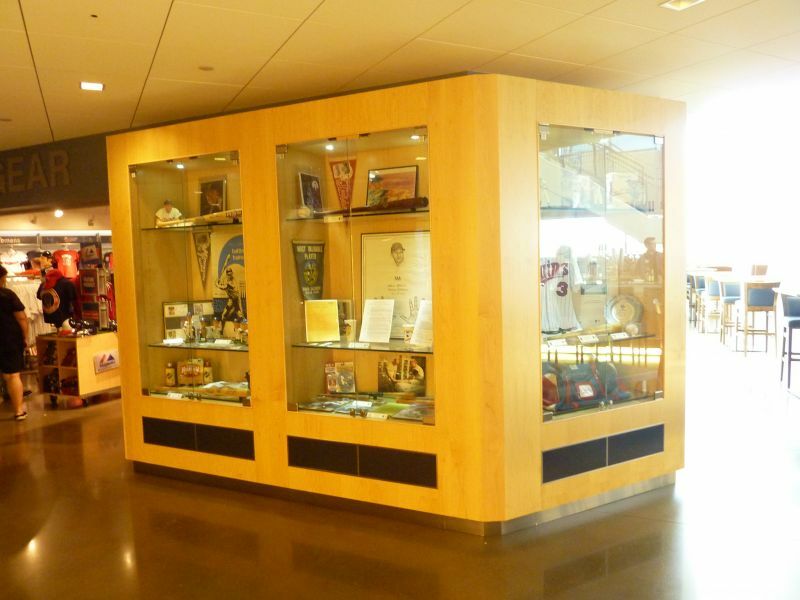 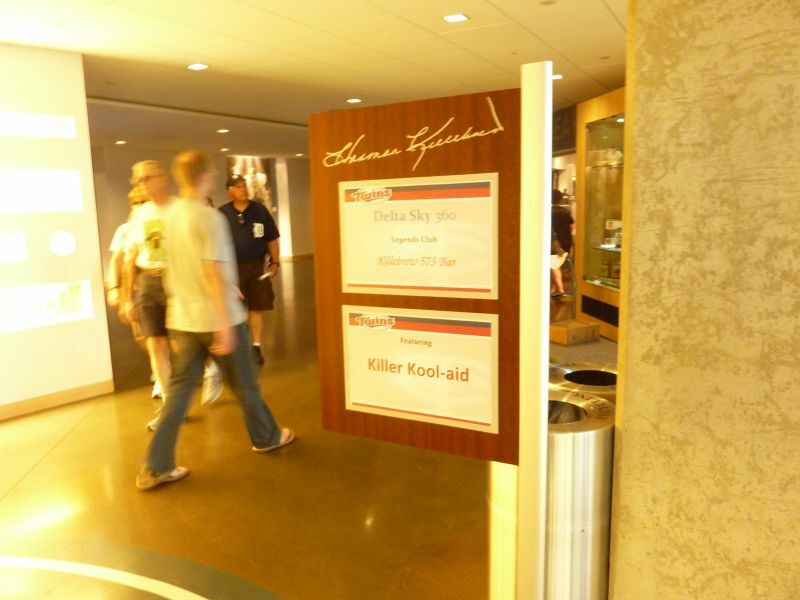 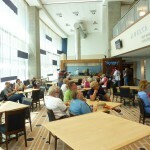 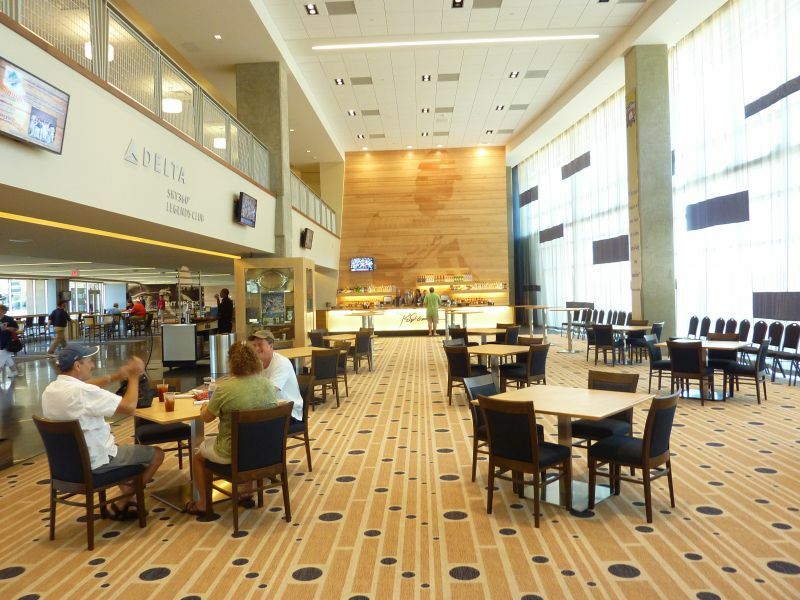 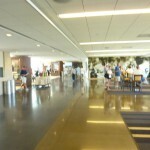 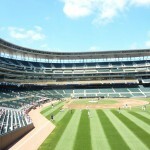 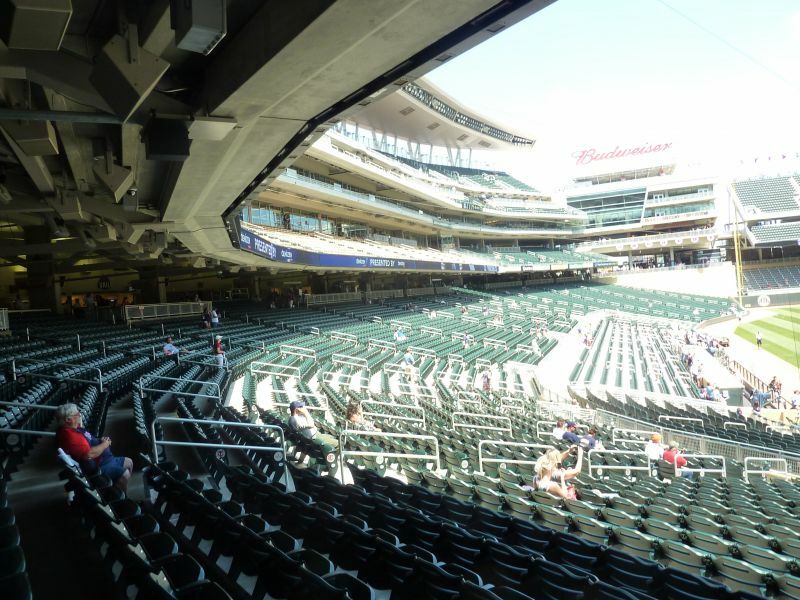 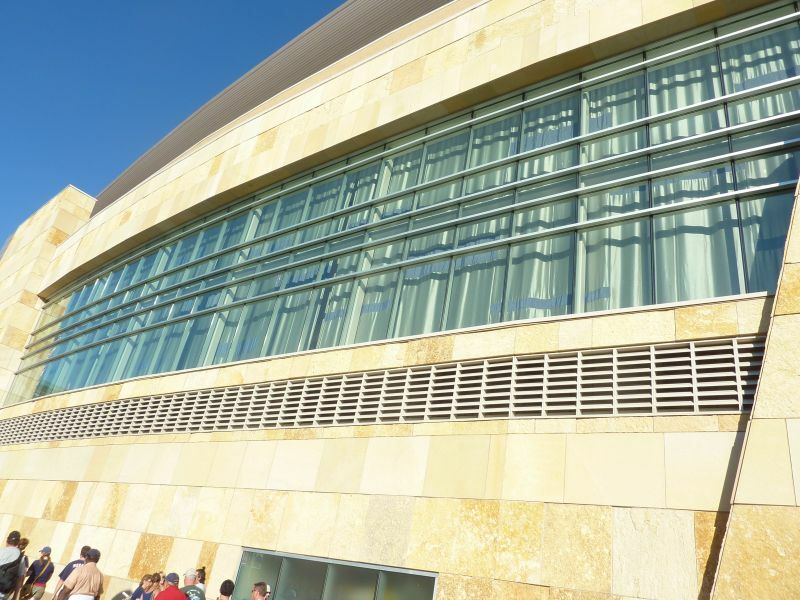 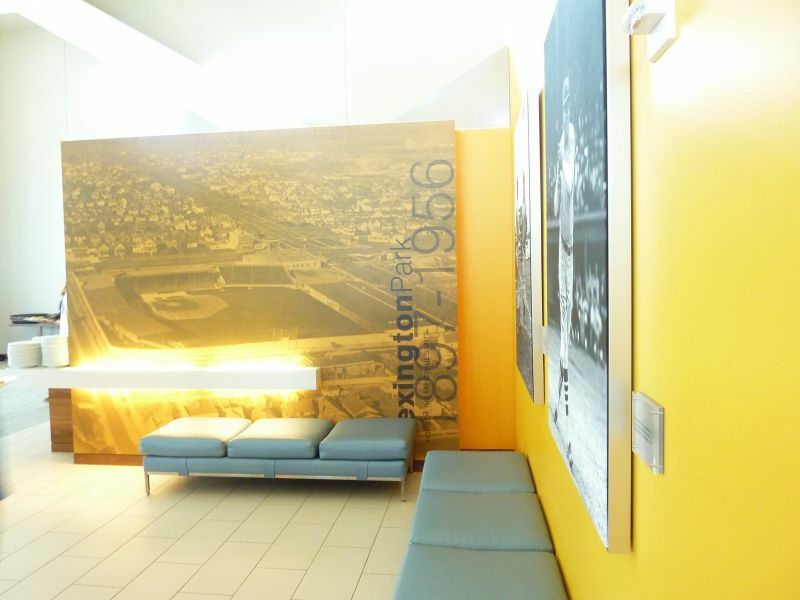 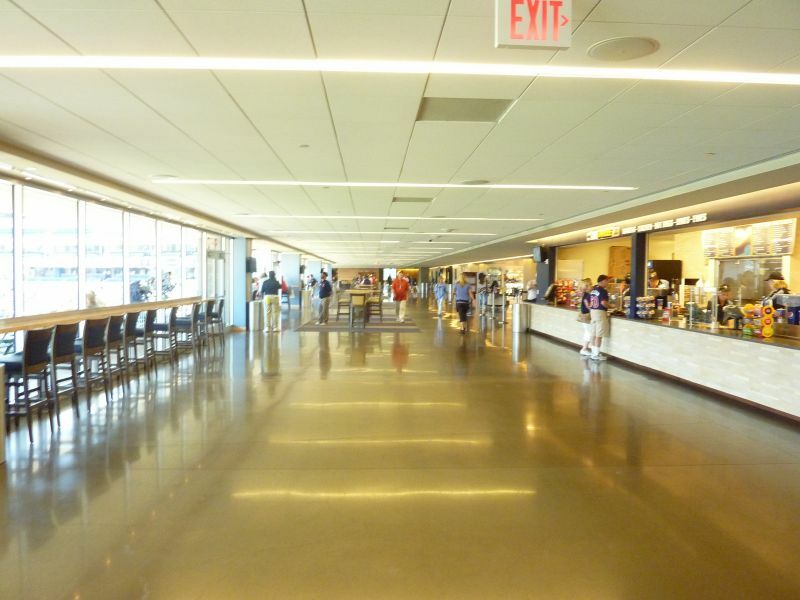 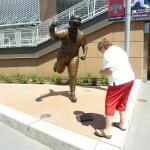 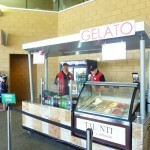 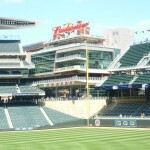 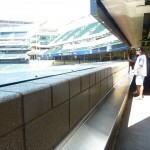 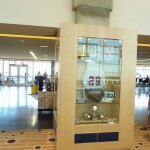 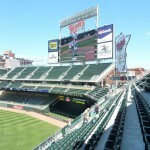 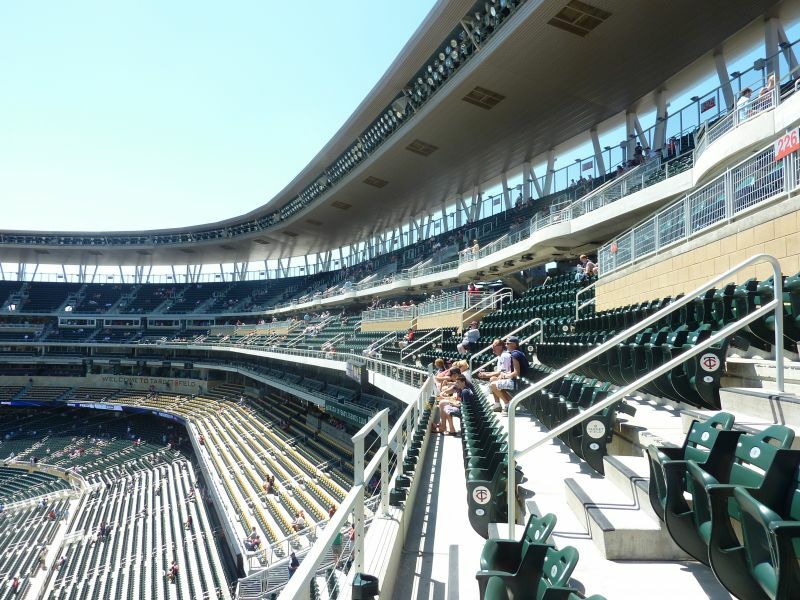 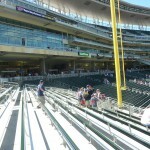 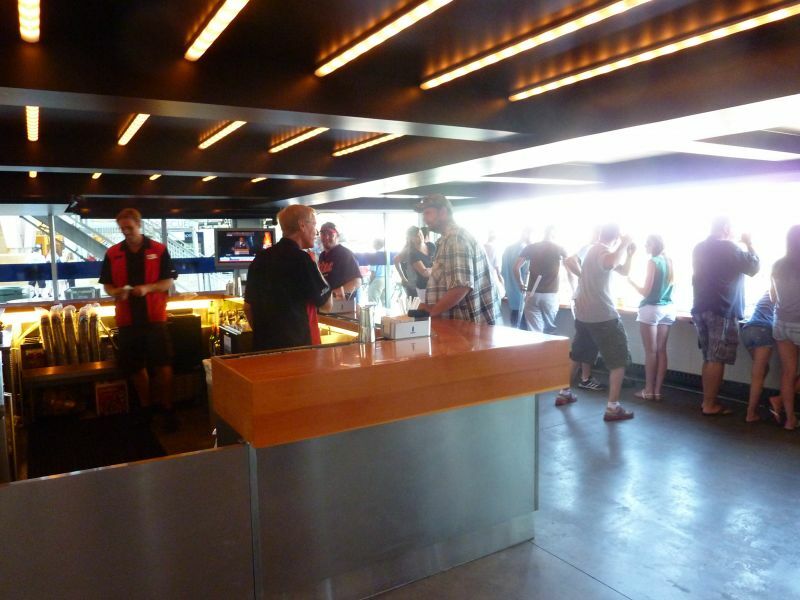 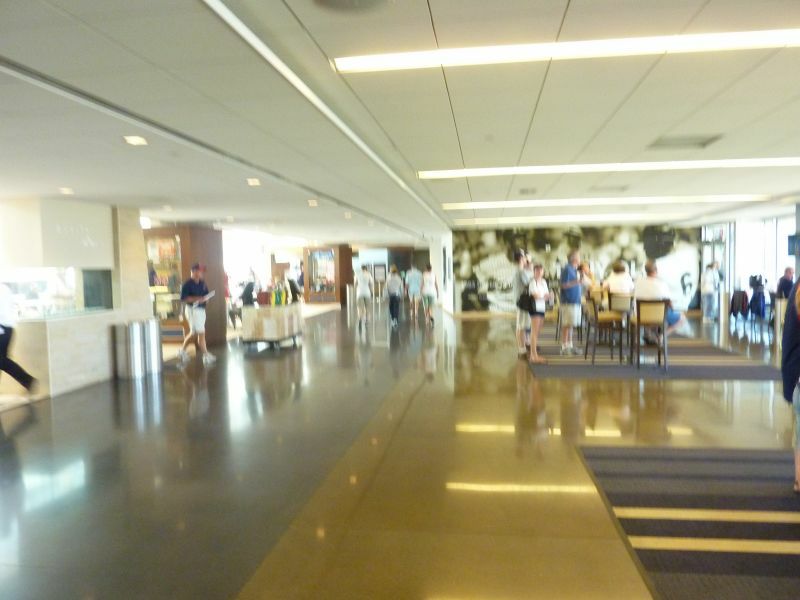 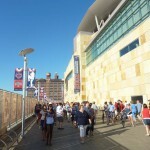 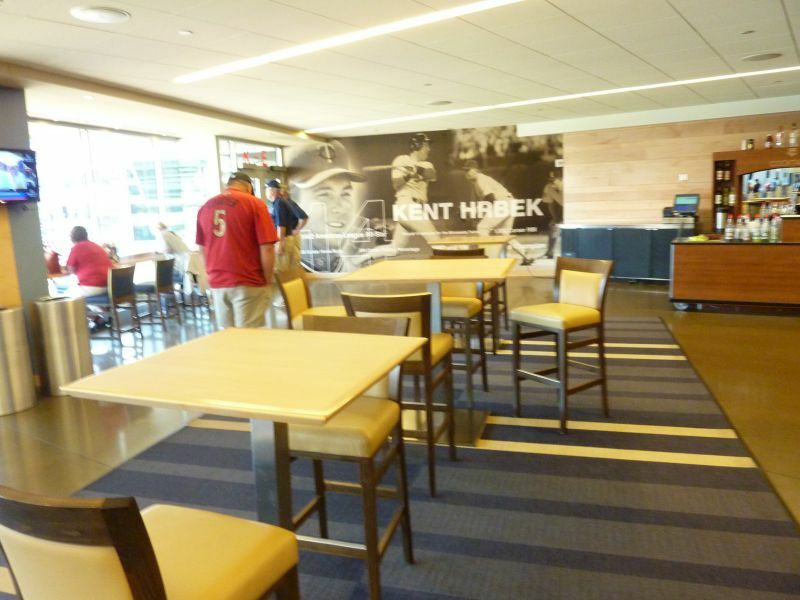 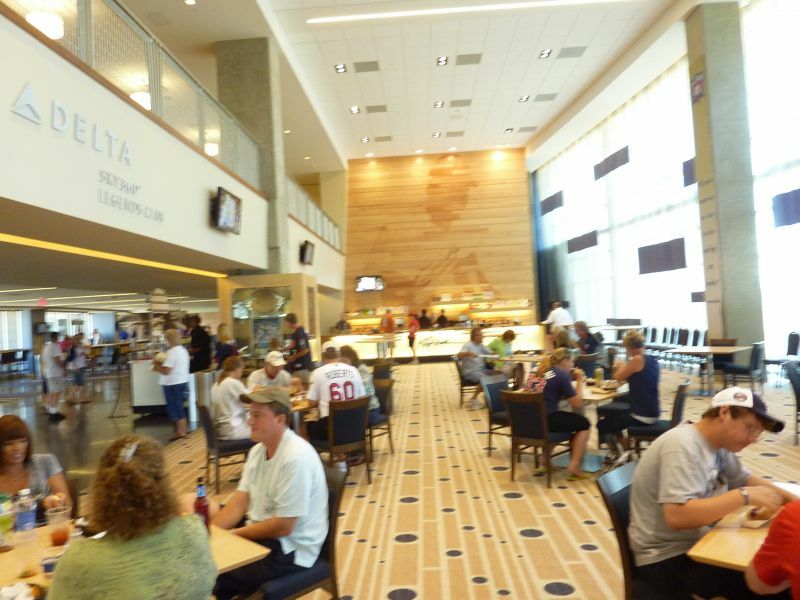 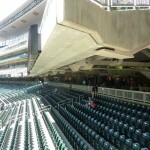 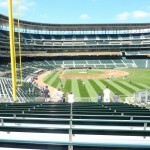 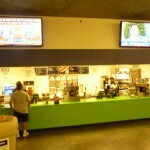 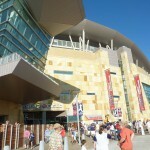 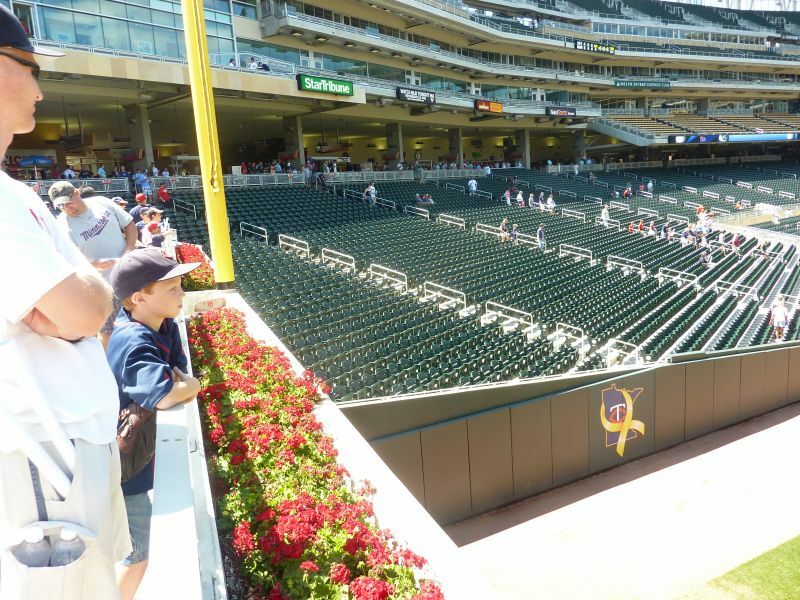 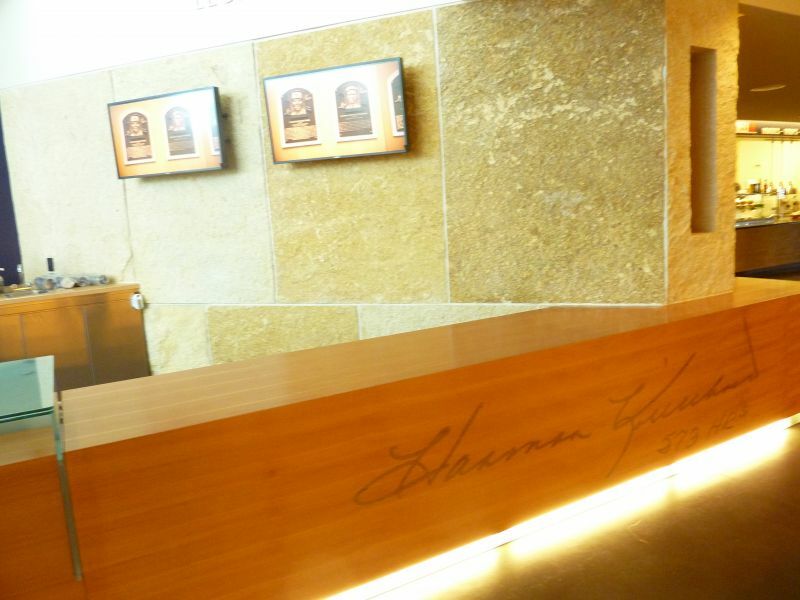 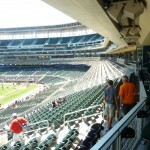 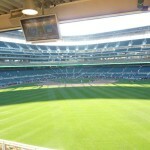 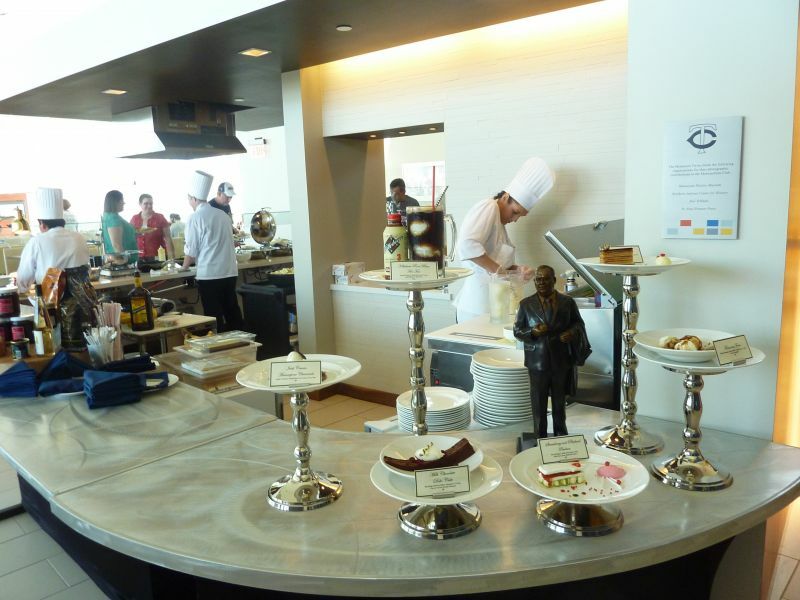 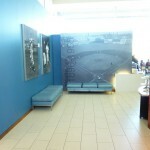 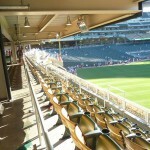 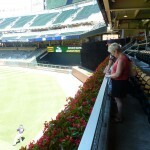 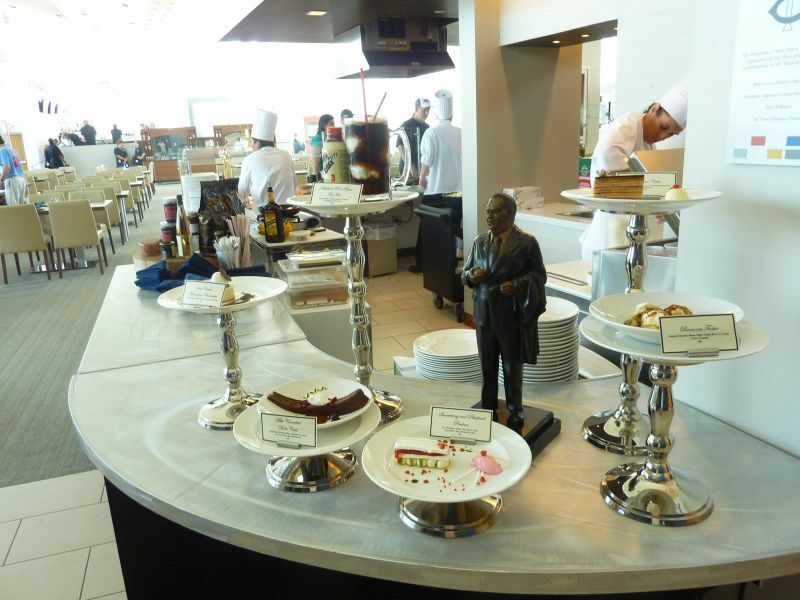 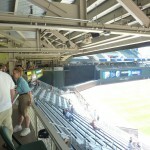 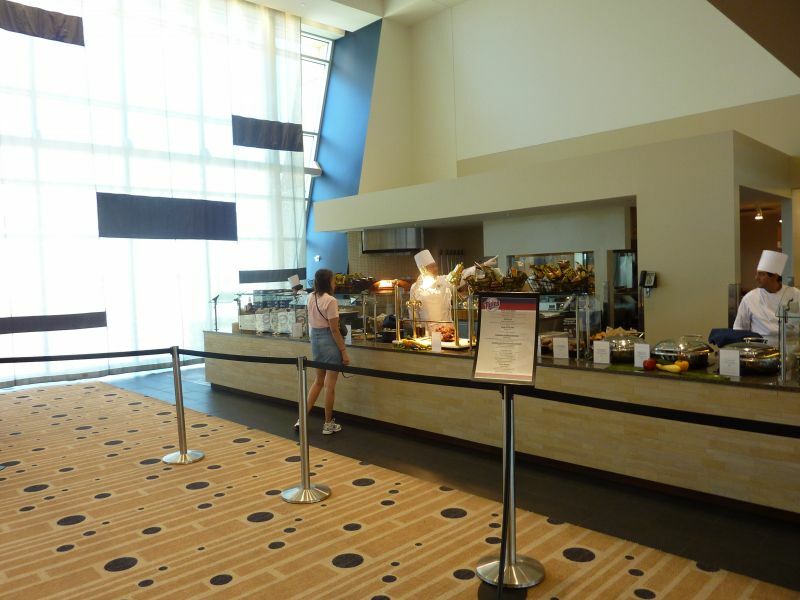 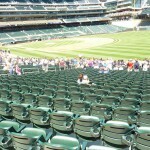 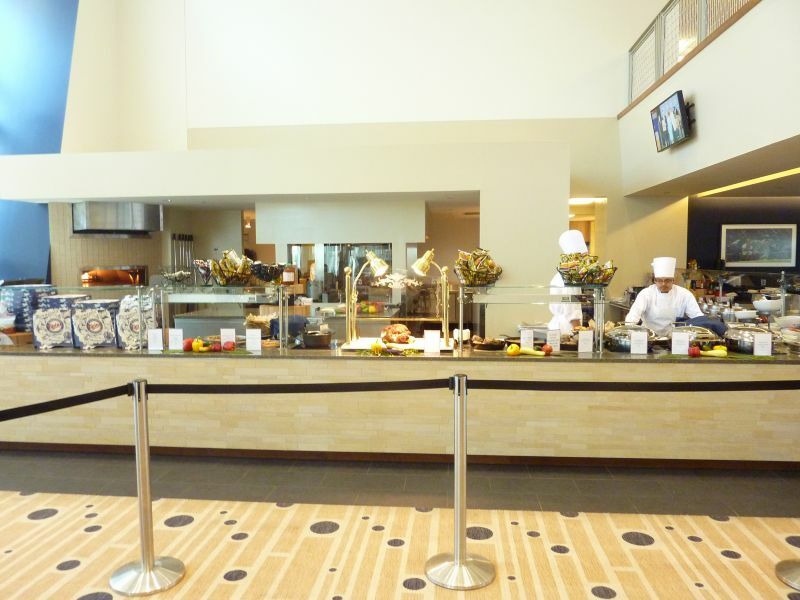 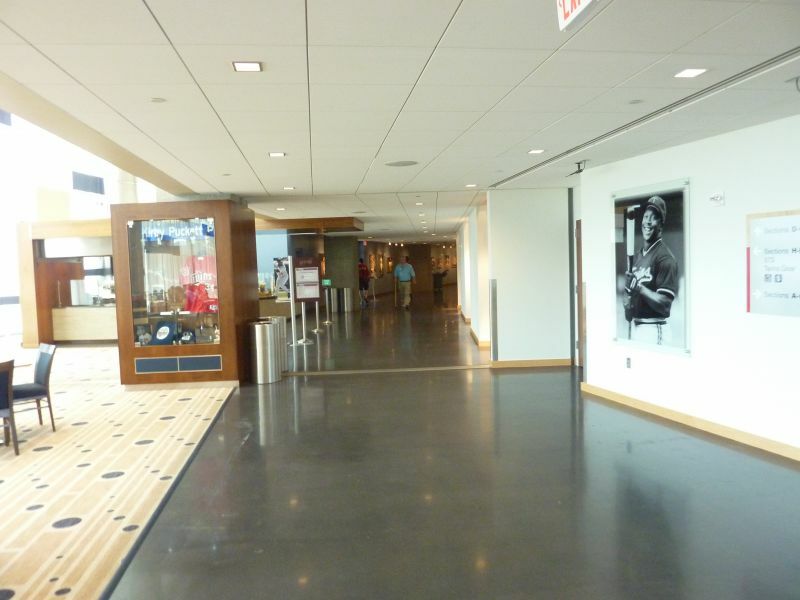 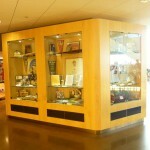 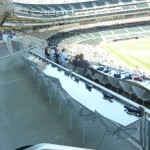 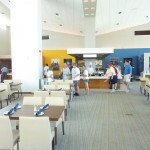 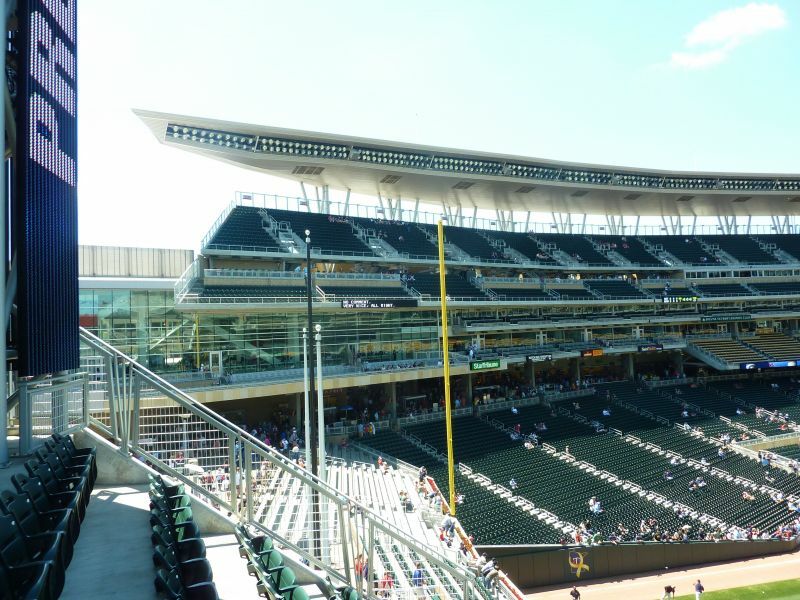 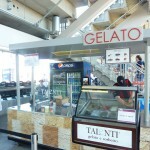 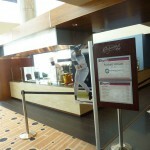 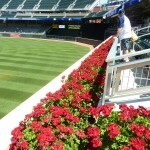 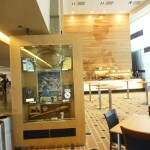 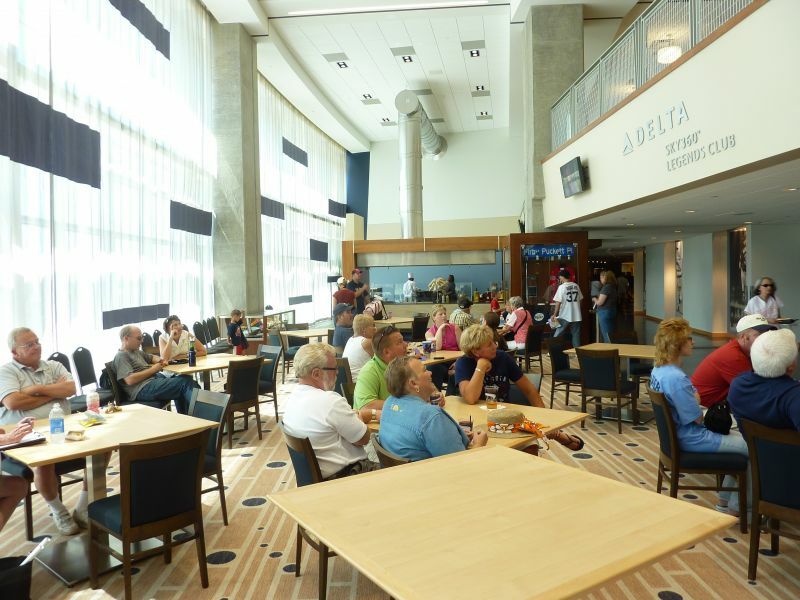 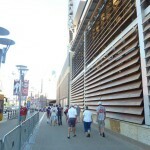 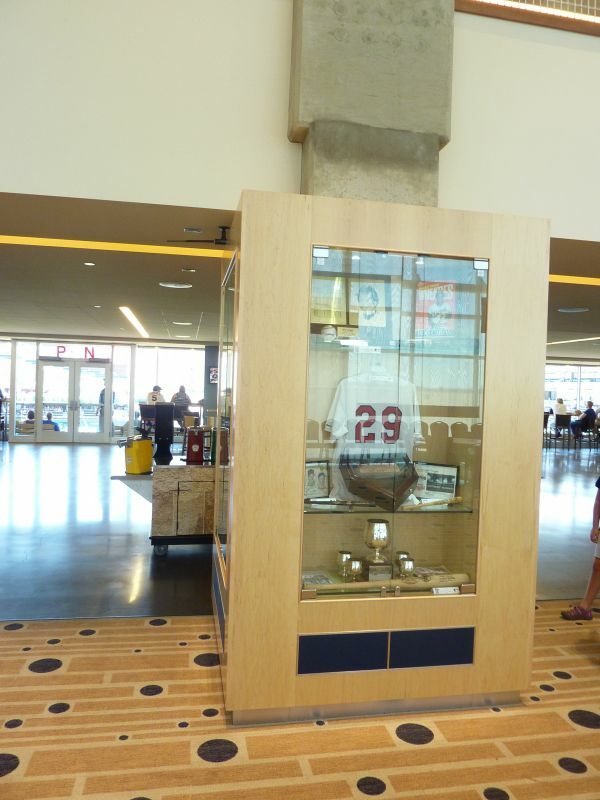 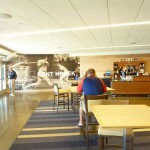 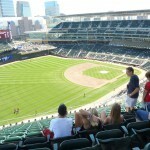 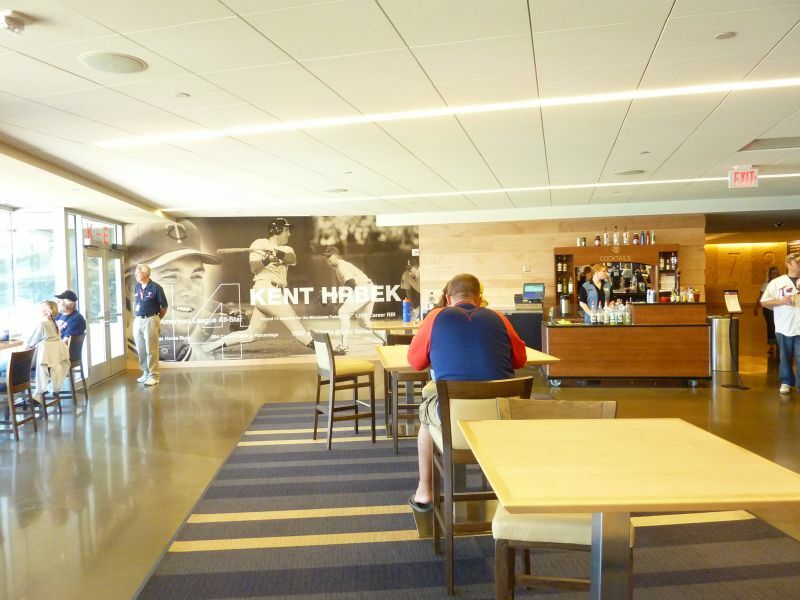 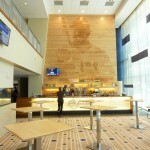 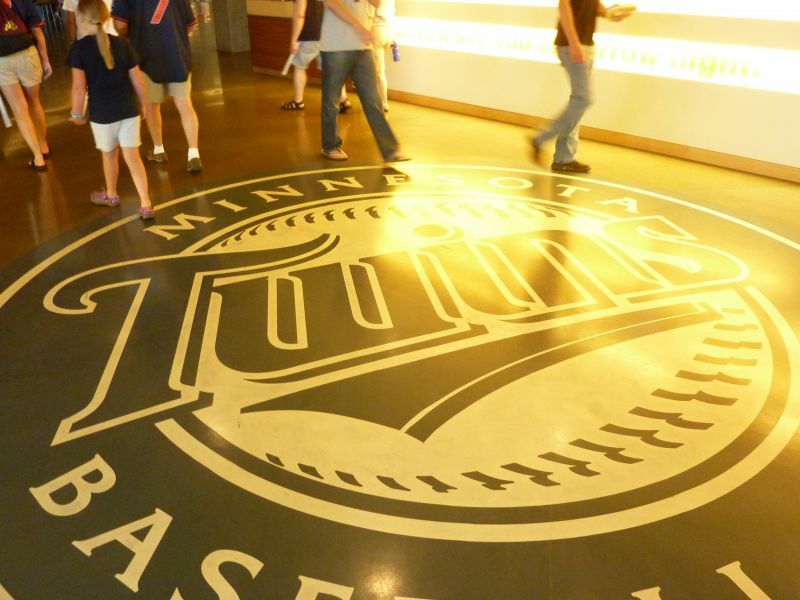 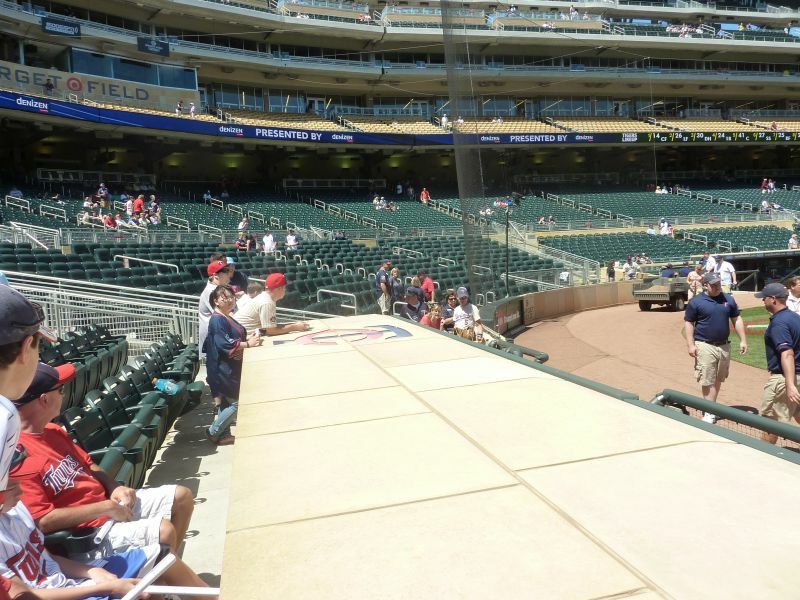 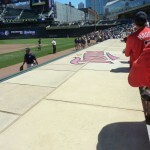 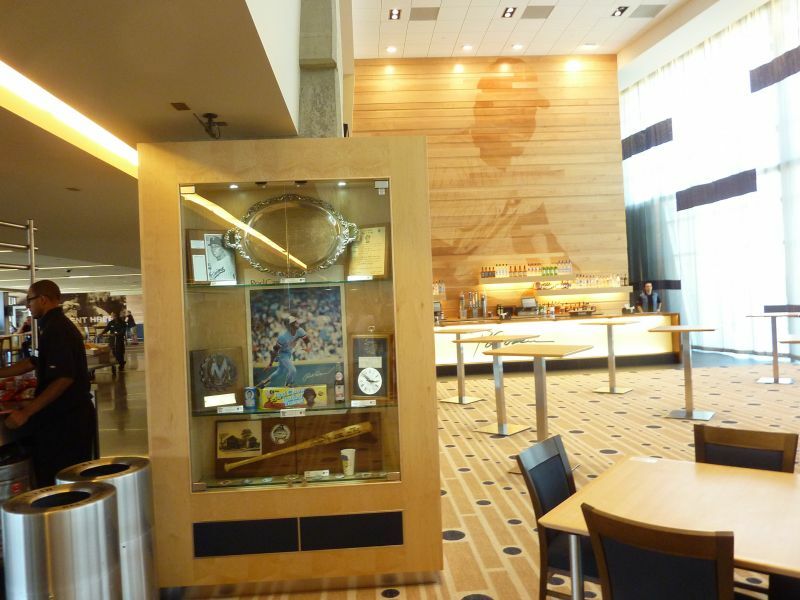 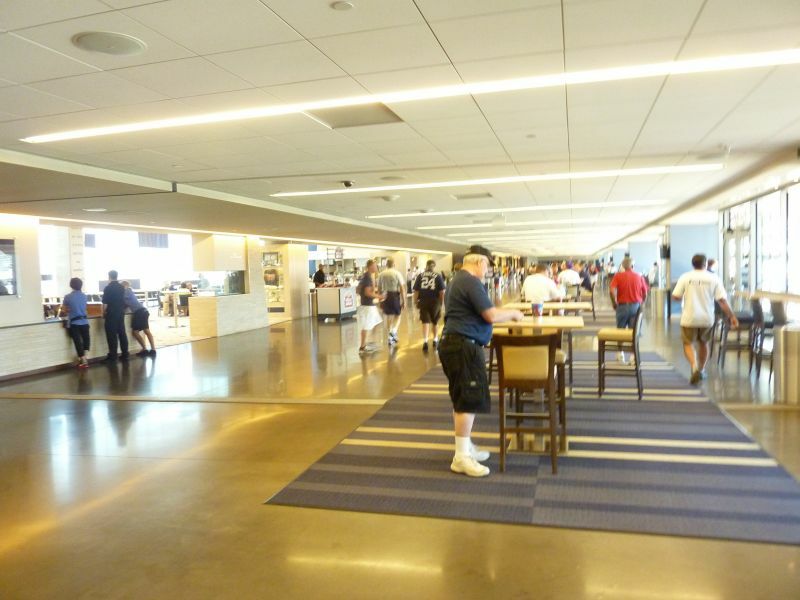 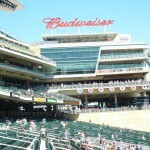 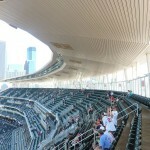 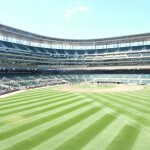 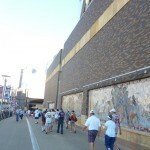 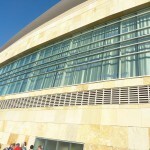 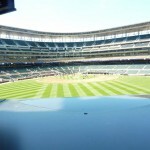 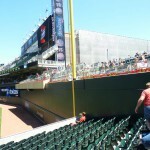 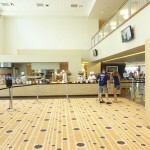 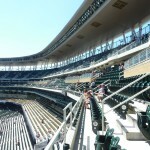 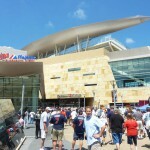 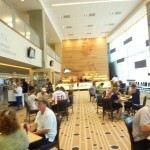 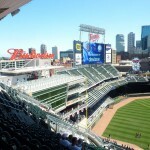 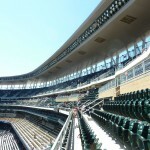 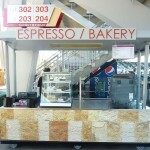 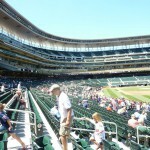 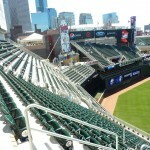 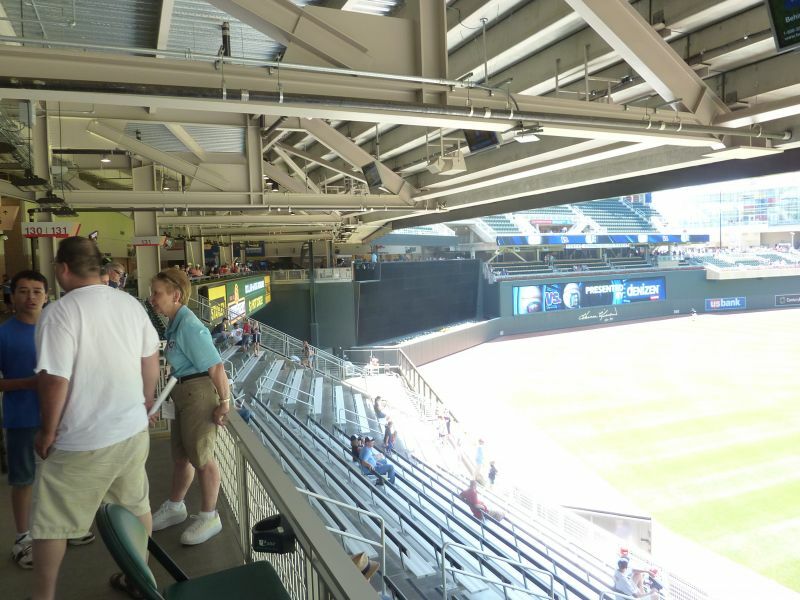 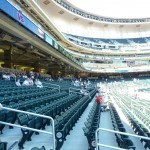 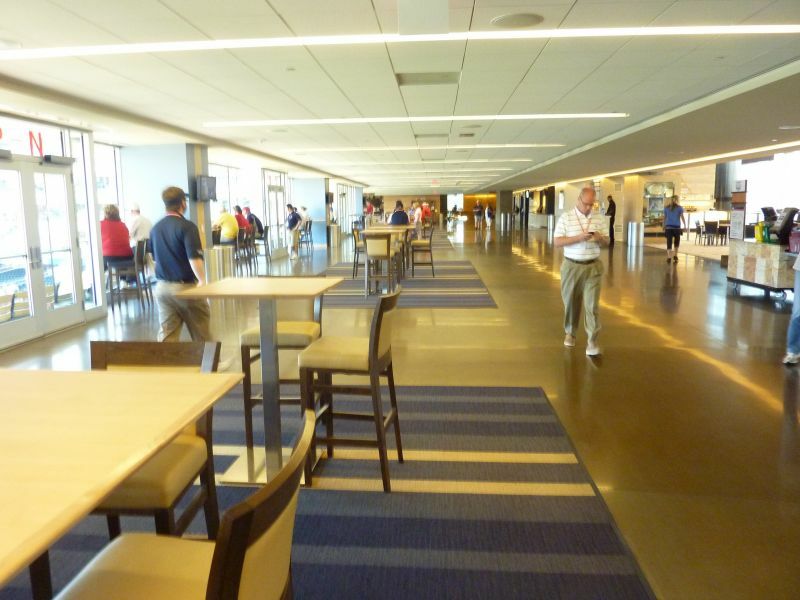 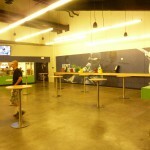 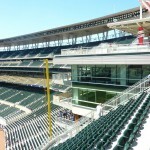 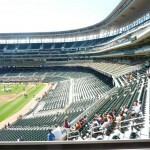 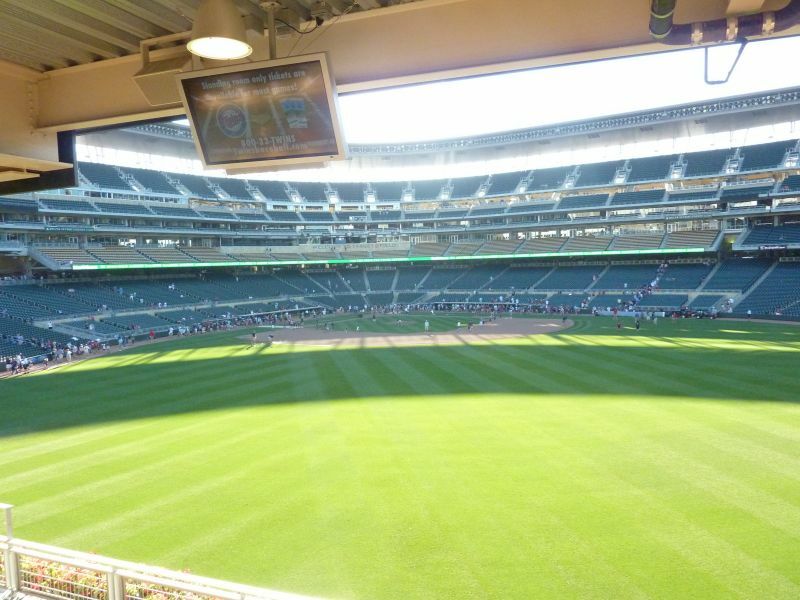 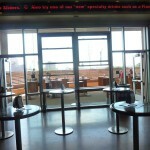 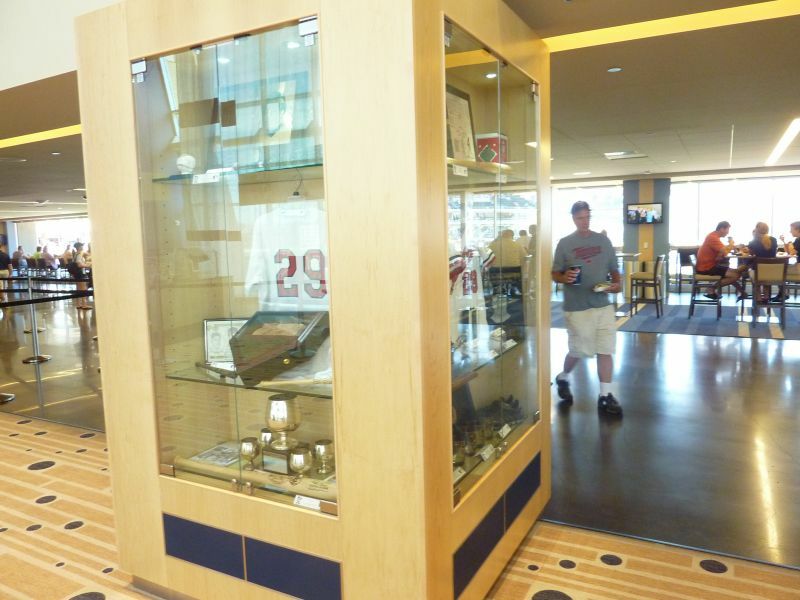 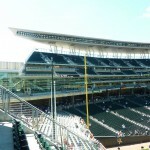 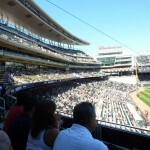 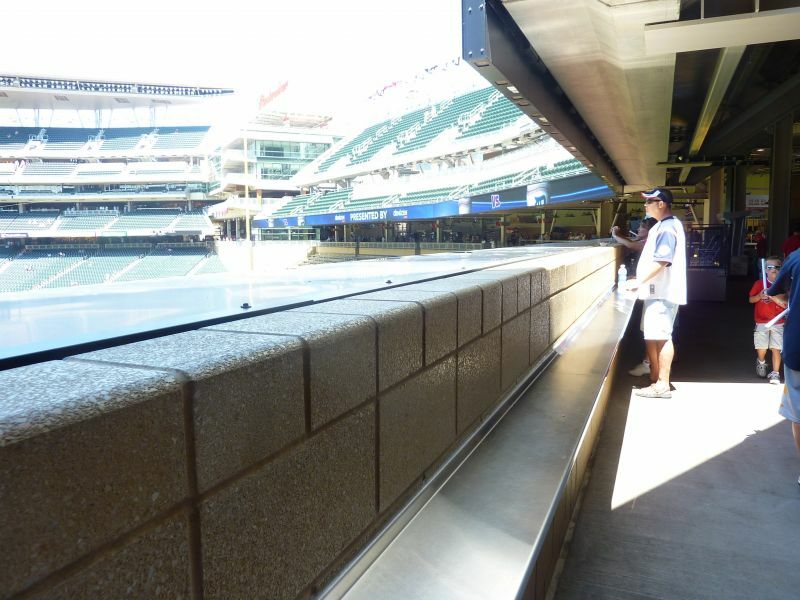 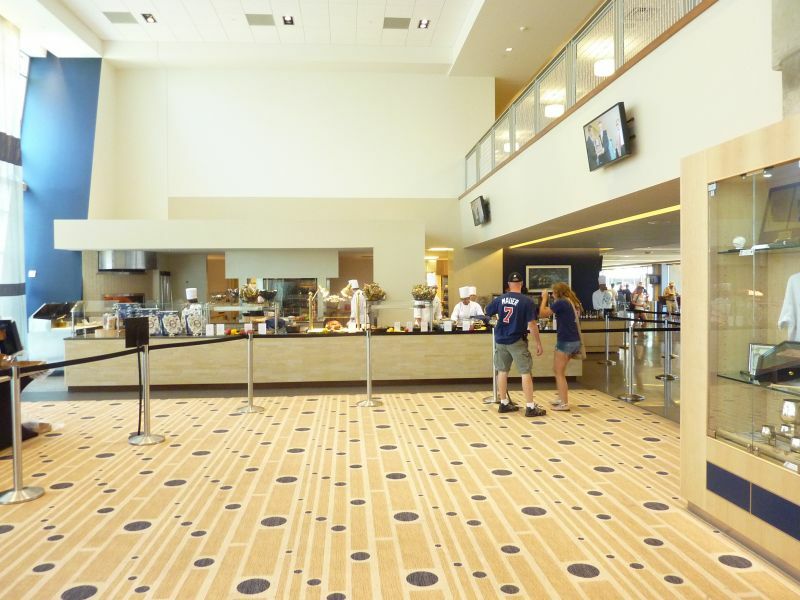 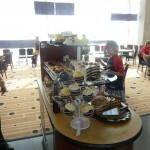 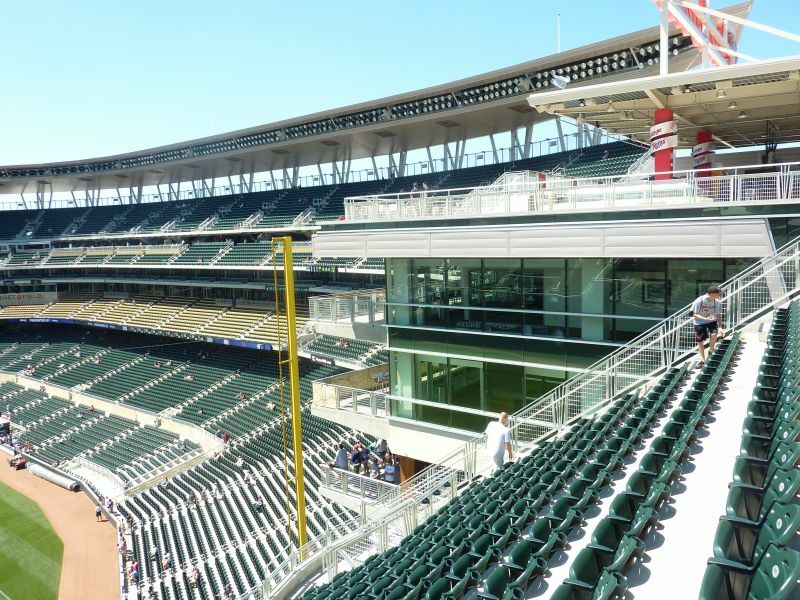 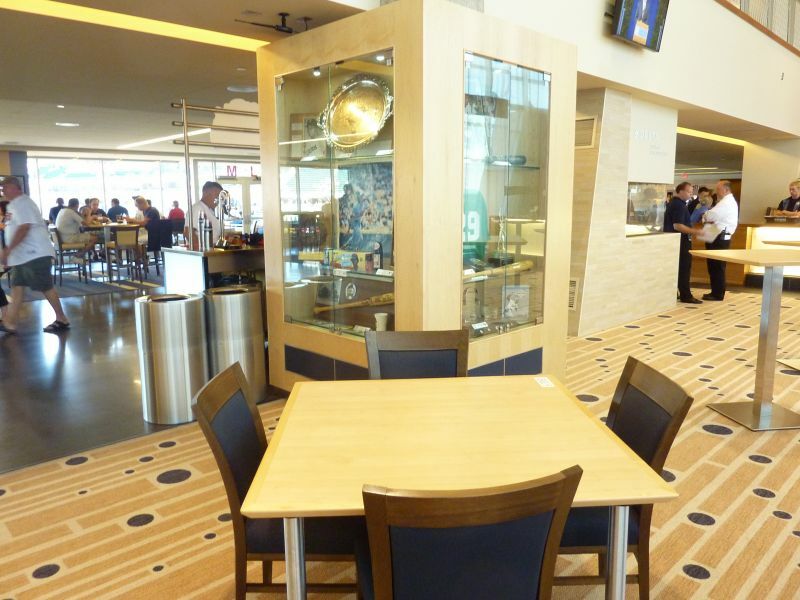 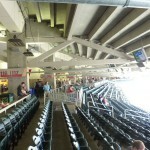 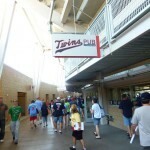 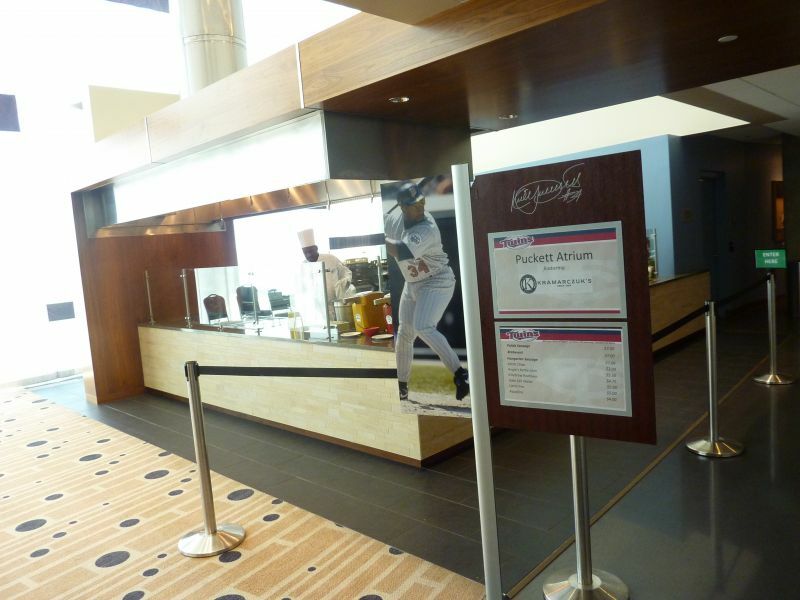 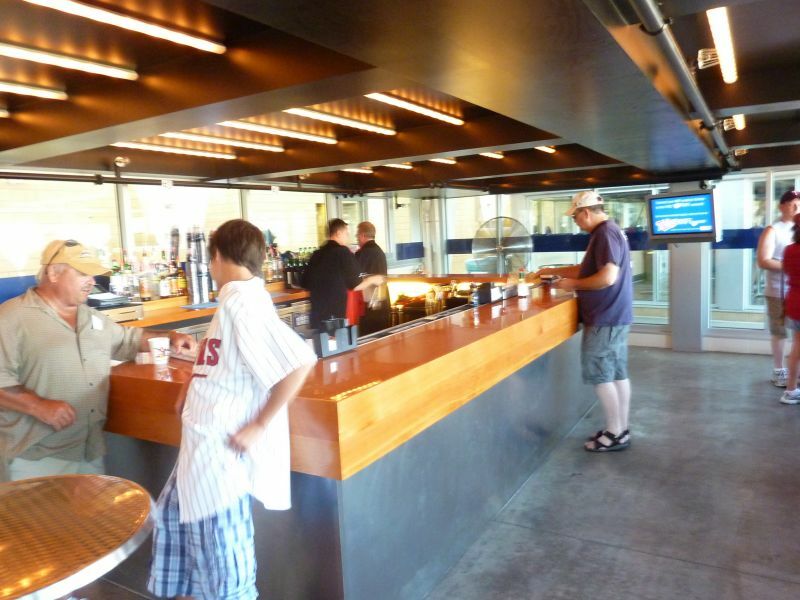 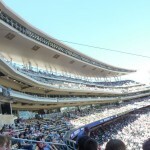 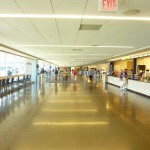 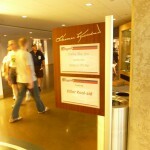 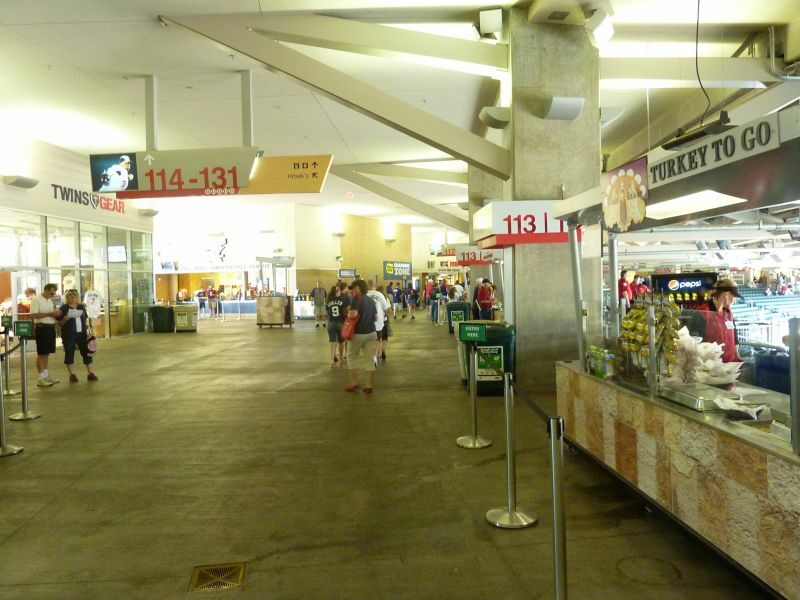 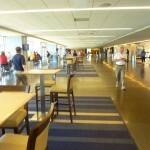 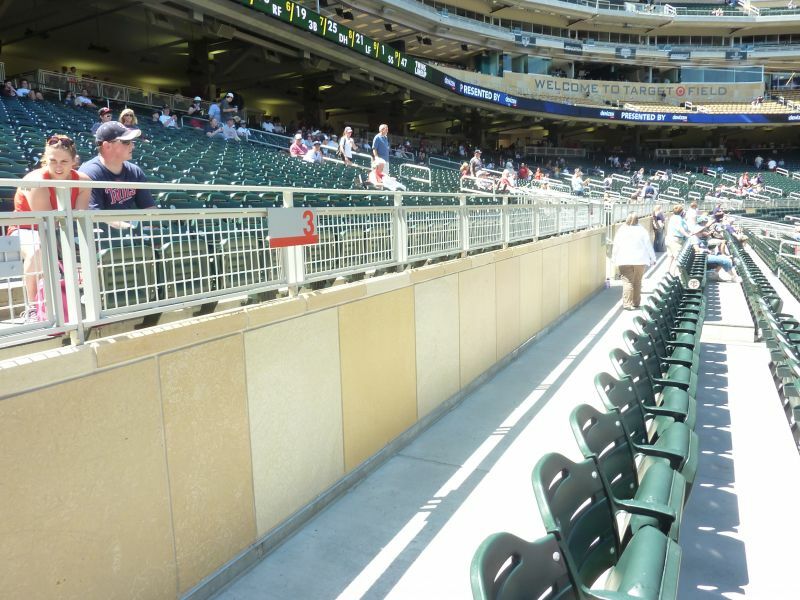 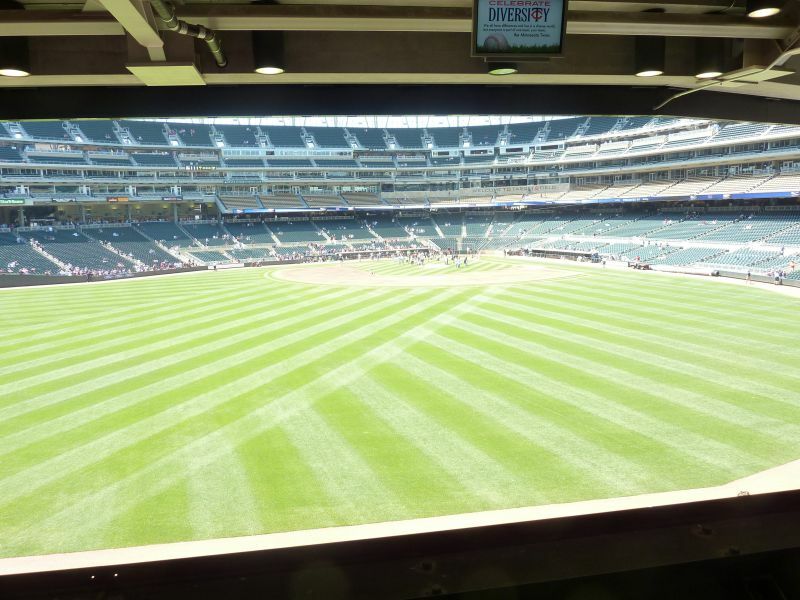 Target Field’s contextual interior lines and simple design recall the ballparks of the first retro era. 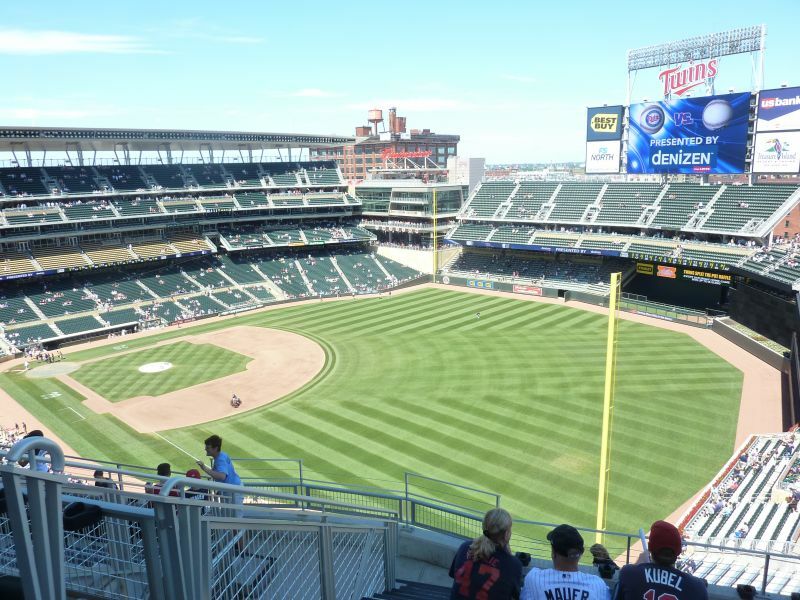 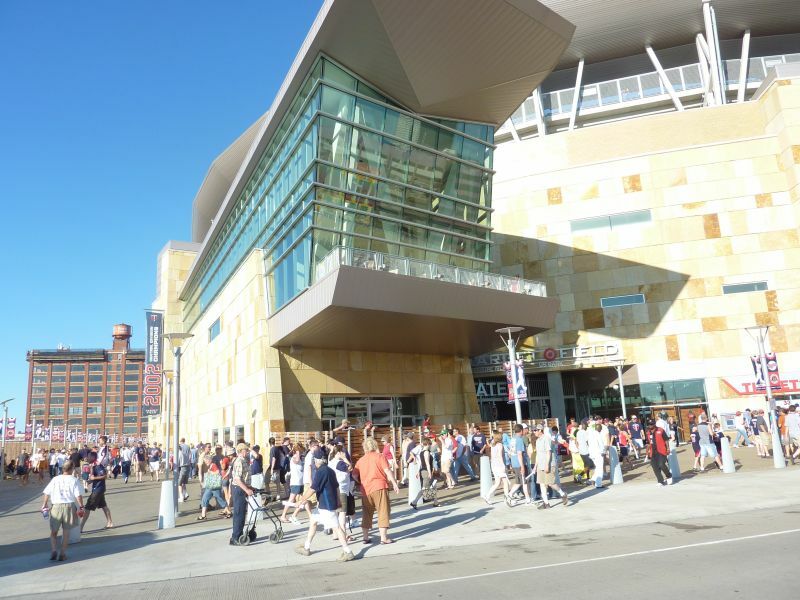 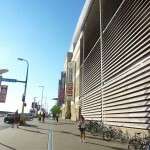 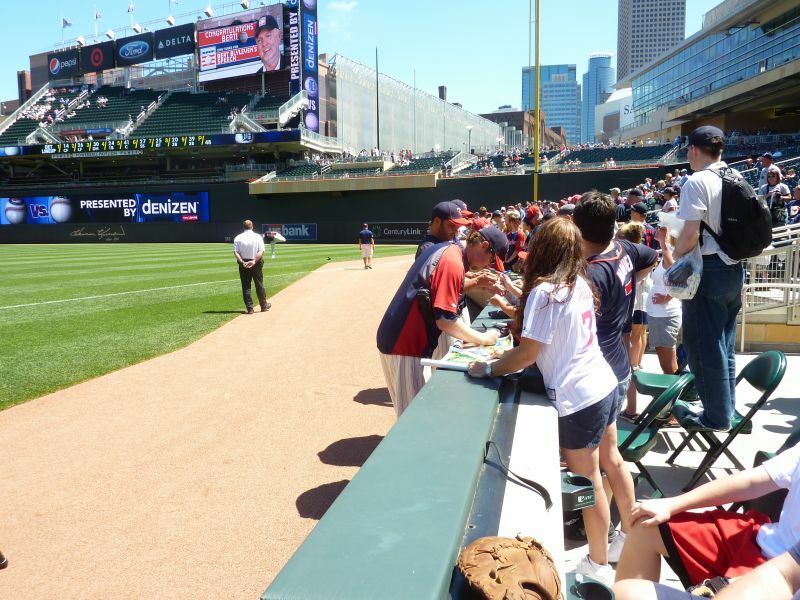 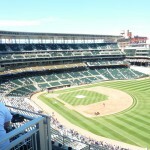 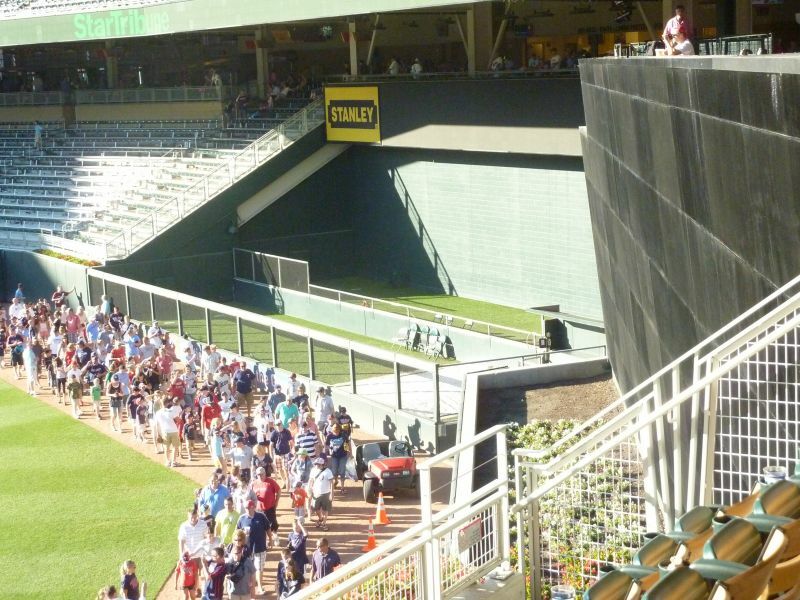 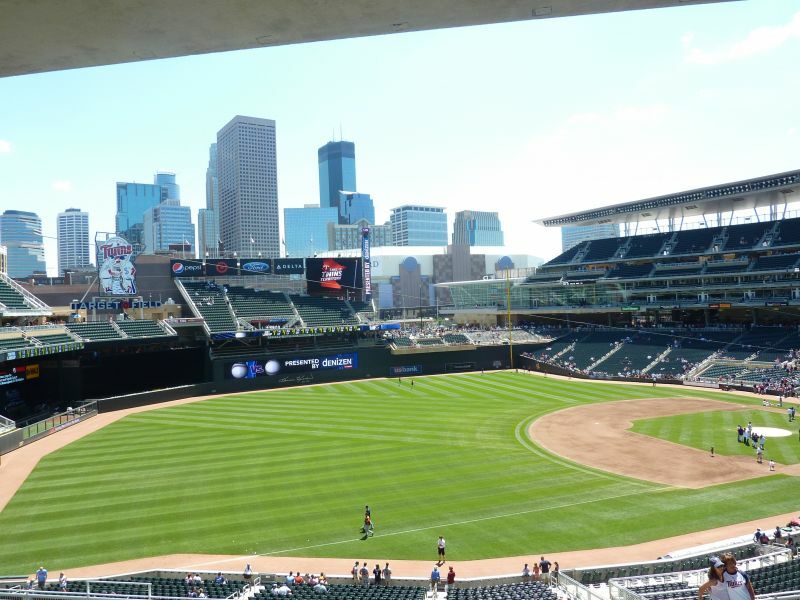 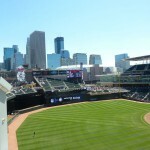 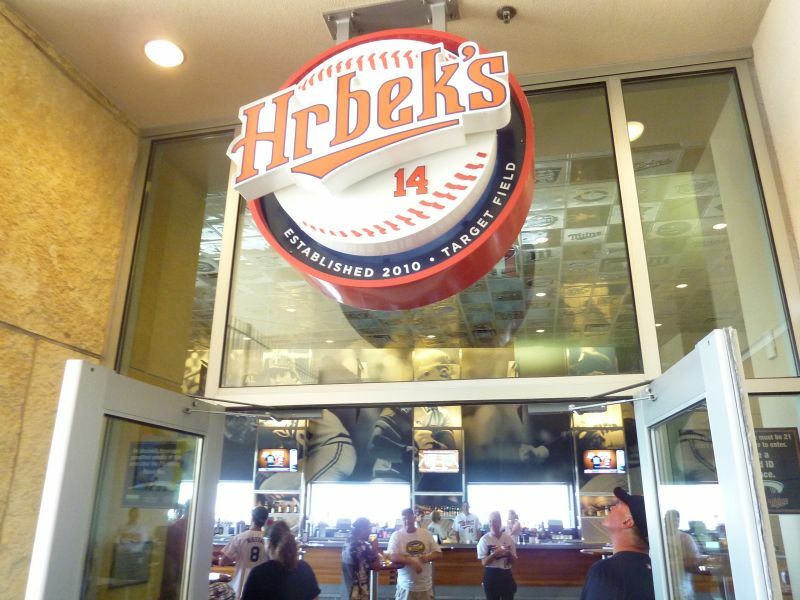 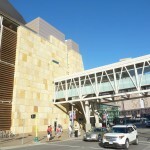 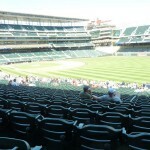 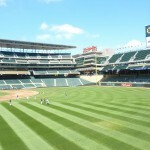 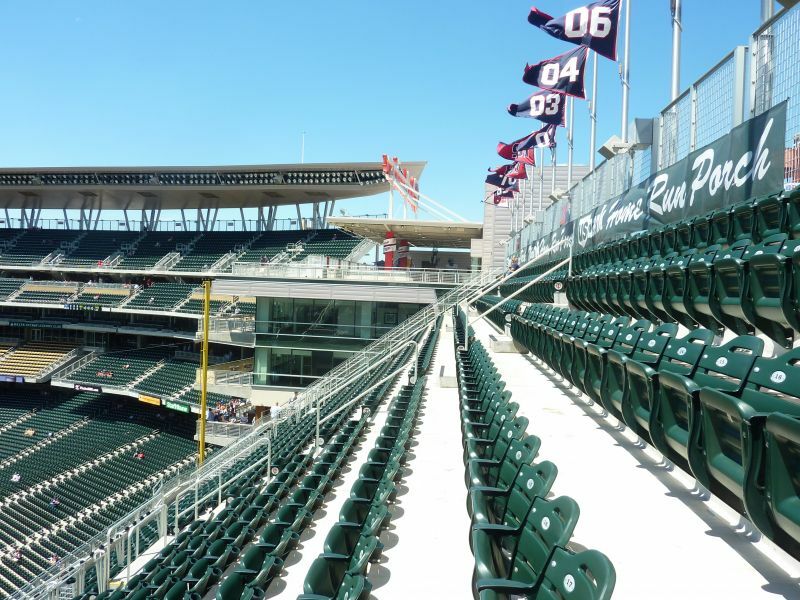 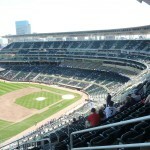 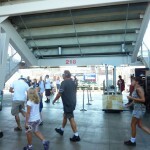 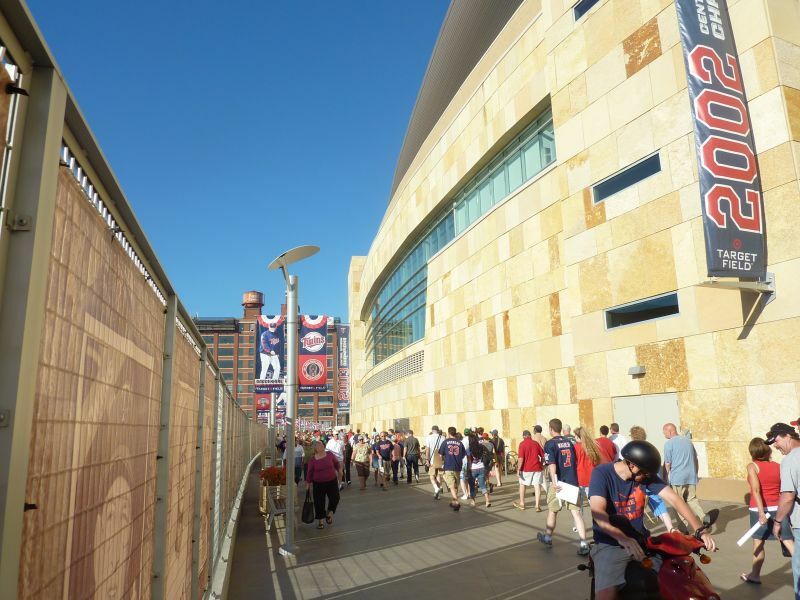 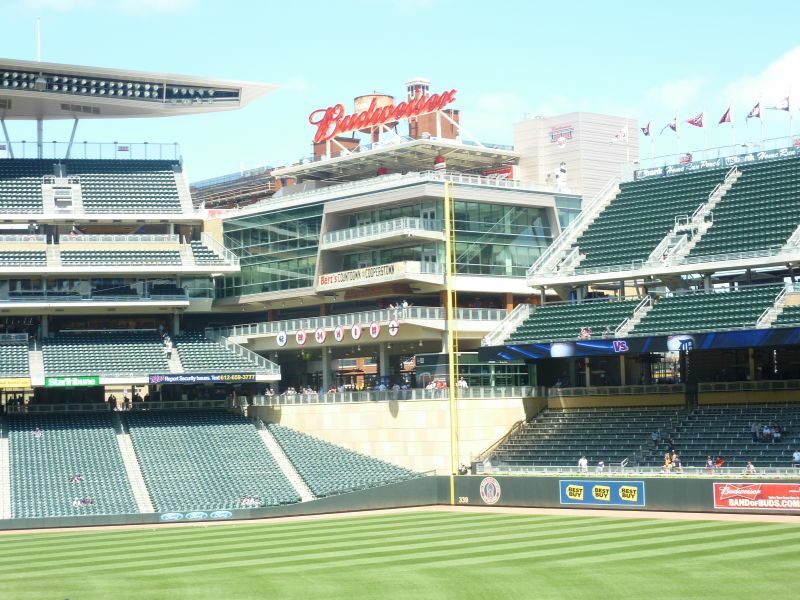 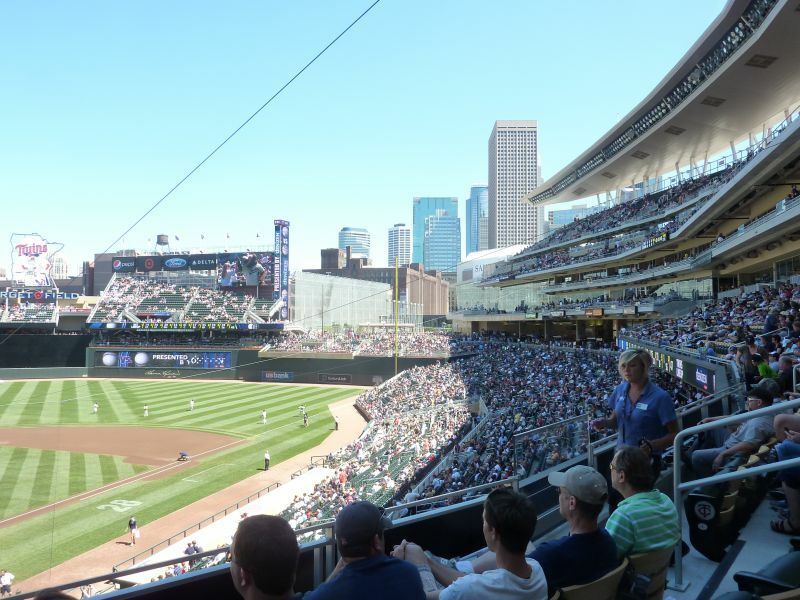 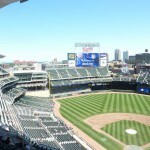 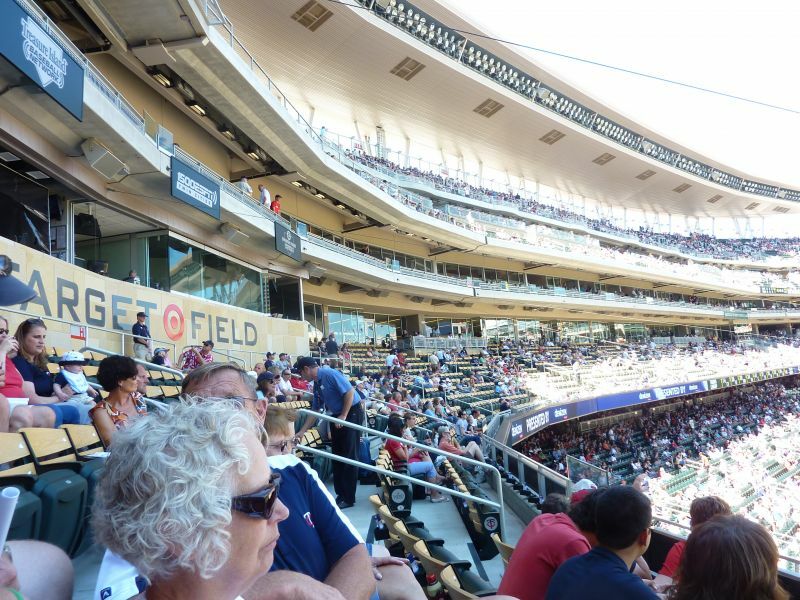 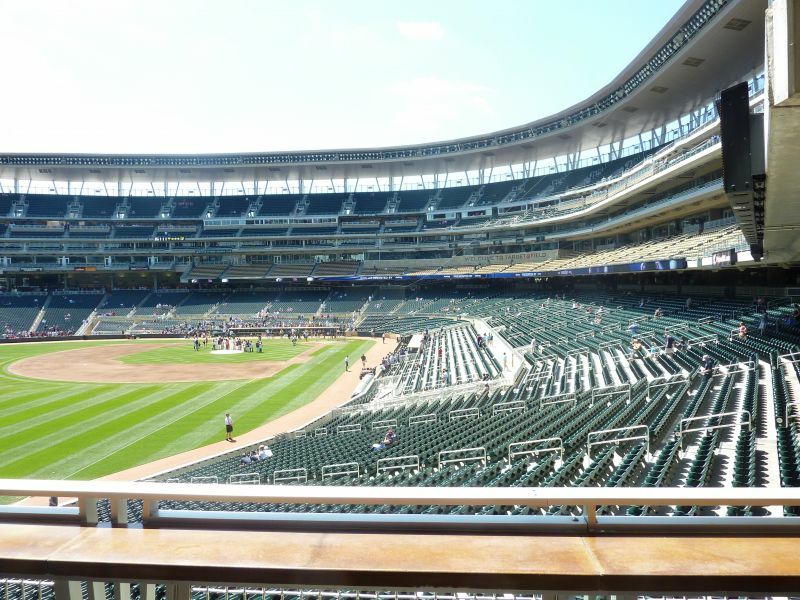 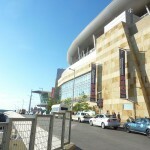 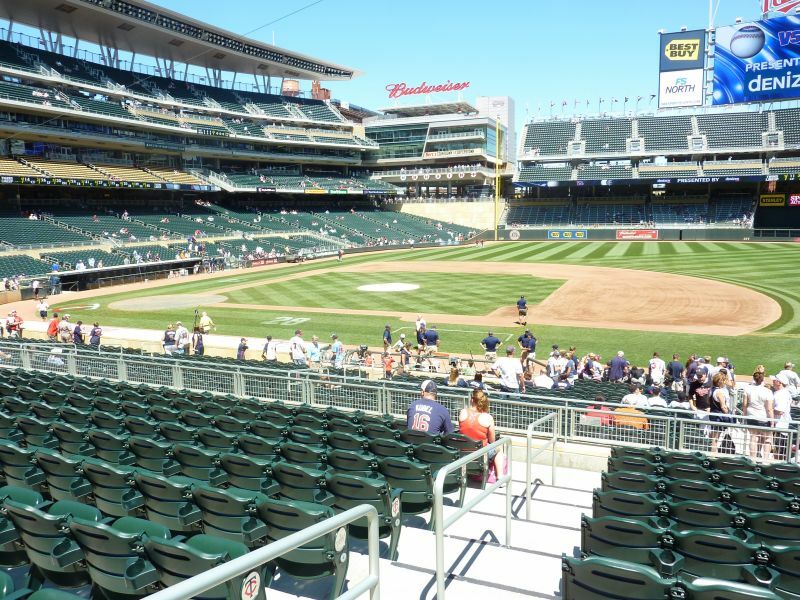 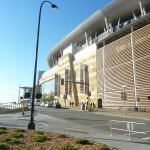 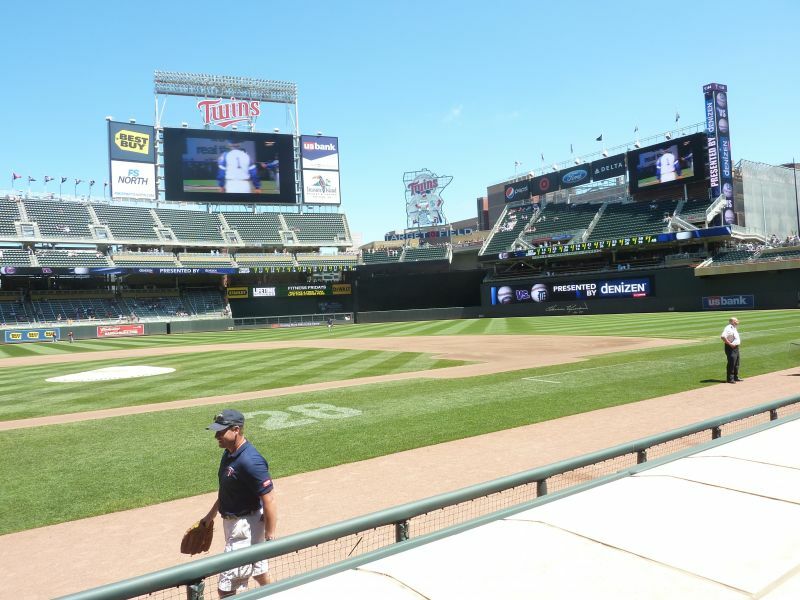 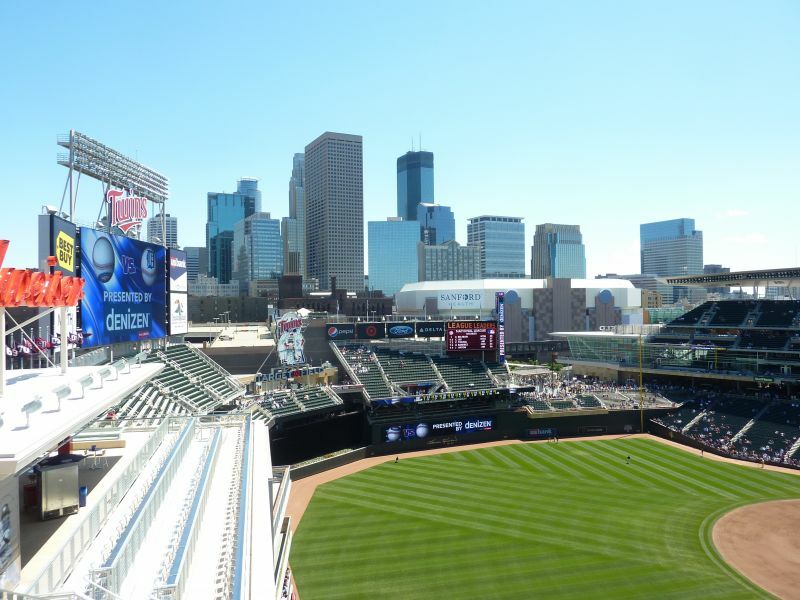 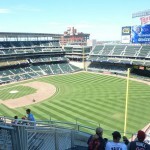 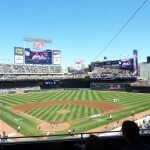 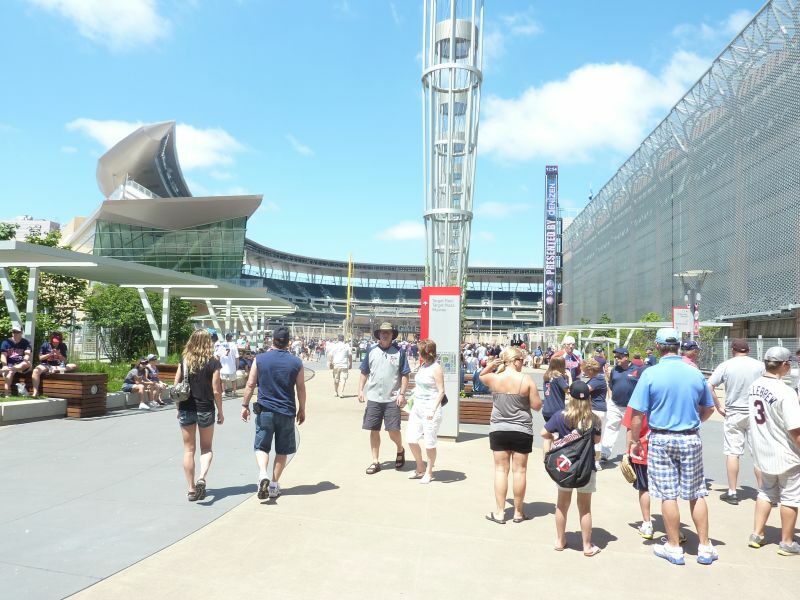 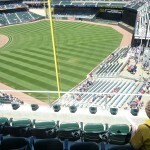 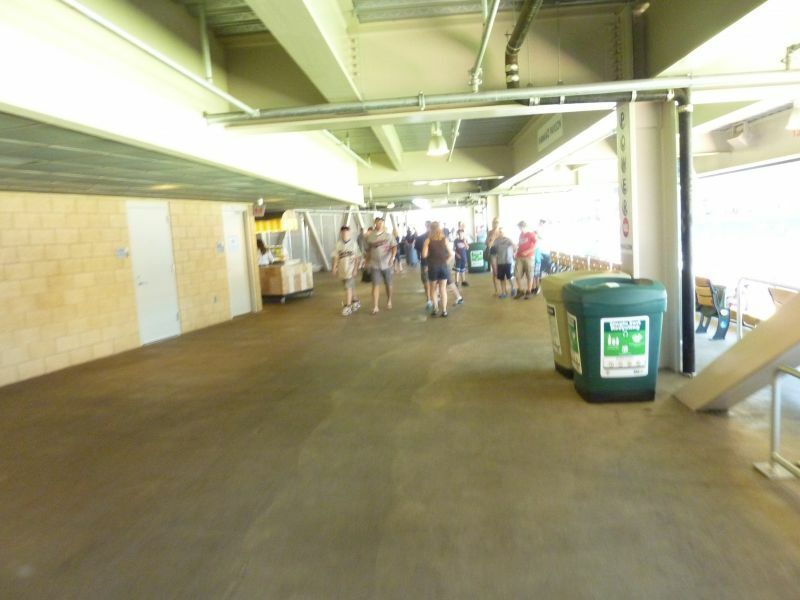 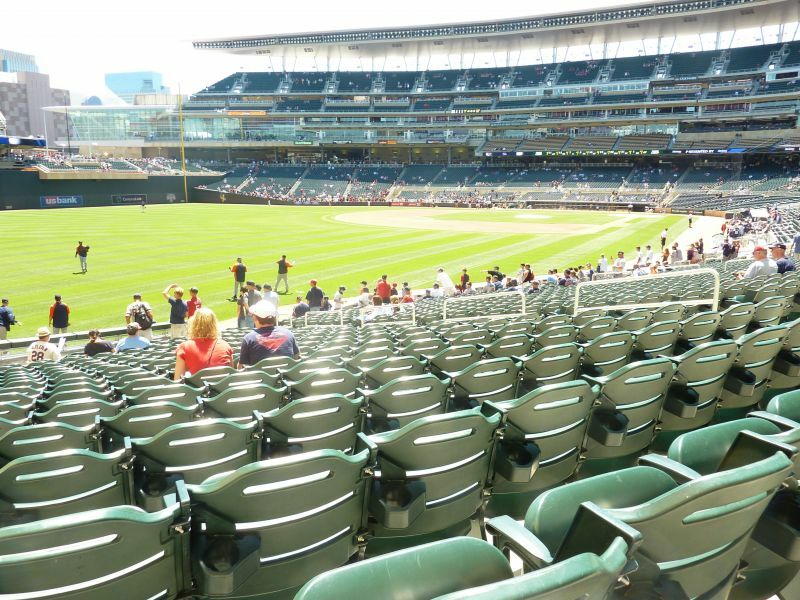 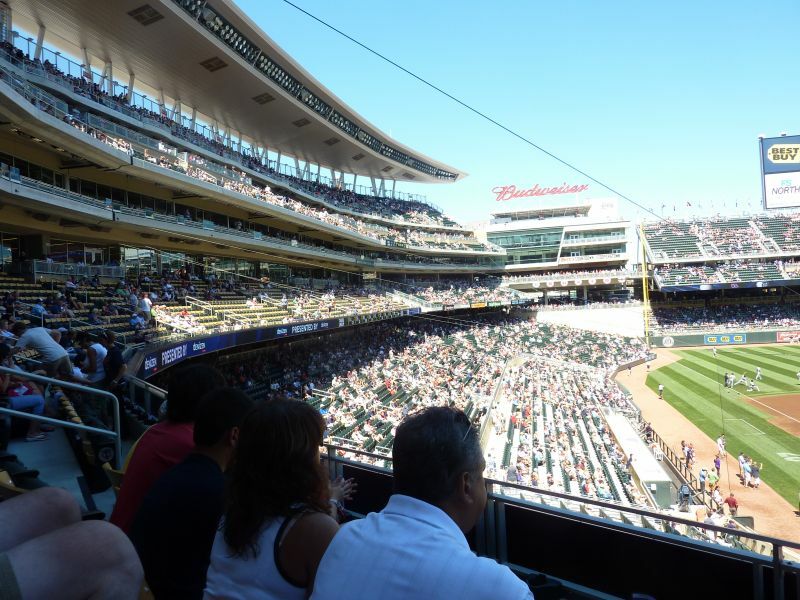 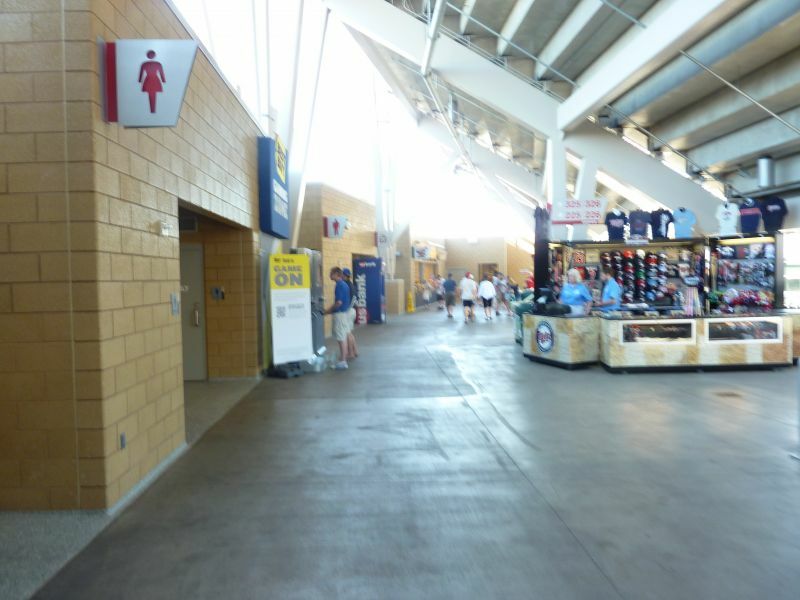 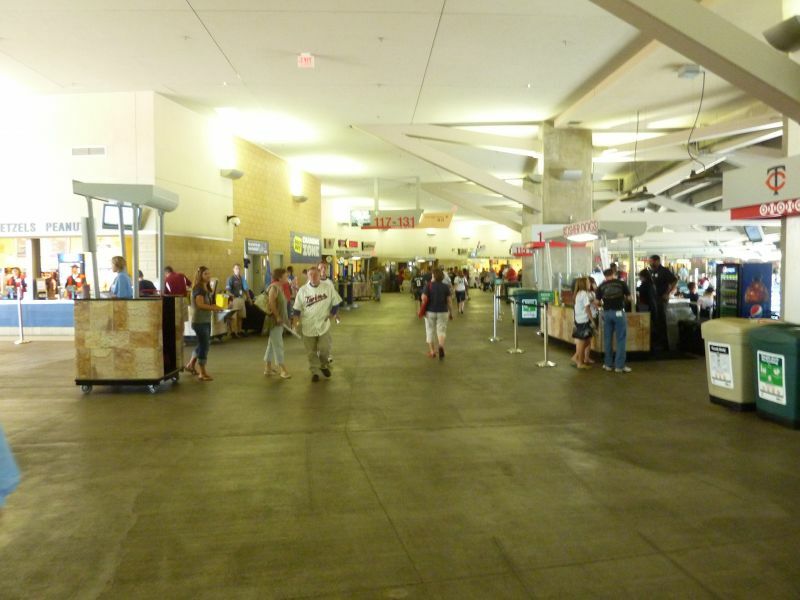 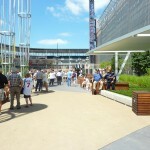 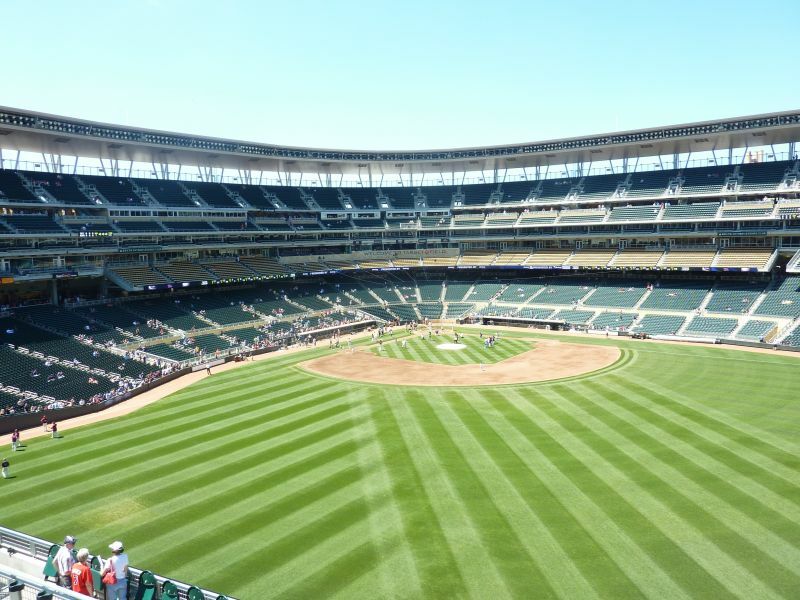 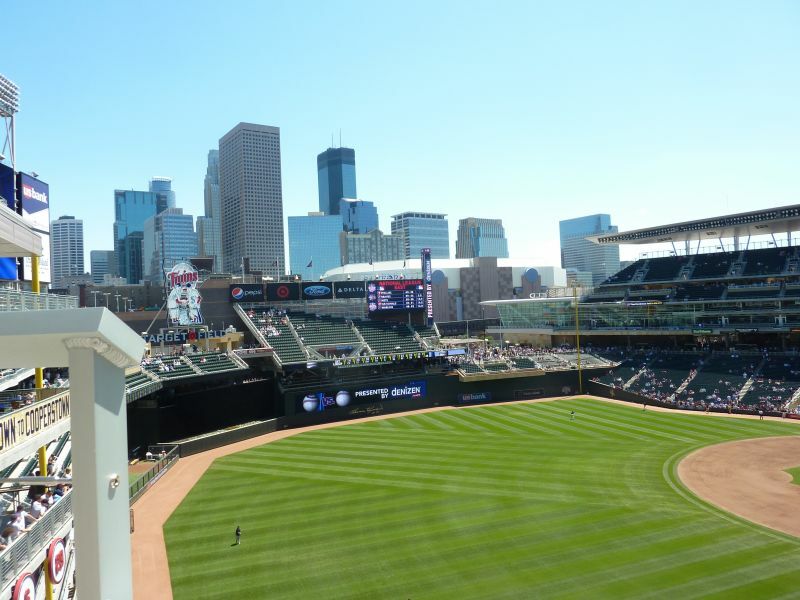 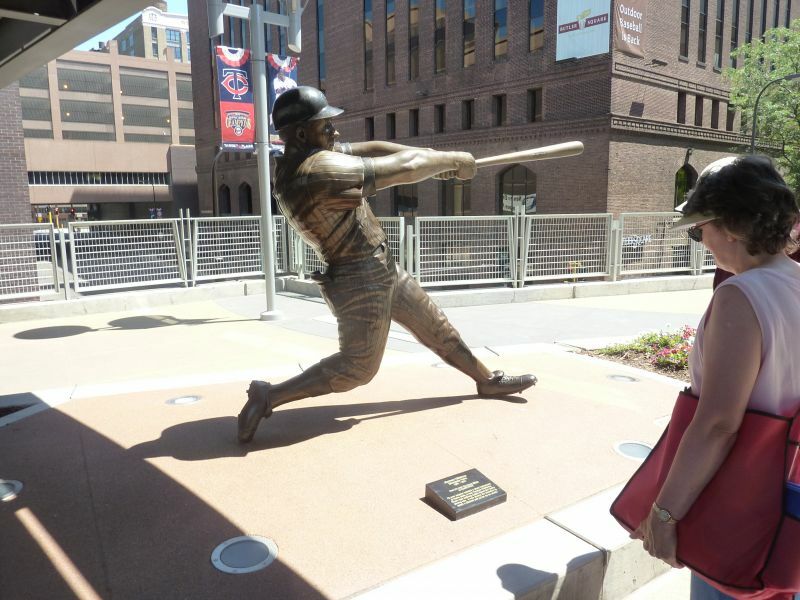 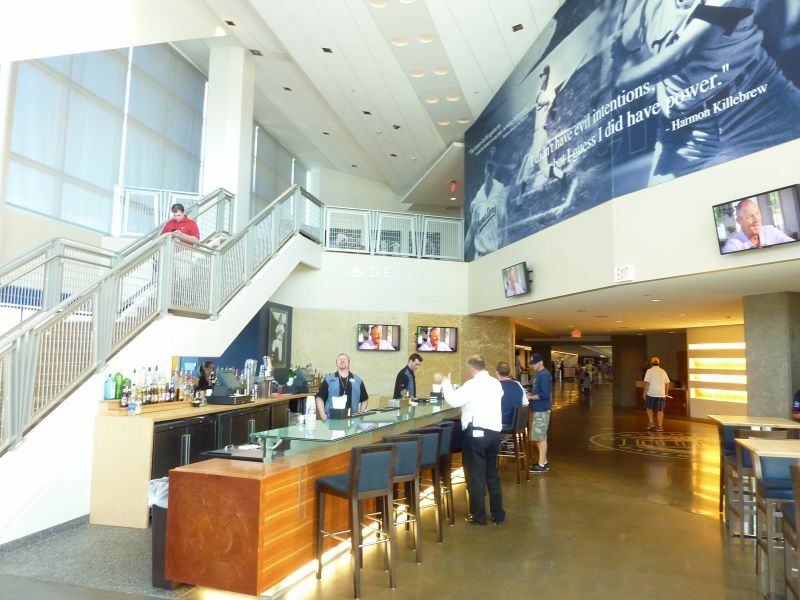 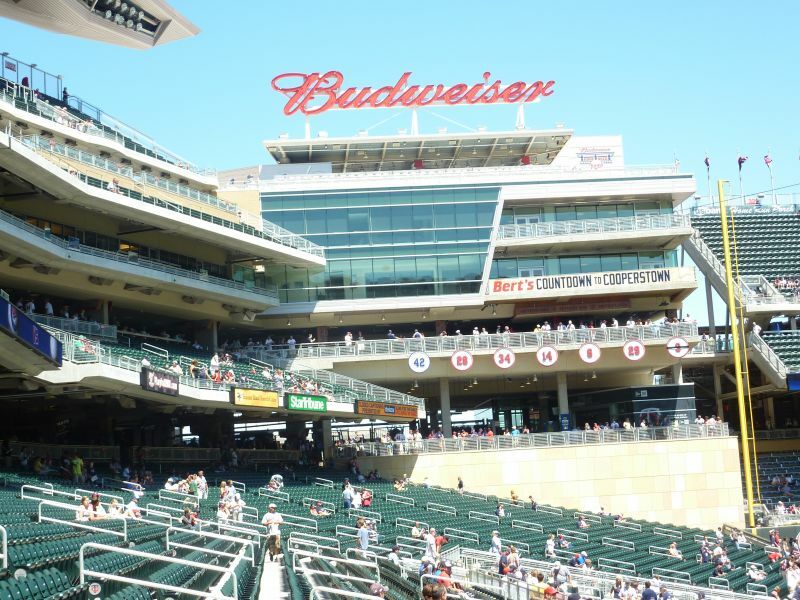 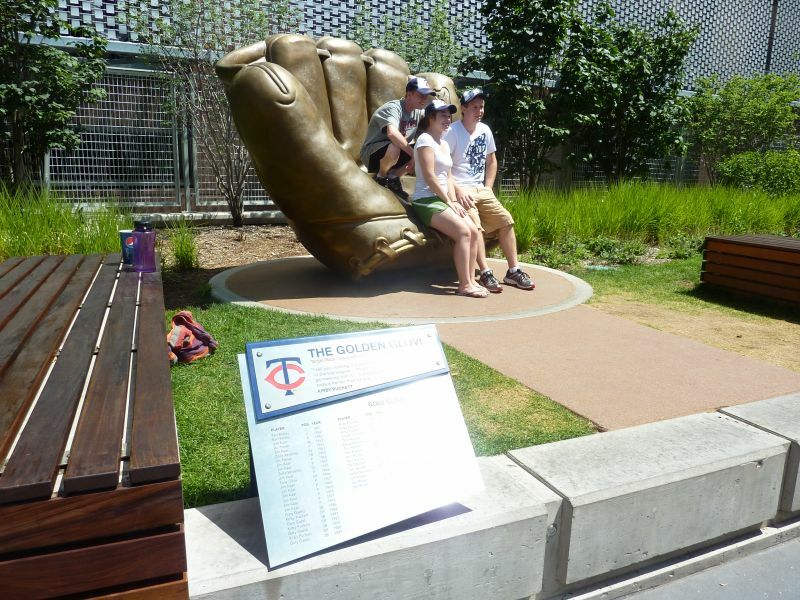 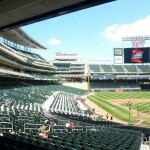 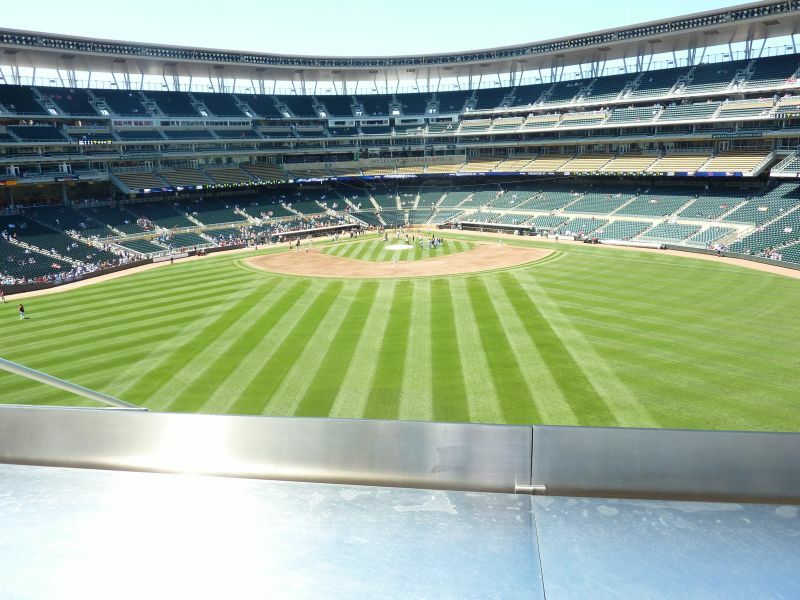 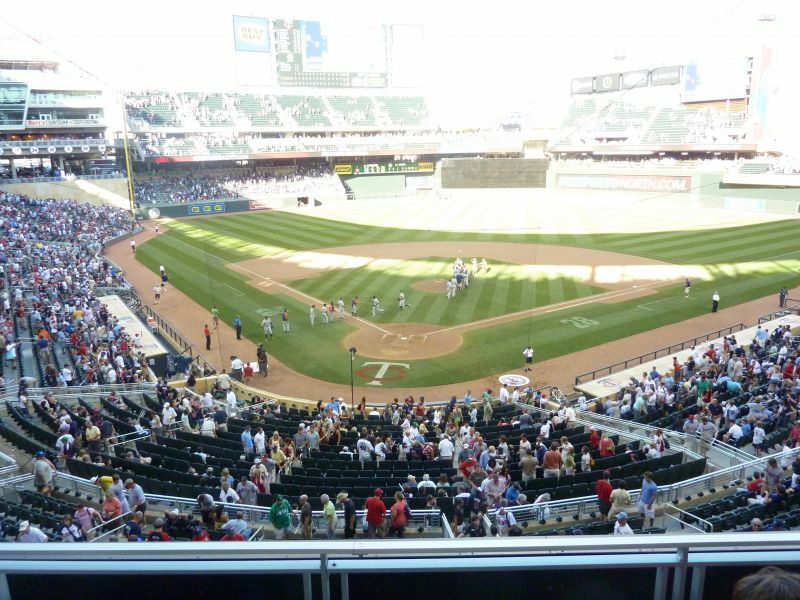 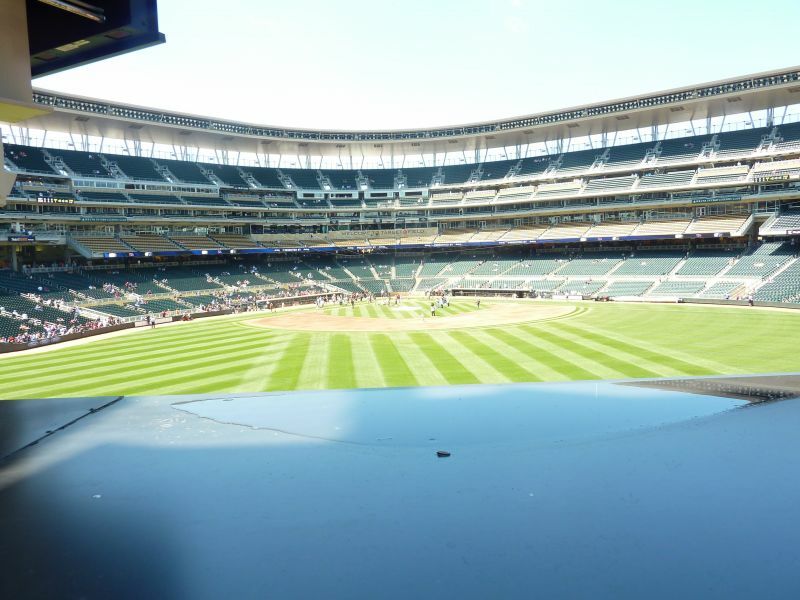 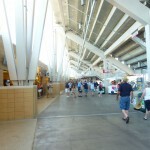 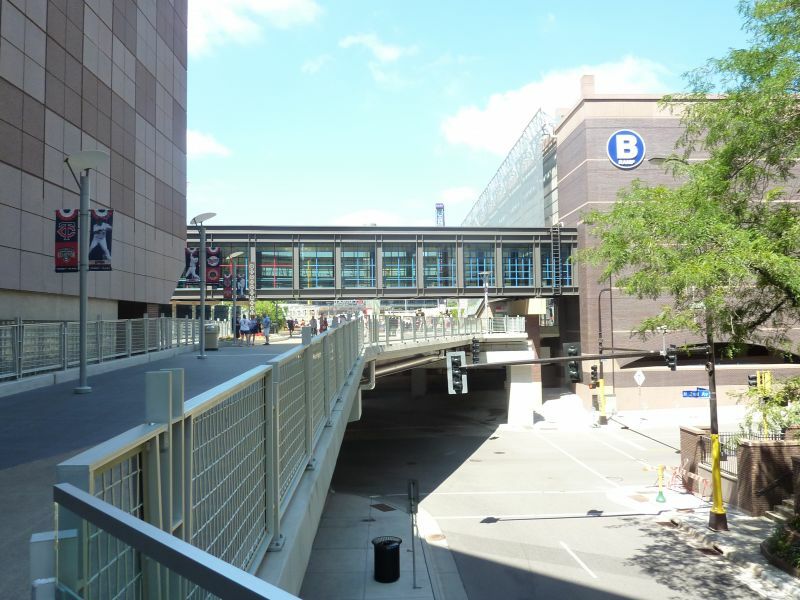 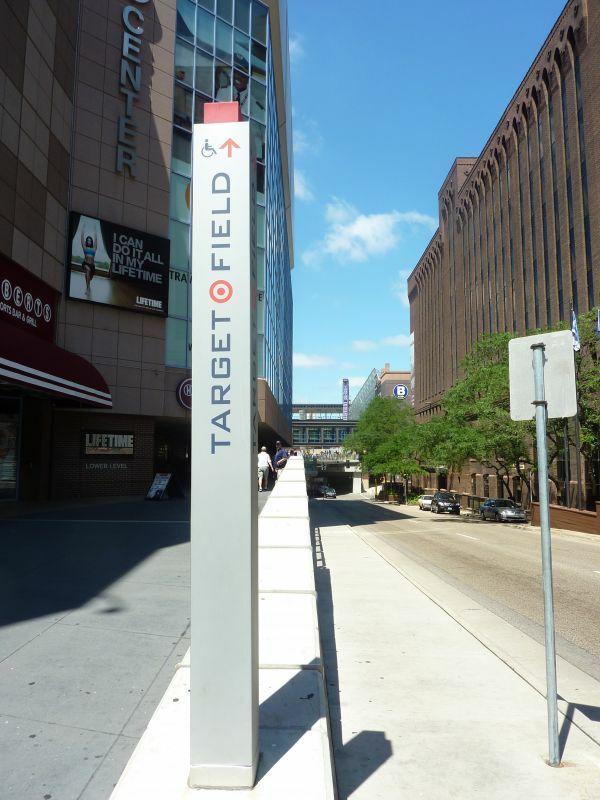 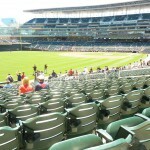 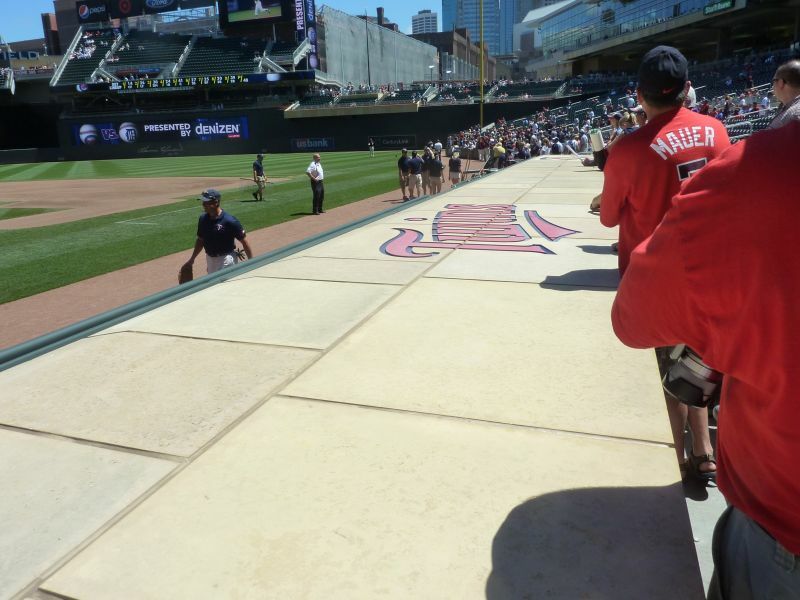 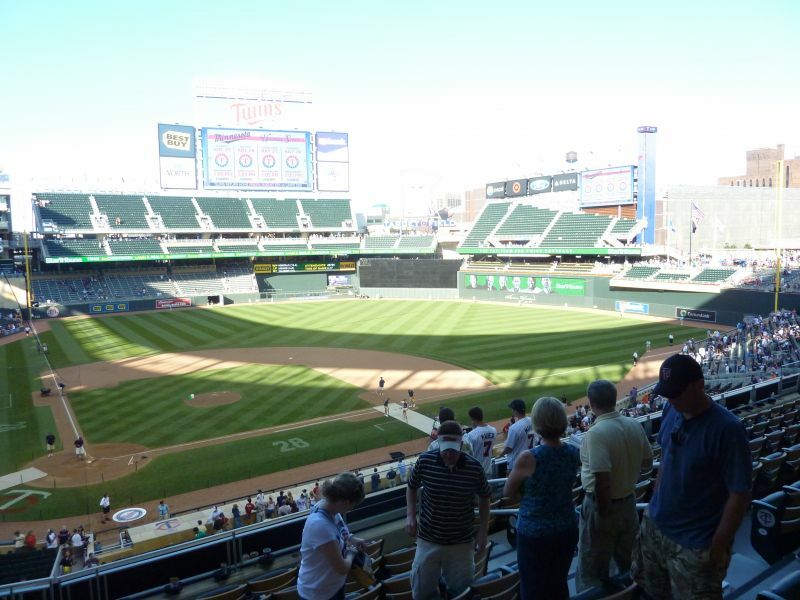 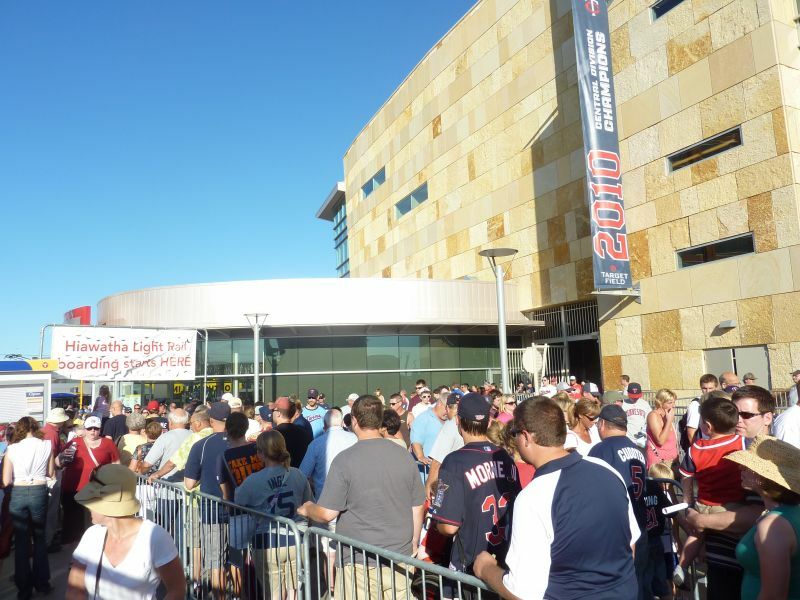 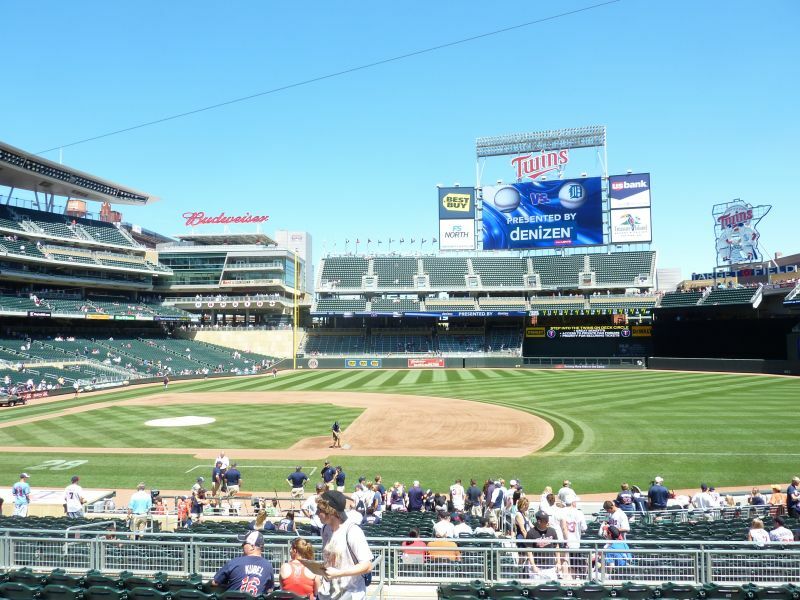 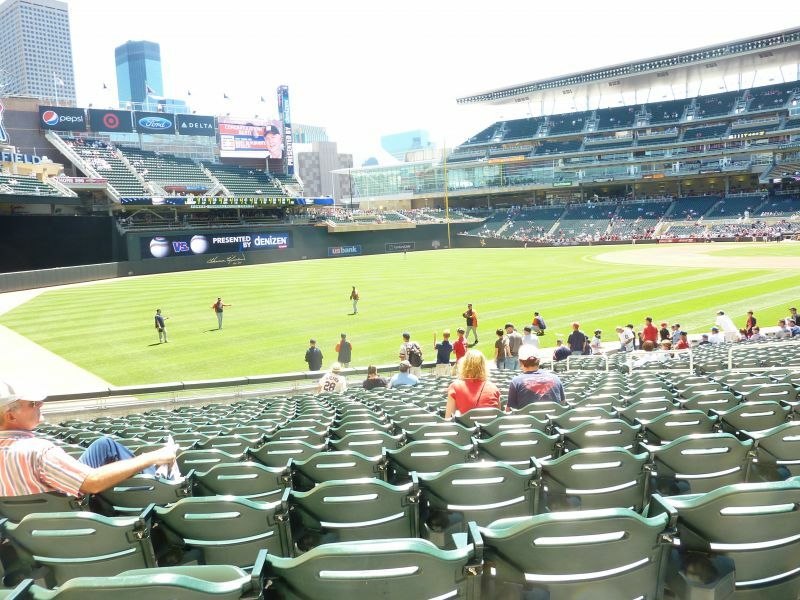 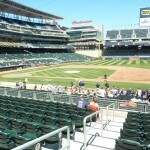 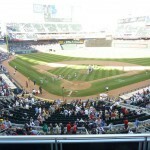 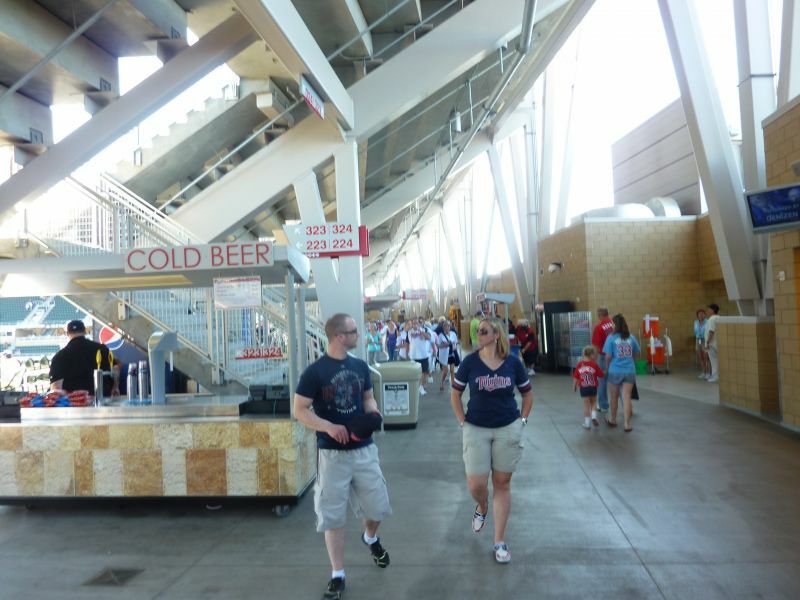 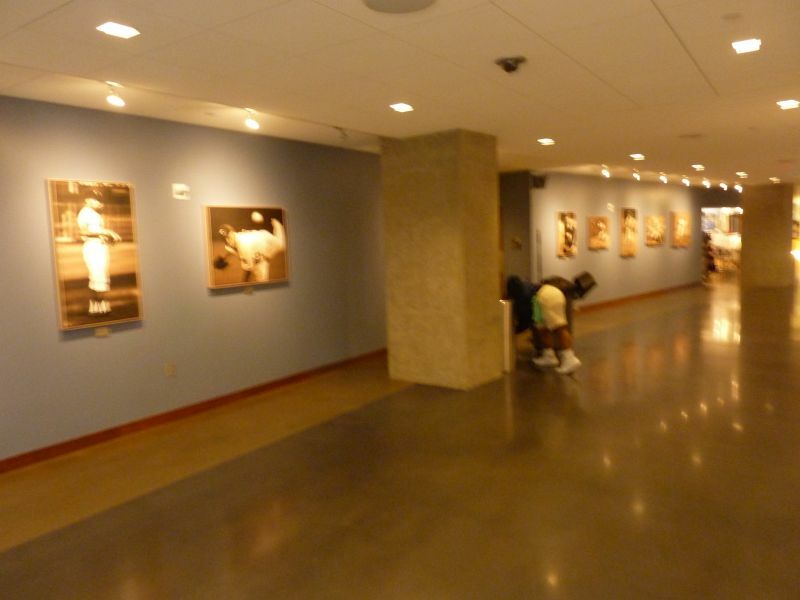 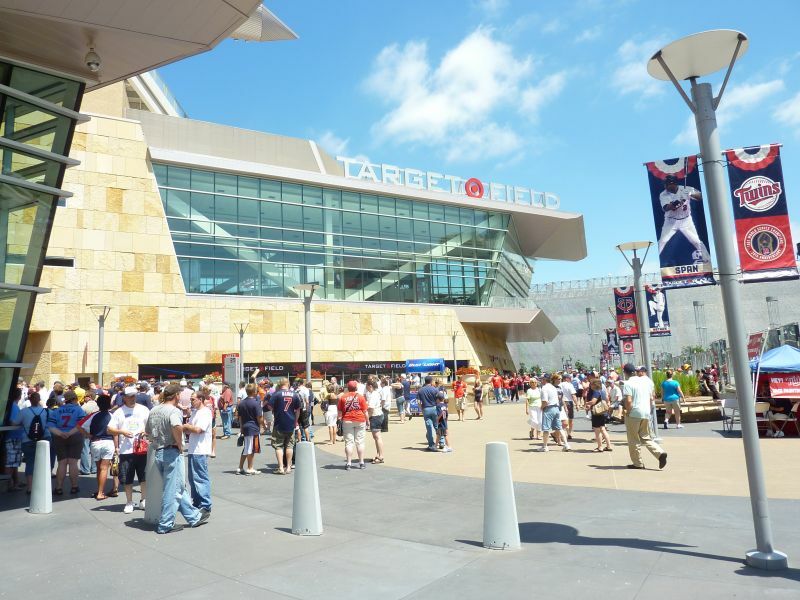 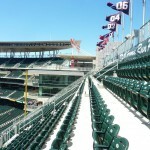 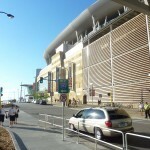 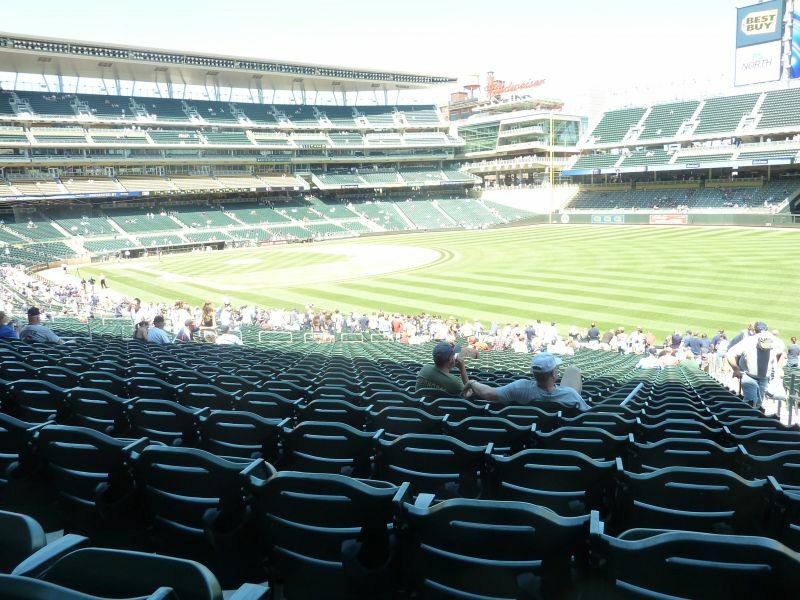 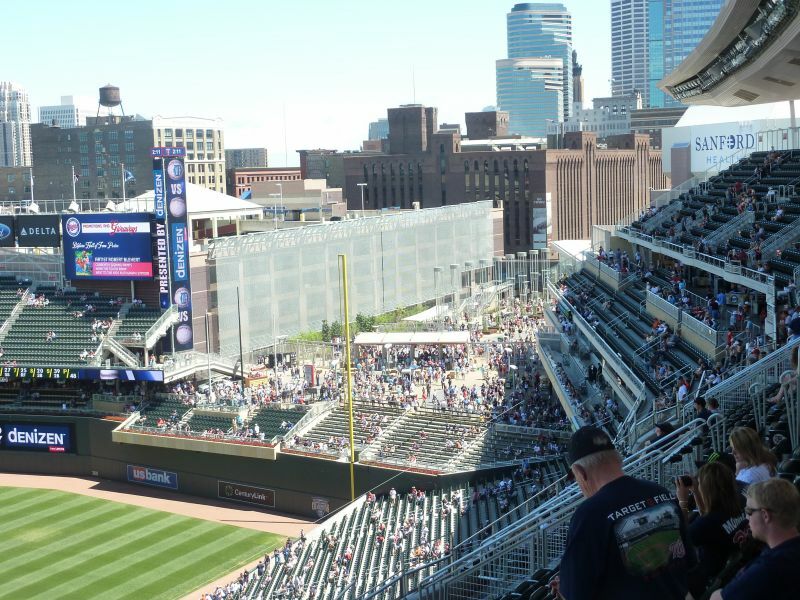 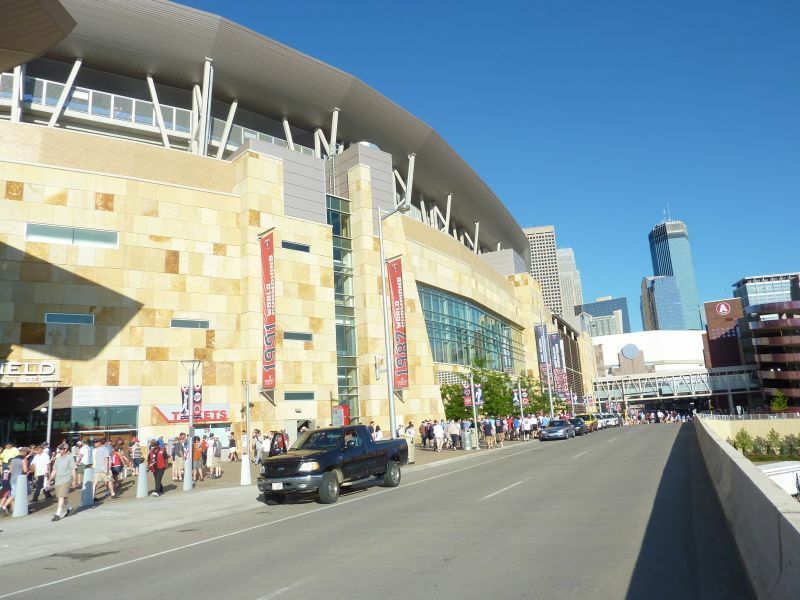 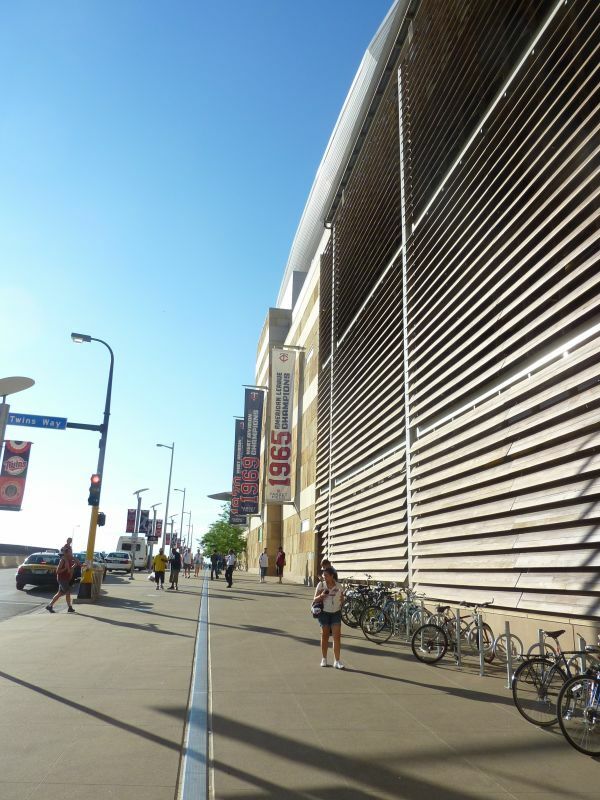 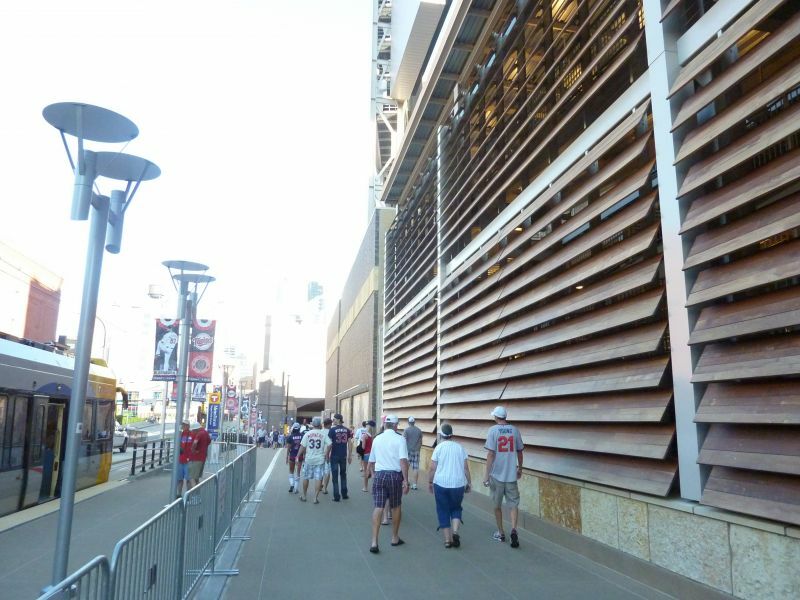 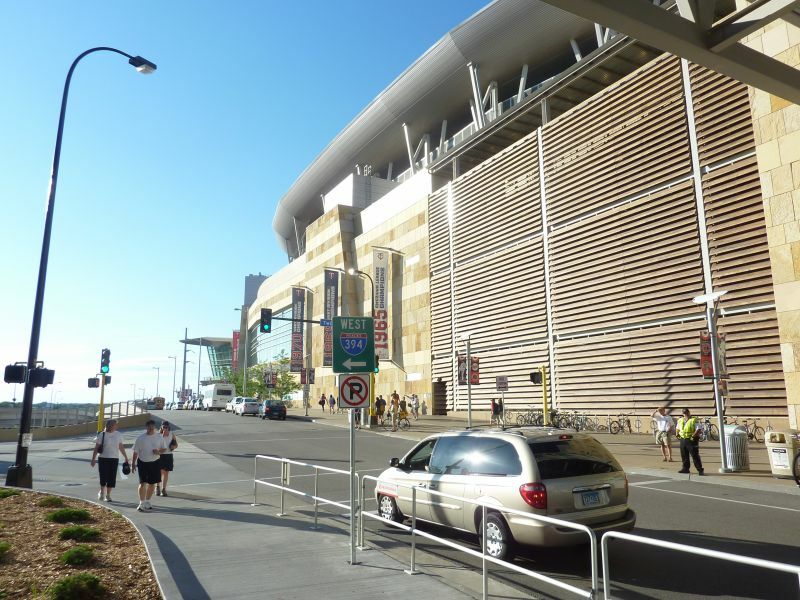 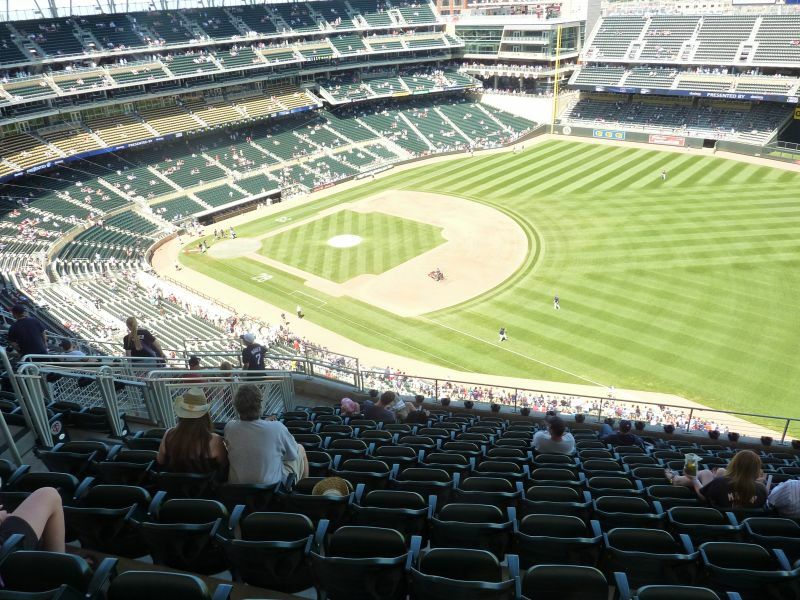 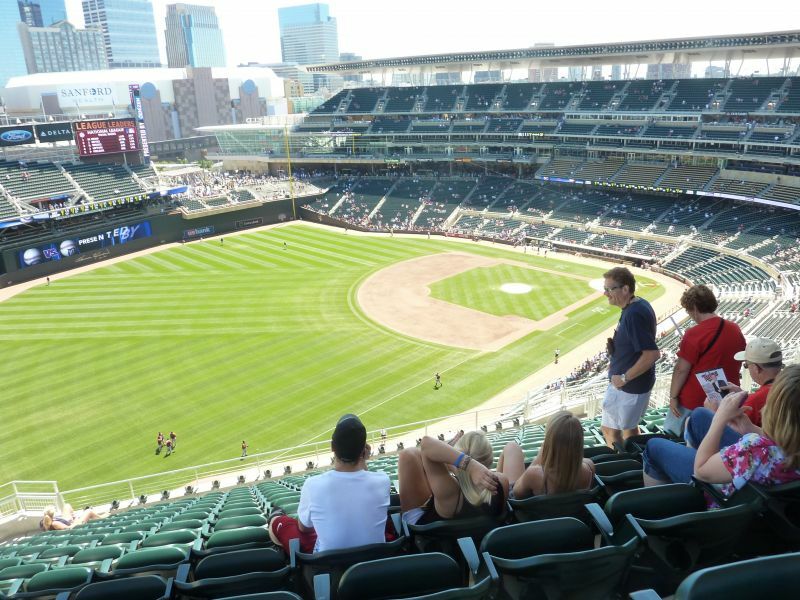 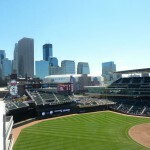 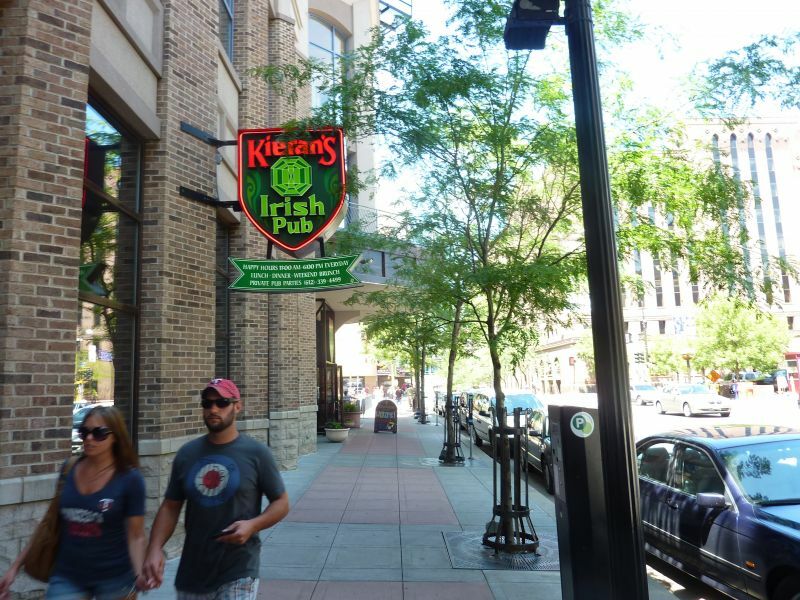 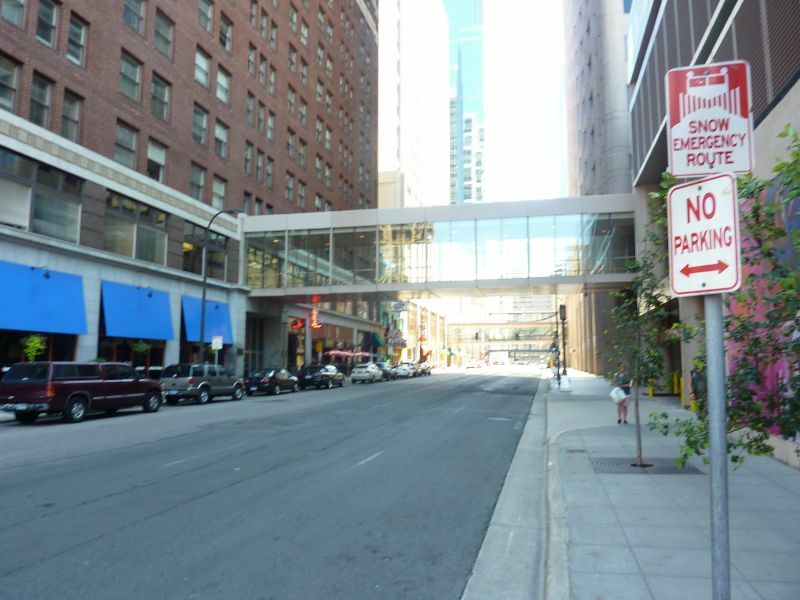 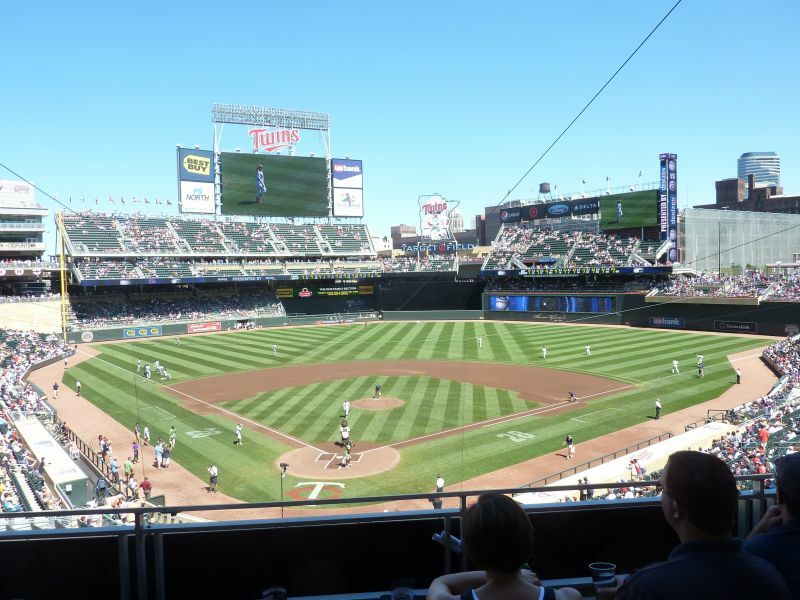 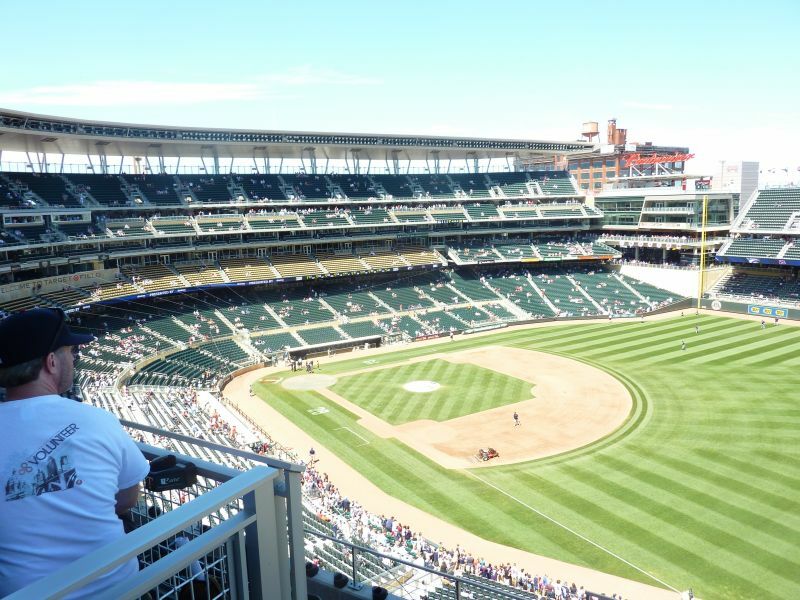 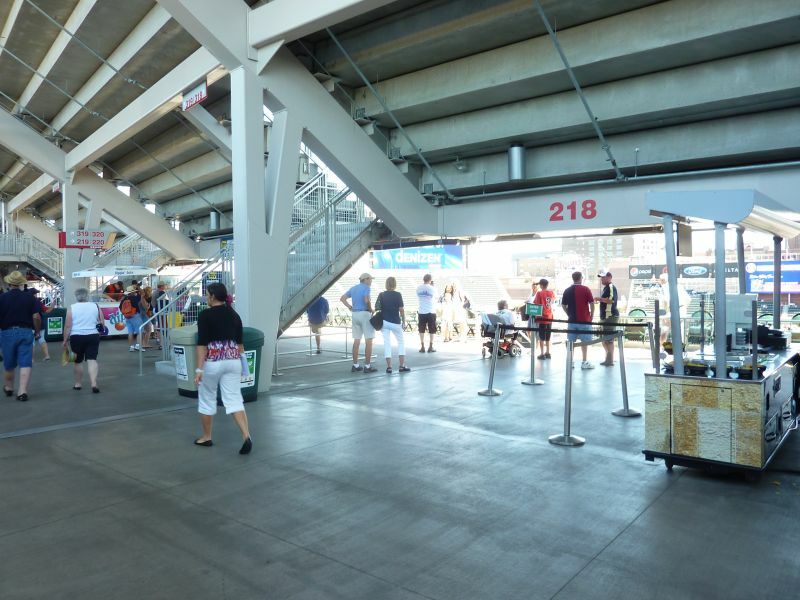 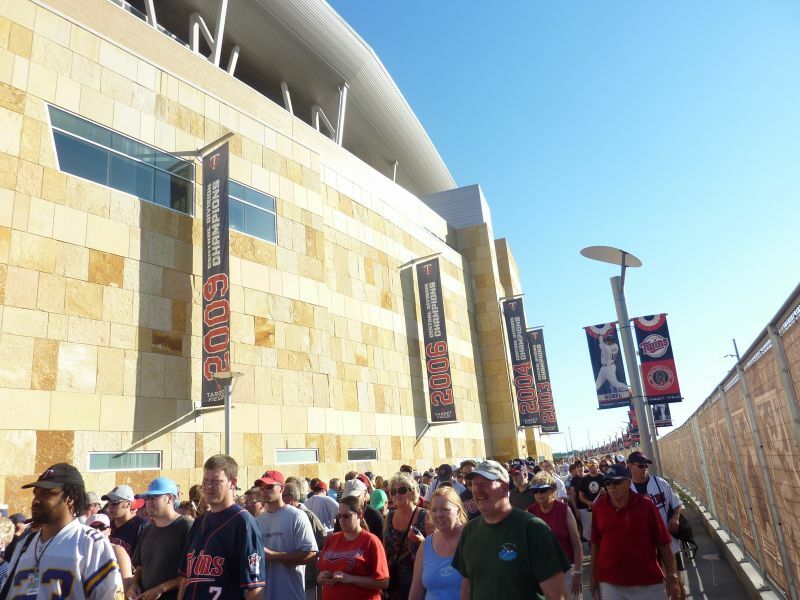 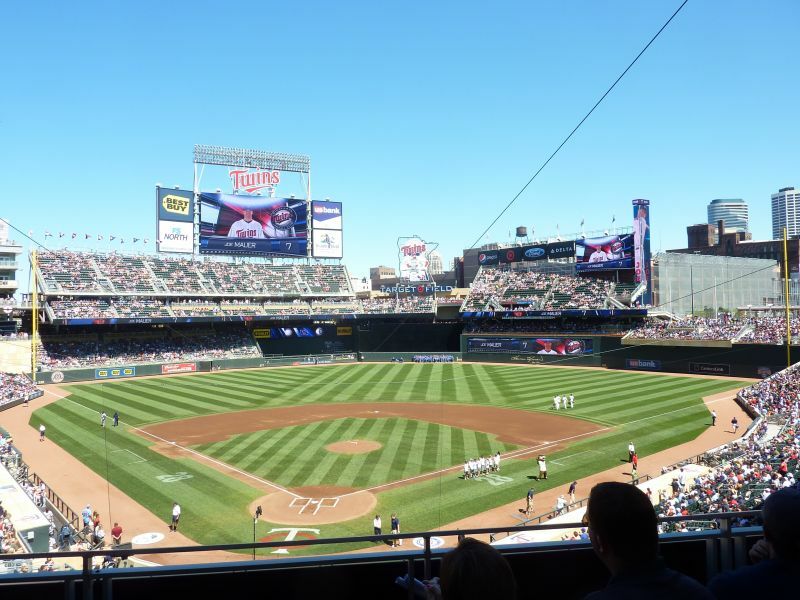 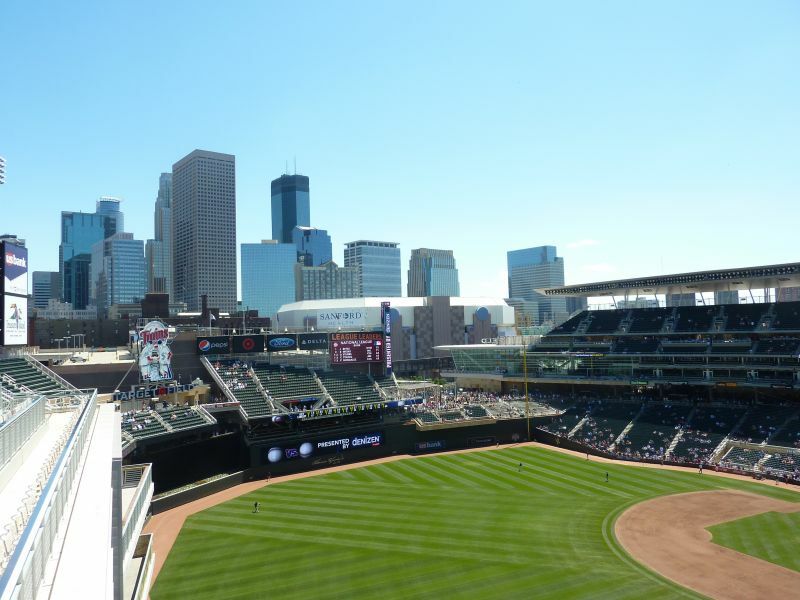 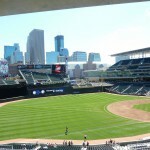 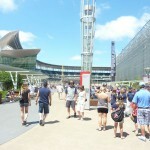 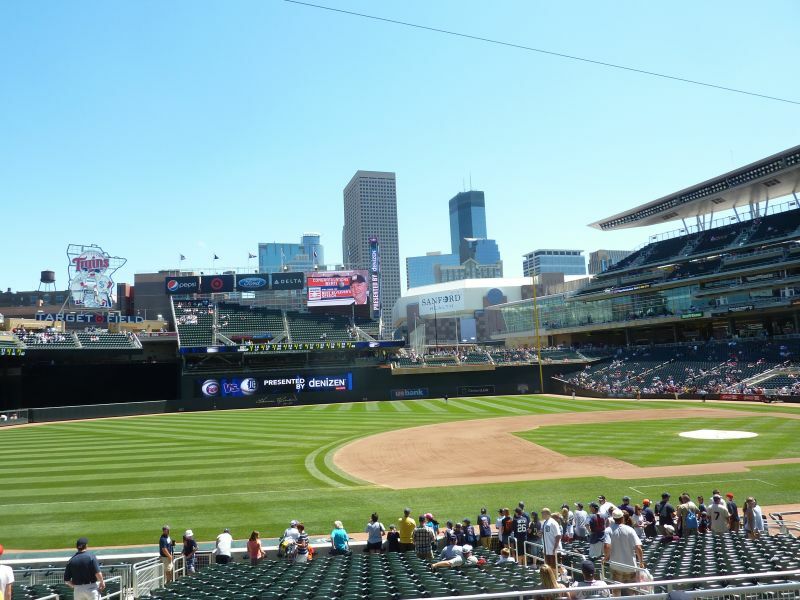 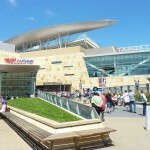 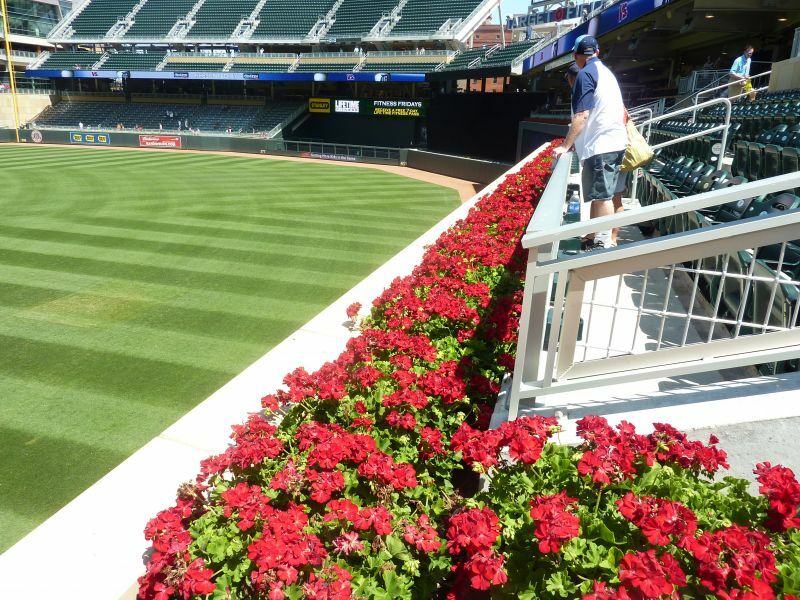 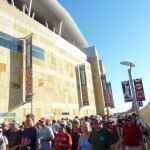 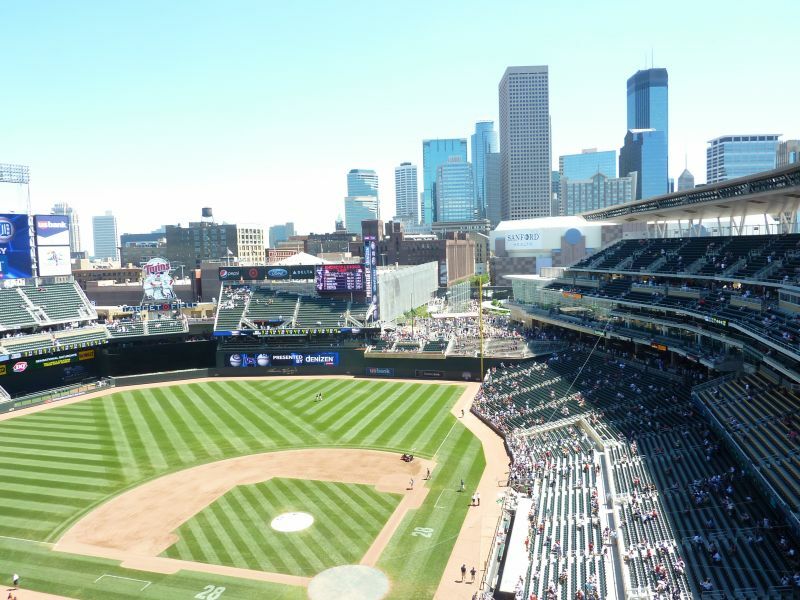 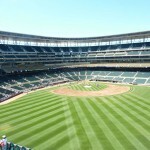 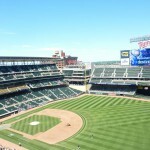 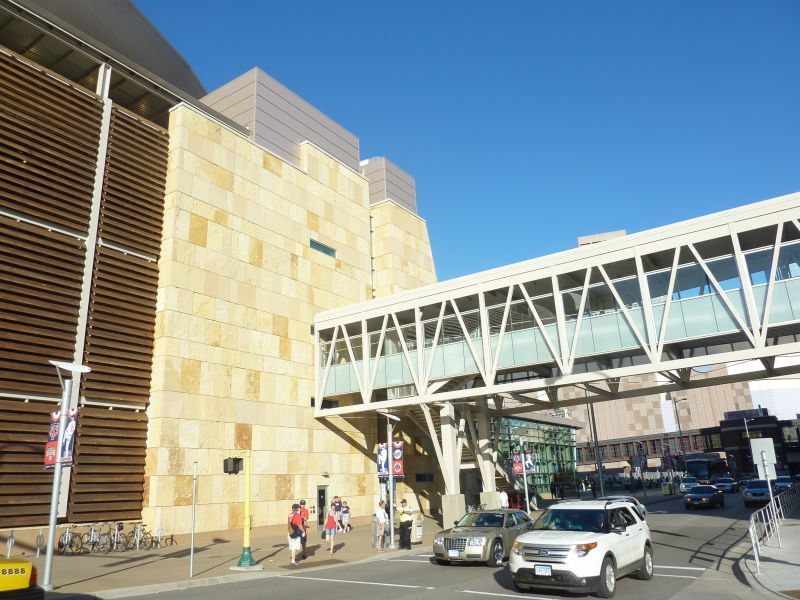 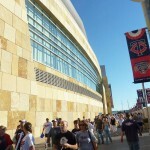 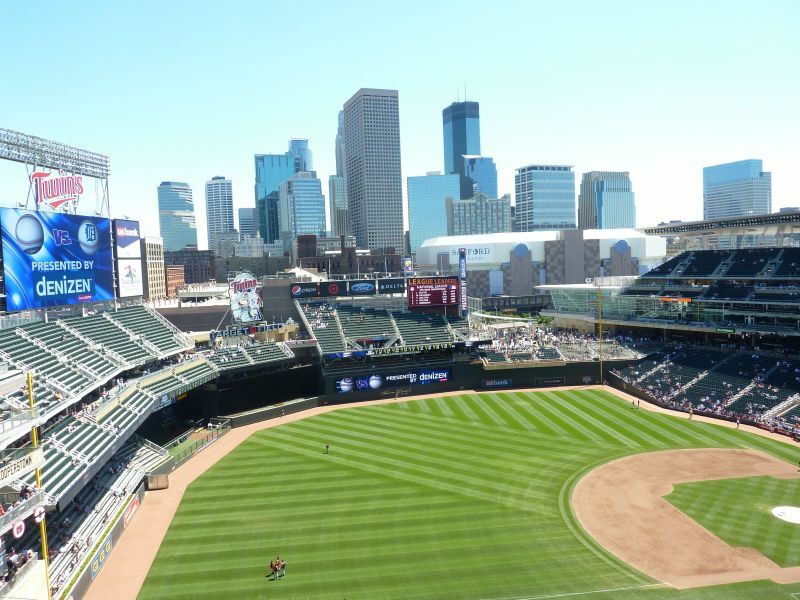 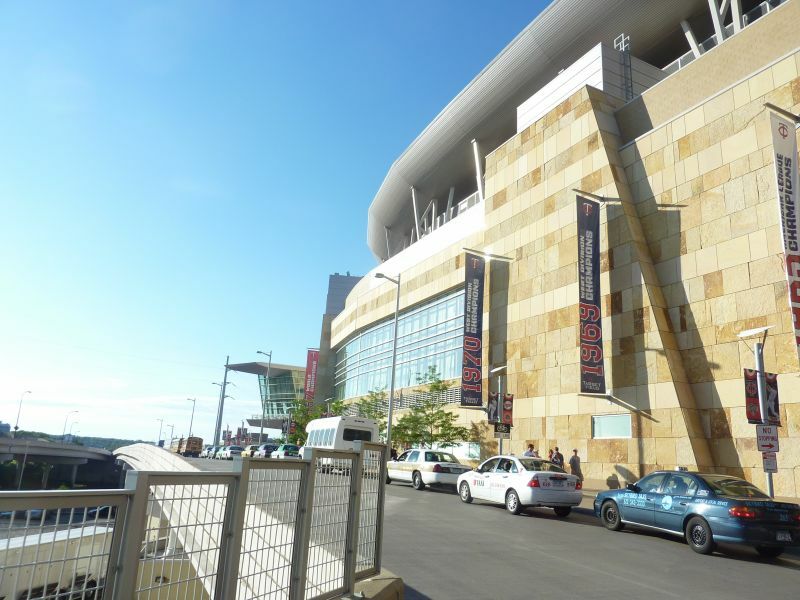 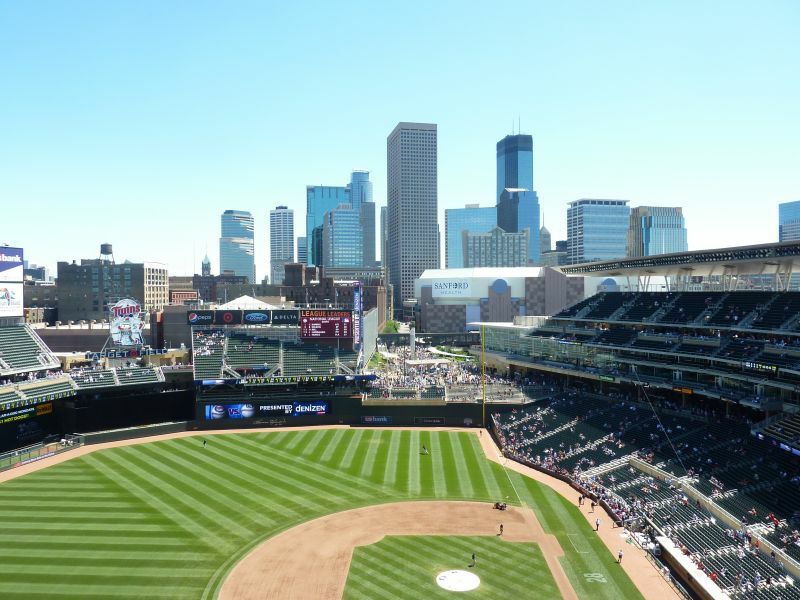 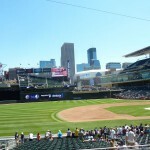 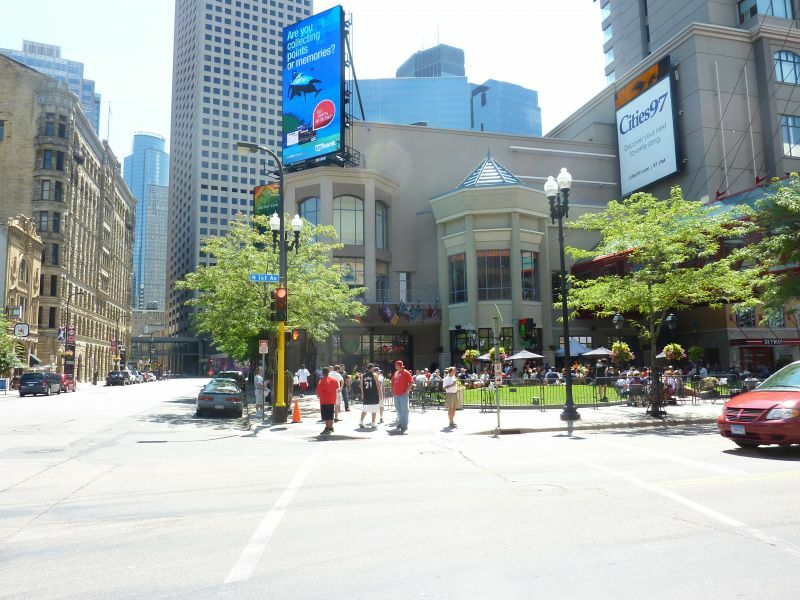 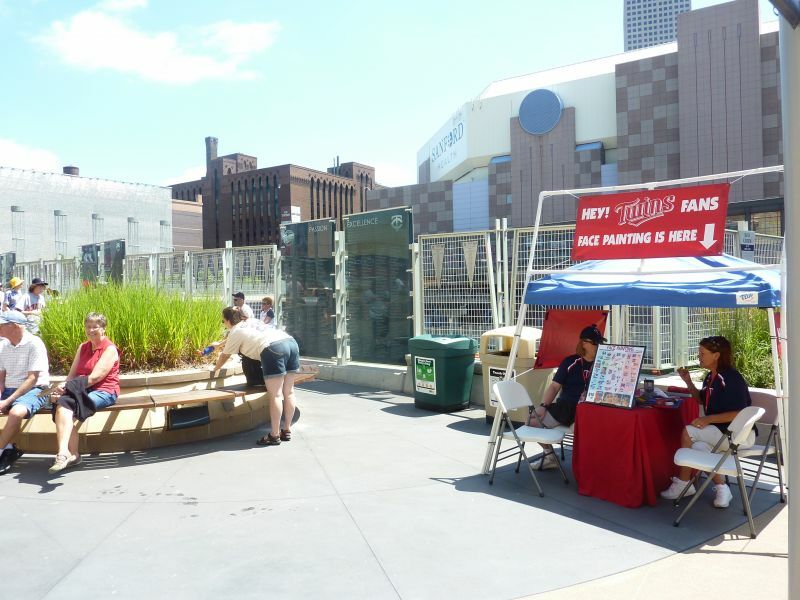 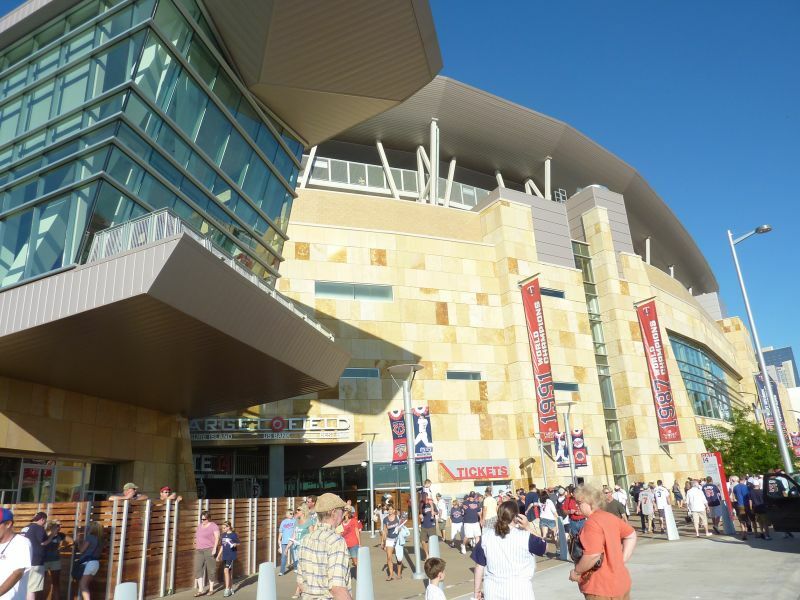 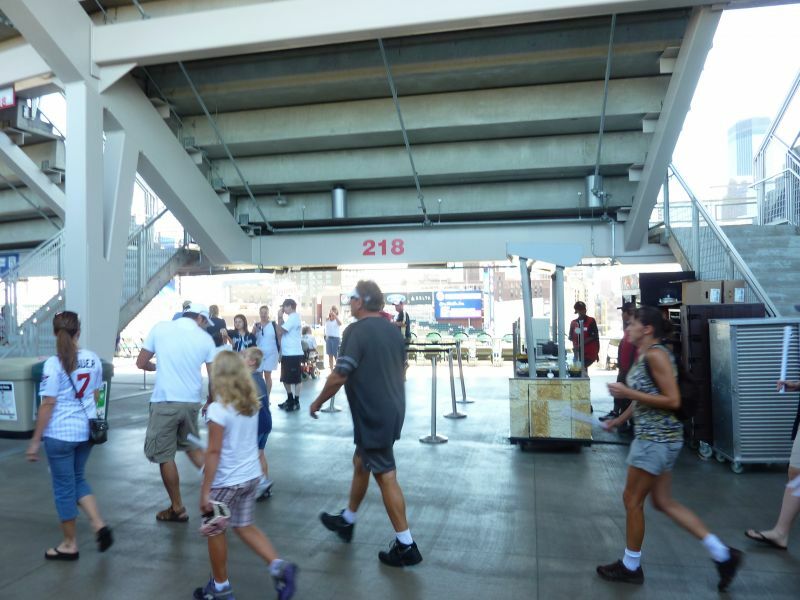 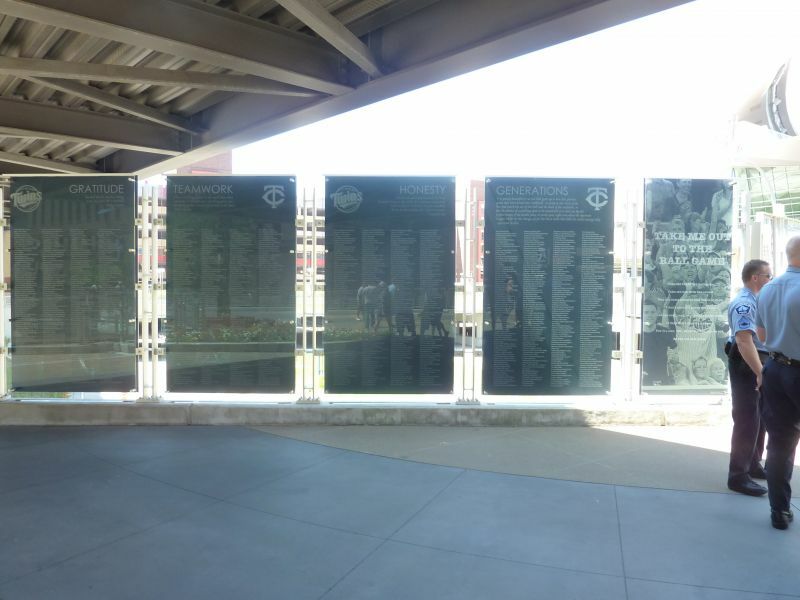 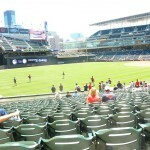 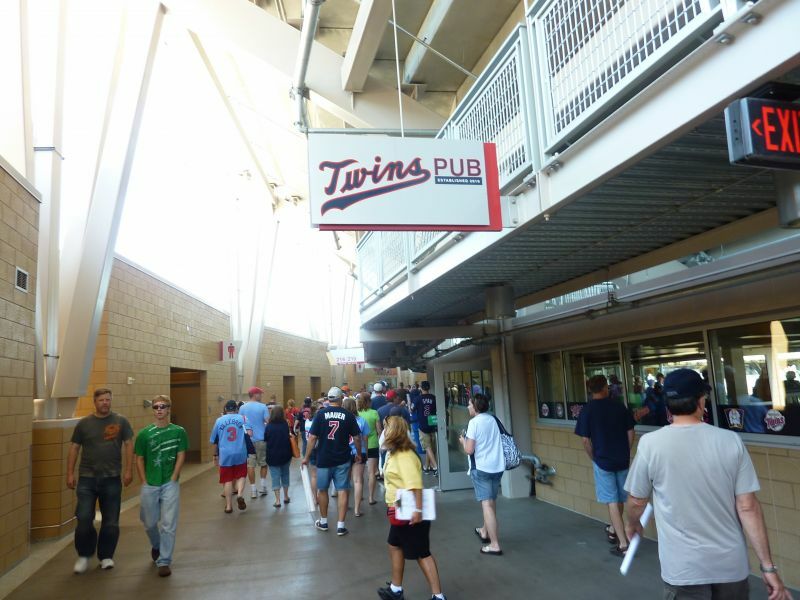 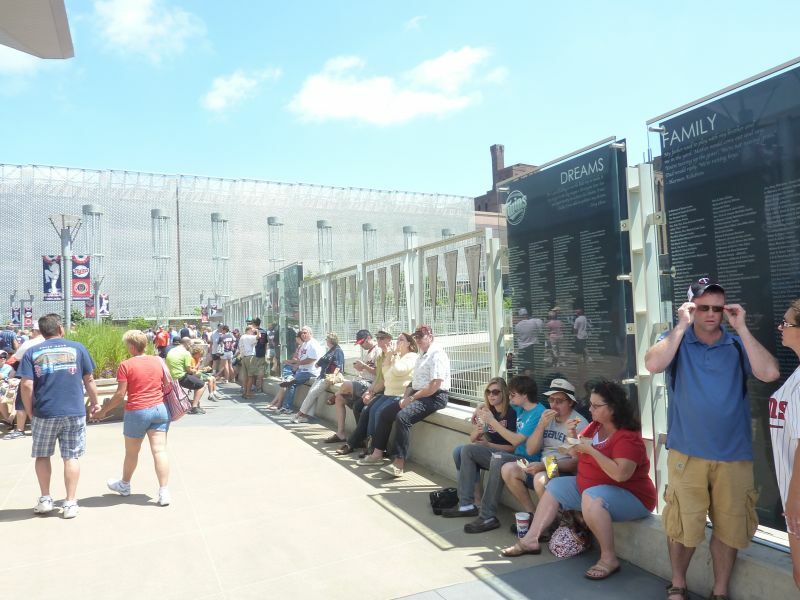 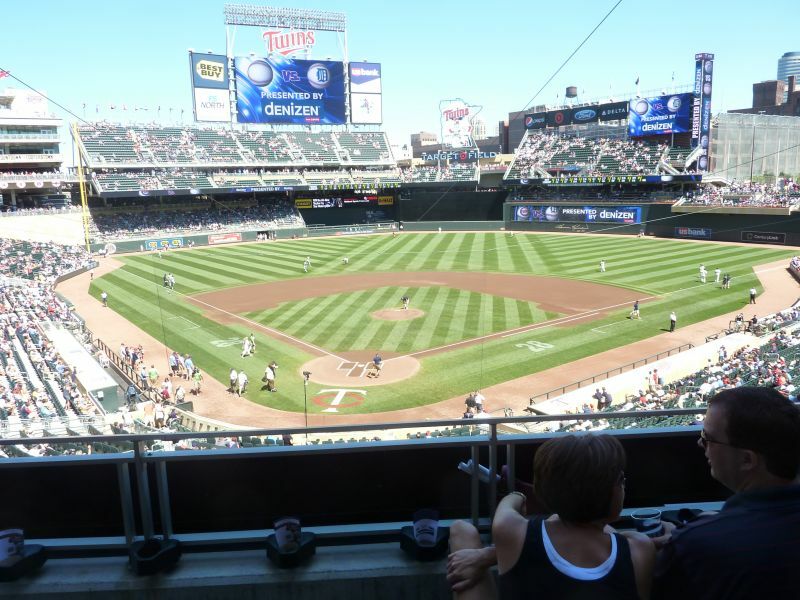 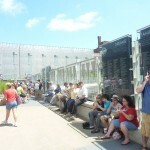 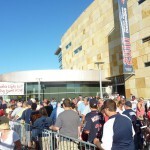 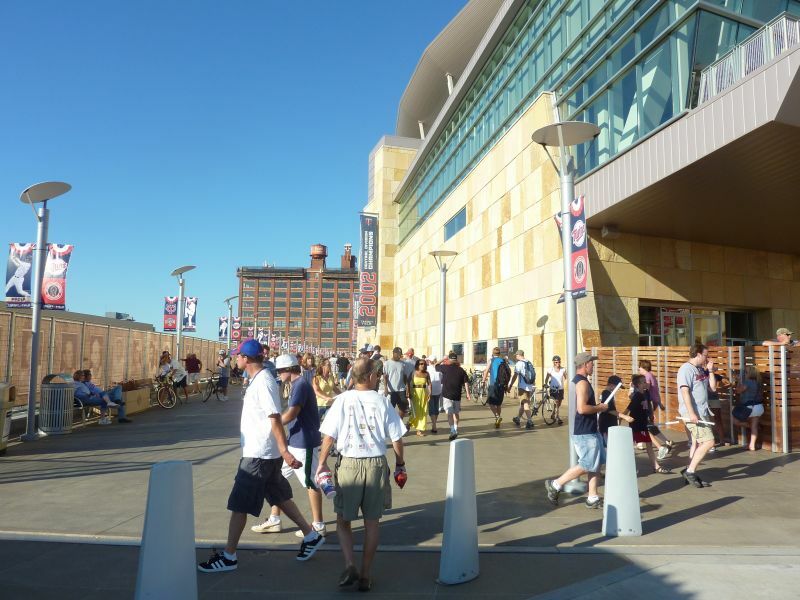 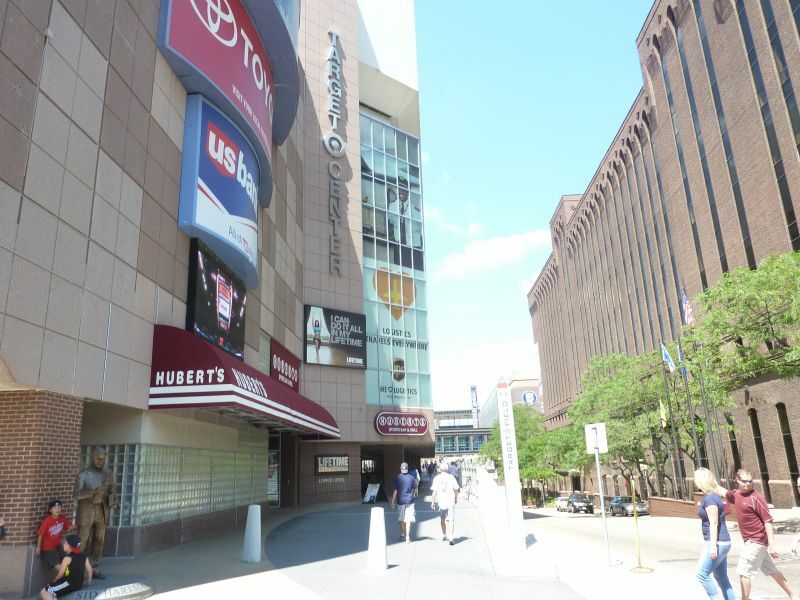 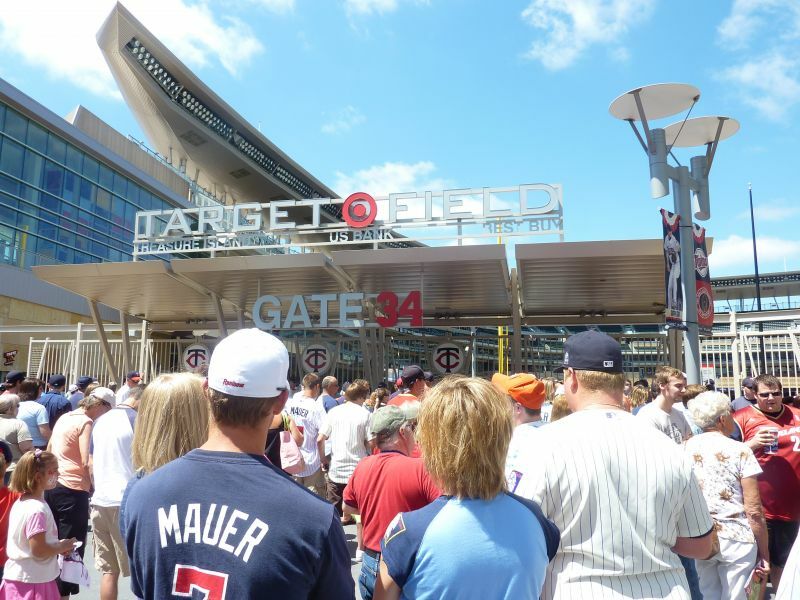 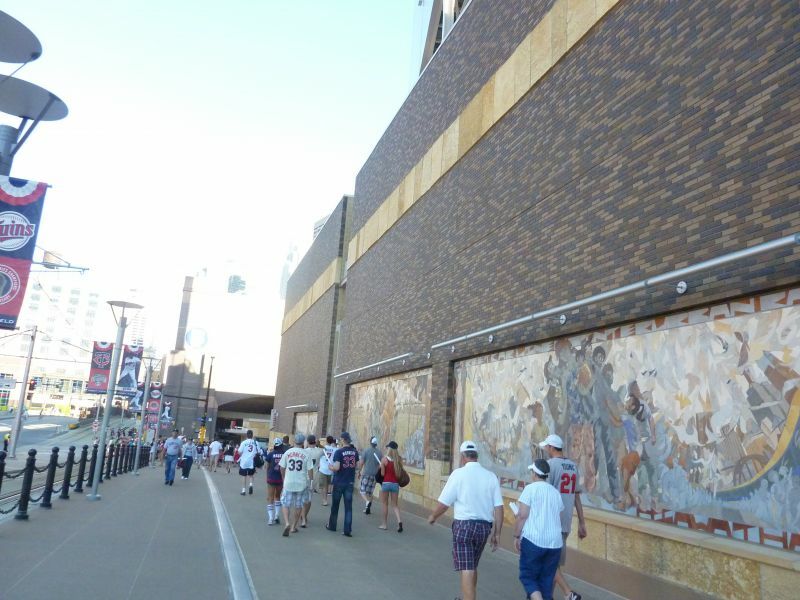 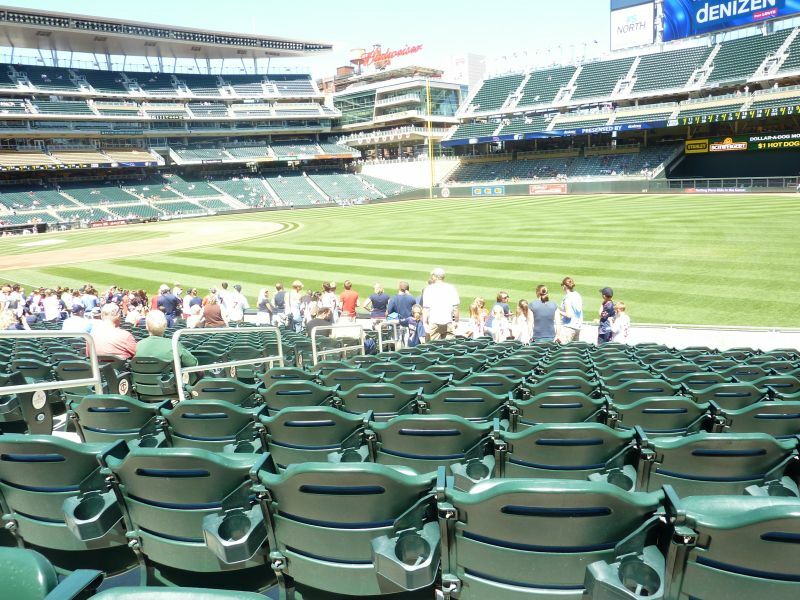 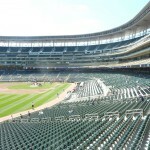 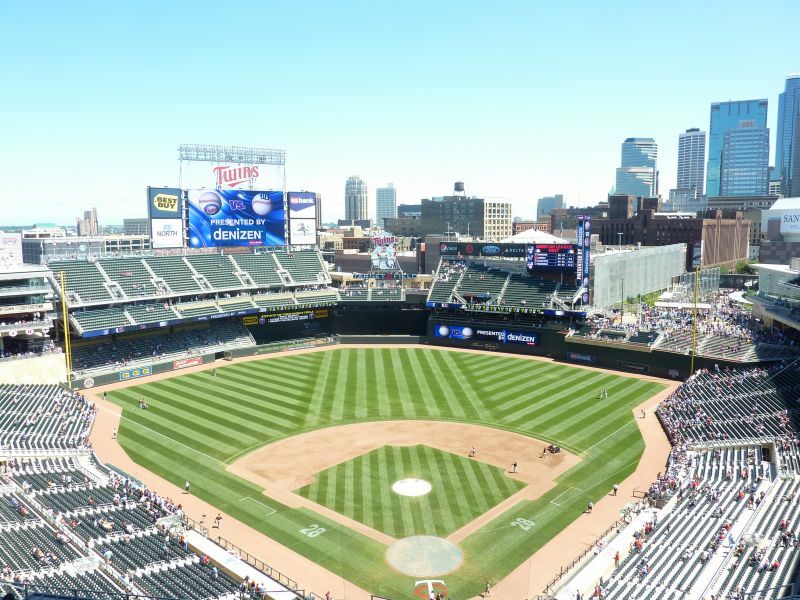 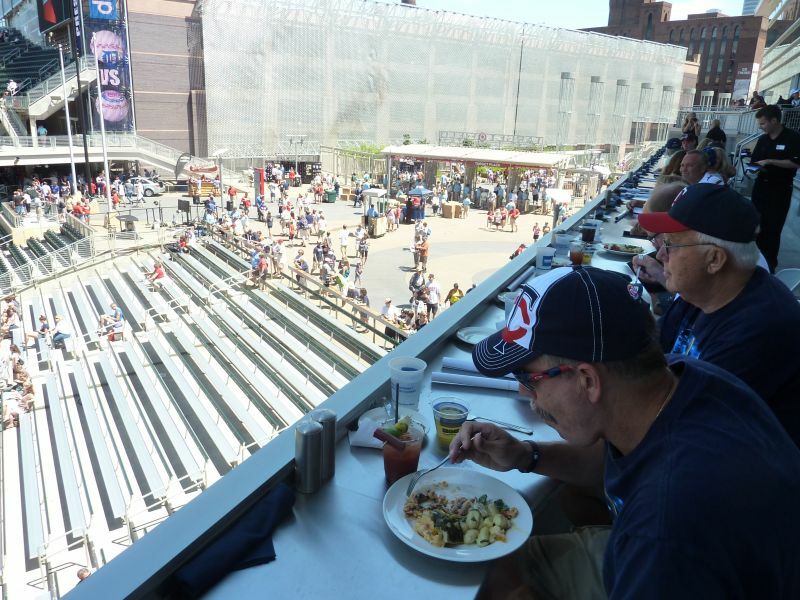 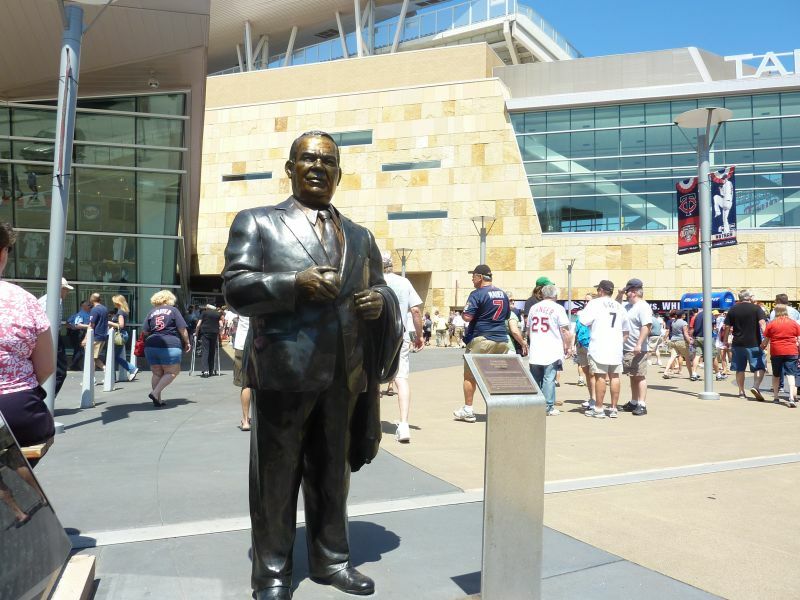 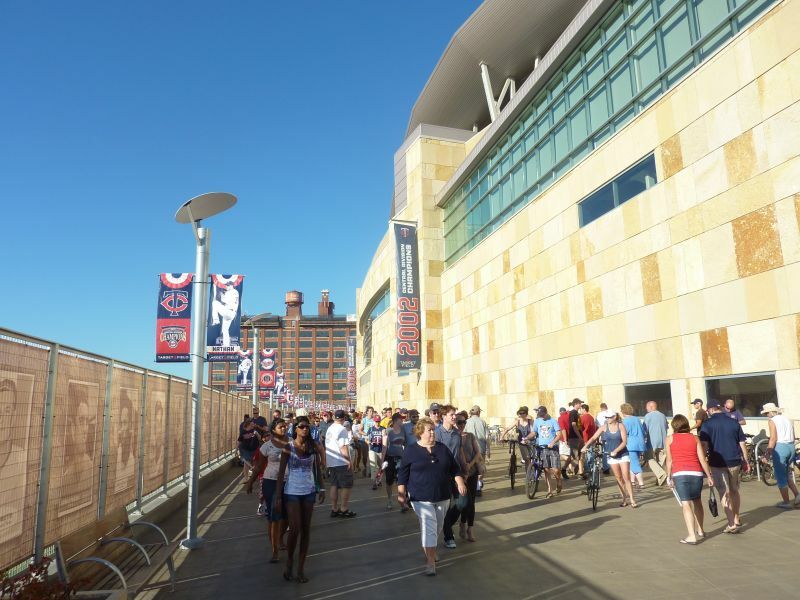 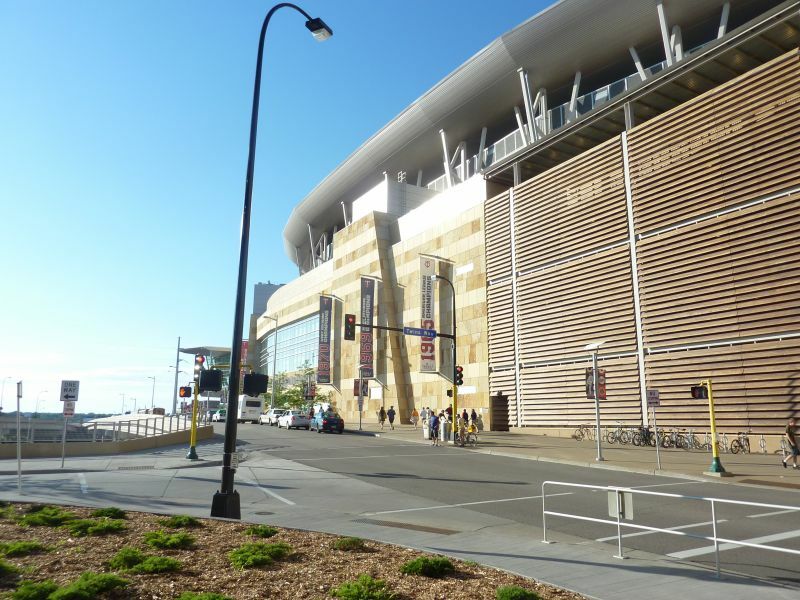 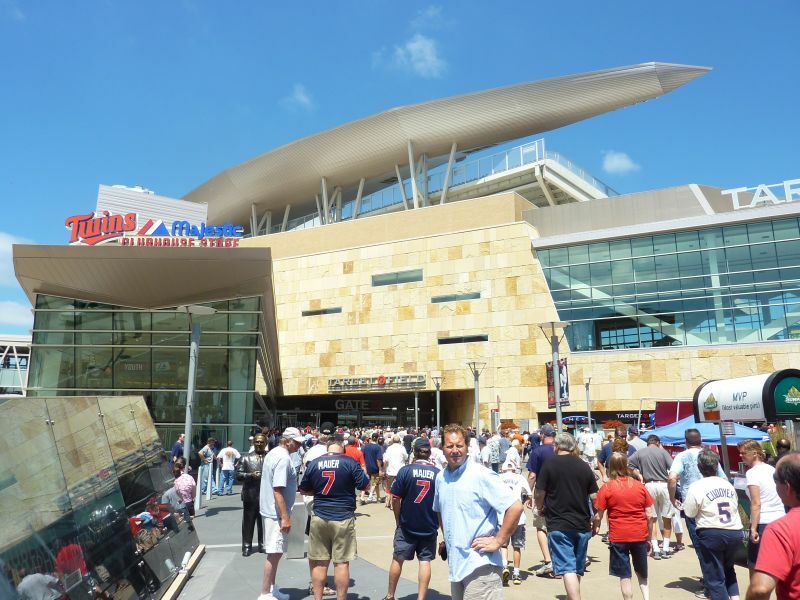 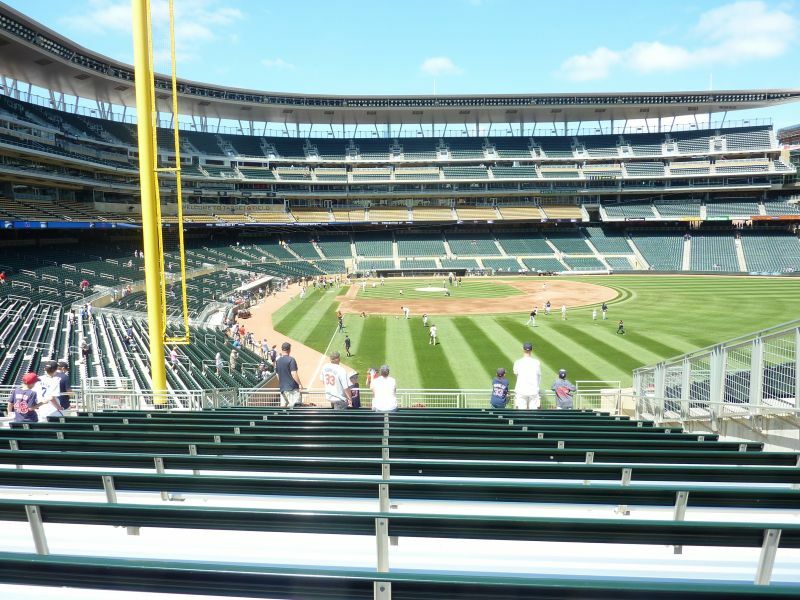 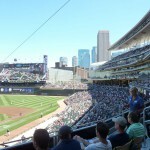 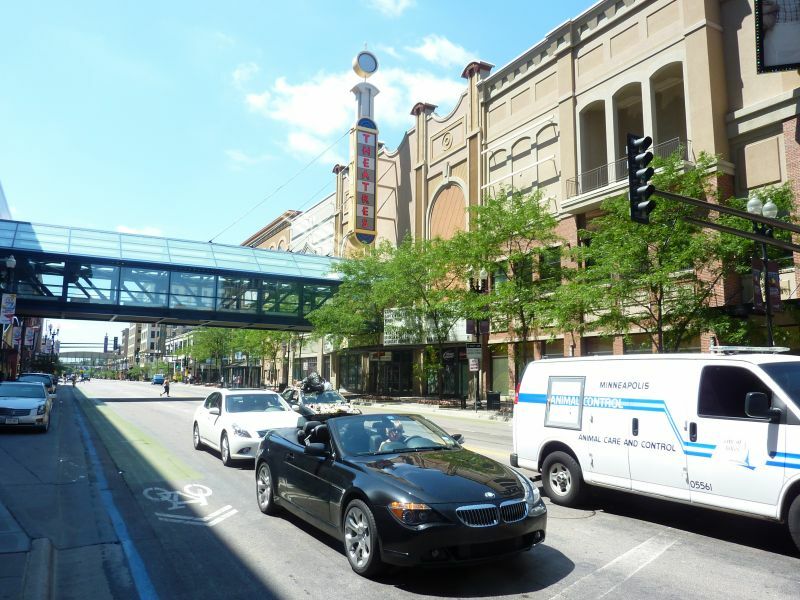 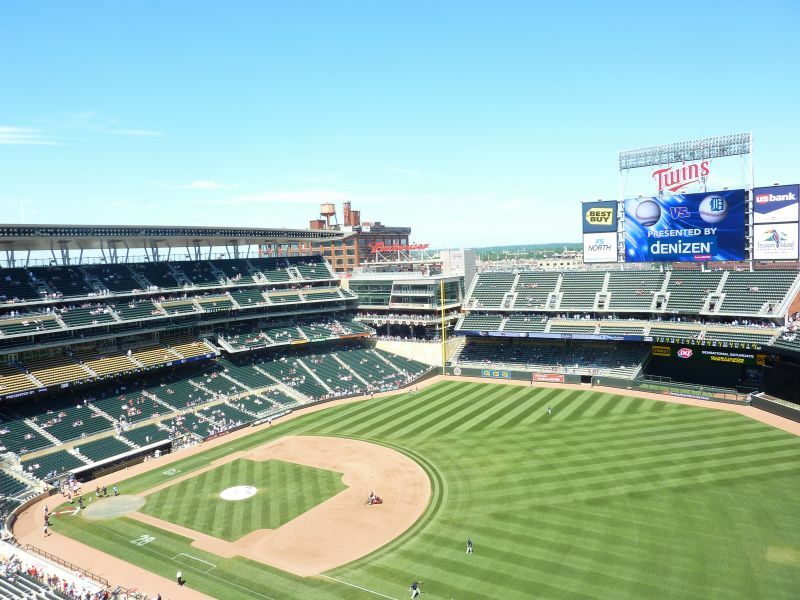 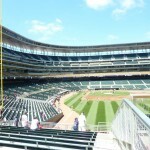 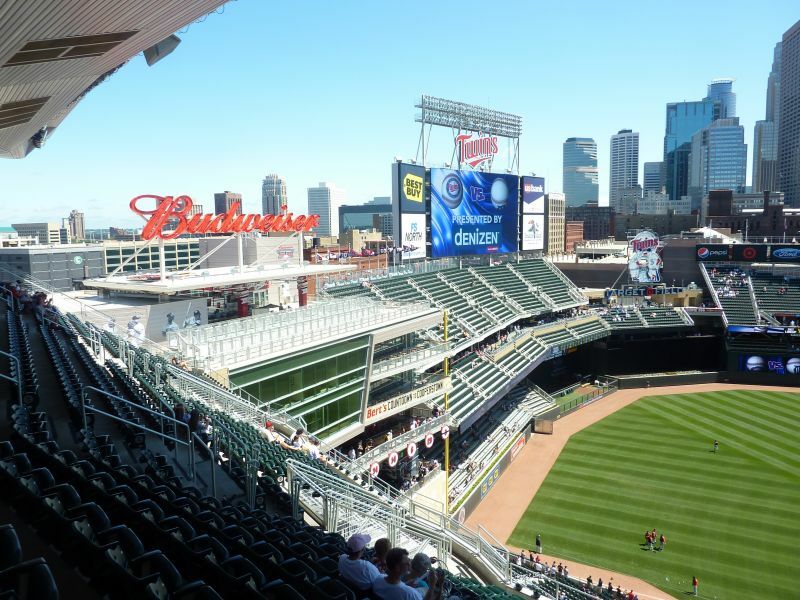 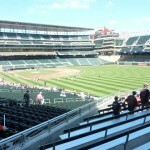 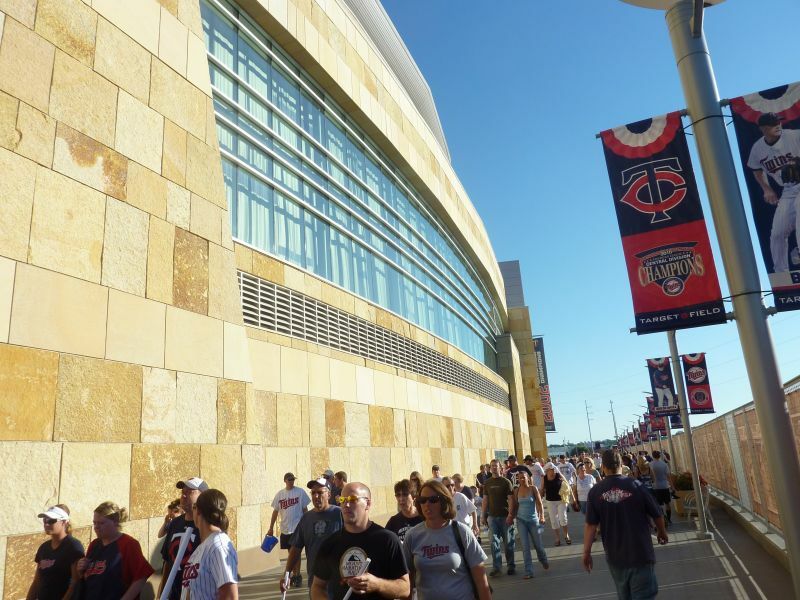 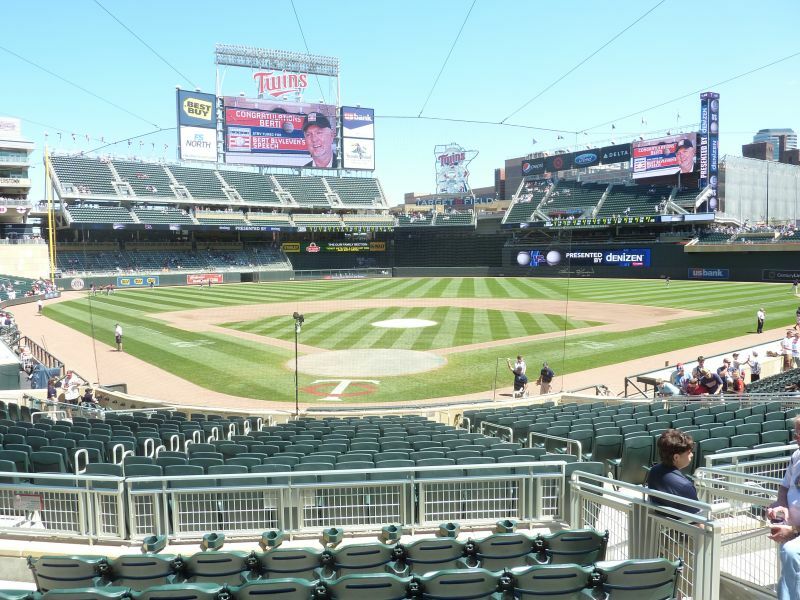 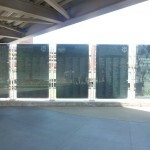 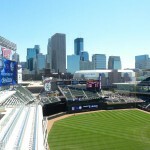 With its contextual urban lines, mostly confident and free from gimmicks or distractions, Target Field directly recalls Jacobs Field in its connection to the city. 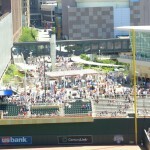 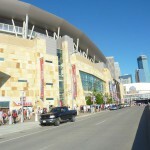 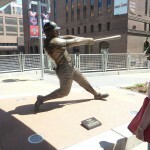 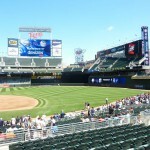 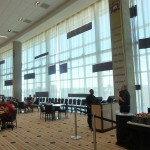 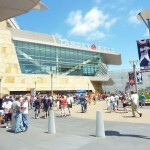 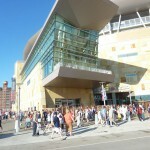 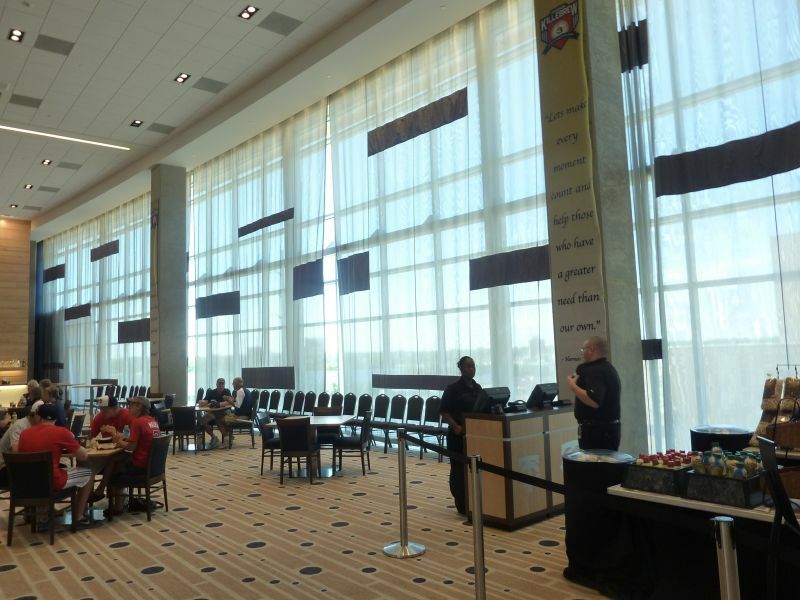 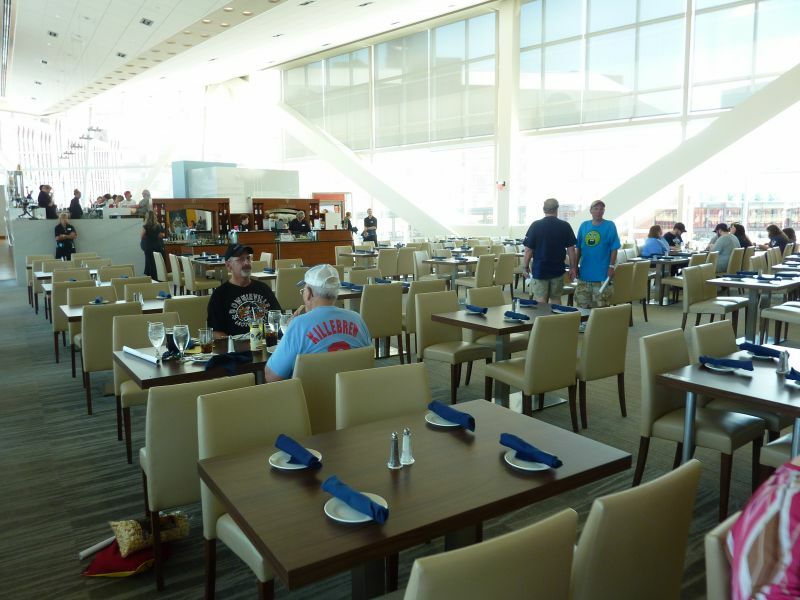 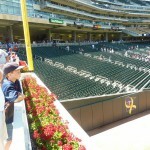 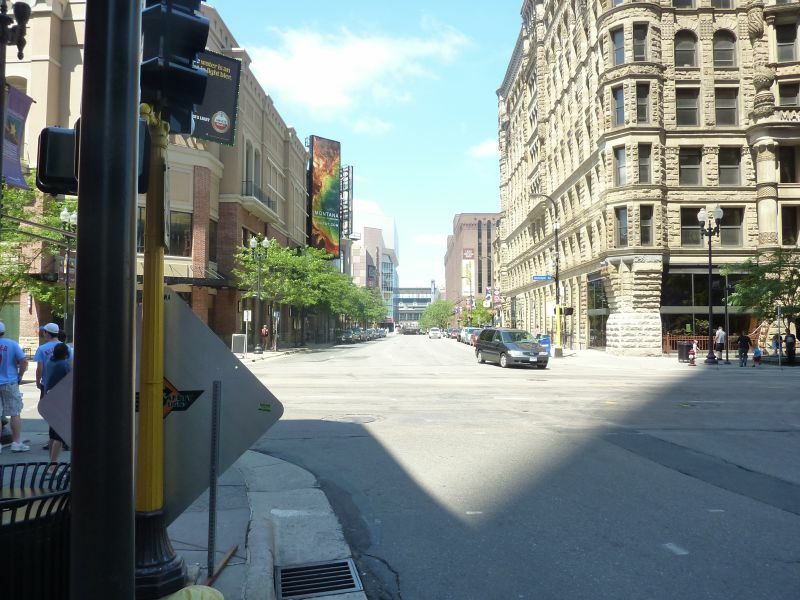 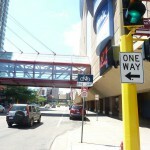 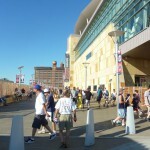 The open space in right field, specifically the integration of the Target Center, is a strong reference to Cleveland’s crown jewel. 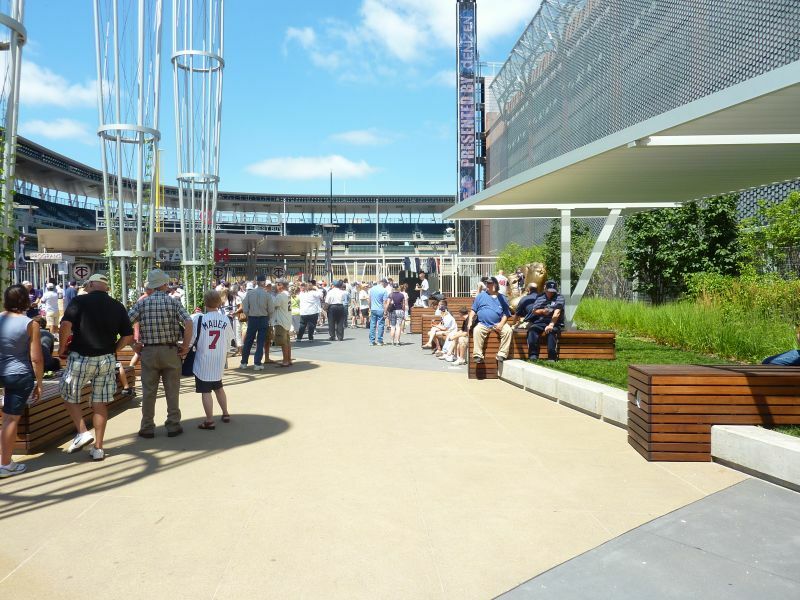 Since the early 90s, except arguably PNC and Comerica, it’s really the first park that visibly conforms to its surroundings and makes a concentrated effort to acknowledge the city. 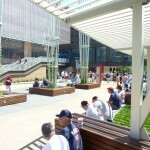 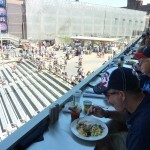 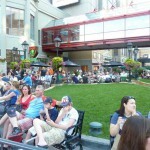 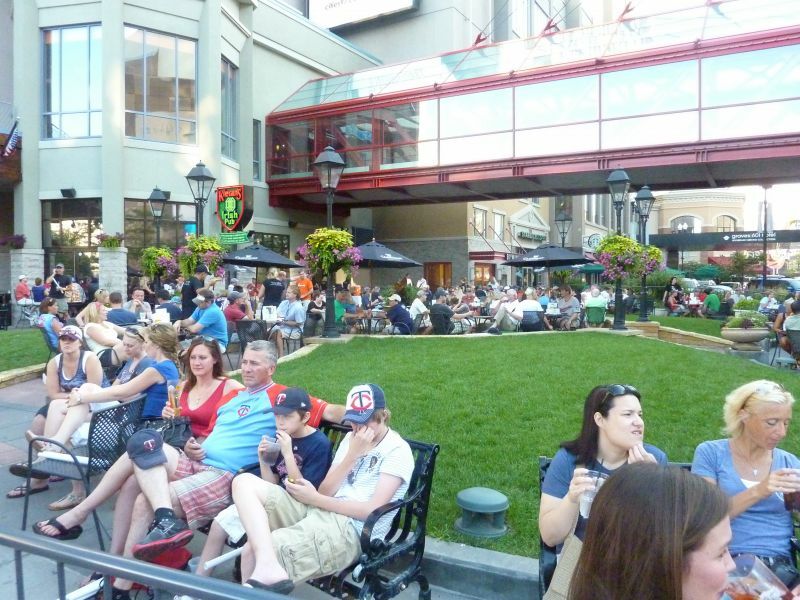 It really is the most urban park in baseball, as everything is remarkably conformed to the area. 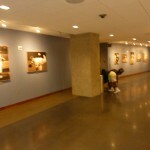 And that deserves immense praise. 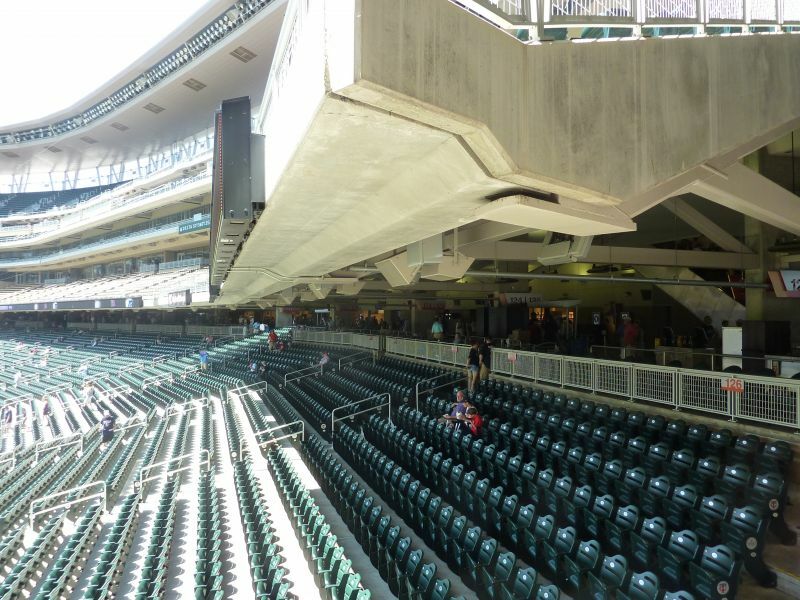 This is as naturally constrained an urban structure that you’ll see in baseball. 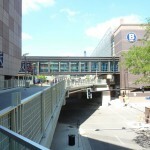 We have freeways and trains nearby, with warehouses stacked to the left. 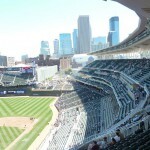 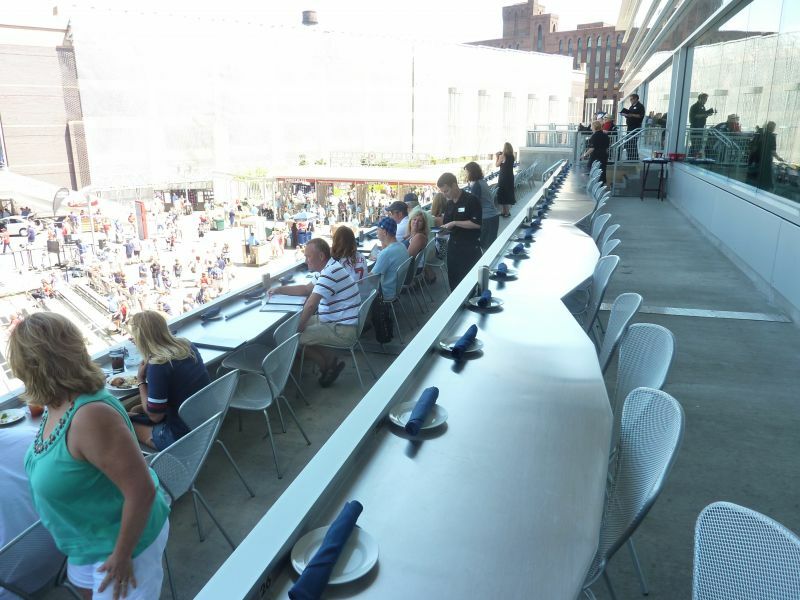 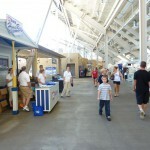 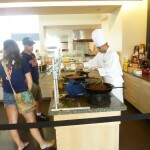 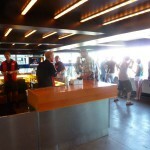 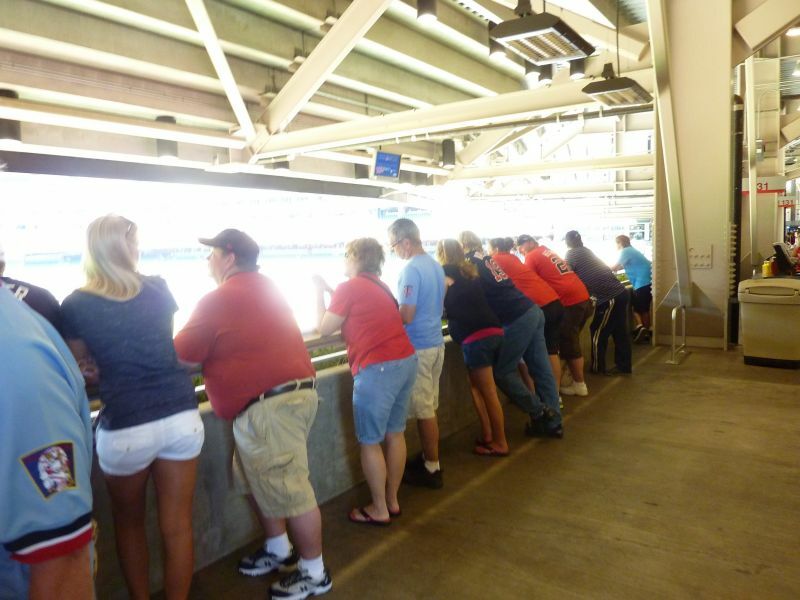 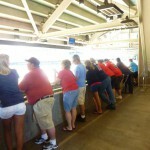 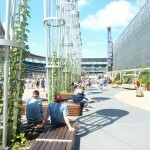 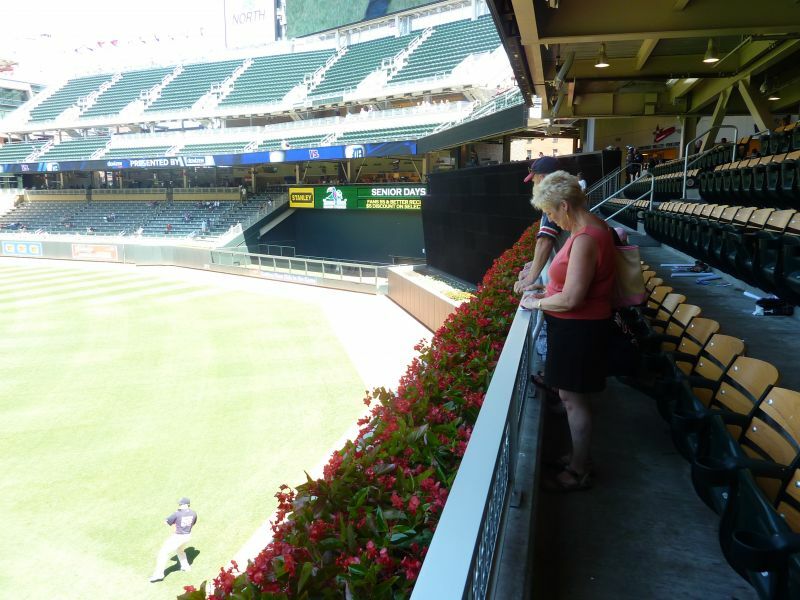 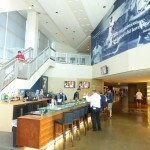 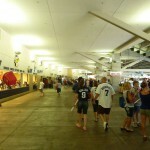 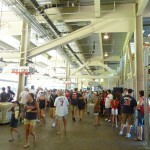 In fact, you have sections of the ballpark literally situated into and over the urban context. 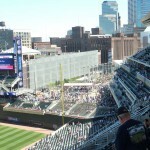 Note the slanted right field grandstand conformed to the parking garage or how the Target Plaza is literally built over the I-394 freeway. 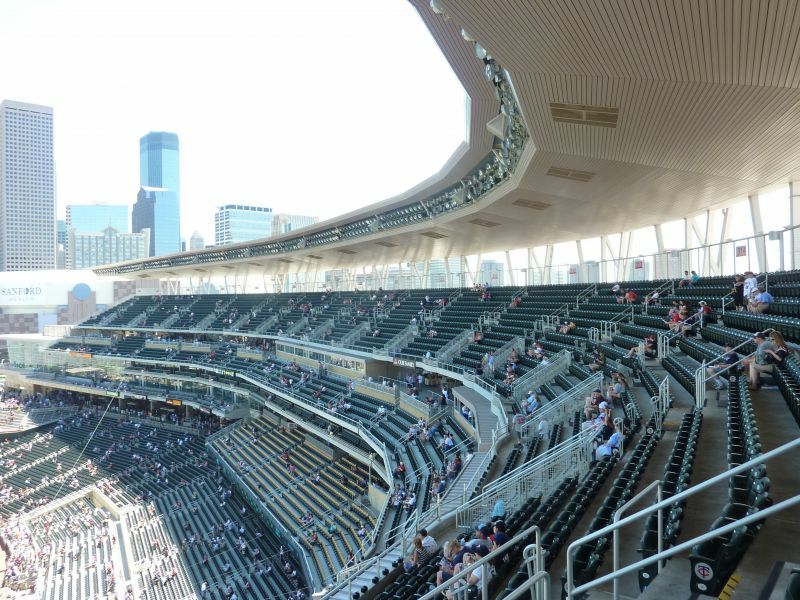 You can debate how it looks, but there’s no doubt it’s pretty cool. 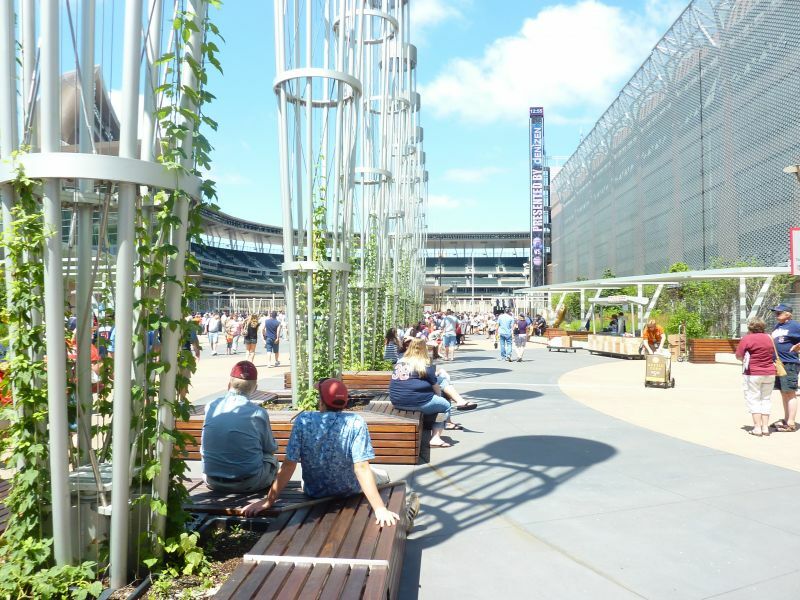 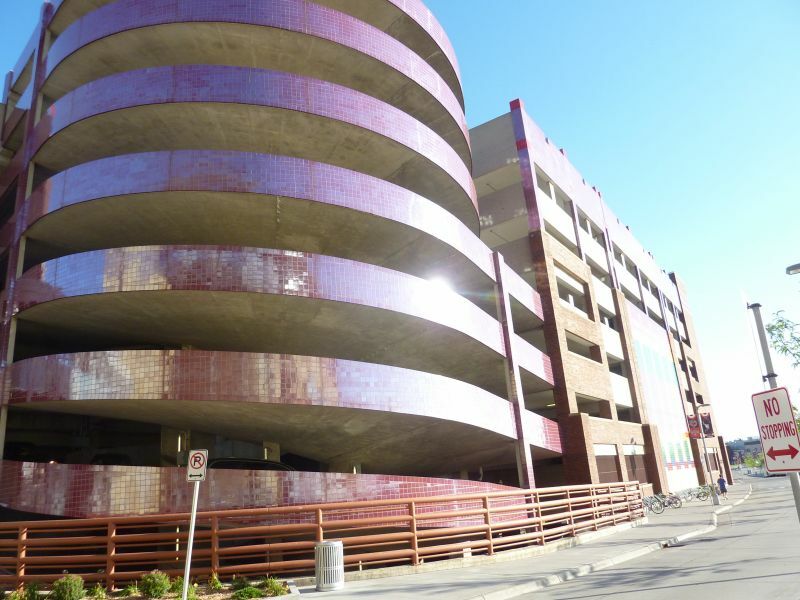 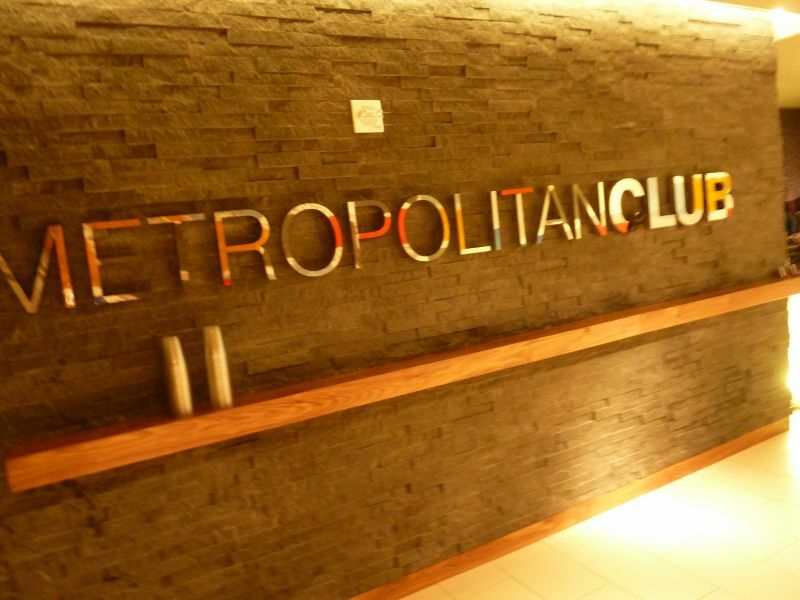 While it is the most brilliant urban design in a long time, I have to admit it falls a bit short in comparison in providing an aesthetically pleasing experience on the inside. 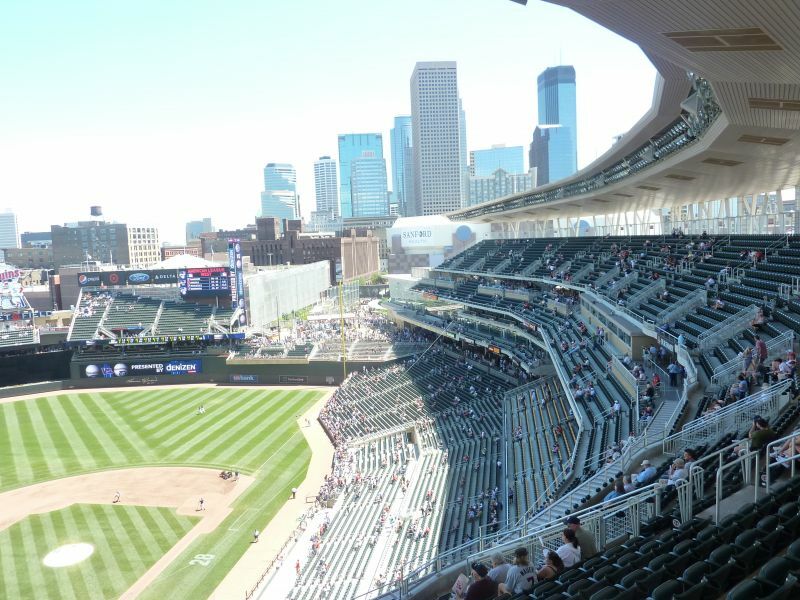 While it’s a great effort, I just don’t think it comes out as pretty or as aesthetically distinctive as some of the other highly rated ballparks. 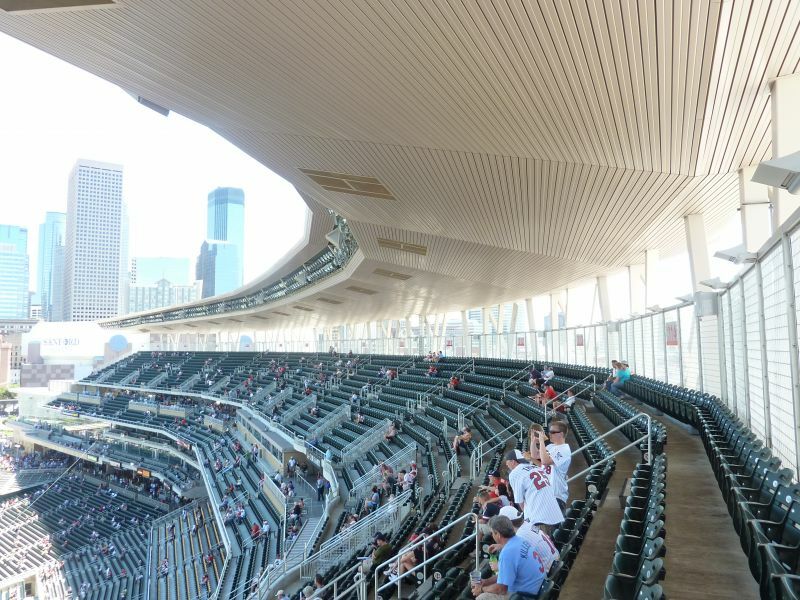 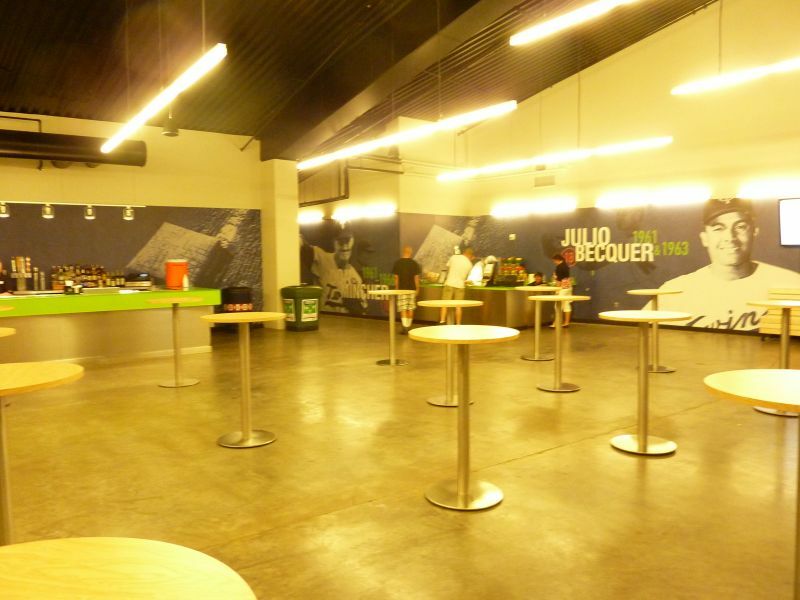 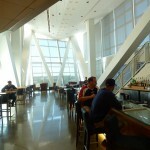 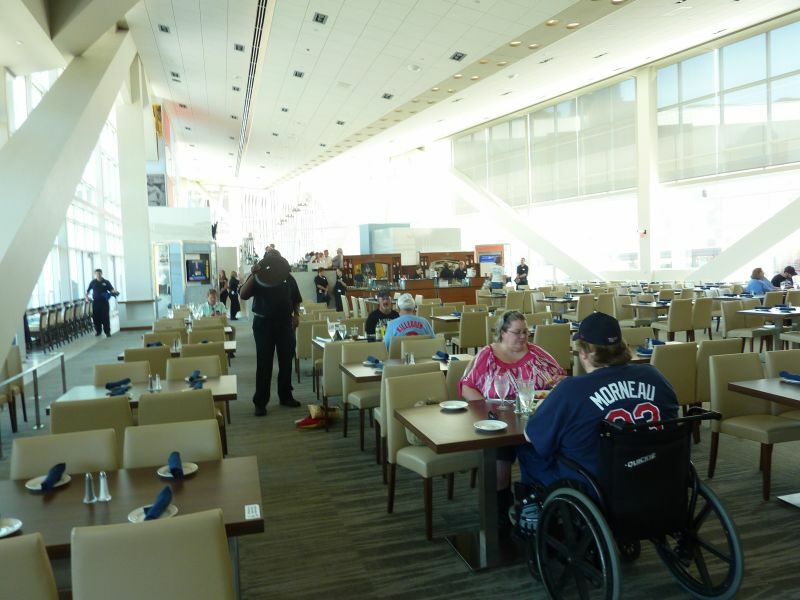 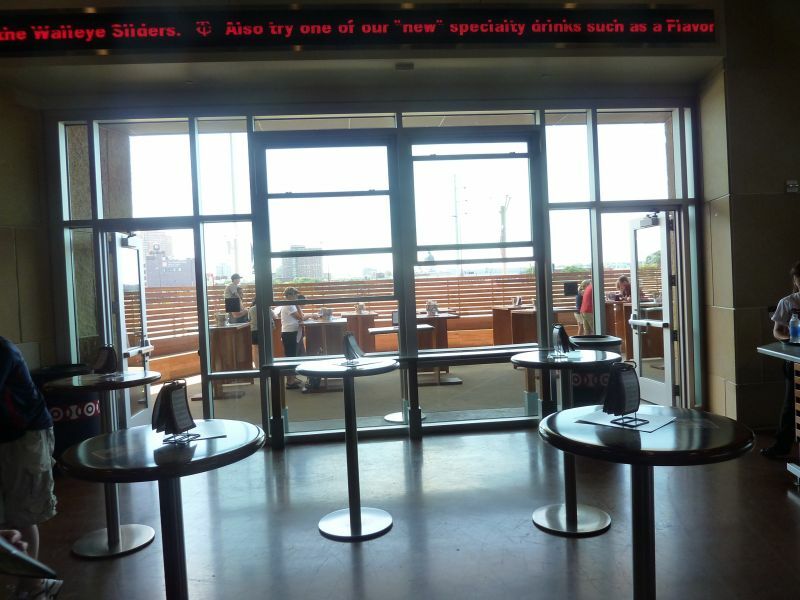 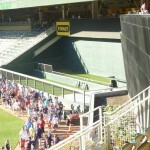 While the structure itself is consistently connected to the city, the interior sometimes fails to acknowledge it, instead opting for a towering monolith of seating with unnecessarily invasive video ribbon boards. 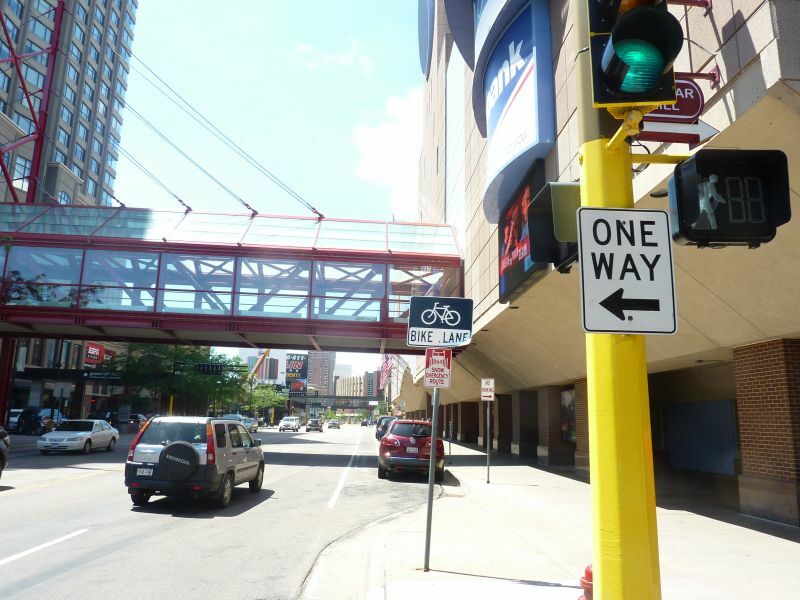 But it’s no doubt the best step in the right direction. 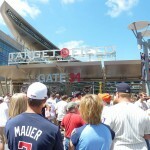 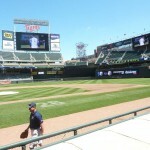 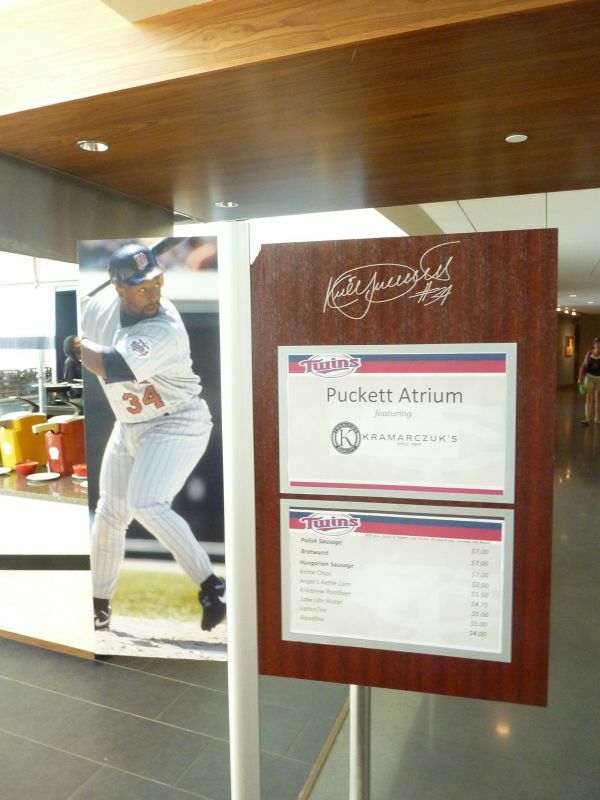 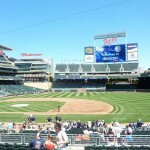 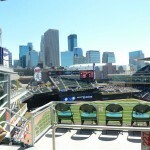 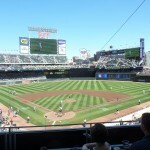 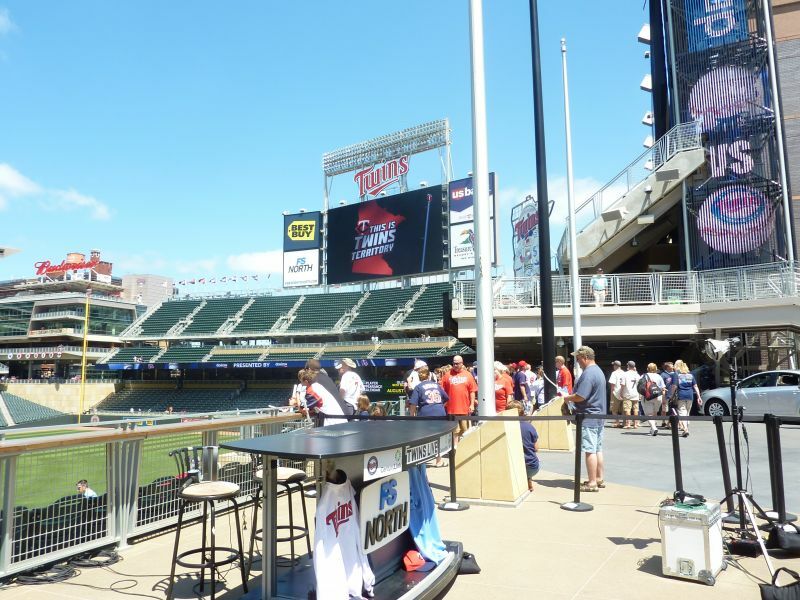 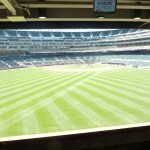 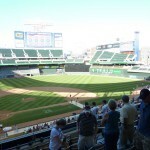 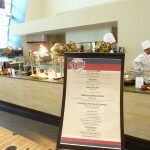 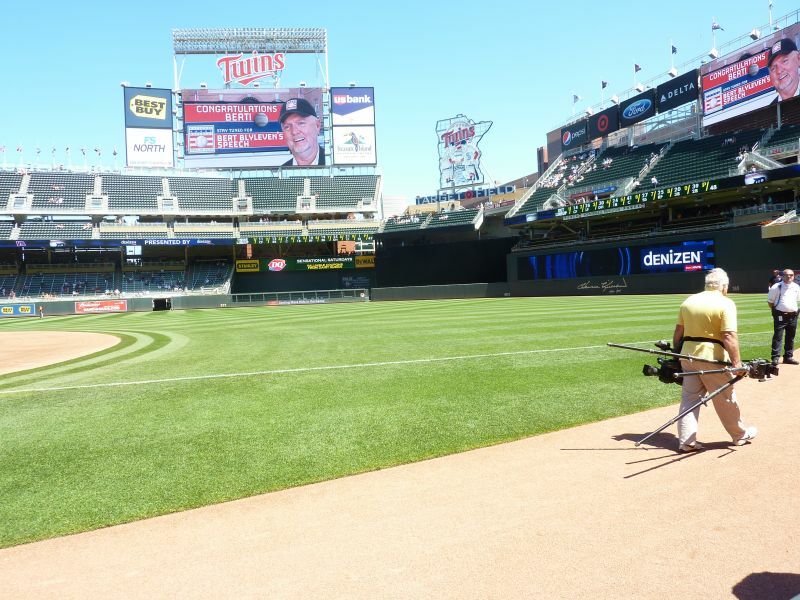 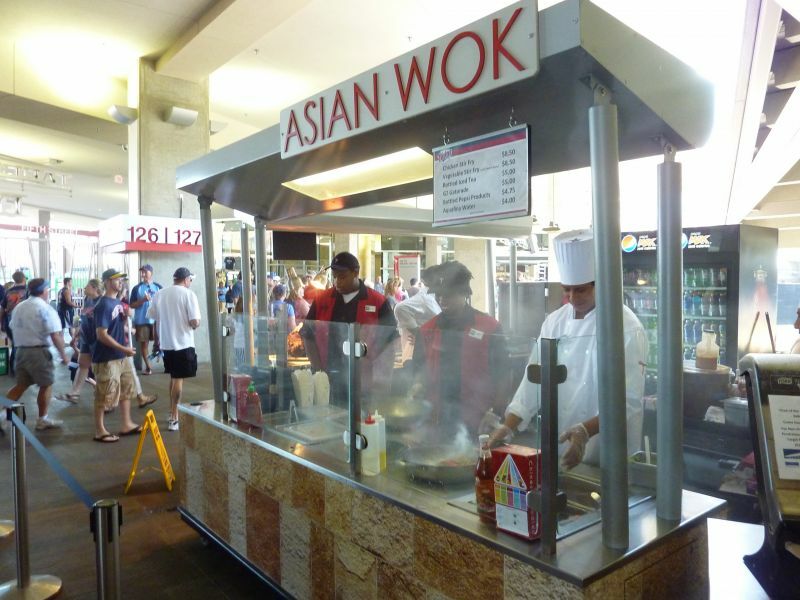 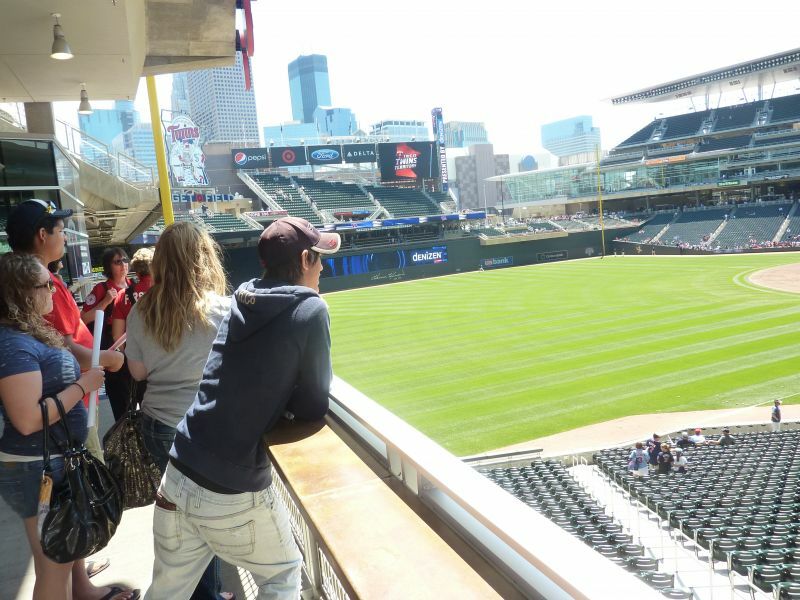 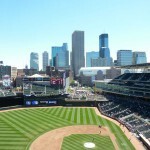 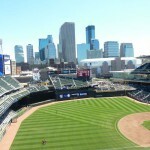 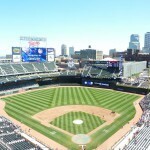 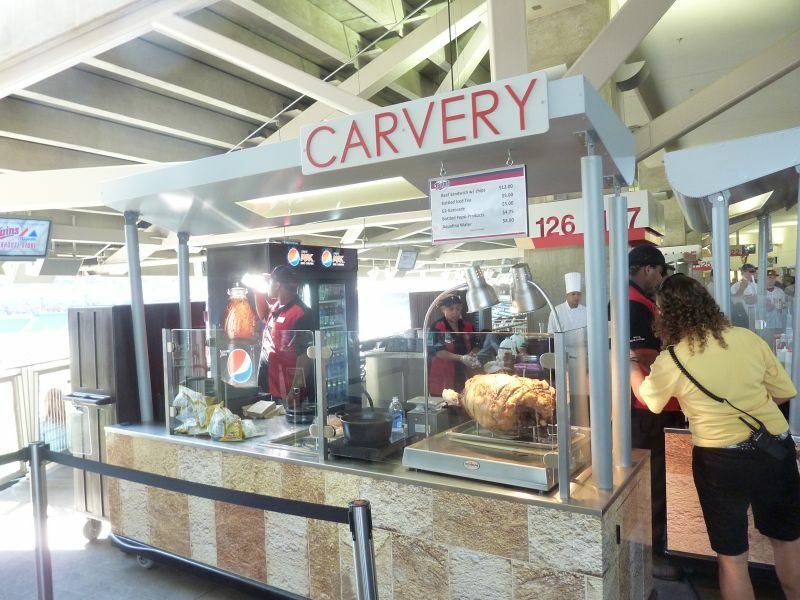 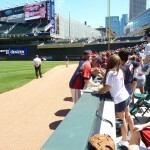 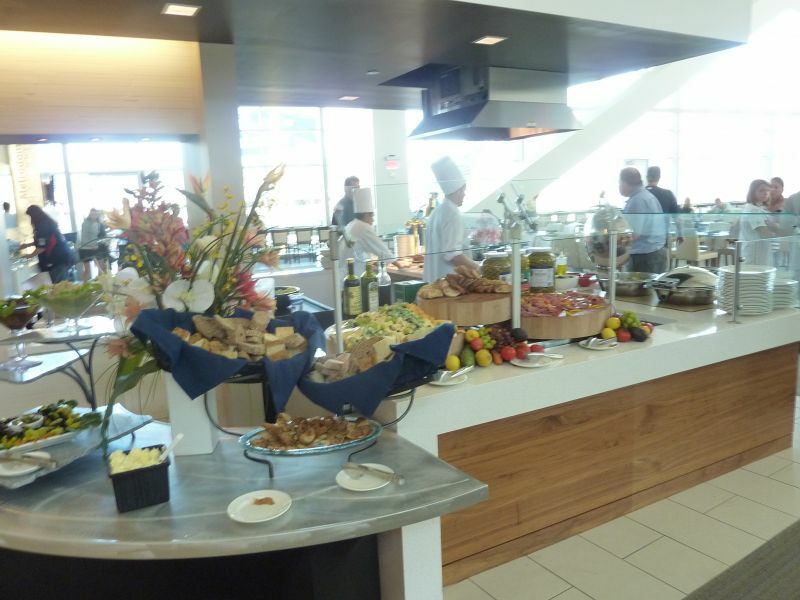 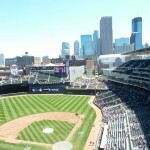 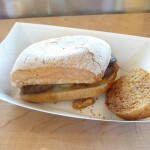 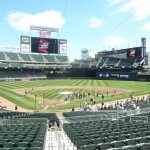 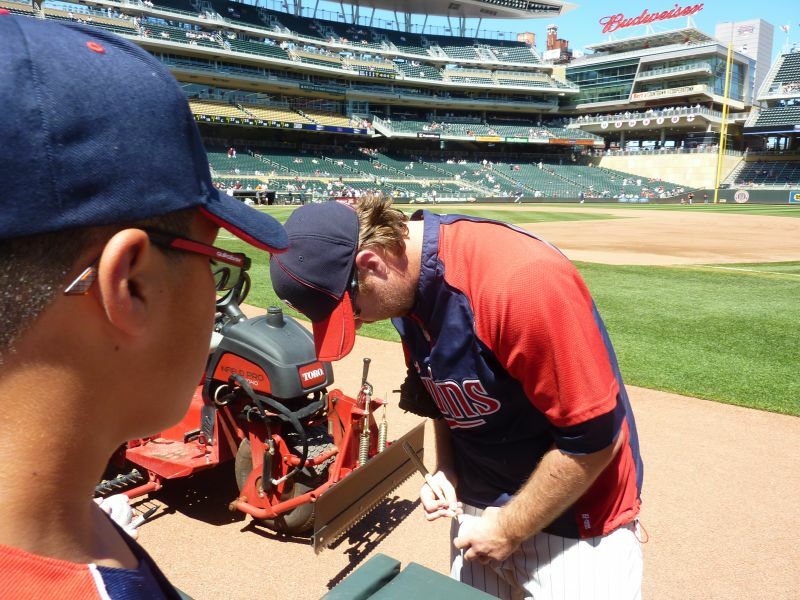 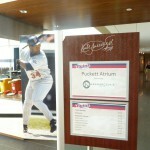 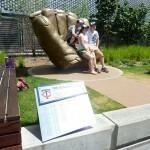 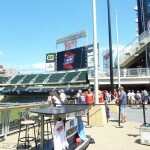 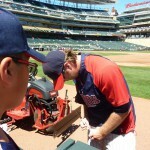 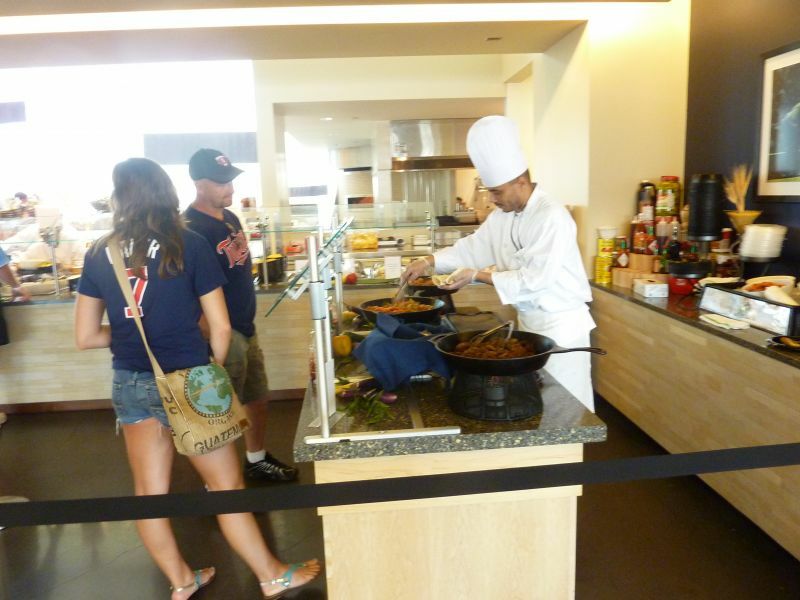 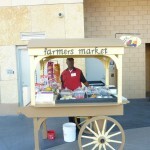 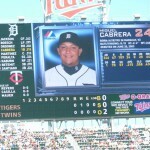 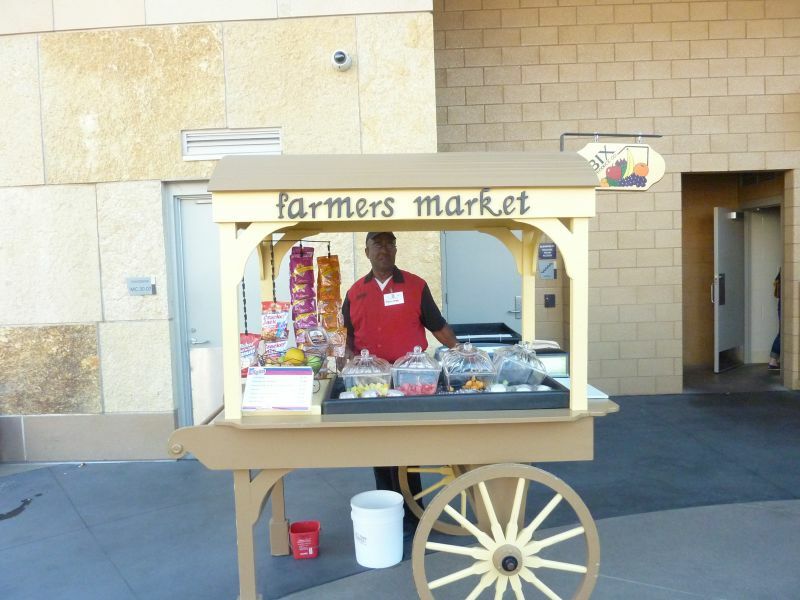 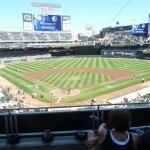 Target Field represents the region well. 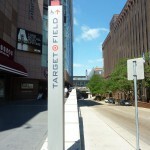 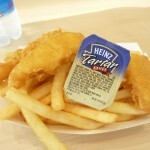 Like every great ballpark, Target represents its region extremely well. 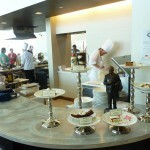 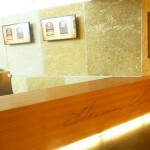 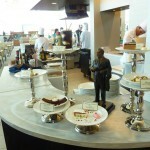 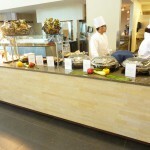 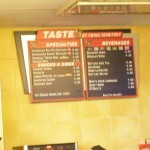 But I feel they take it to the highest level here. 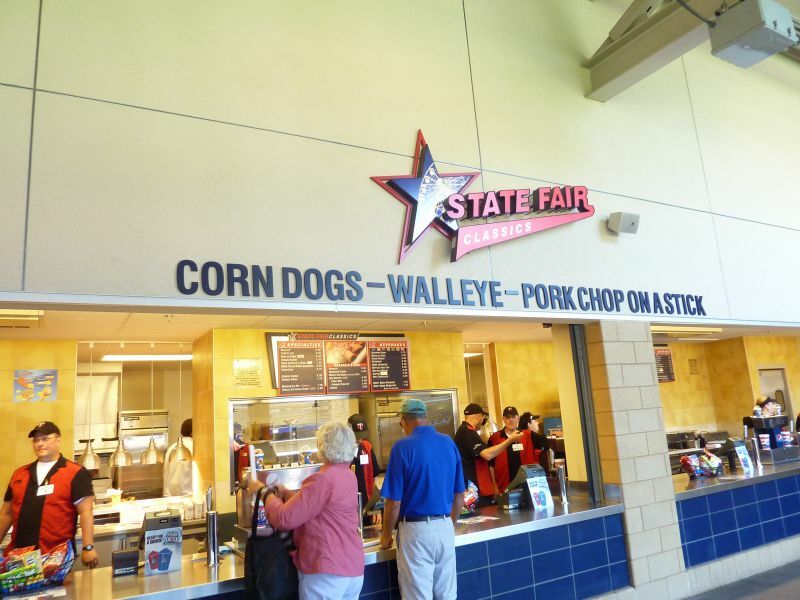 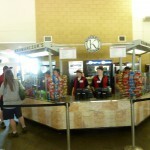 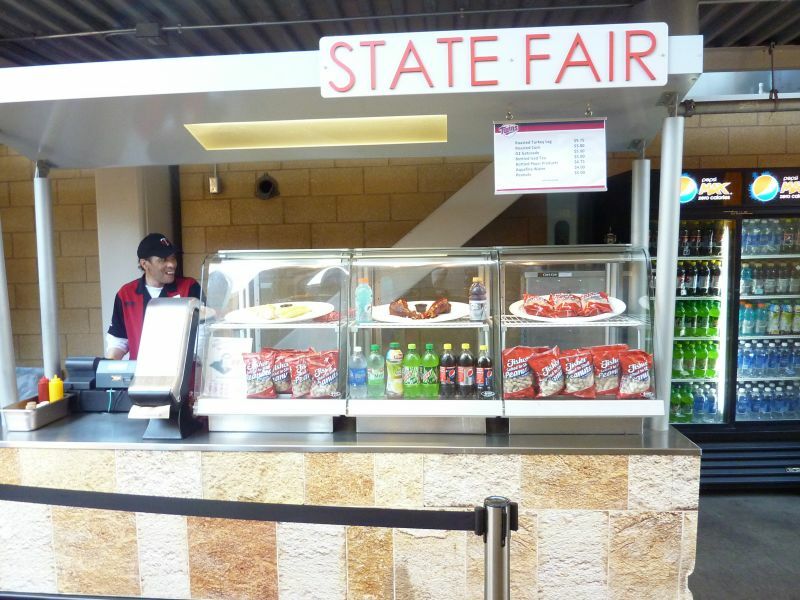 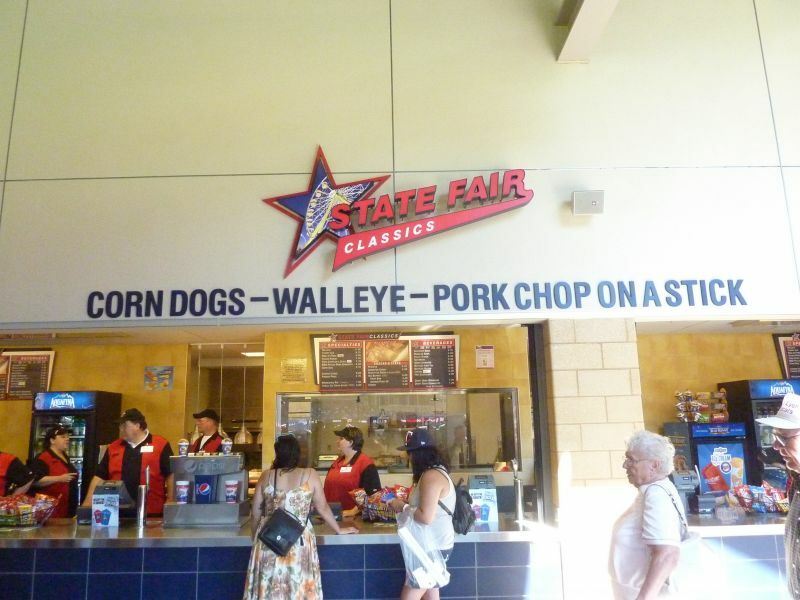 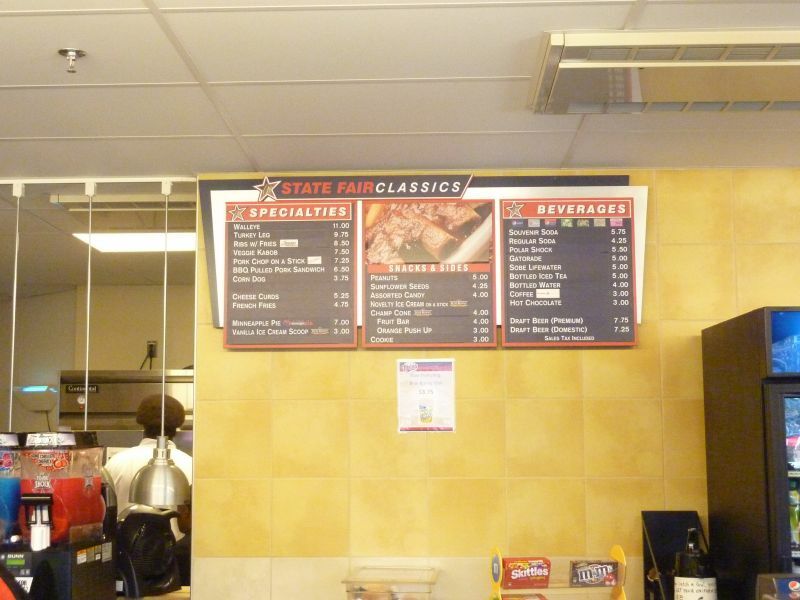 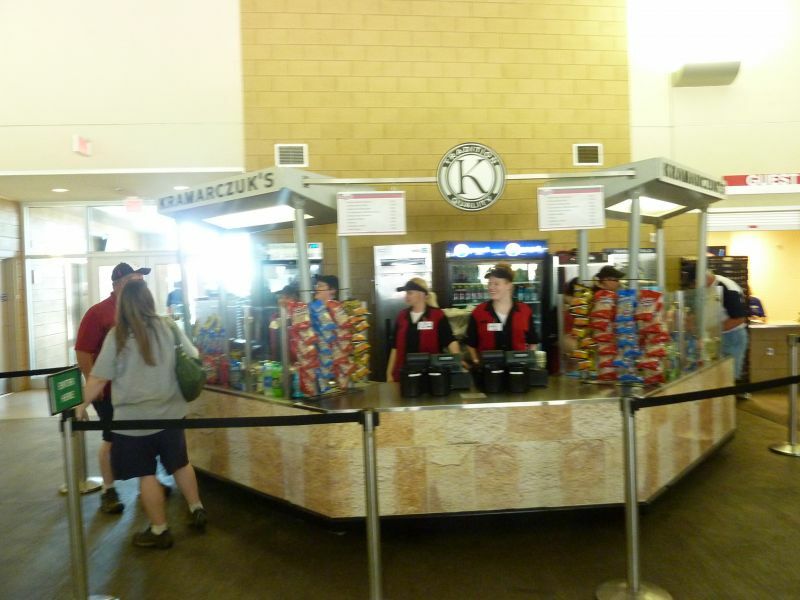 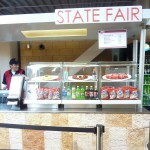 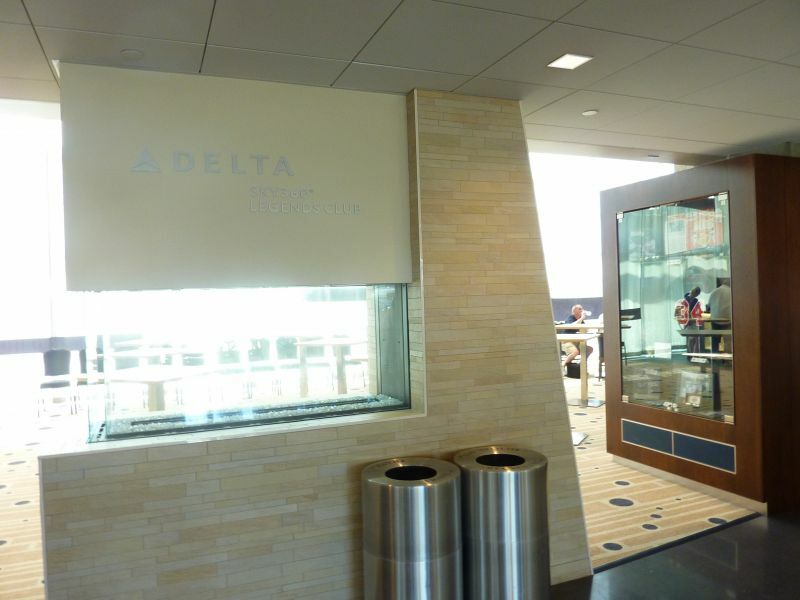 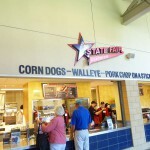 The “state fair” concessions and the historical touches, along with the limestone accents integrated inside, outside, and on the concourses, really screams Minnesota. 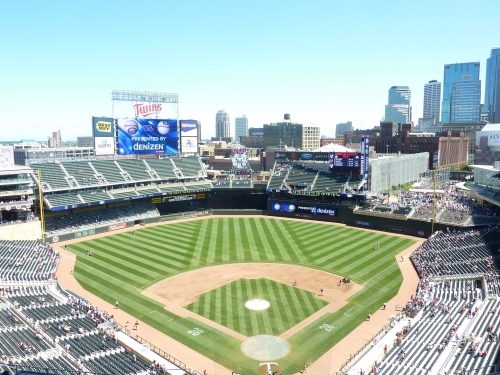 But I wouldn’t go so far as to say it’s a top three ballpark, like everyone seems to be claiming. 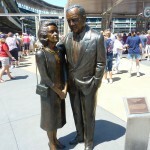 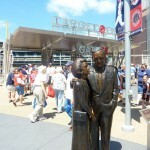 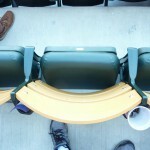 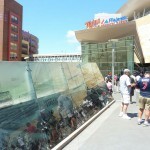 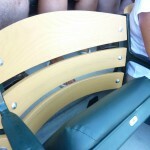 It’s a gorgeous new ballpark, but not quite an aesthetic monument that eclipses some of the others. 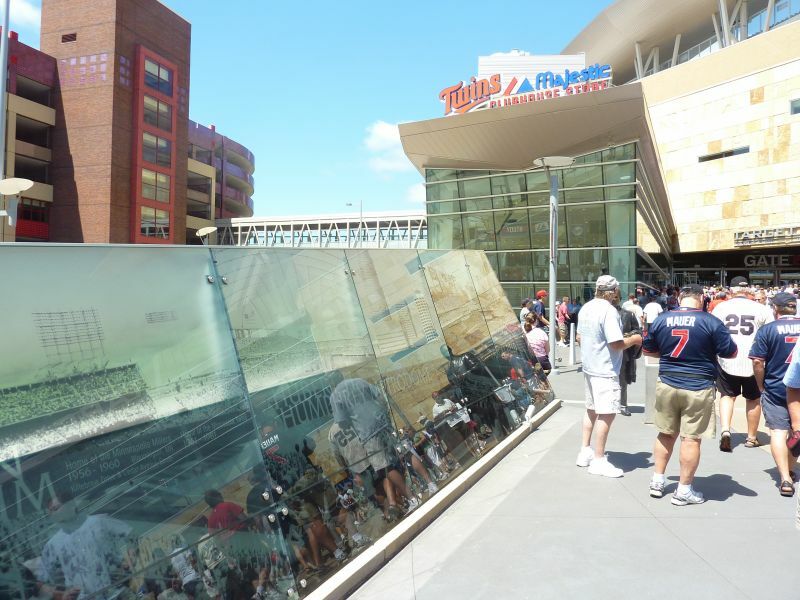 When the renderings came out, reviews were reasonably tepid, so we forget how low our standards have become after the uninspired parks of the decade came out. 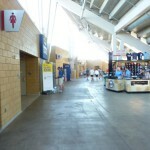 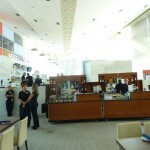 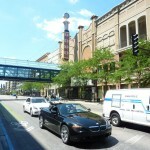 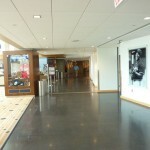 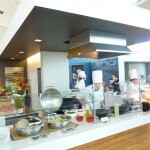 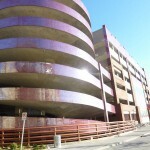 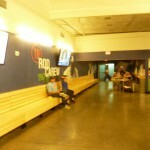 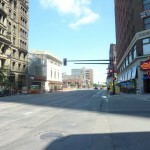 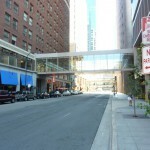 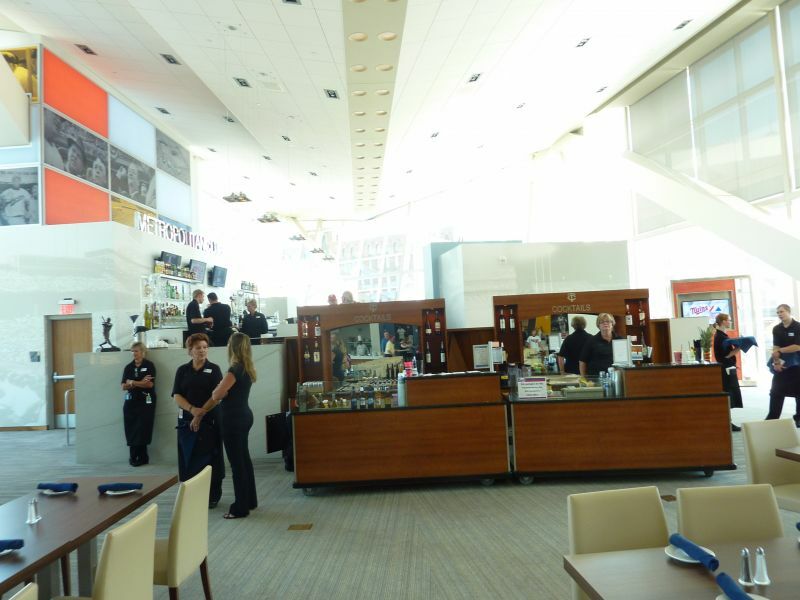 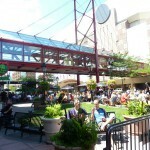 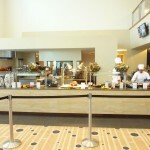 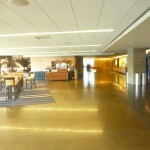 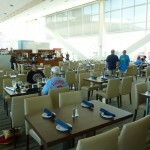 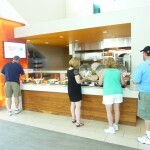 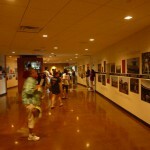 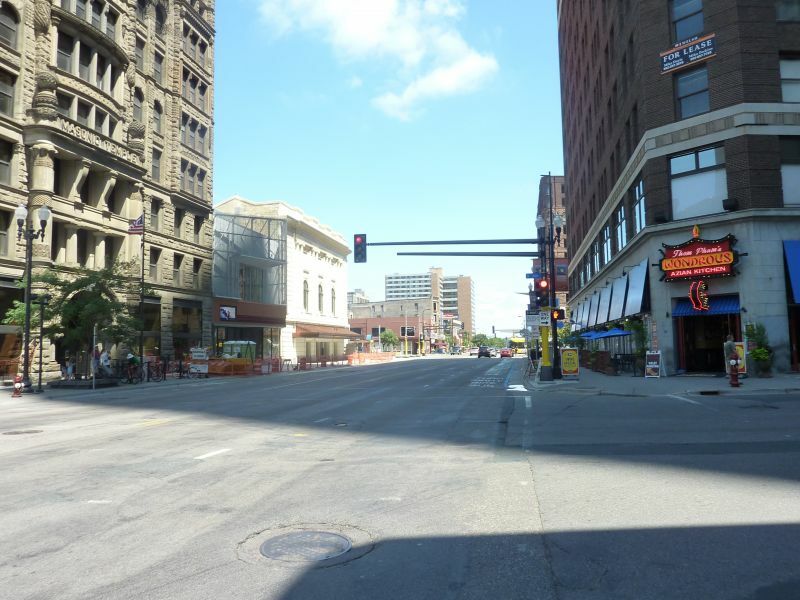 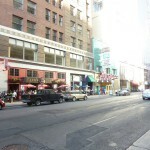 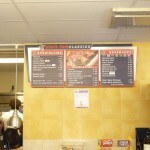 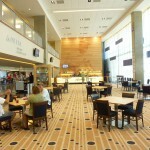 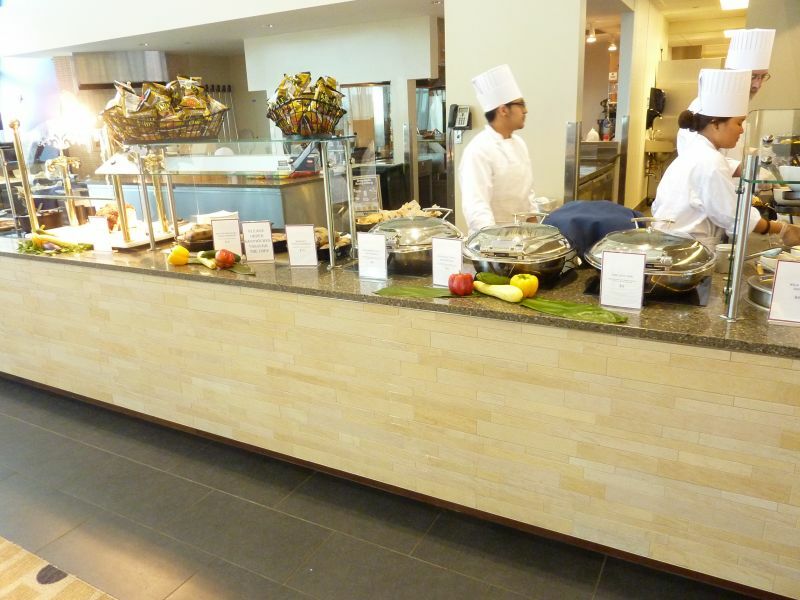 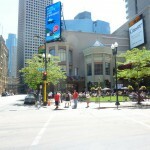 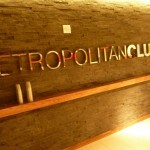 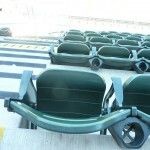 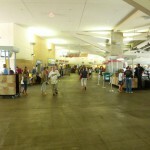 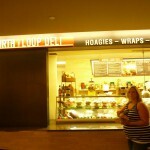 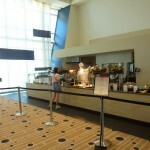 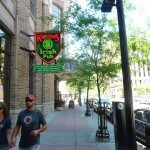 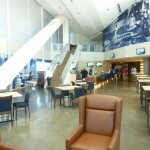 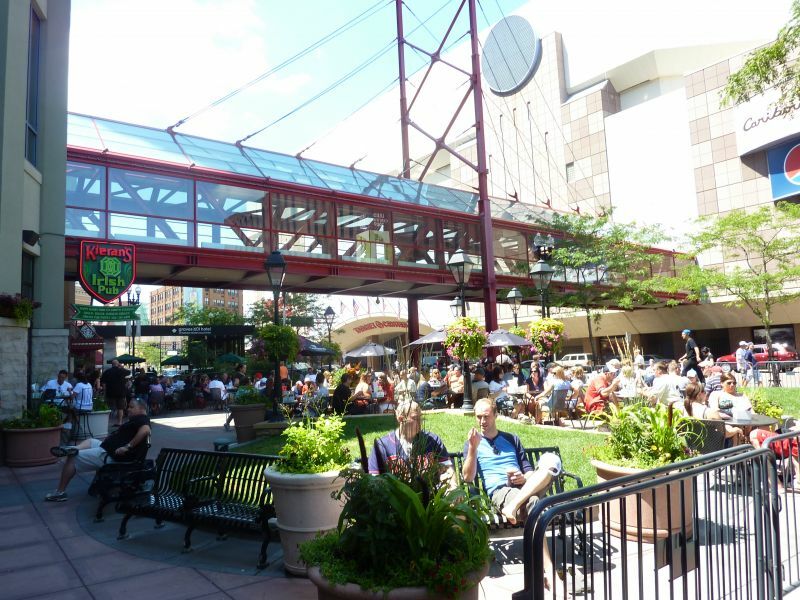 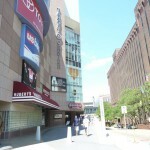 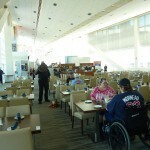 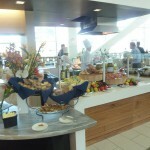 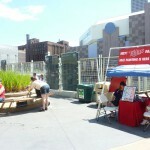 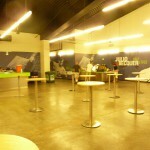 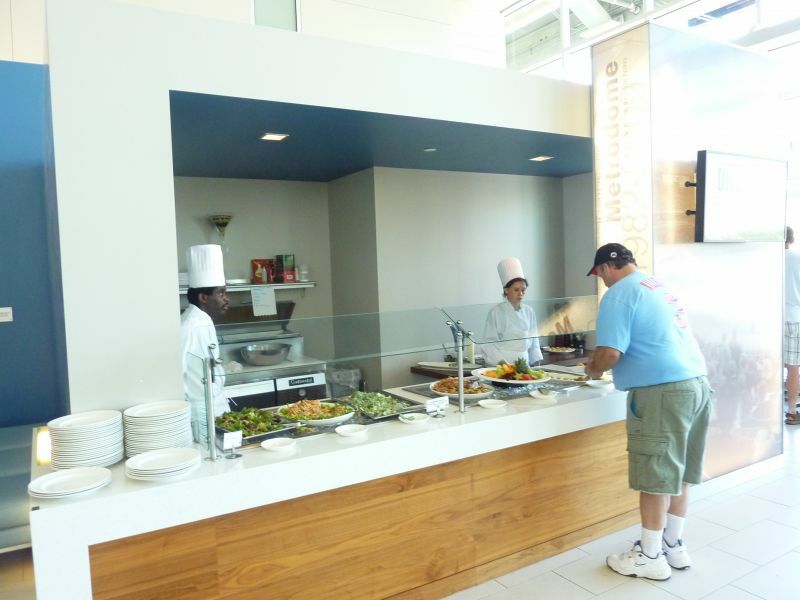 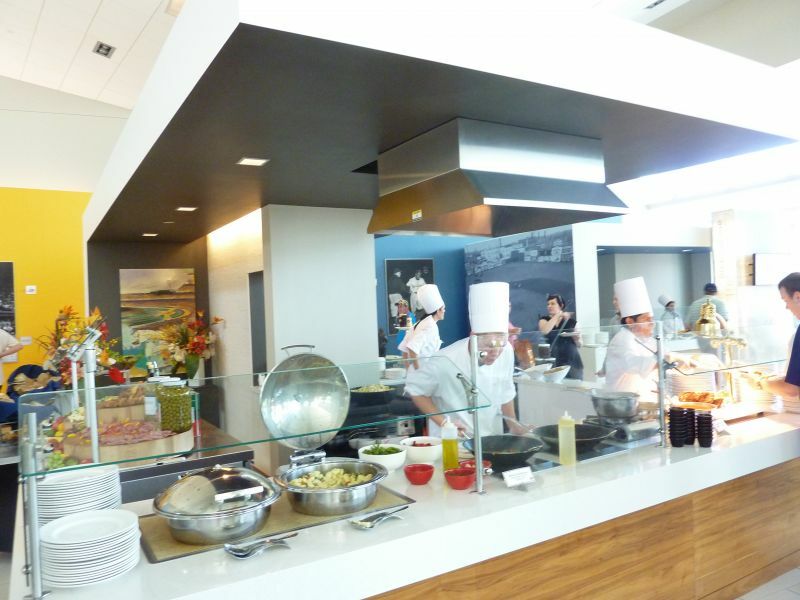 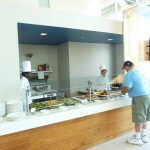 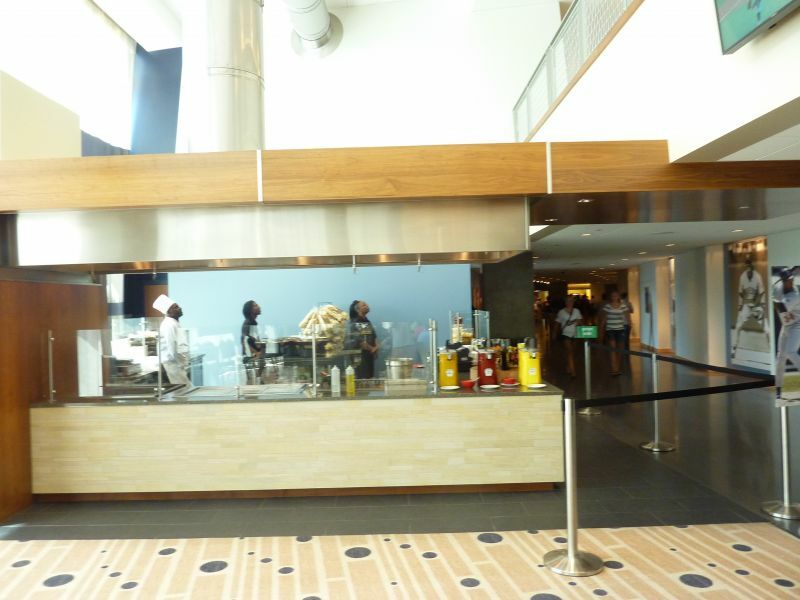 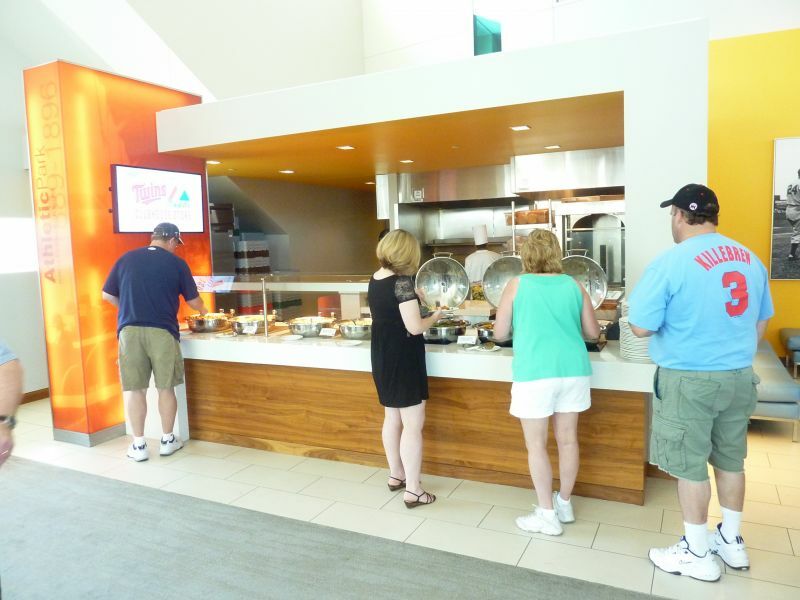 Despite not quite having the views of PNC, Comerica, or AT&T, nor having the well-crafted interior design of Jacobs or Camden, the modern amenities and superior functionality that naturally come with a new venue, along with the great location, make Target one of the best, despite lacking a bit due to the small footprint.